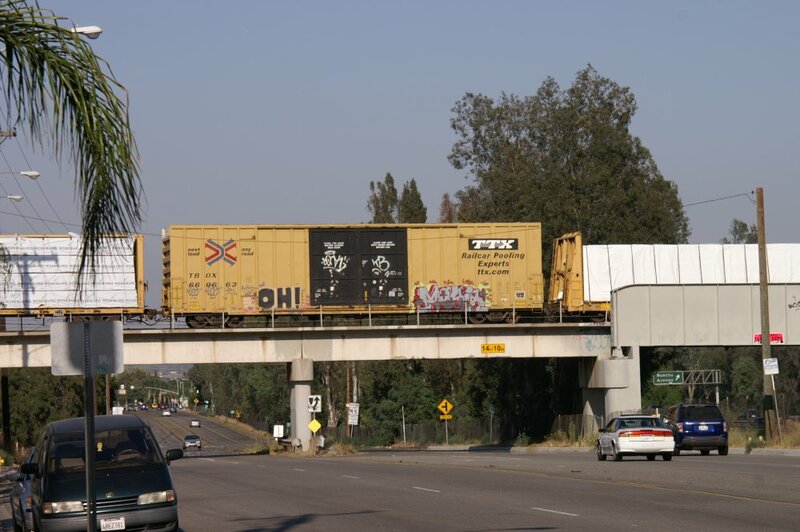 No question, I had a fantastic time in exploring Cajon from every corner. 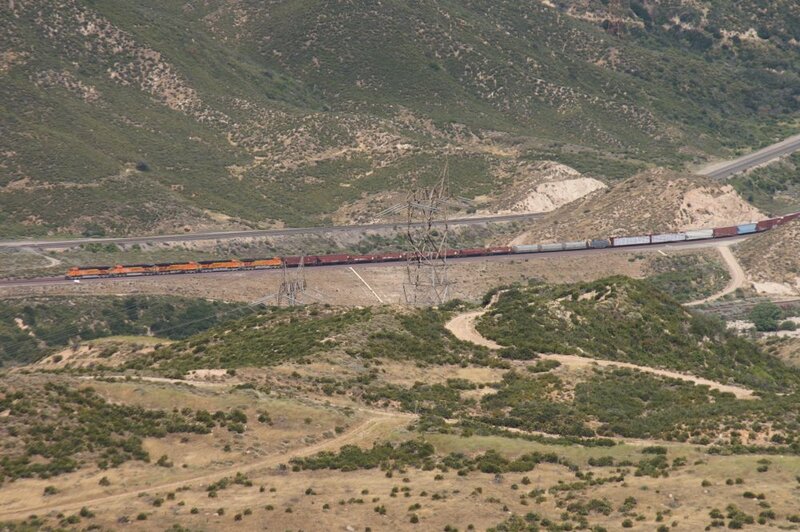 In addition, I did my own exploring in using several power line roads. 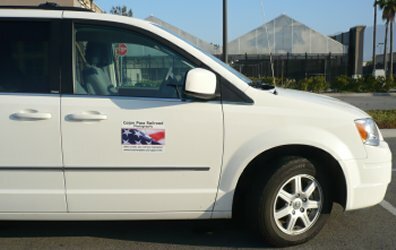 To be honest, I was sometimes at the limit with my minivan and even had to move some rocks out of the road to be able to pass slowly. 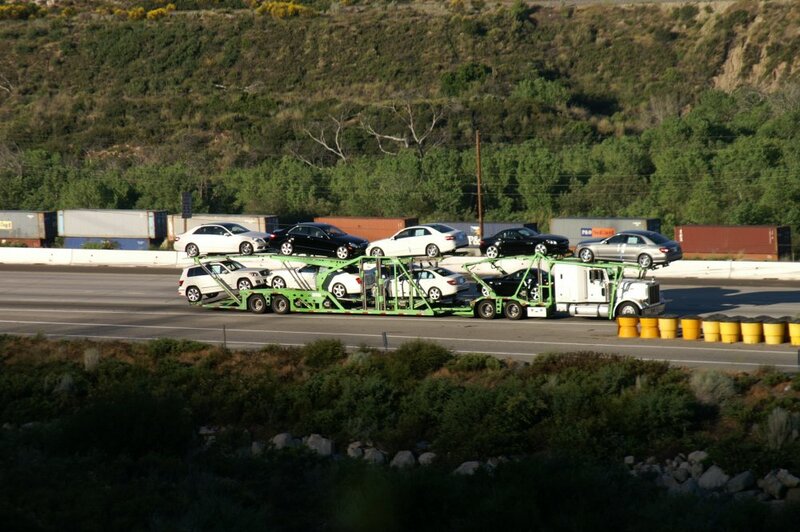 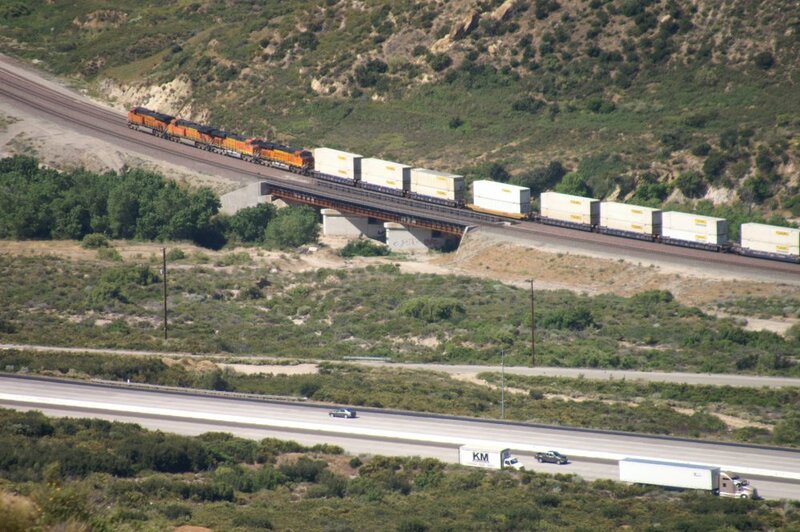 Actually a big 4x4 pickup truck or SUV would have been best. 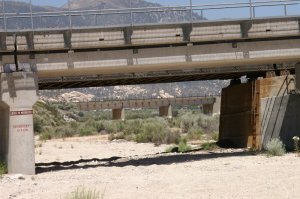 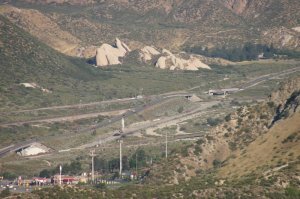 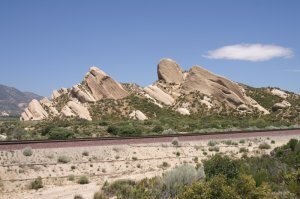 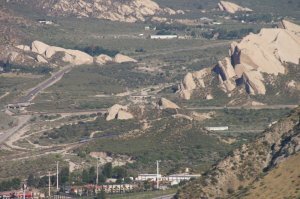 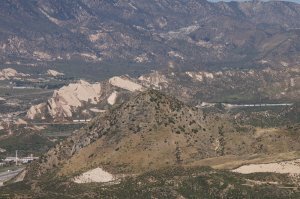 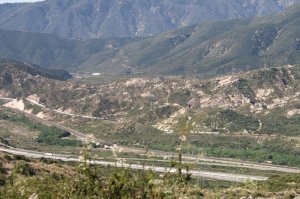 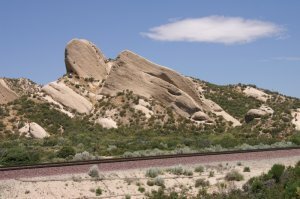 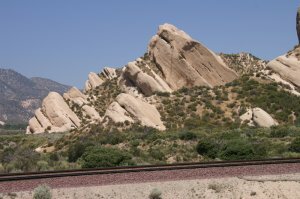 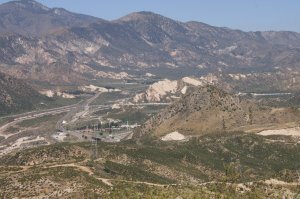 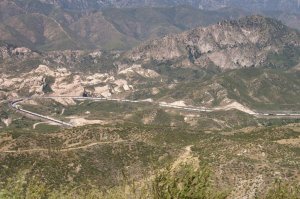 This time, I took photos (5550) from these locations: Summit, Silverwood, WSI, Hill 582, Alray (former Tunnel area), Mormon Rocks, Stein's Hill, around Highway 138, Sullivan's Curve, Cajon Station, old Route 66 (Cajon Blvd. 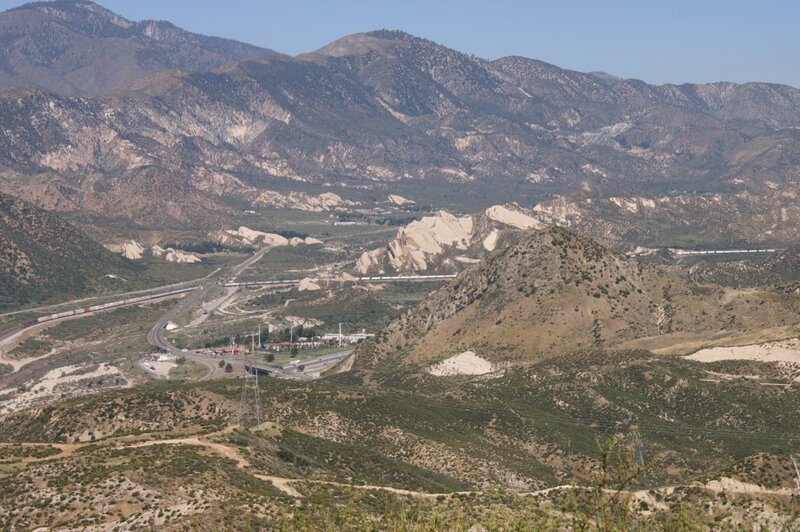 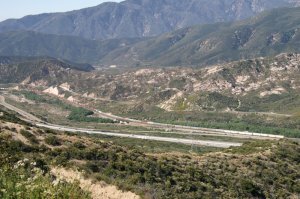 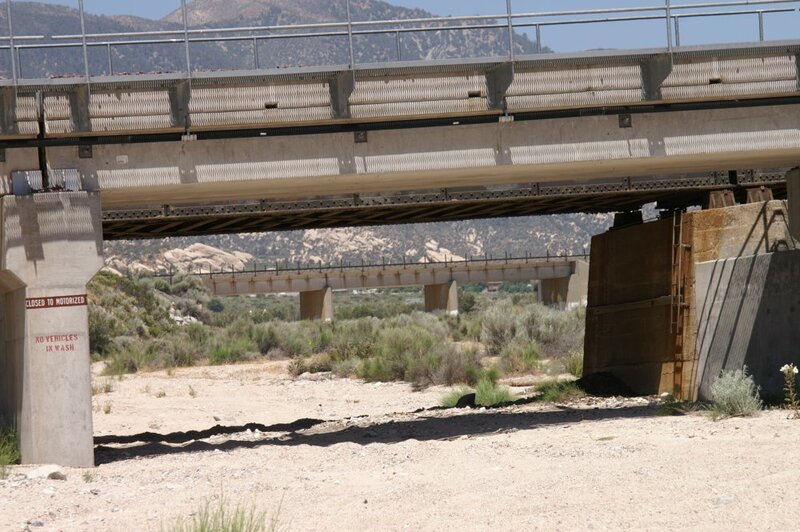 ), Swarthout Canyon Road and finally San Bernardino. 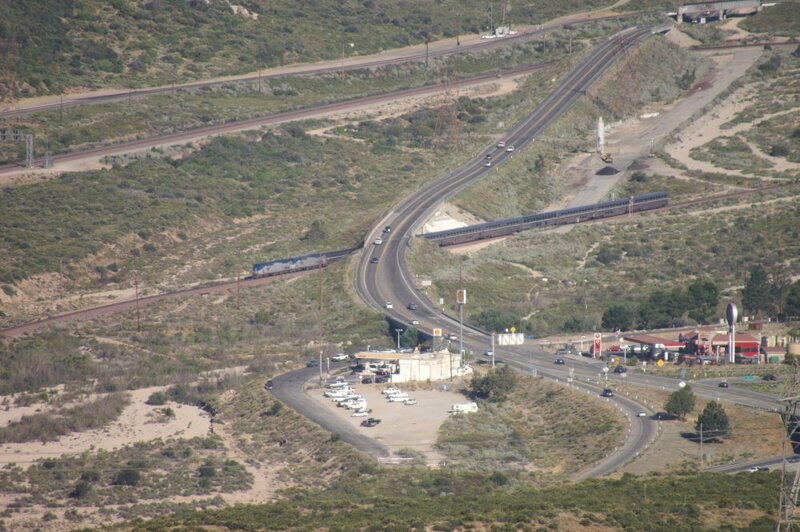 As I went to several overlooks high above, I was trying to take photos from far away. 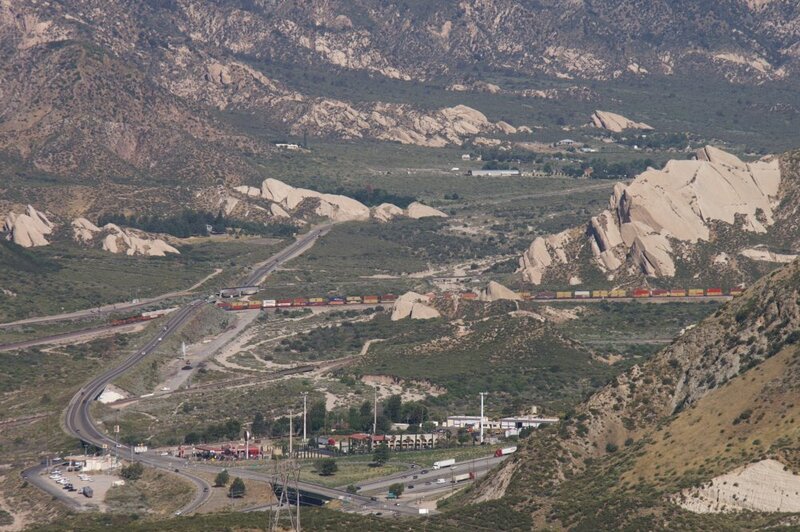 Not every photo was good because of the long distance, haze and the heavy wind. 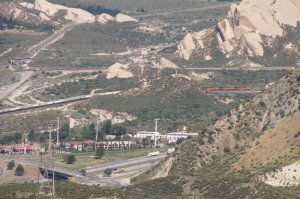 To get a better idea about this location, I am including a map and an aerial photo. 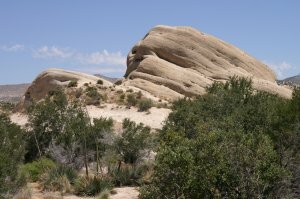 Today, I spent the whole morning at this location. 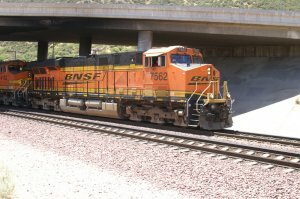 The result are a total of 249 photos. 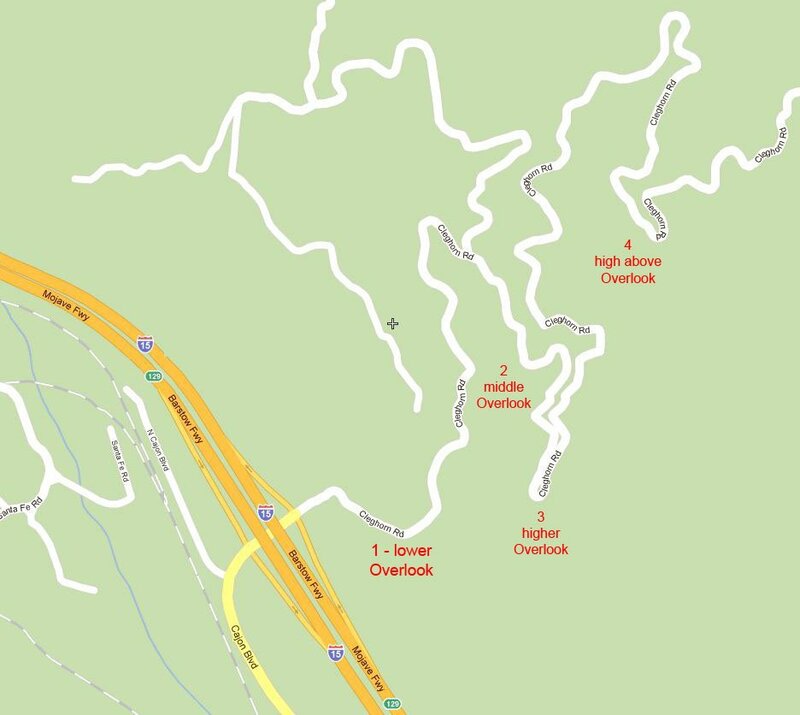 I made it to Overlook 1 and 2 and 3 and 4. 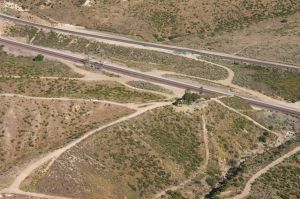 On the aerial photo 4049, Cleghorn Road goes to the left and uphill (see map). 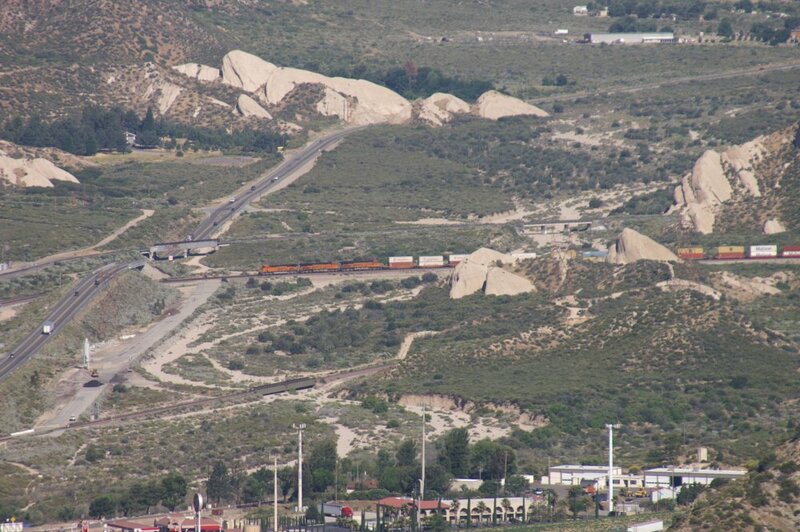 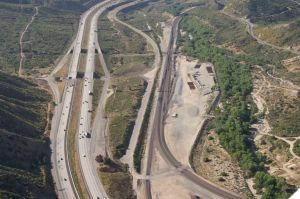 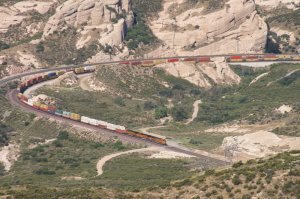 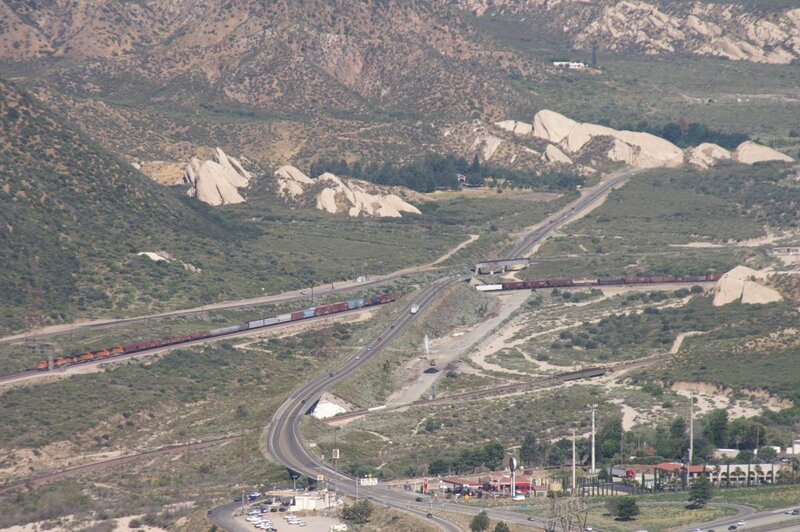 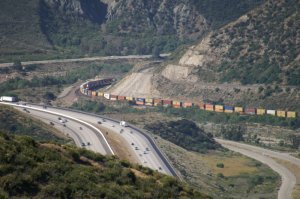 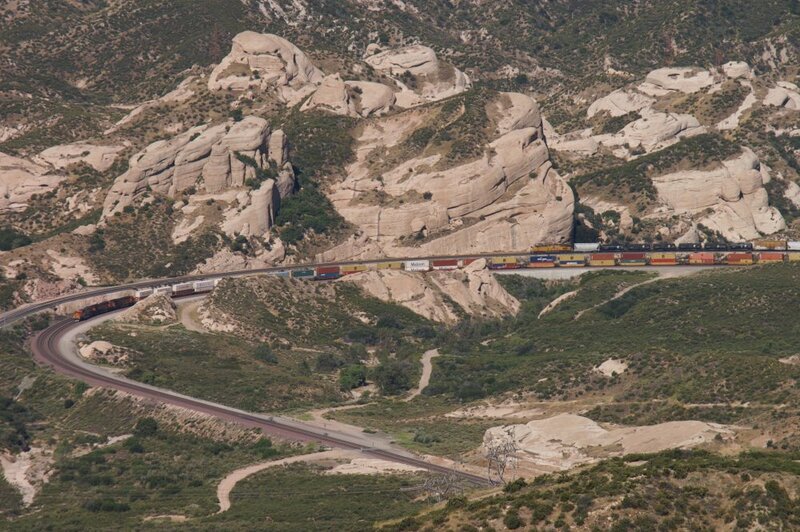 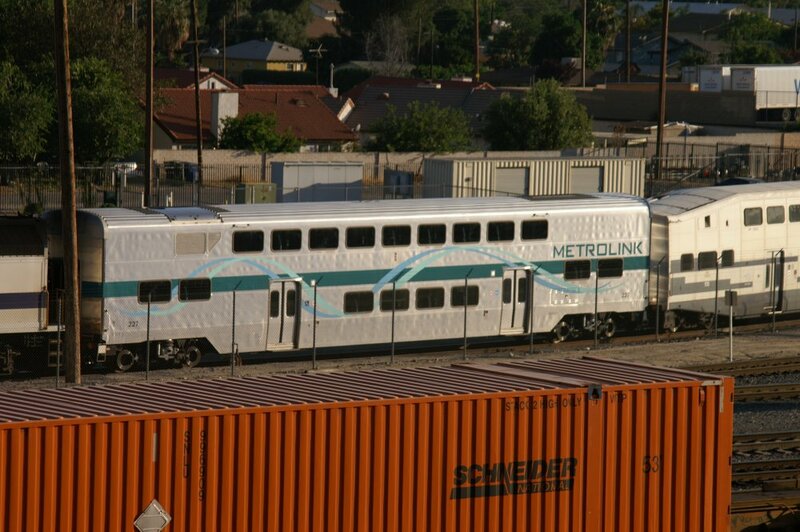 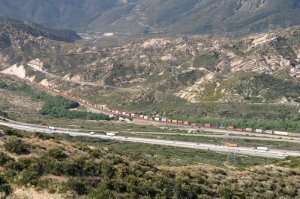 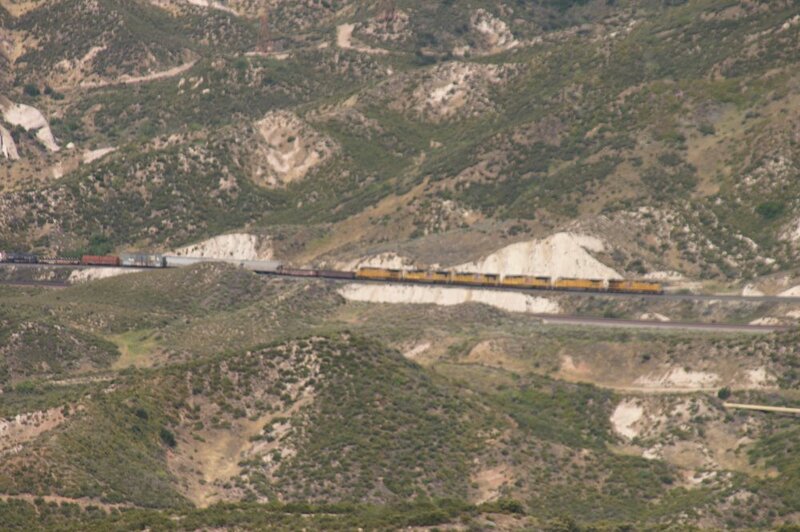 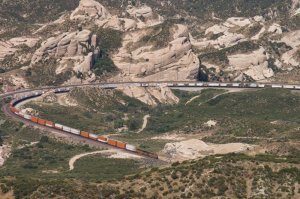 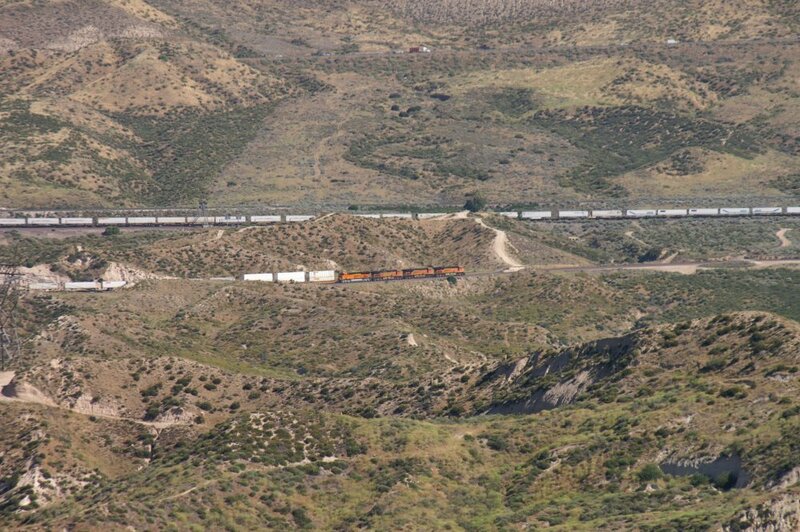 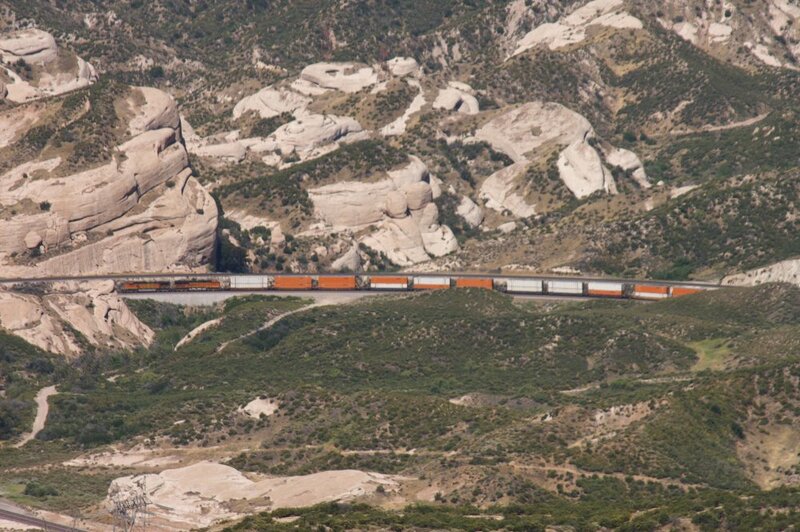 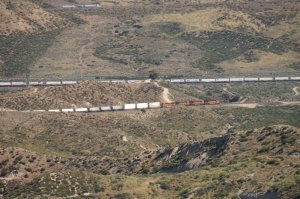 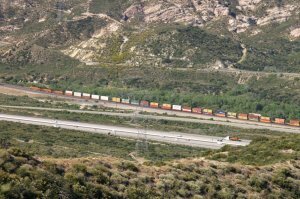 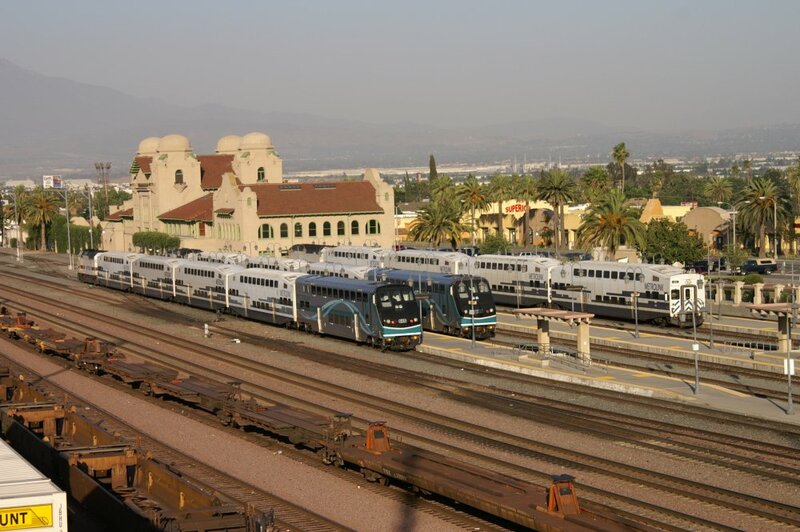 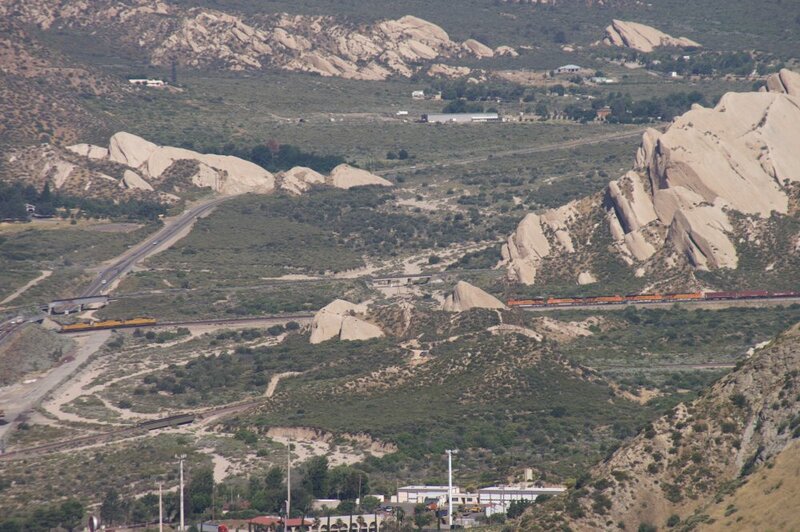 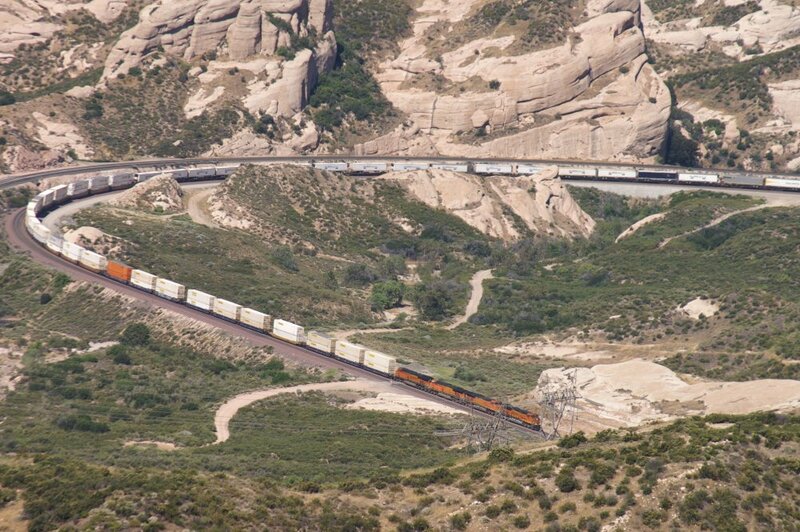 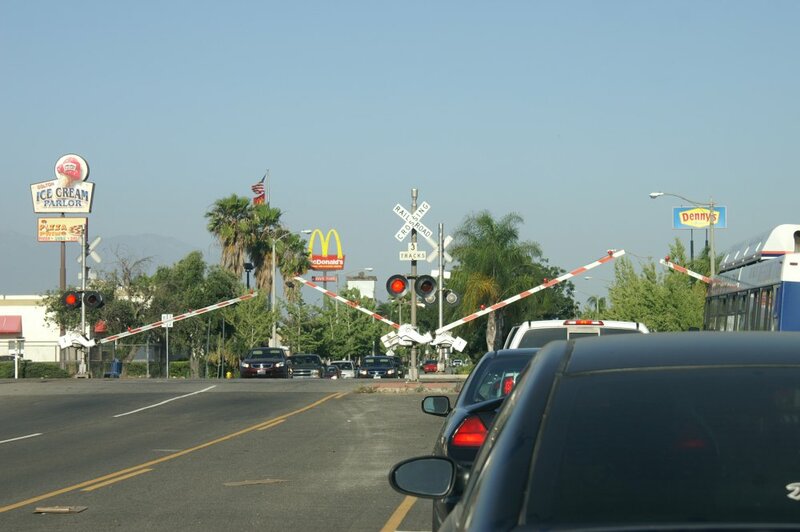 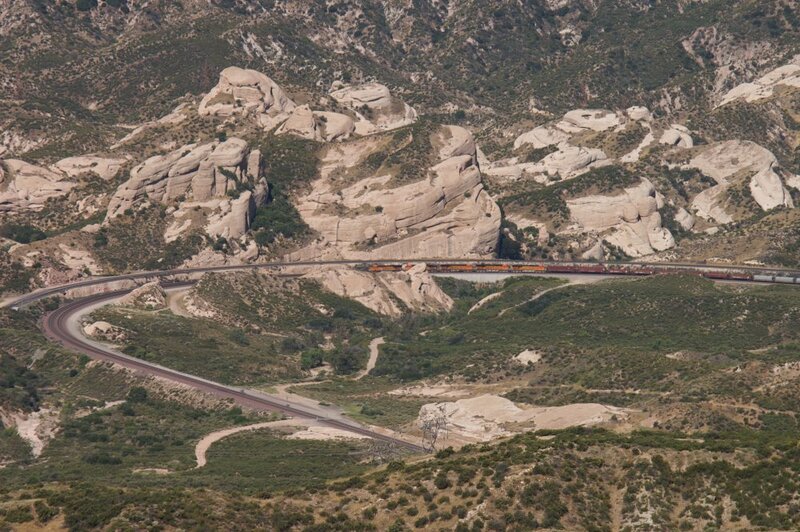 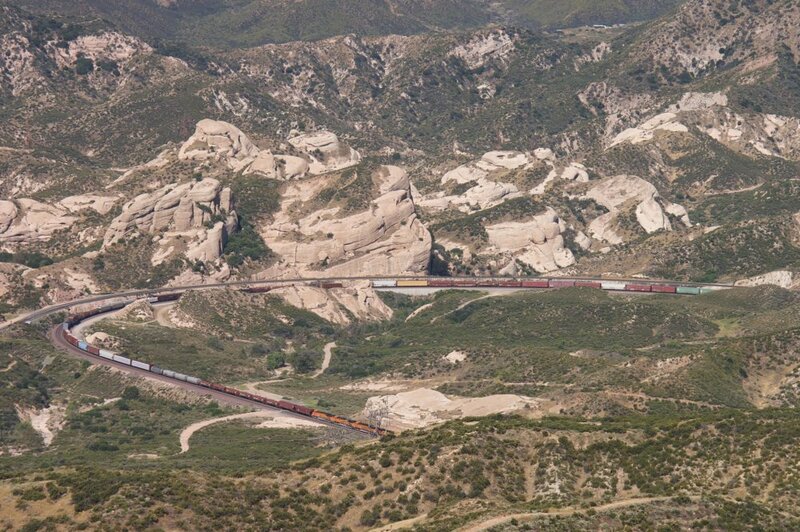 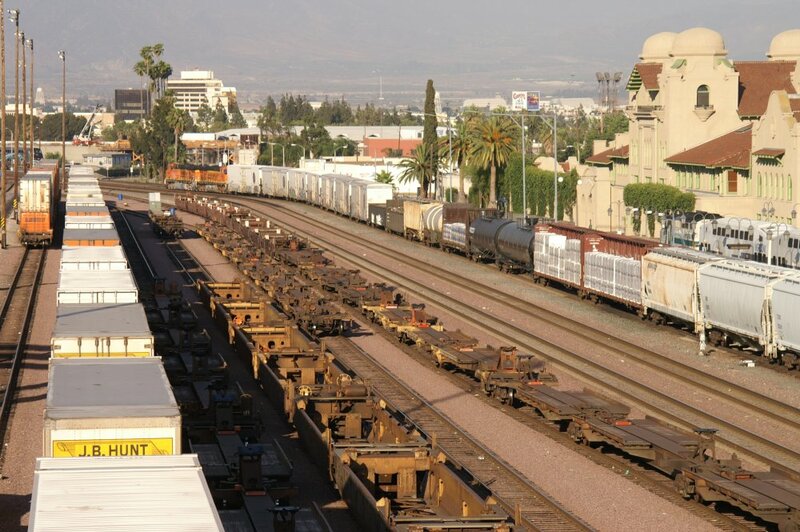 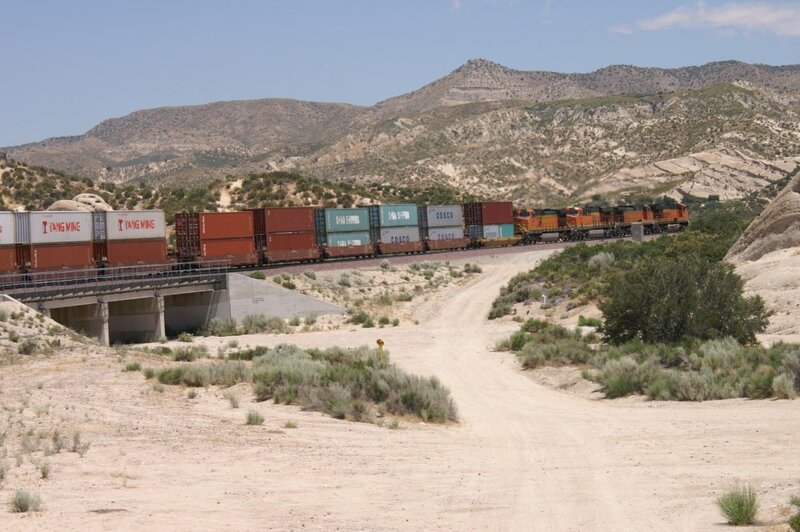 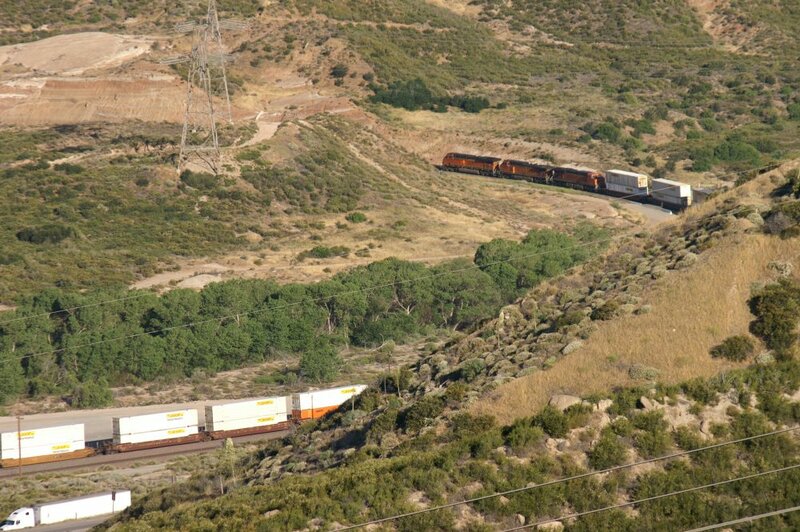 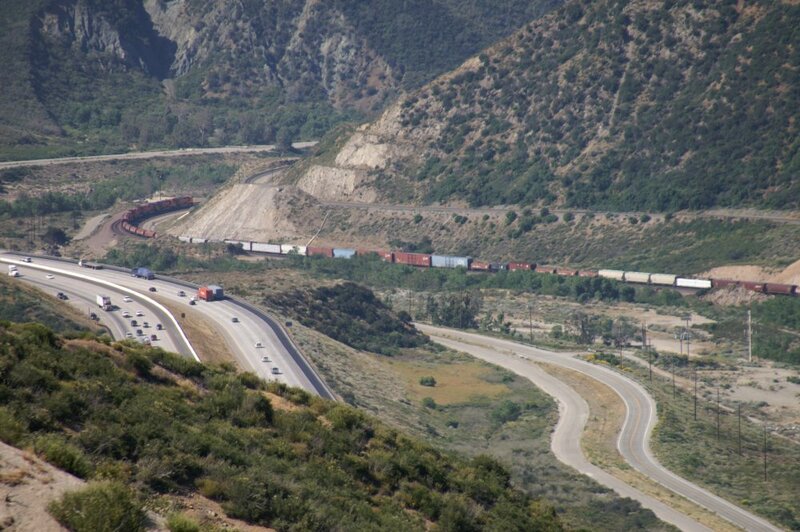 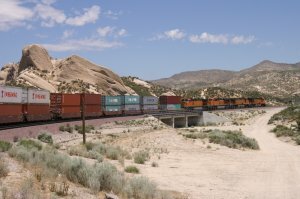 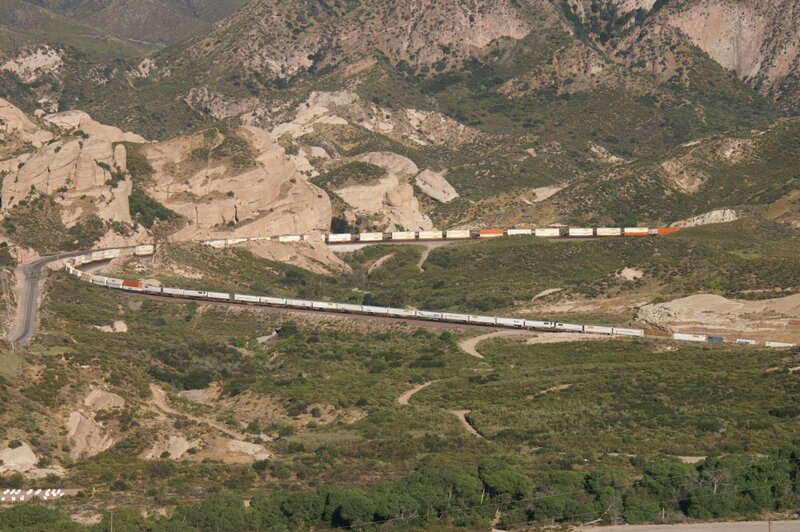 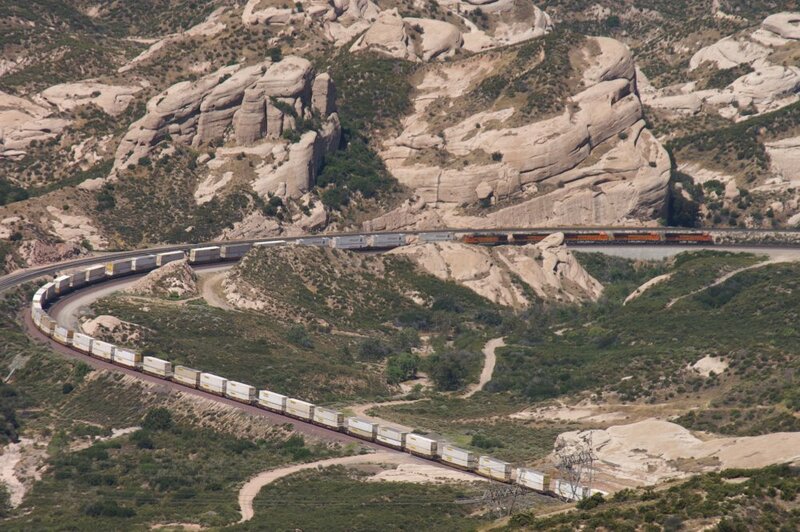 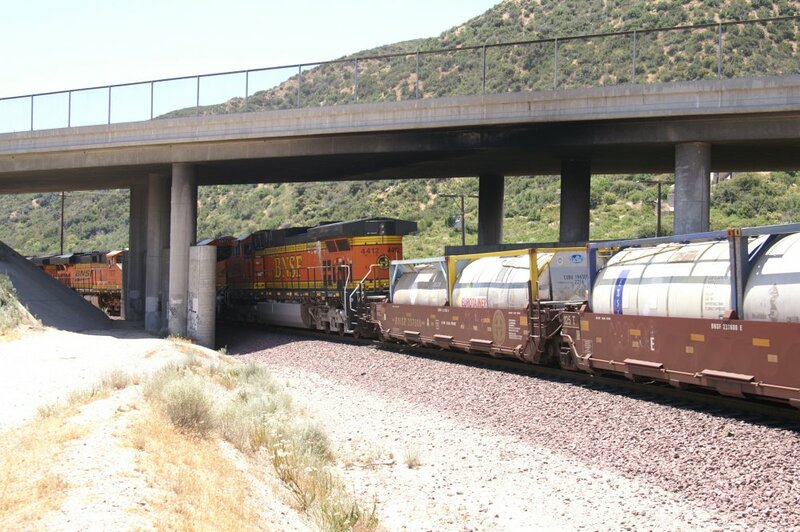 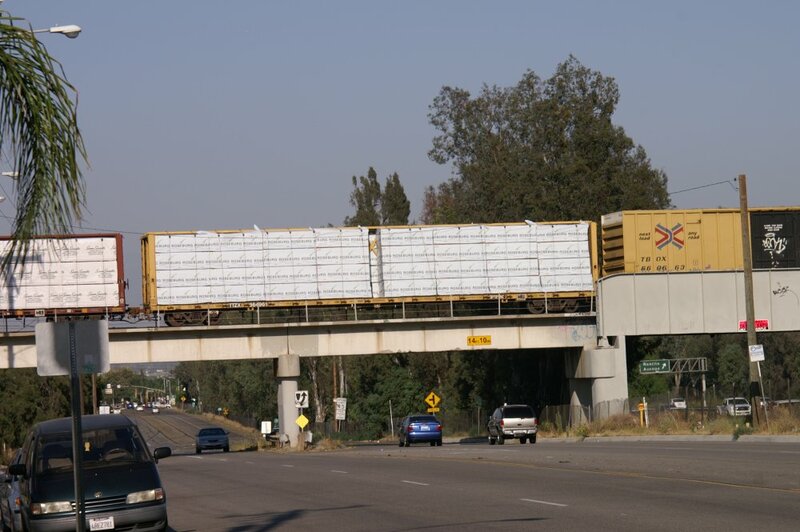 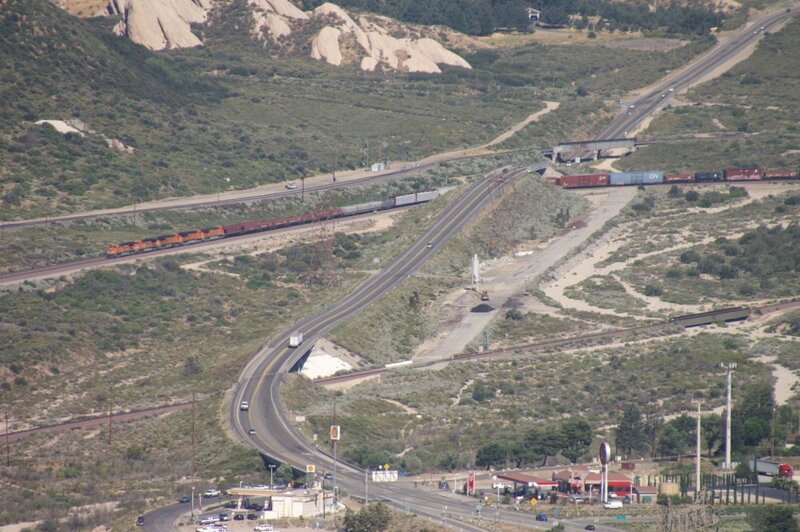 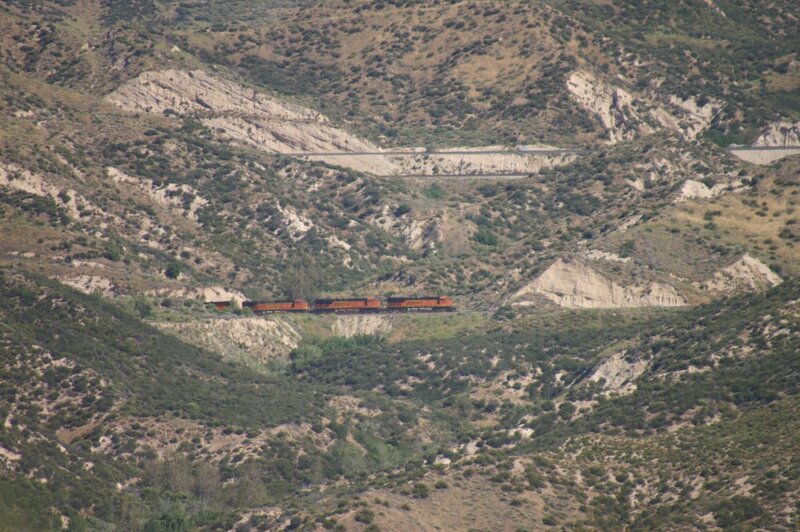 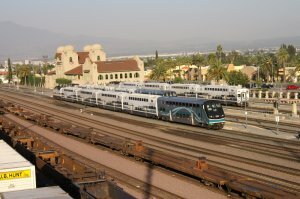 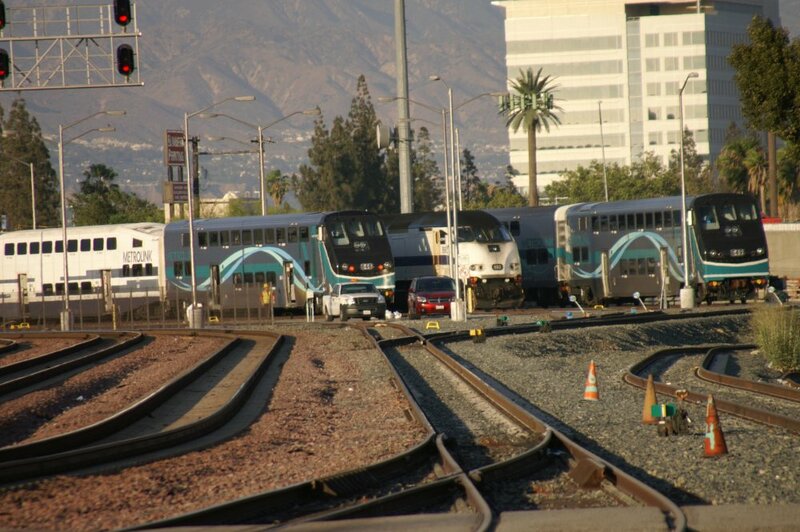 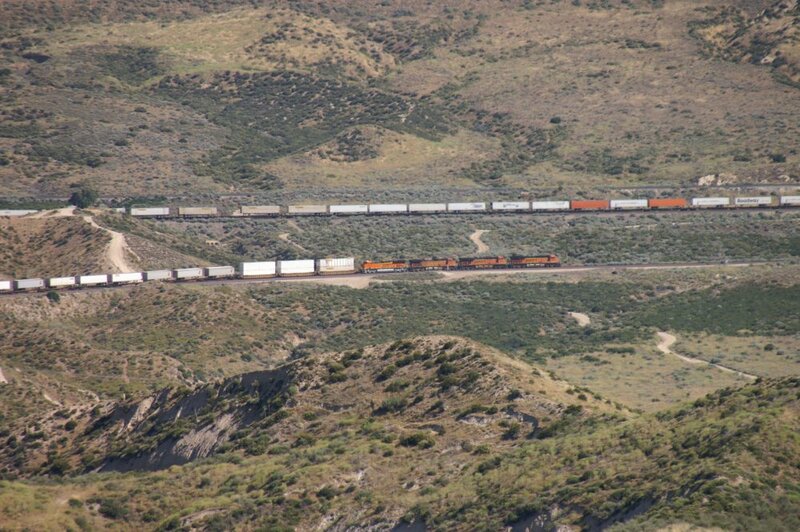 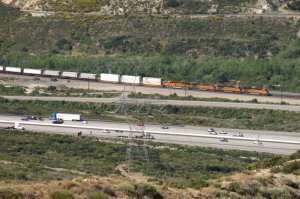 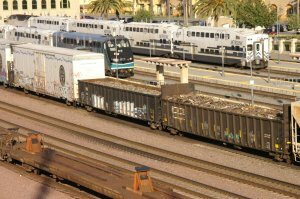 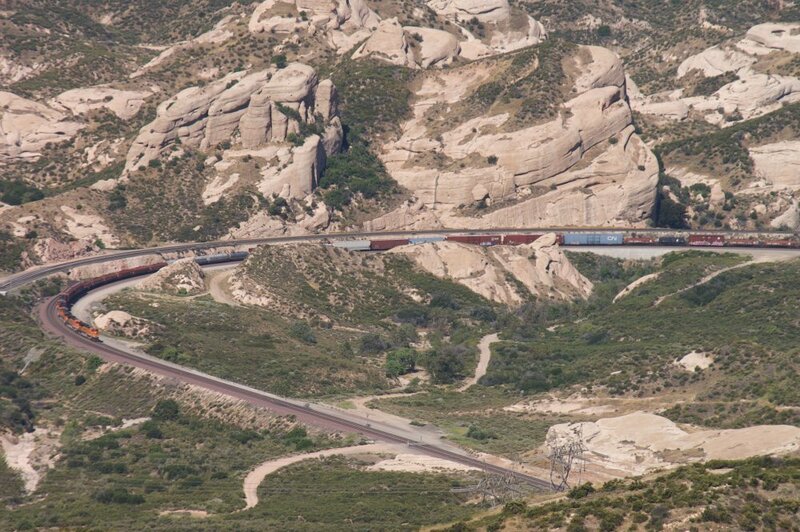 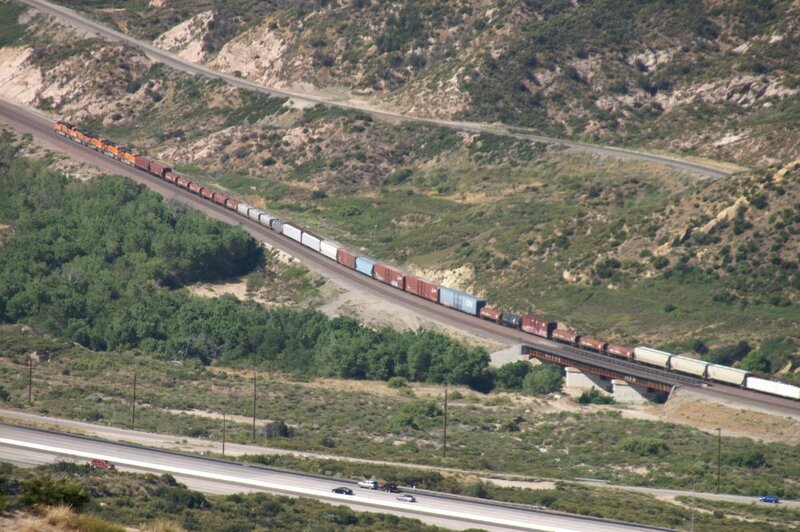 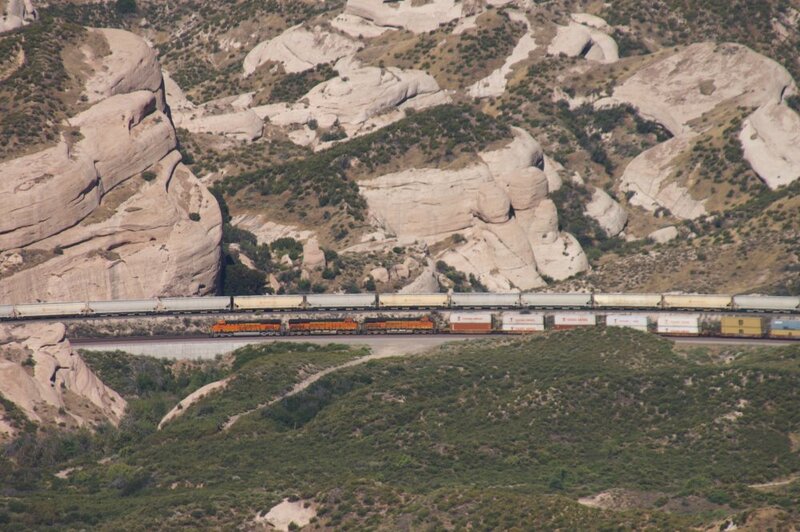 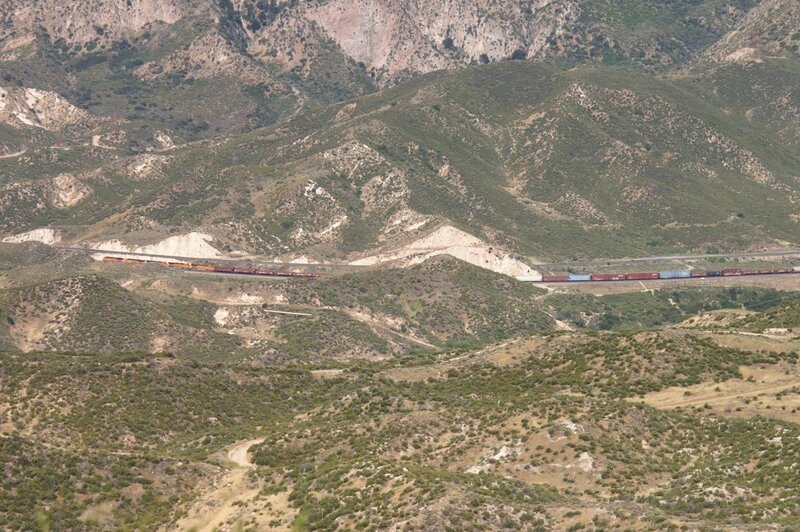 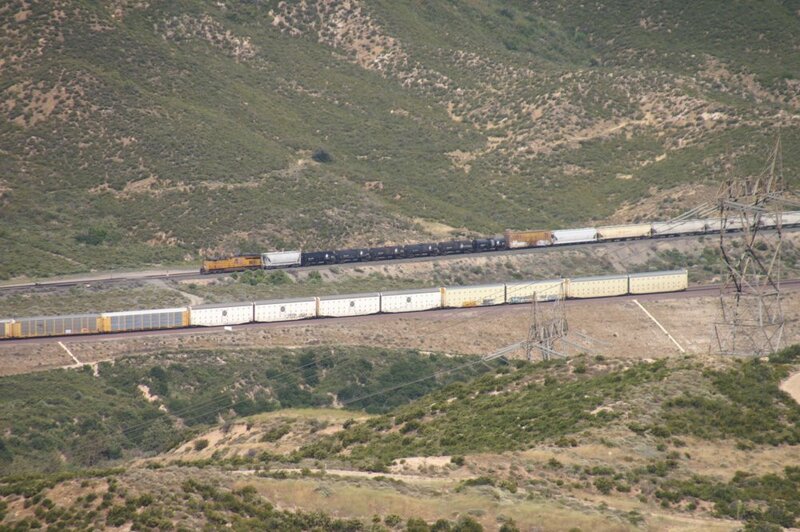 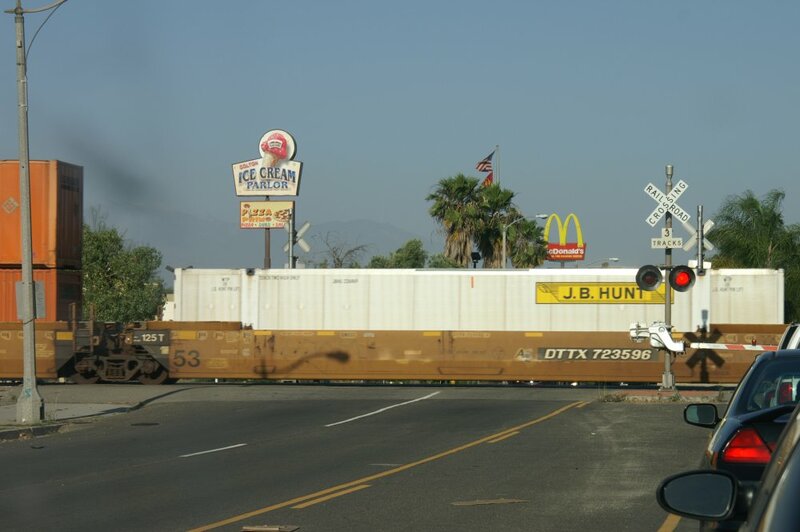 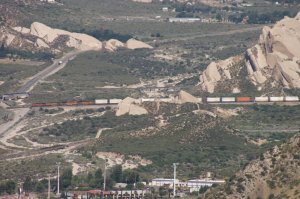 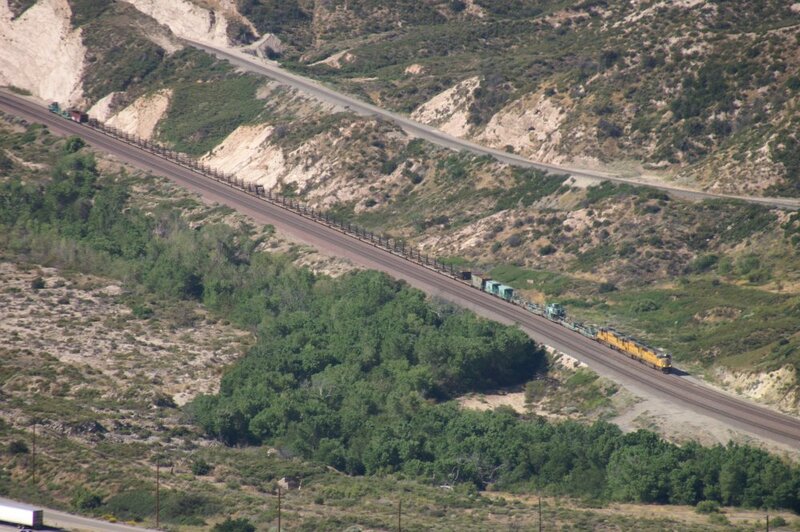 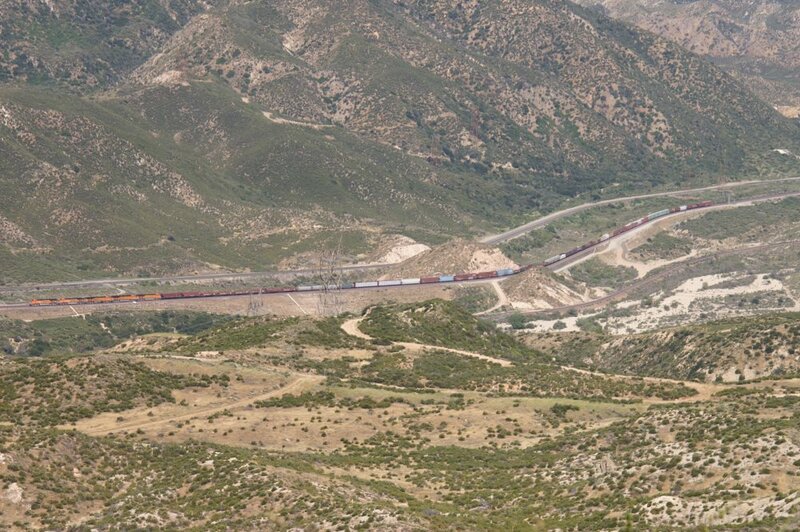 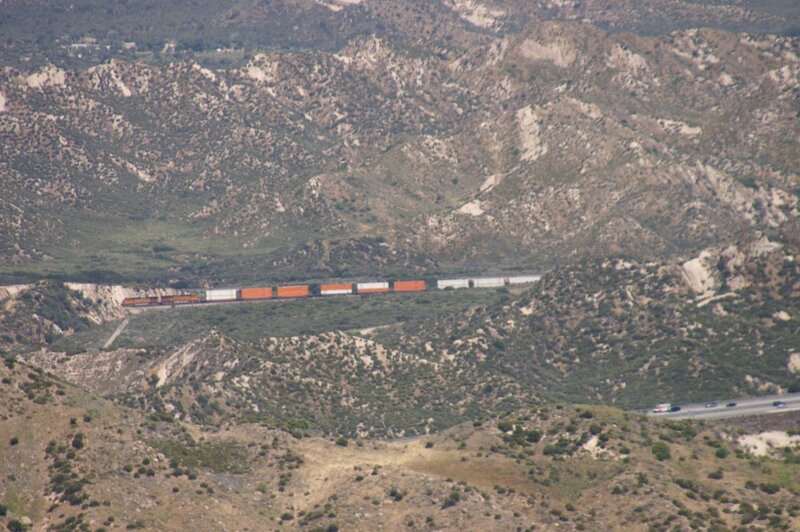 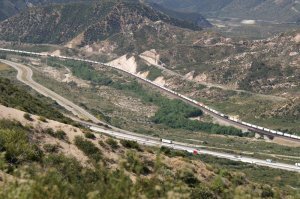 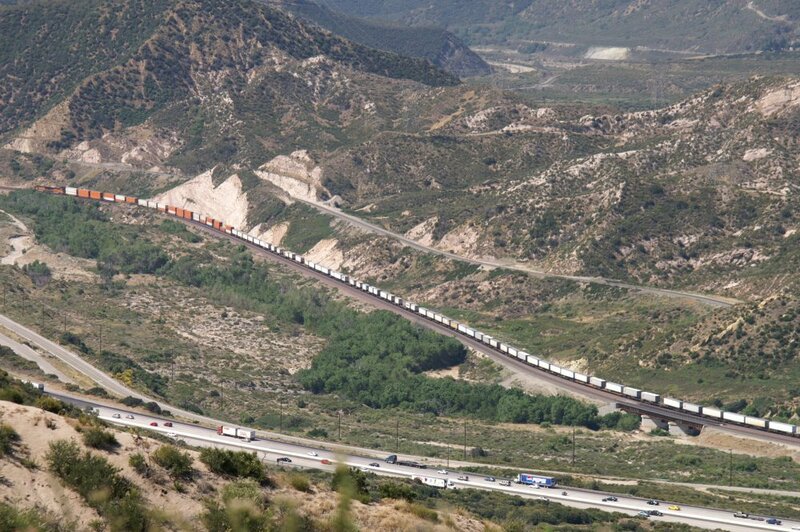 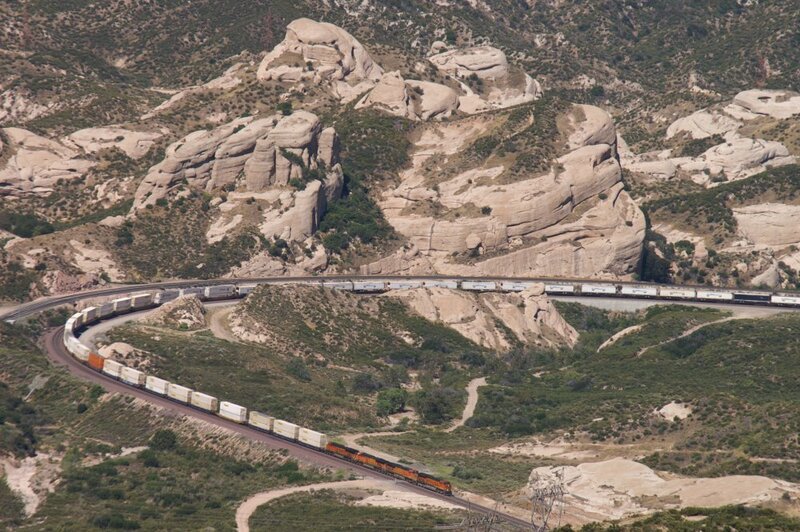 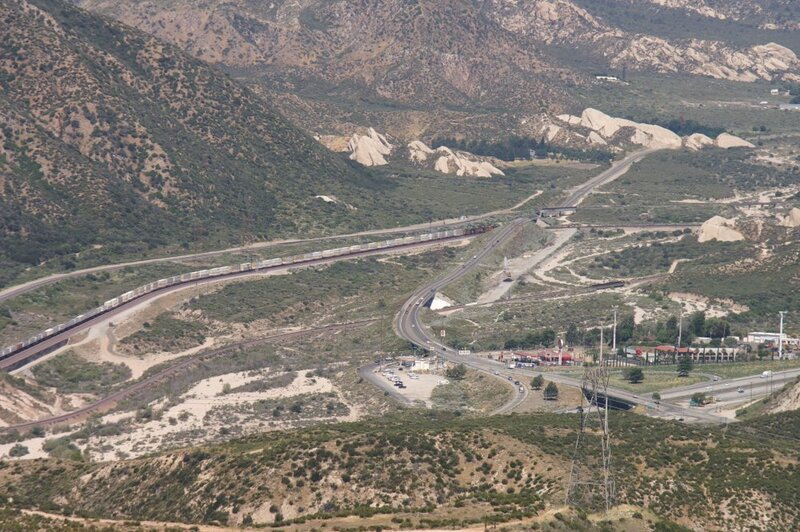 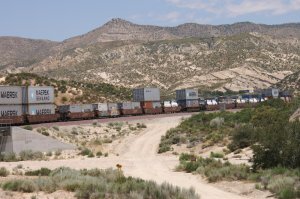 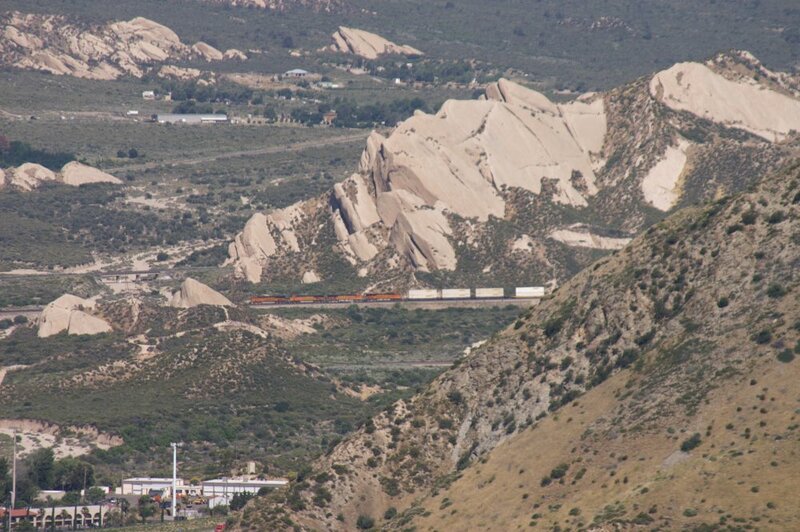 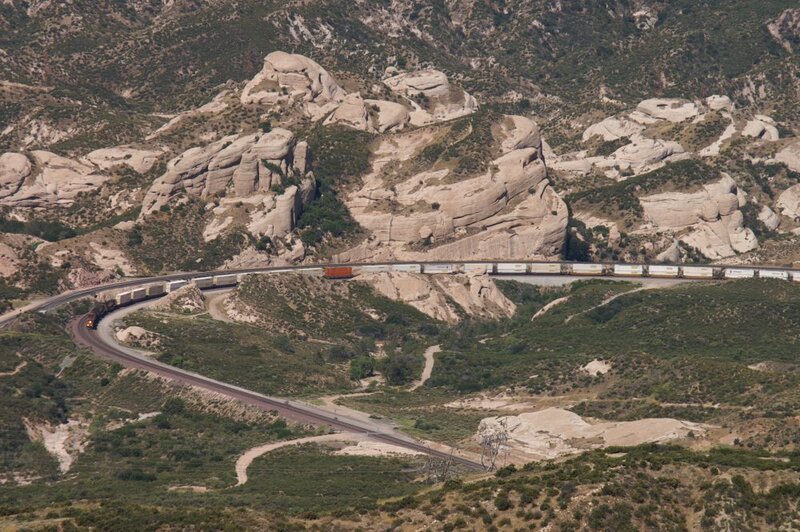 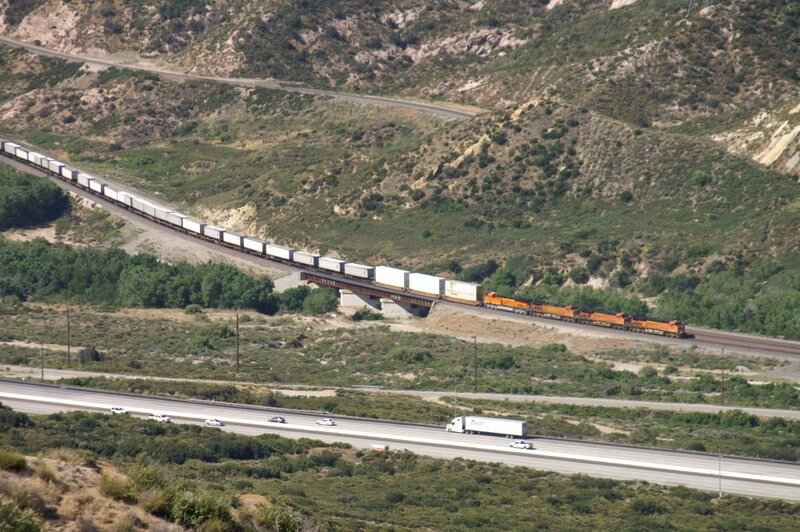 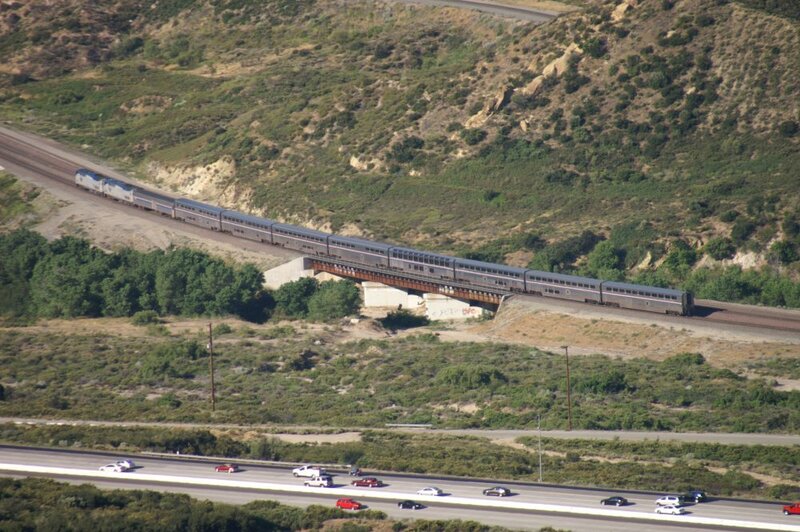 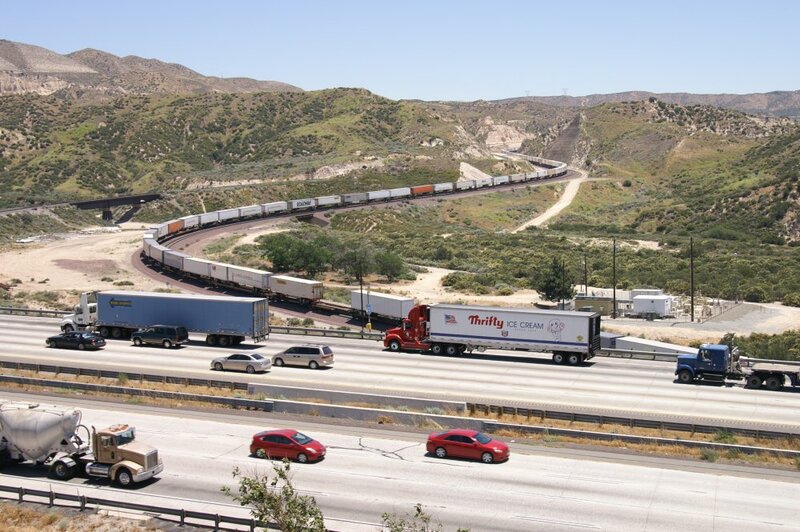 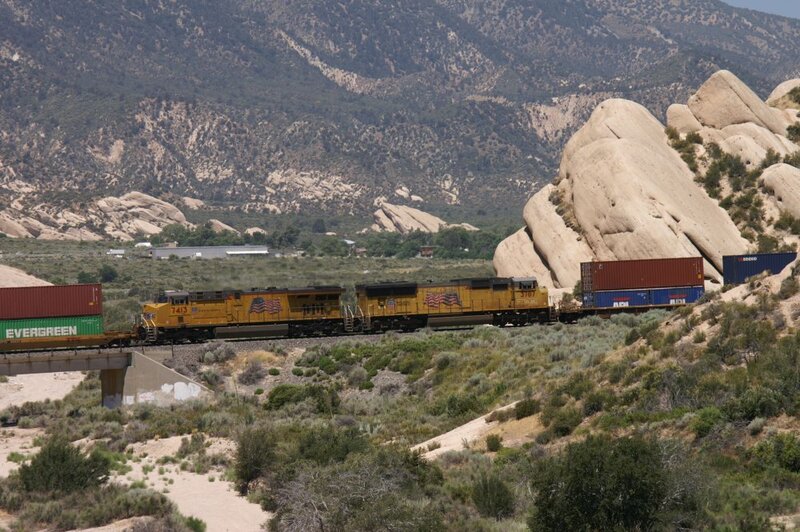 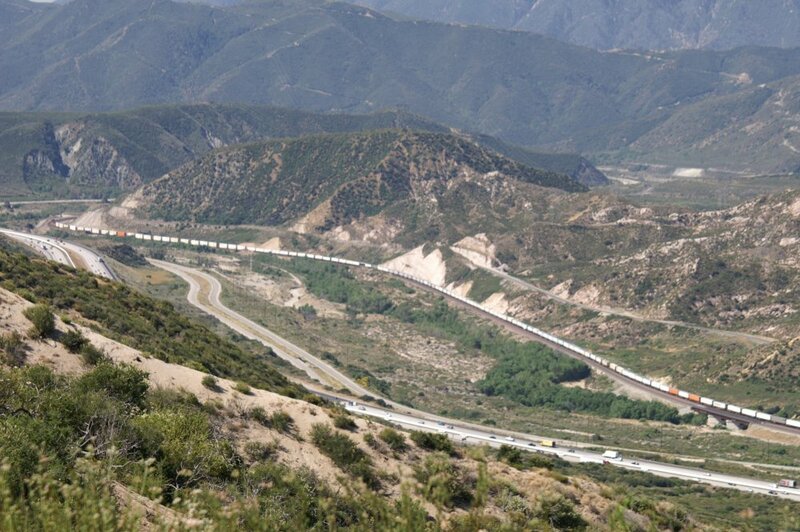 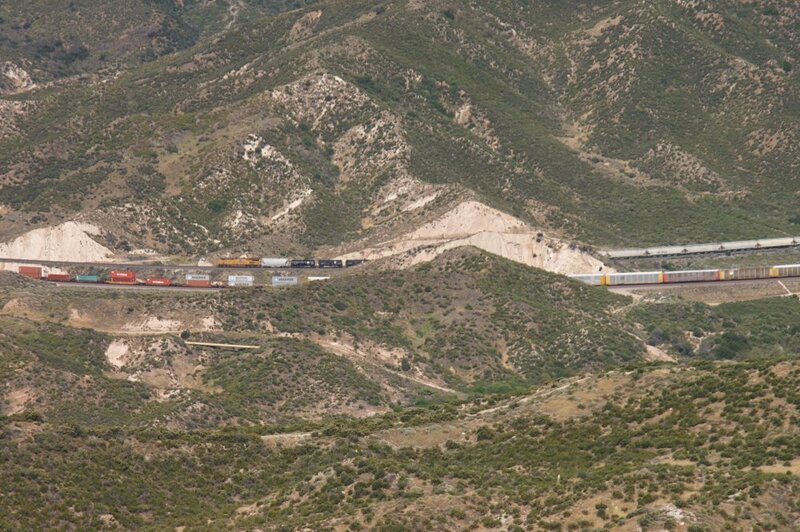 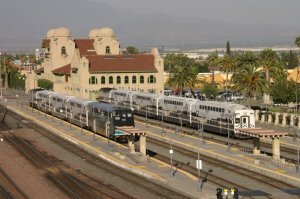 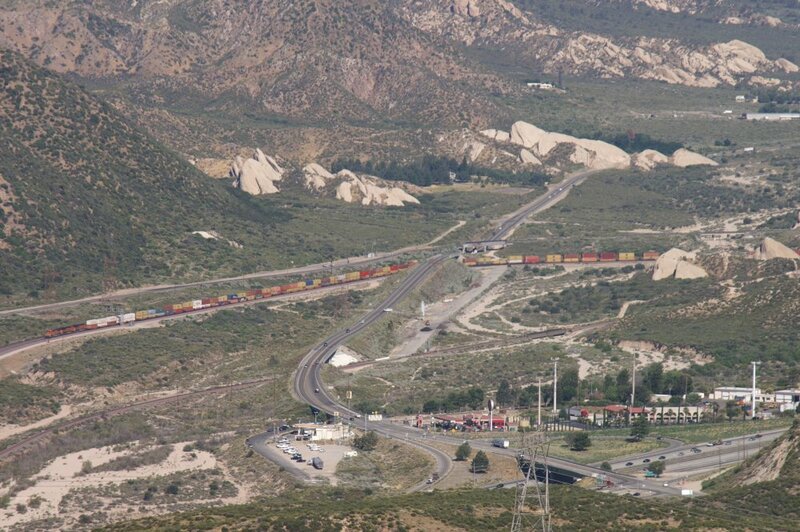 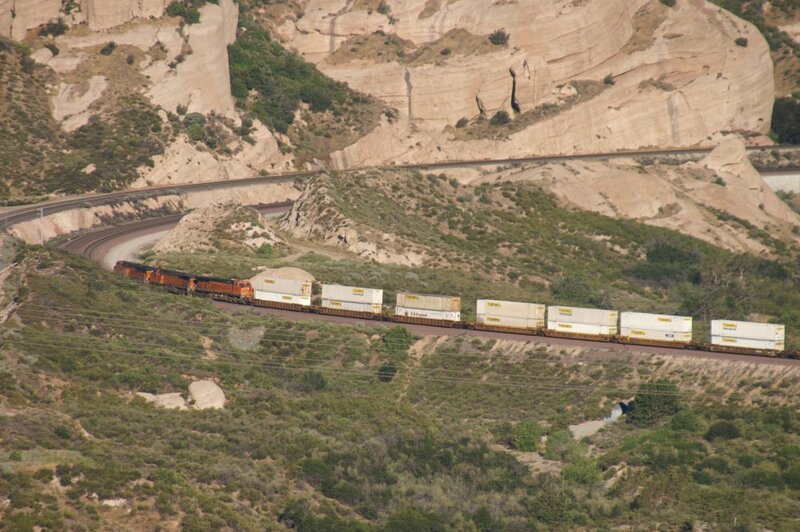 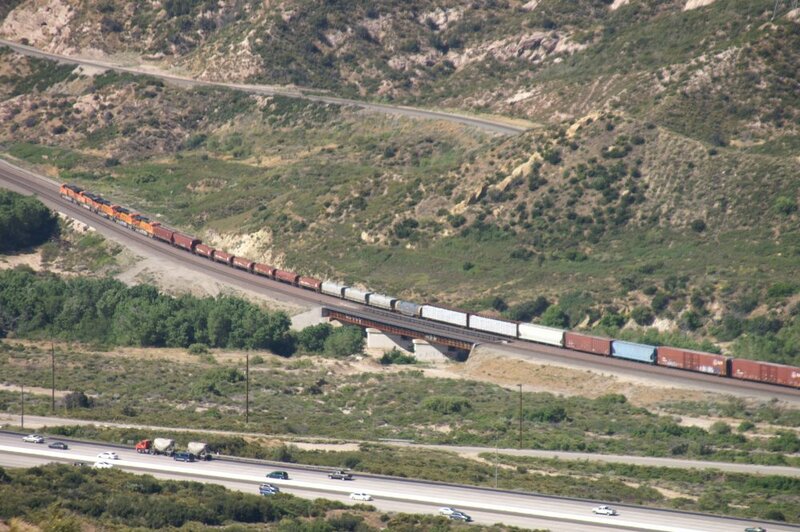 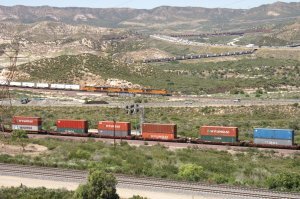 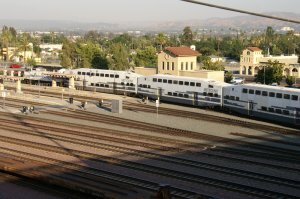 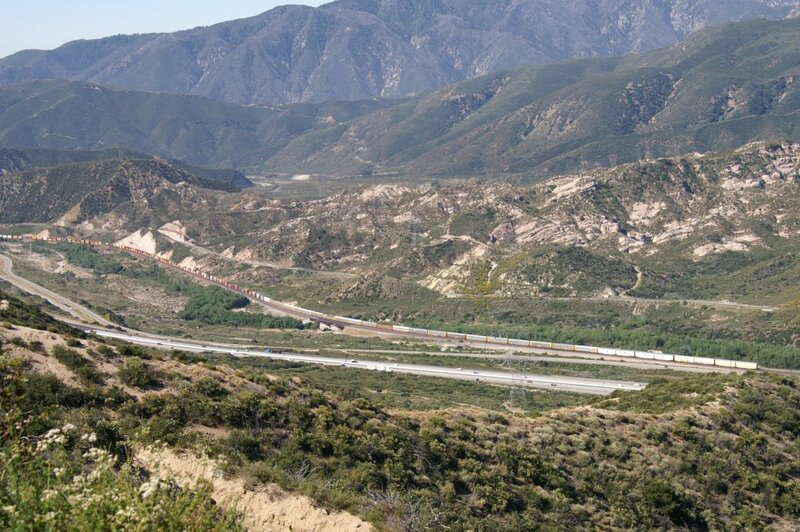 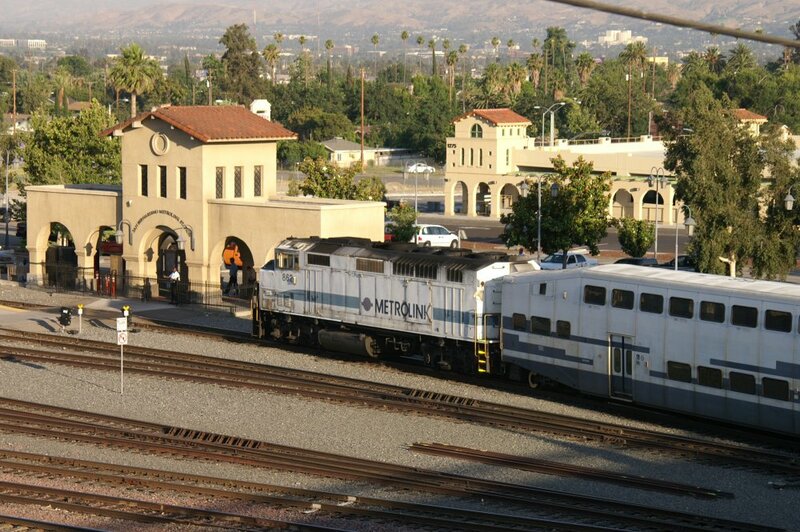 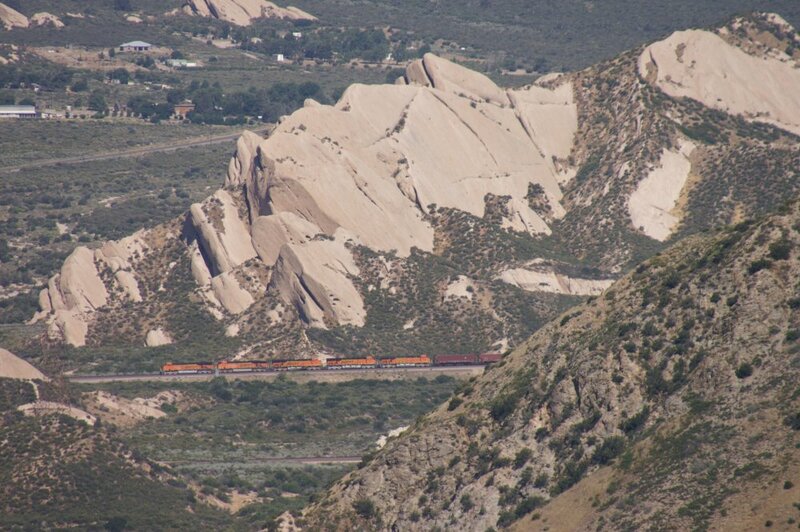 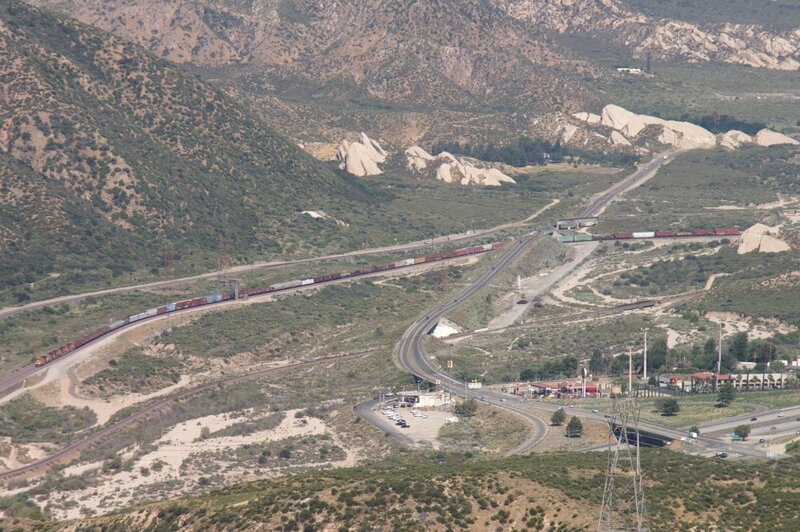 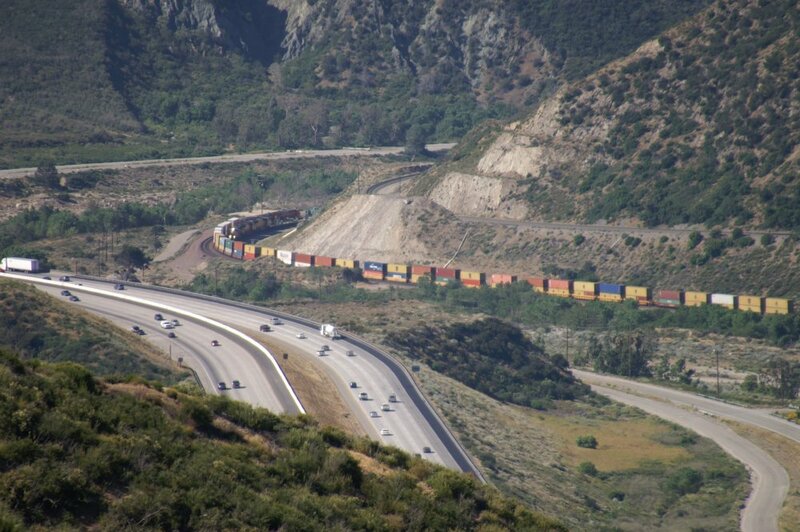 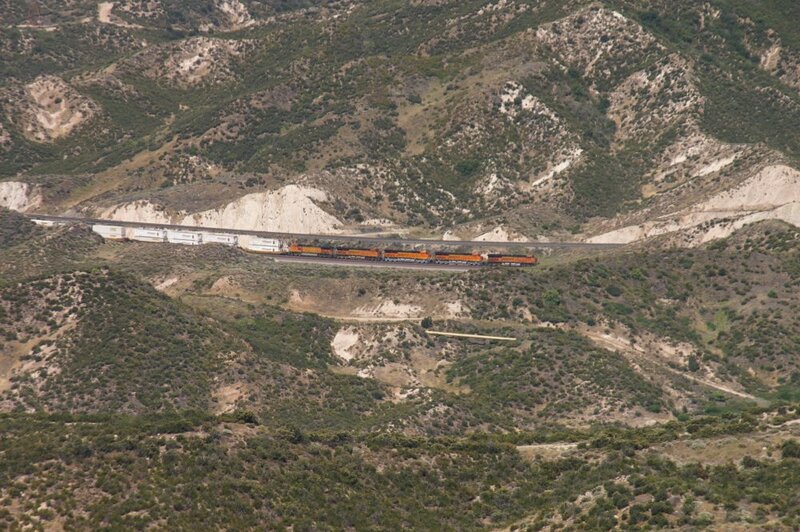 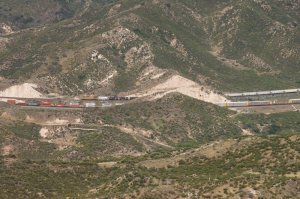 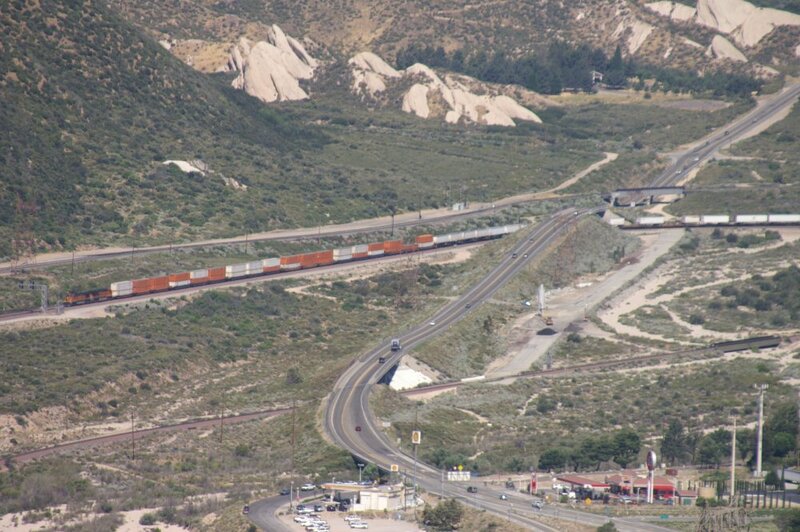 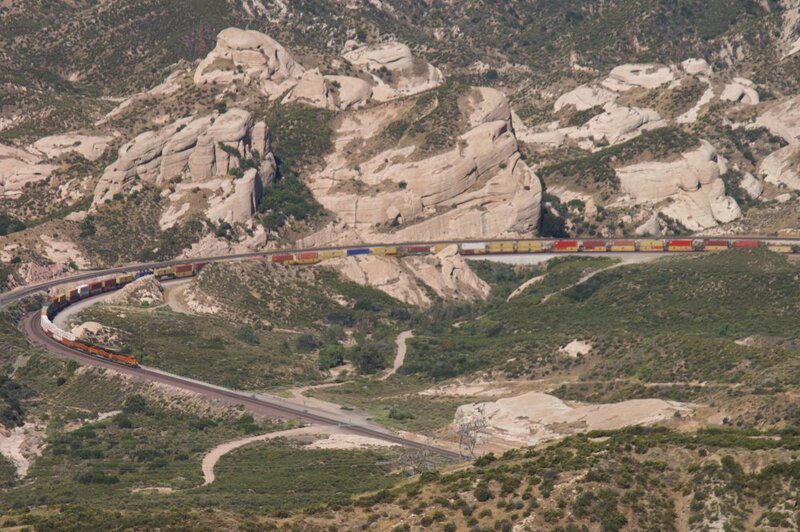 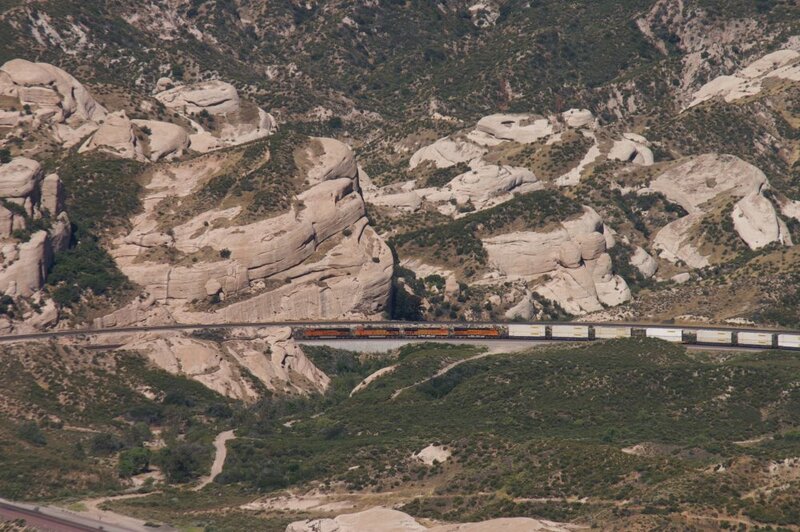 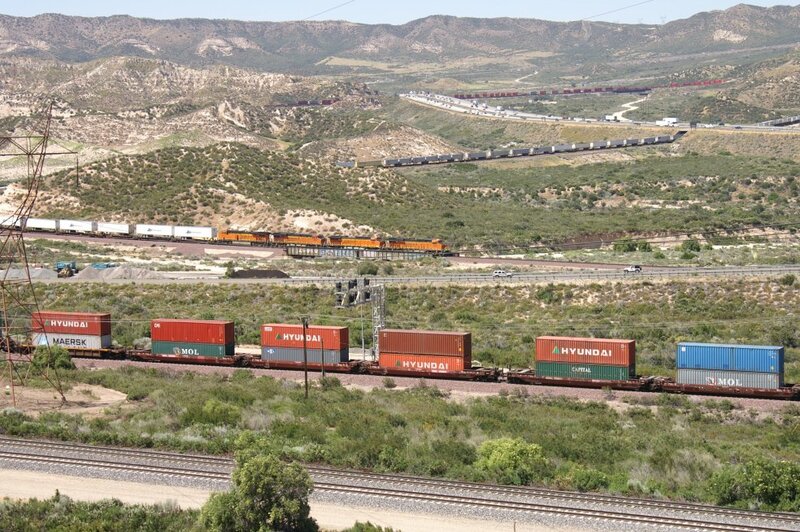 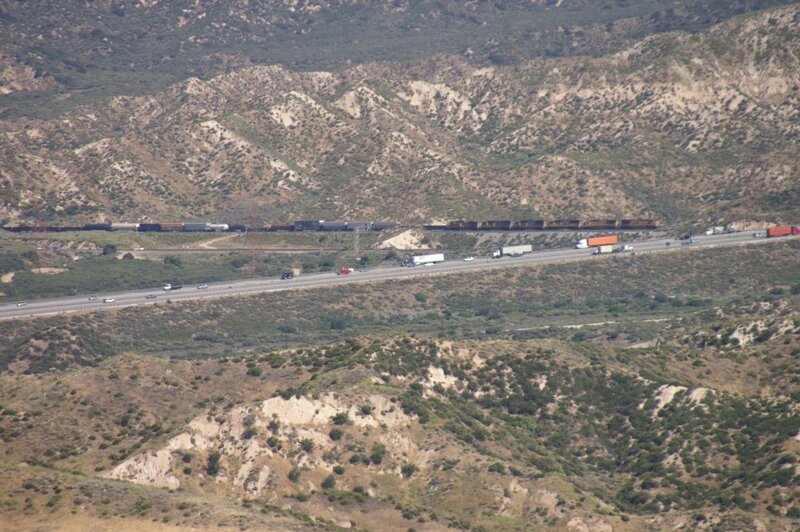 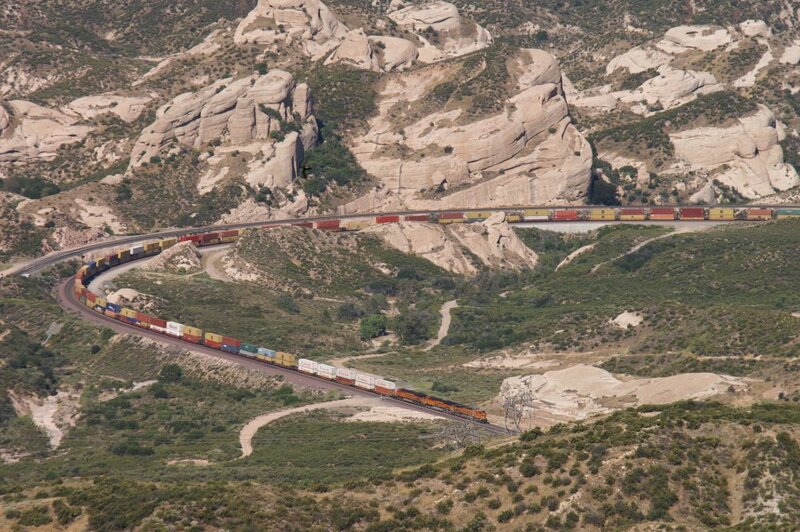 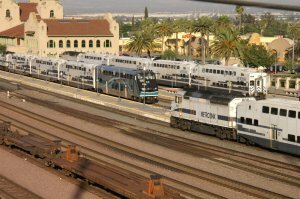 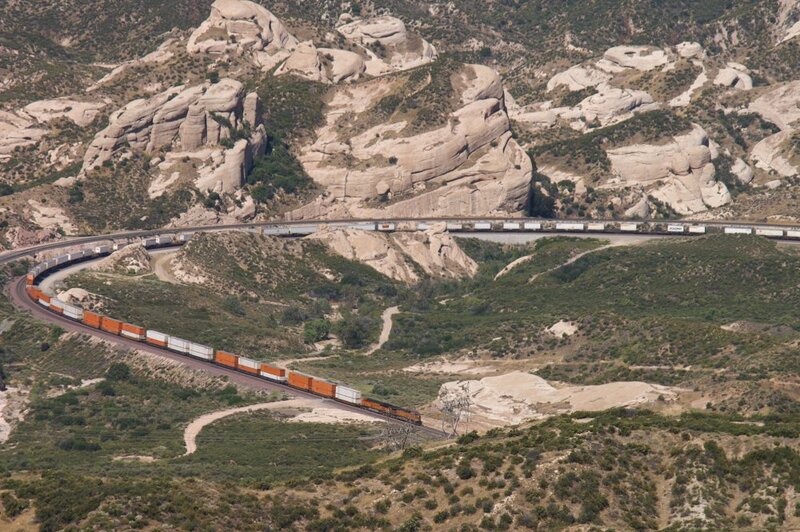 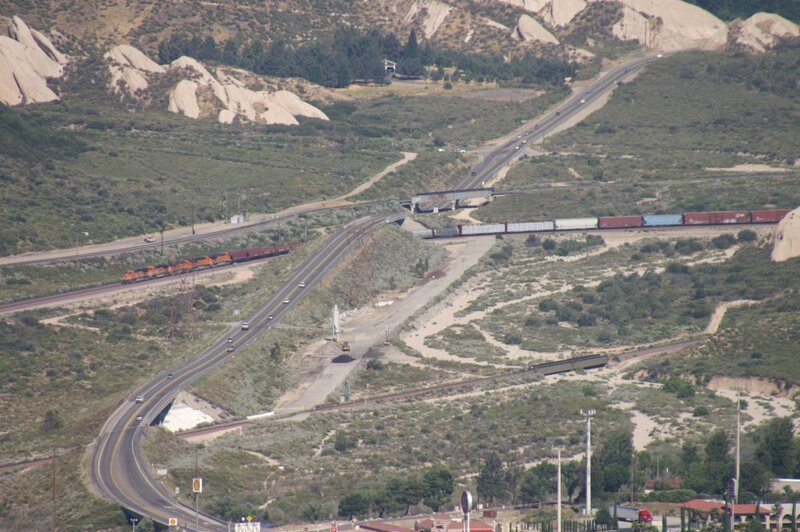 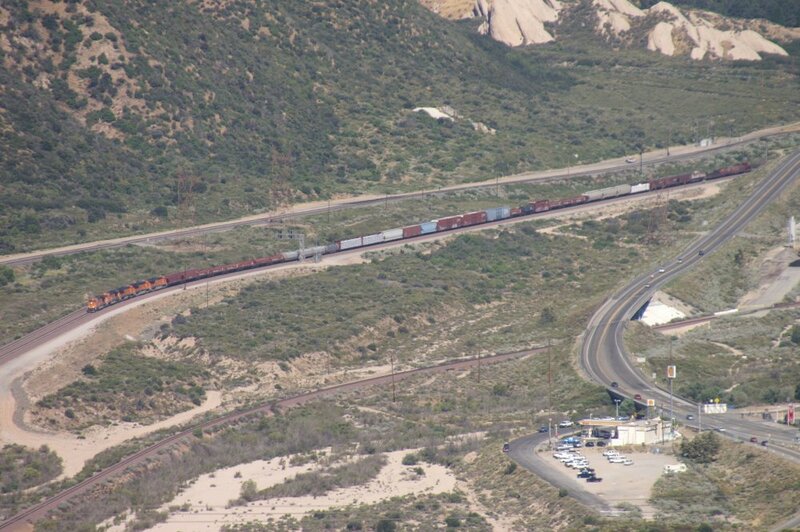 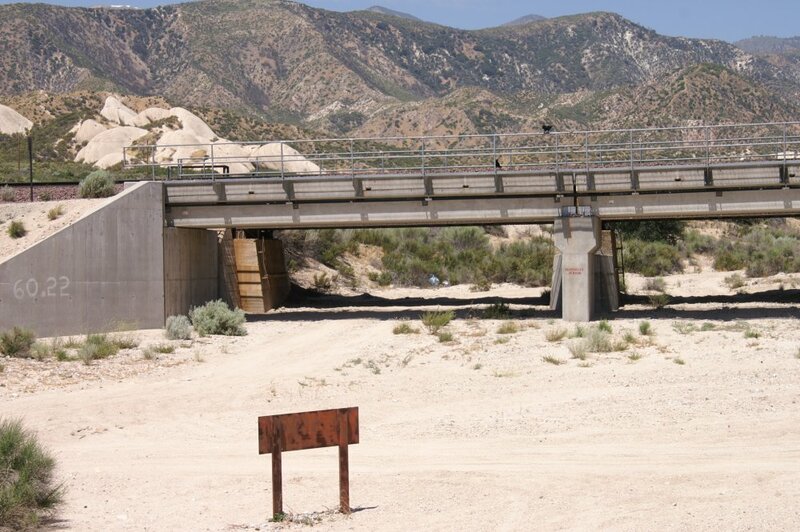 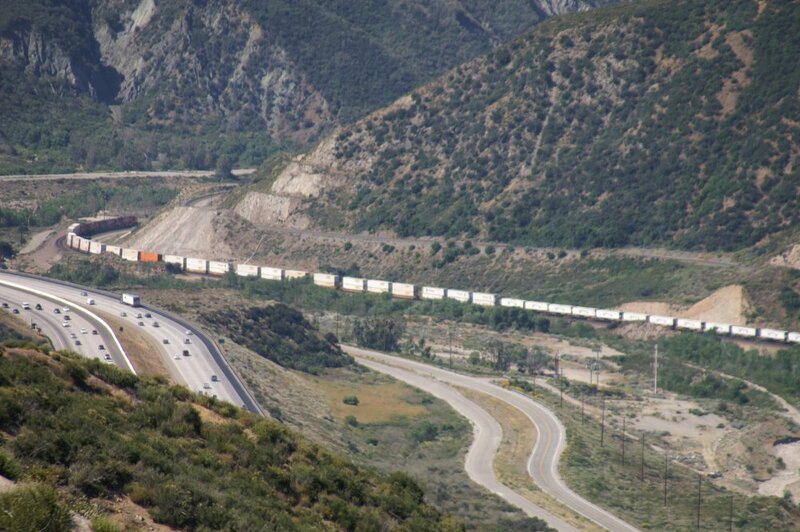 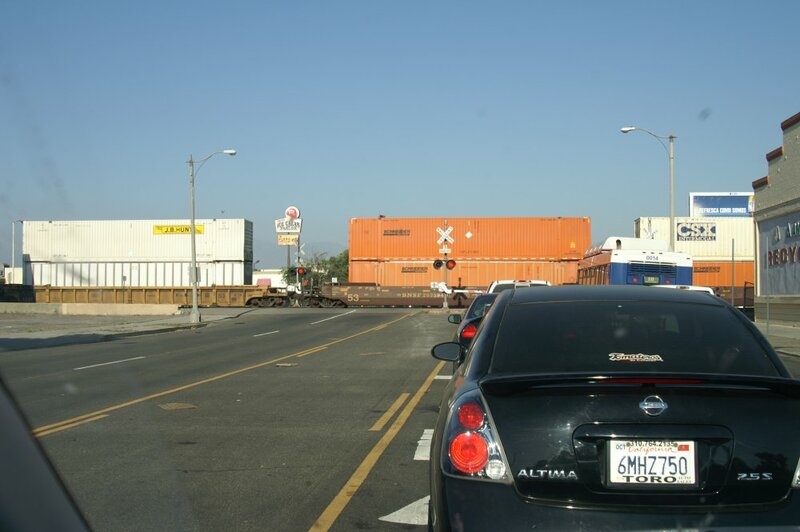 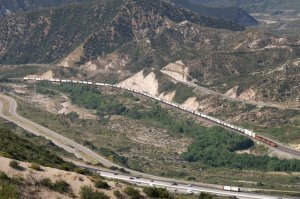 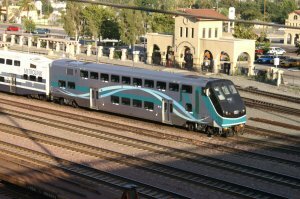 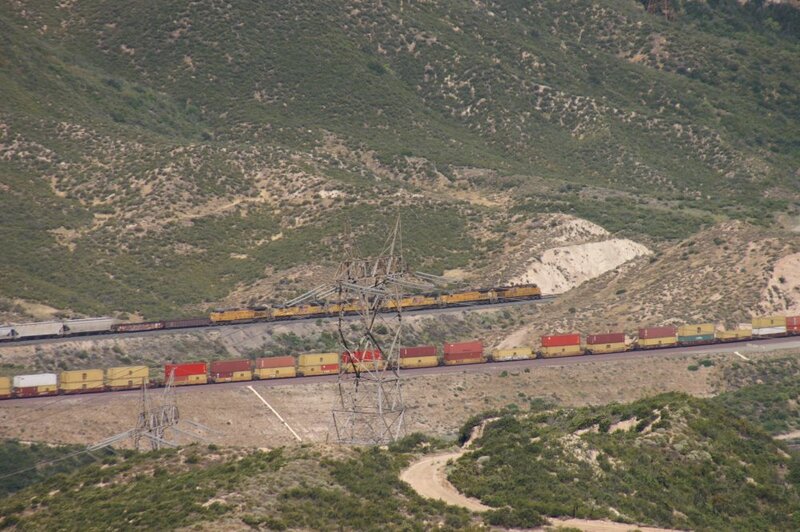 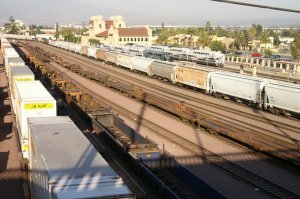 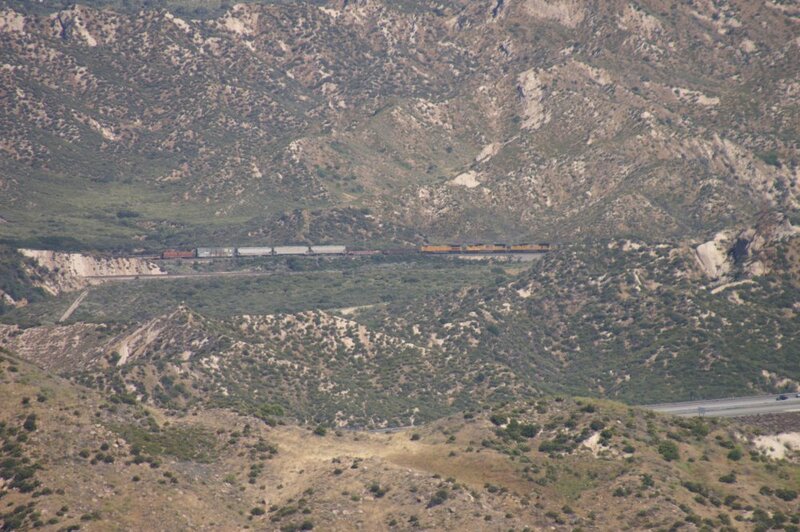 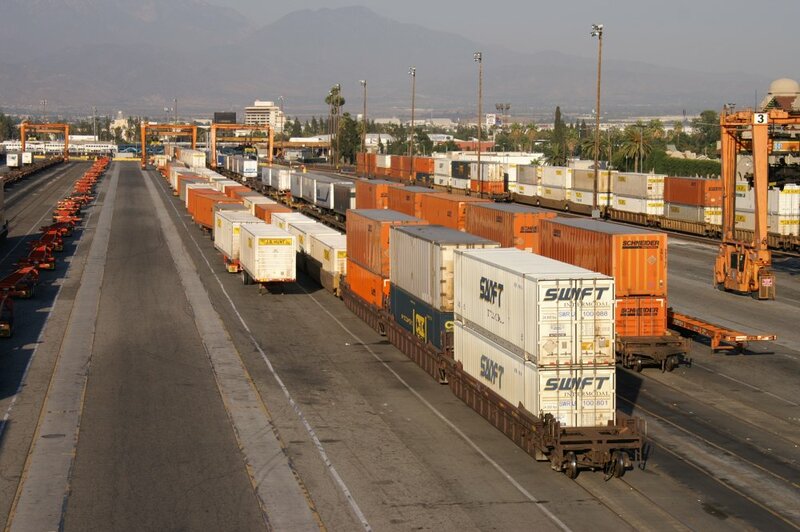 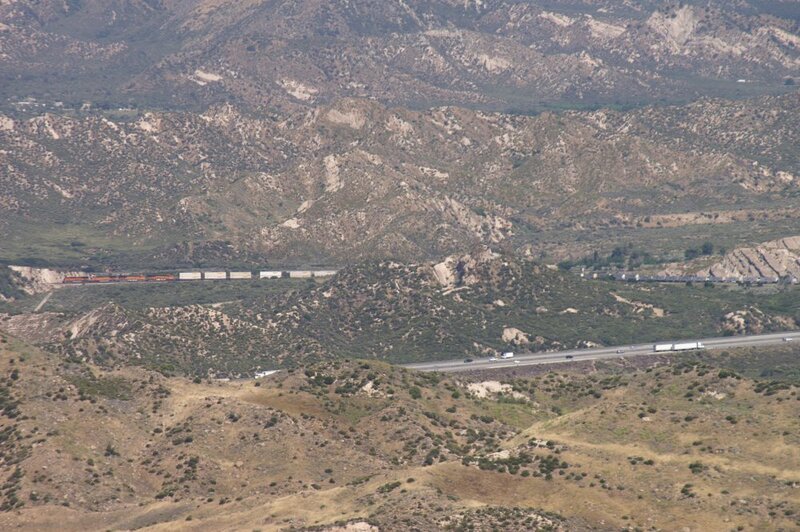 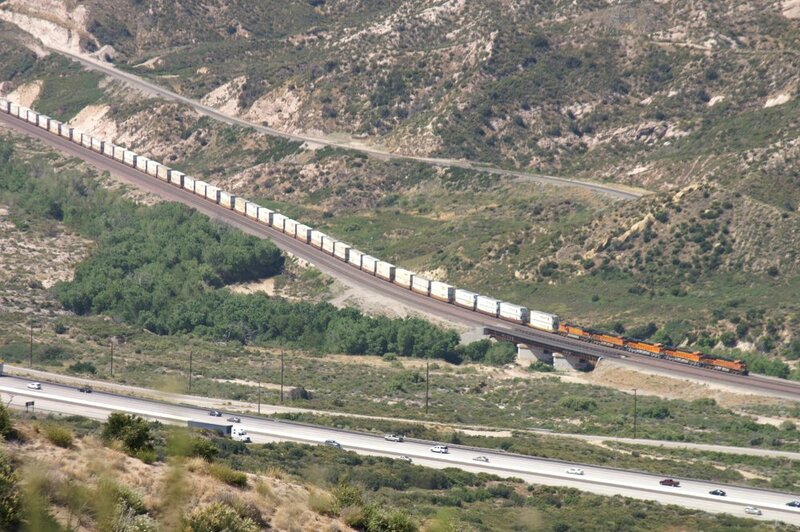 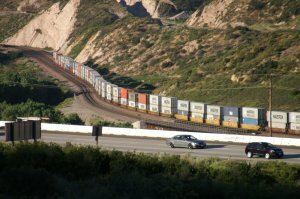 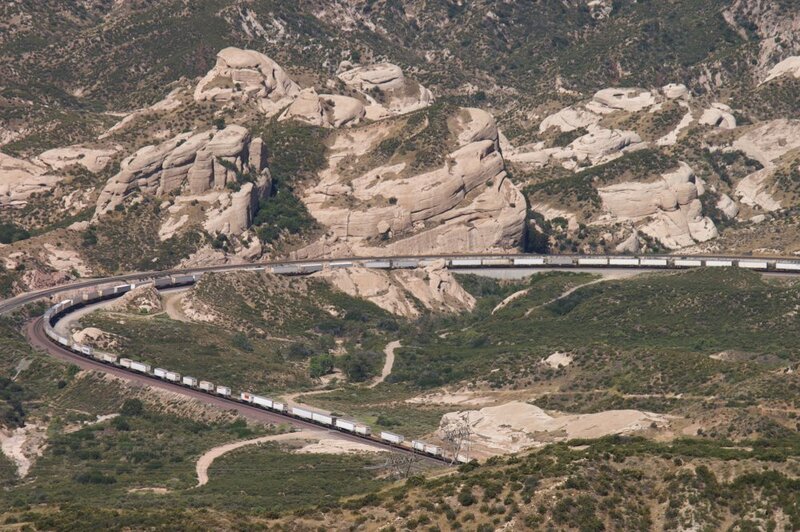 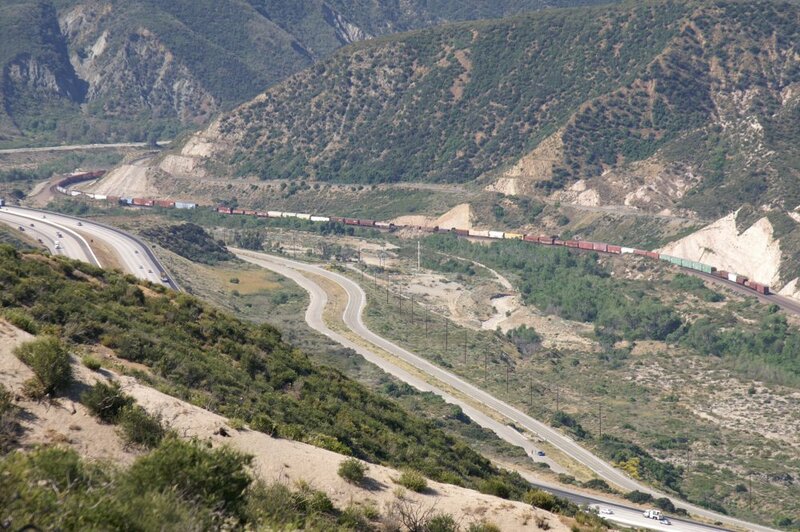 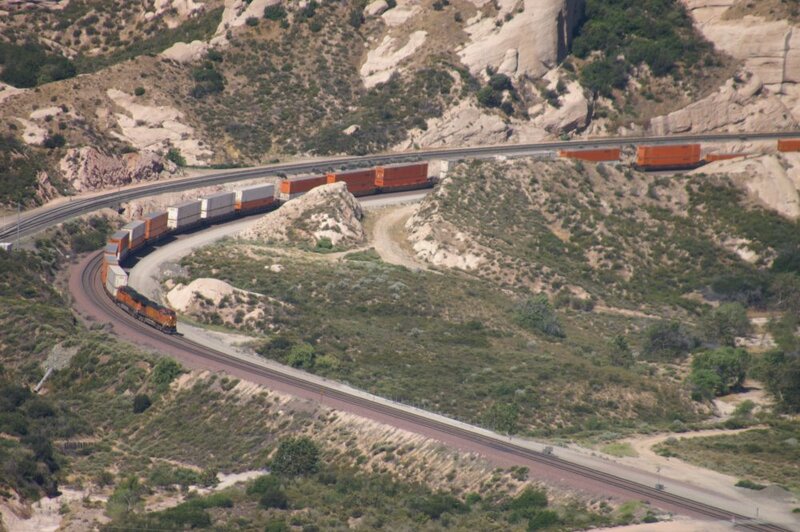 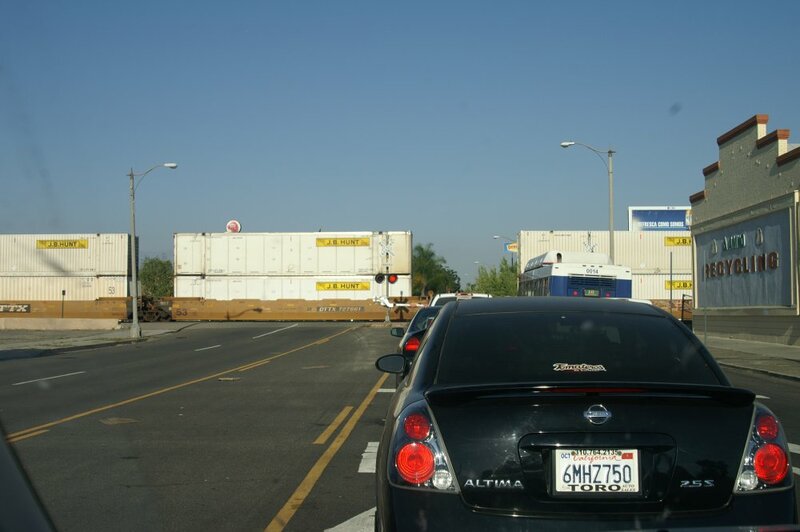 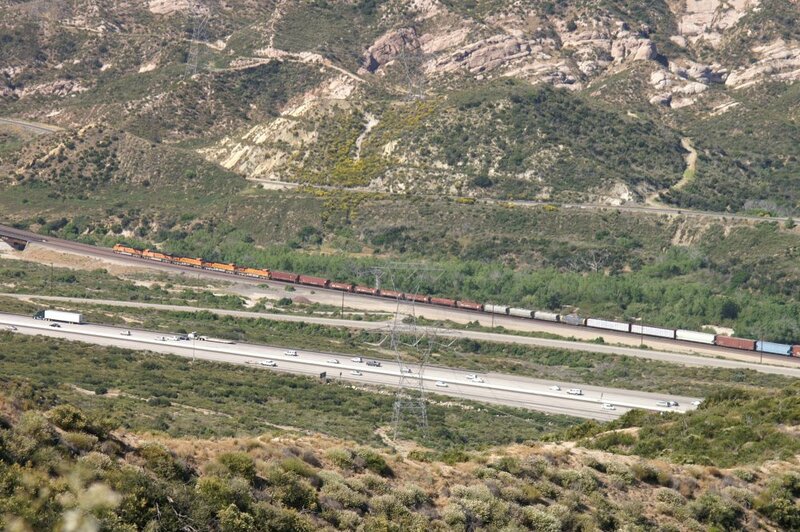 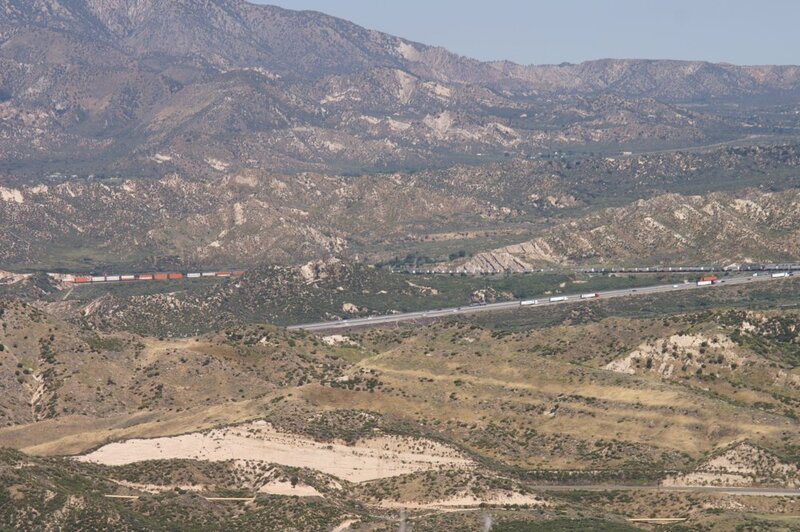 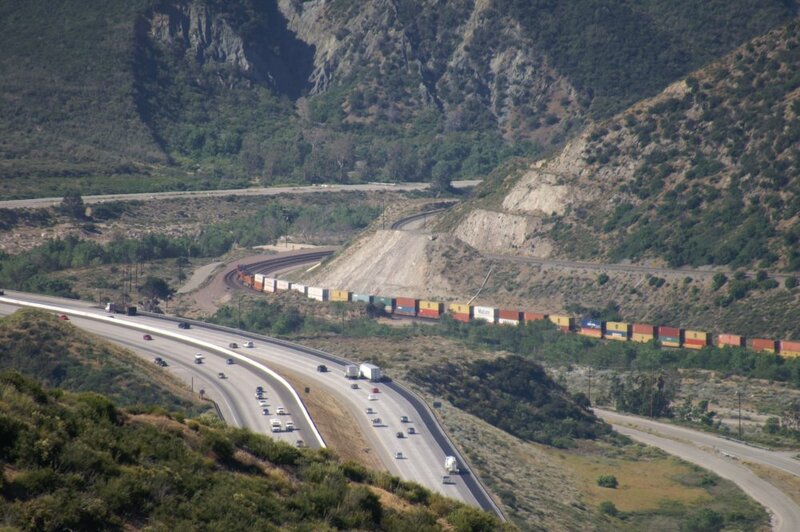 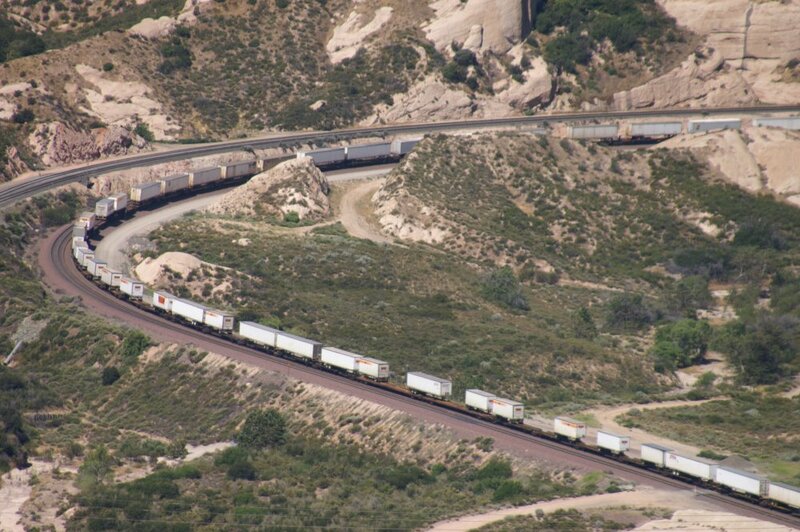 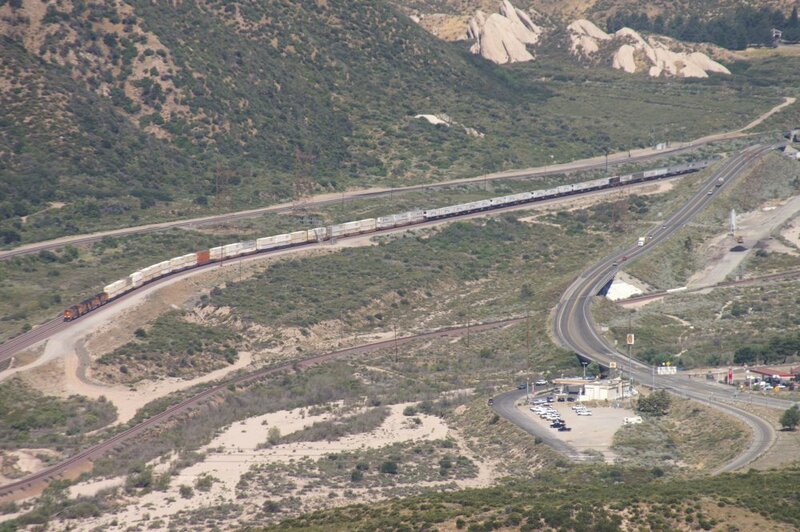 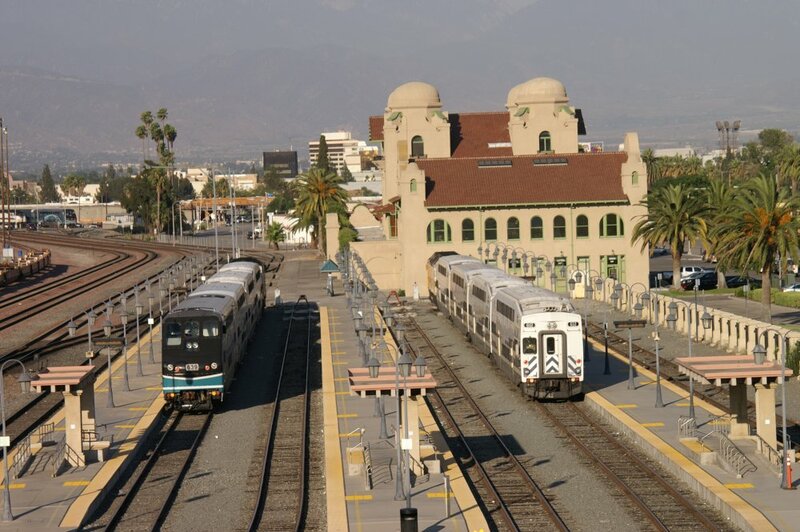 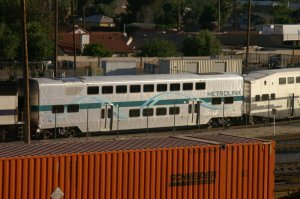 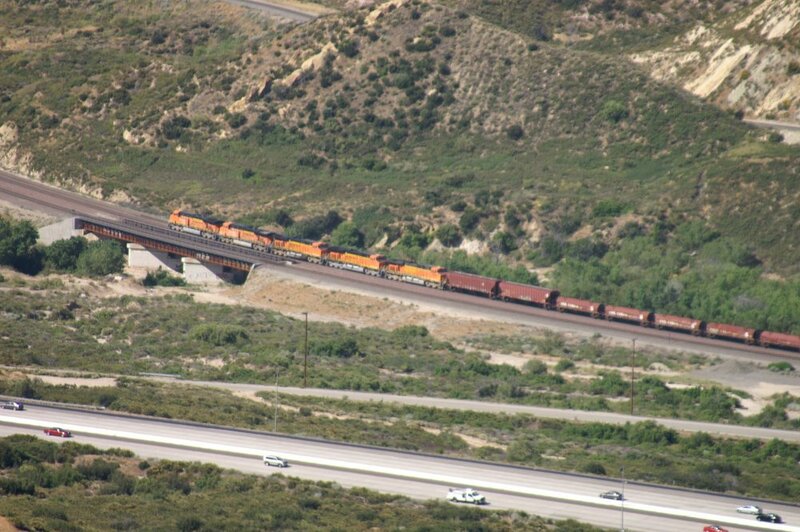 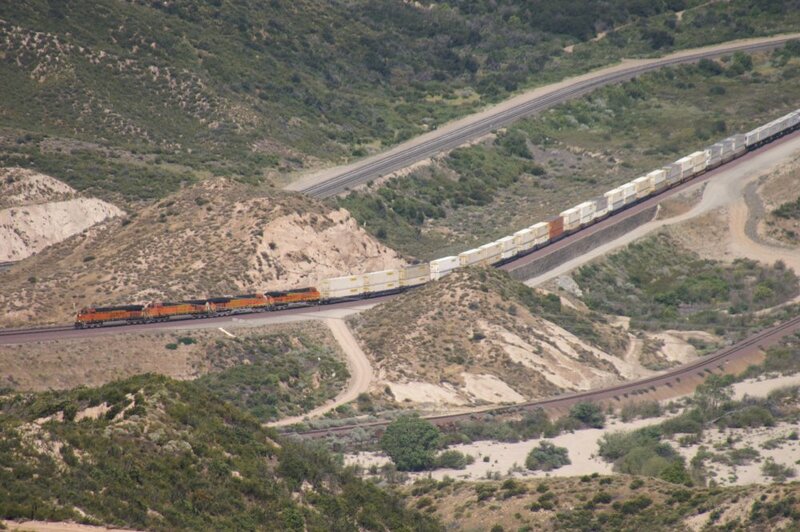 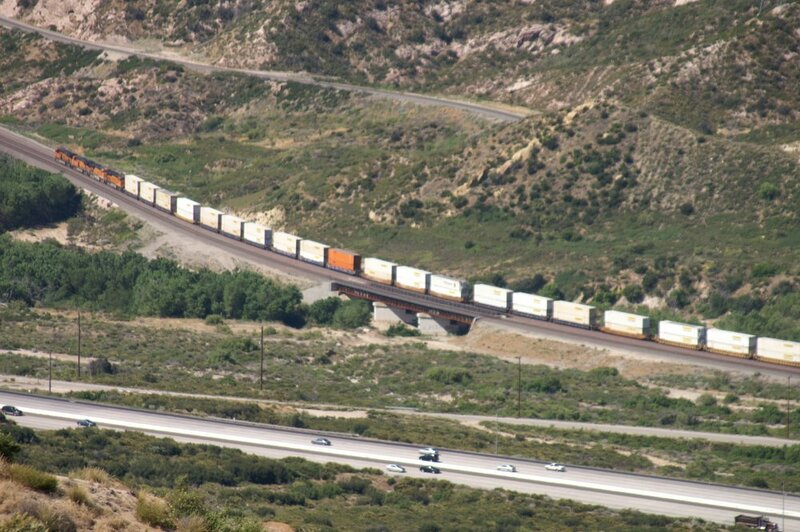 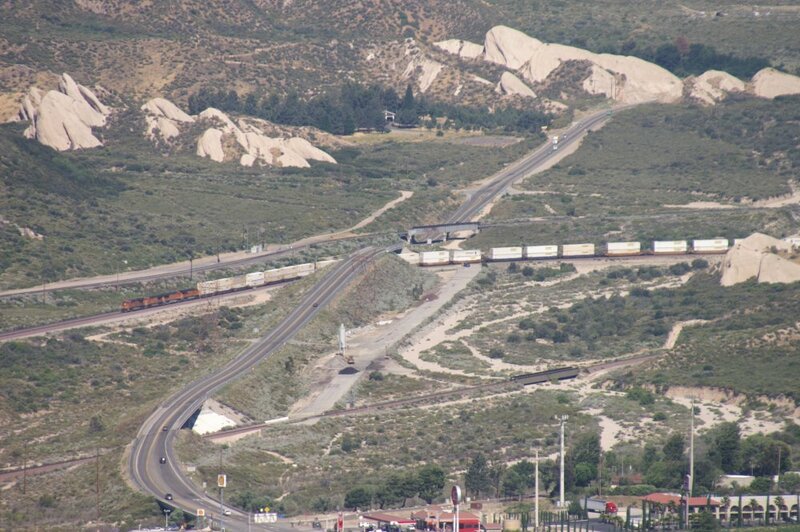 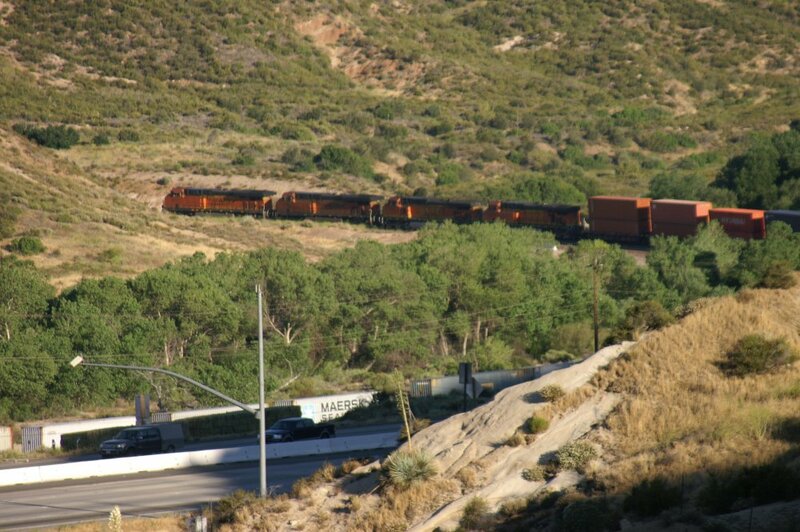 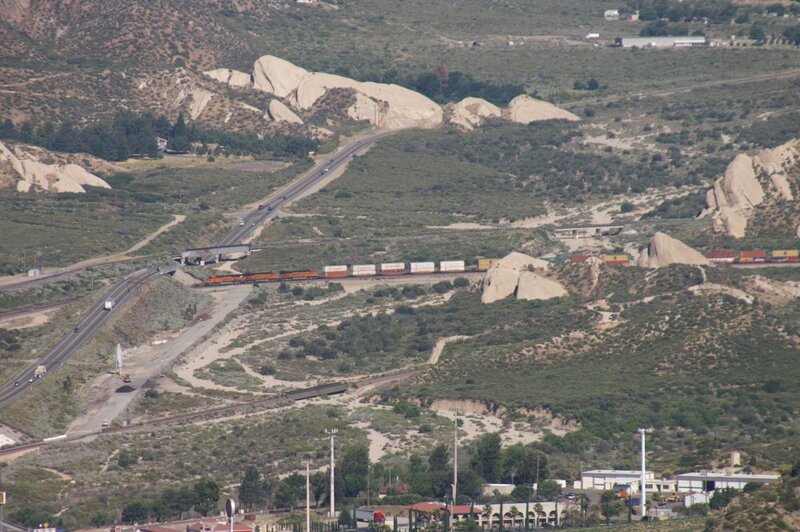 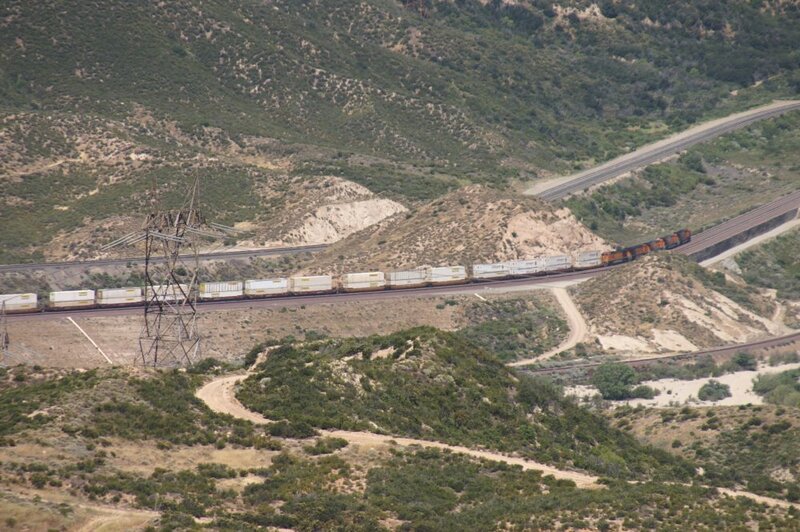 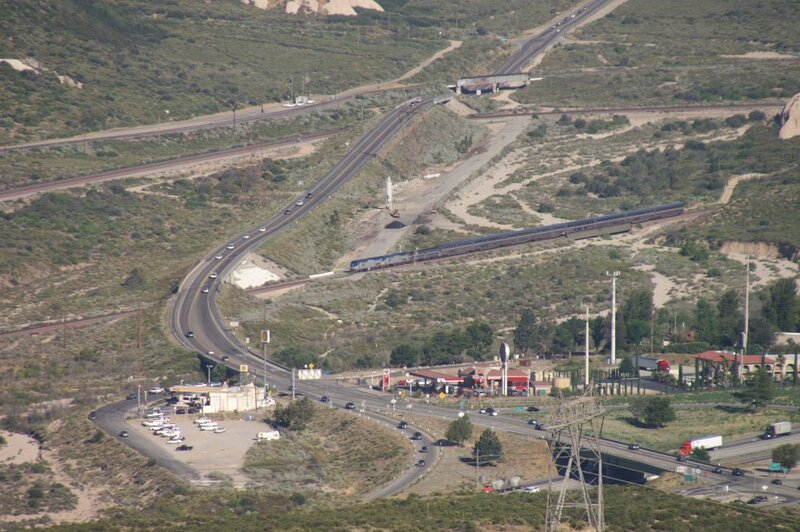 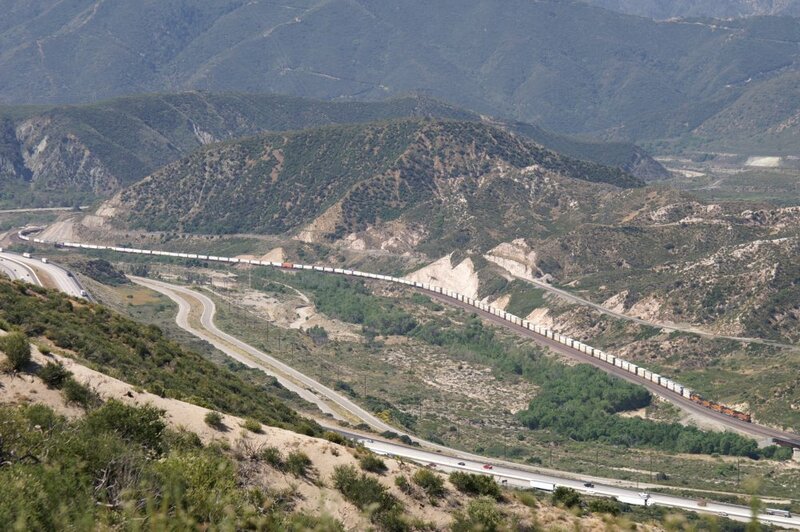 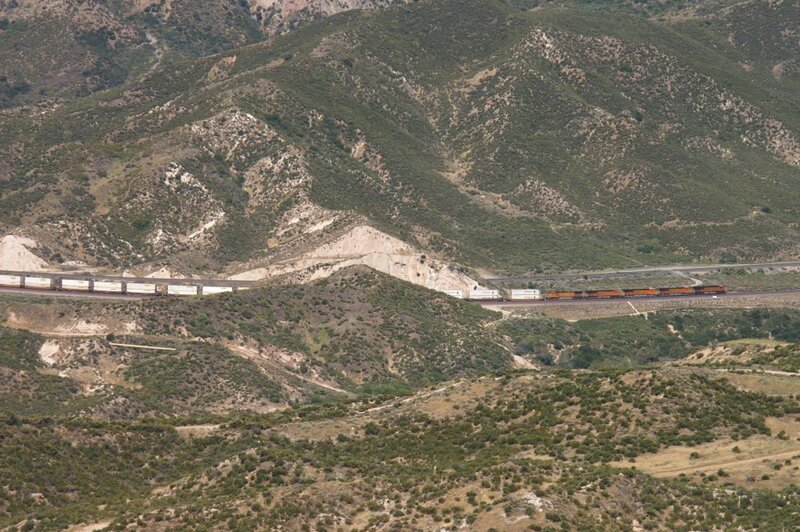 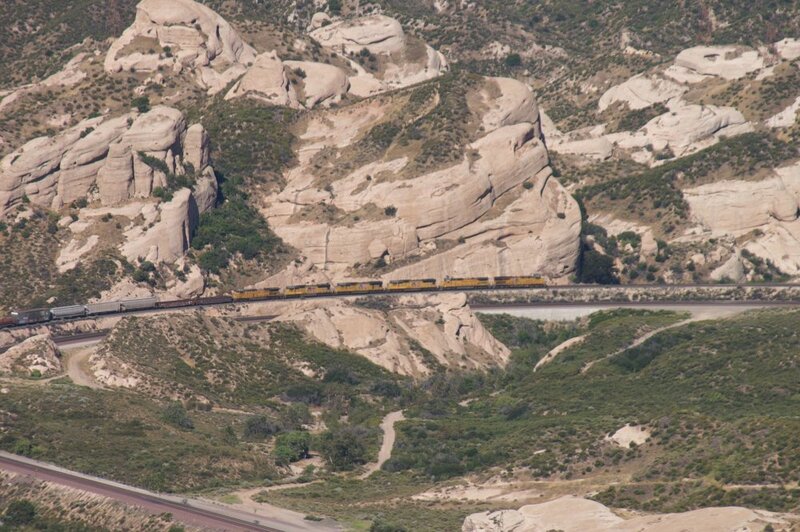 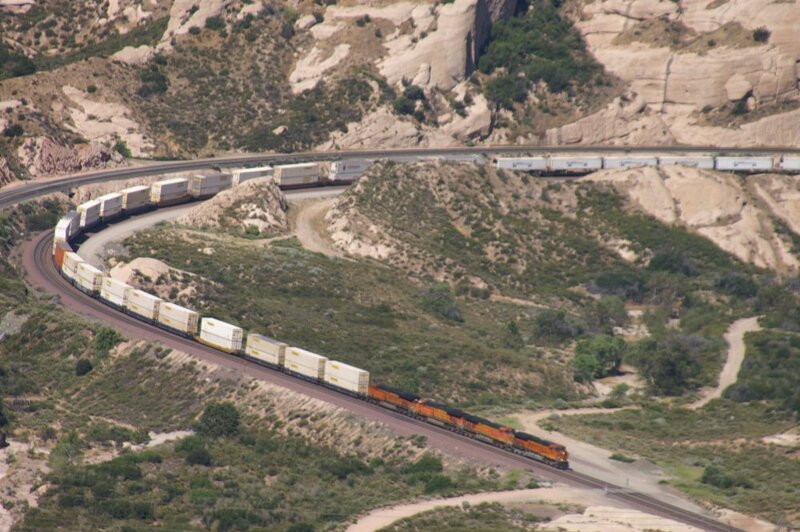 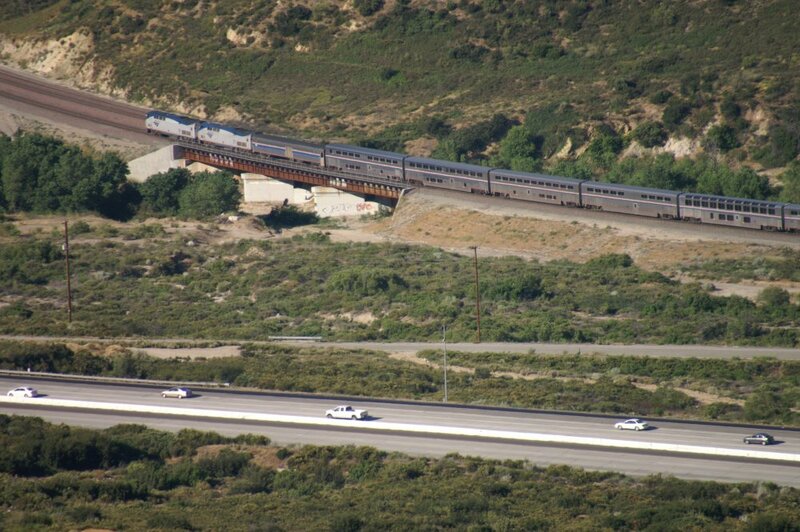 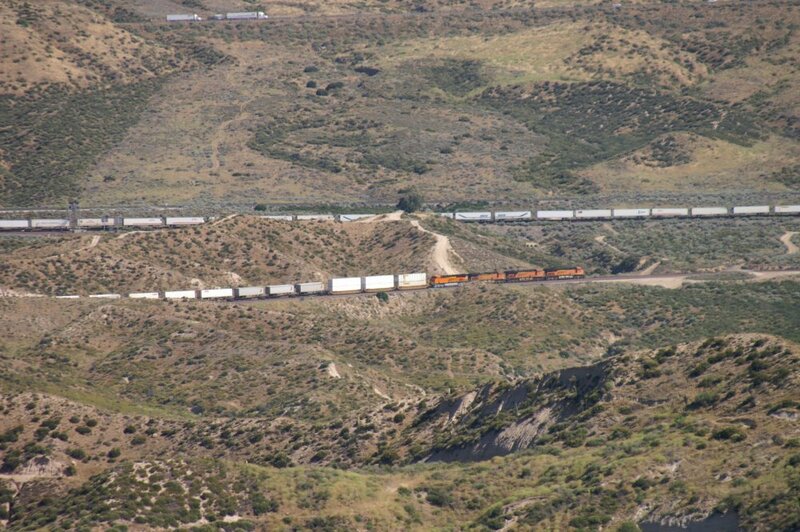 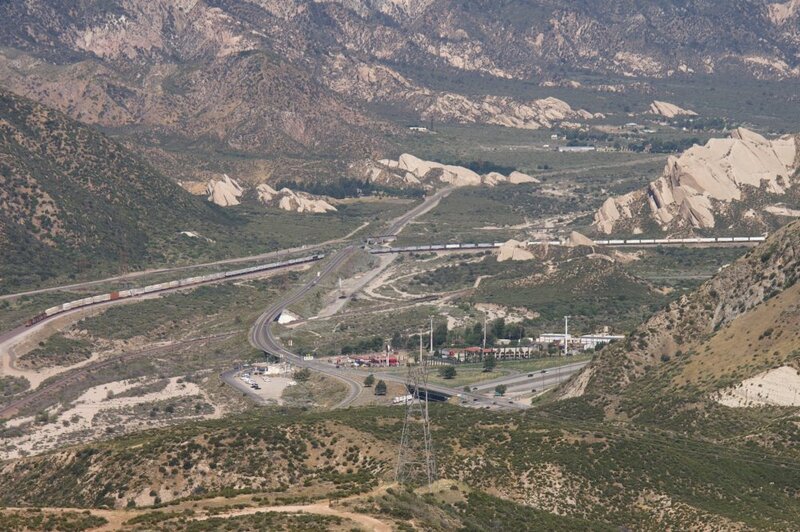 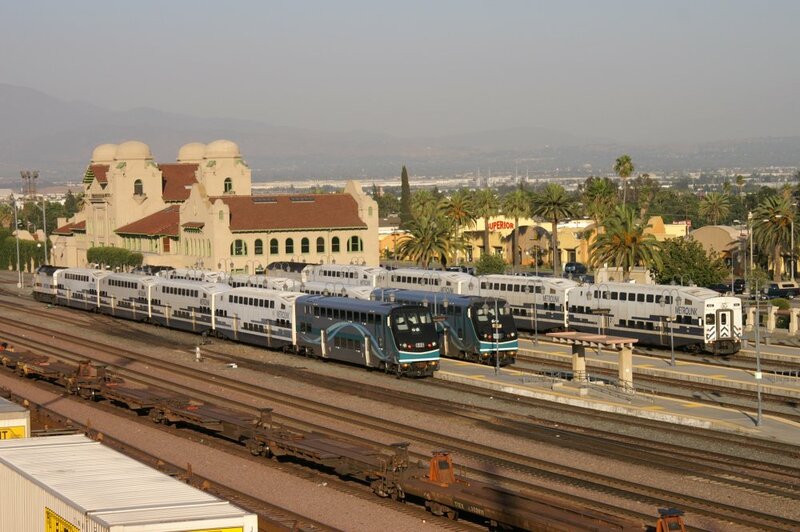 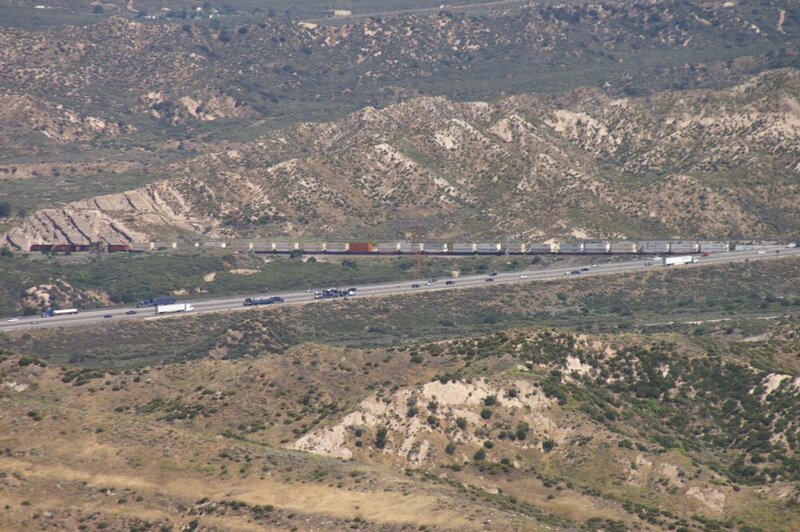 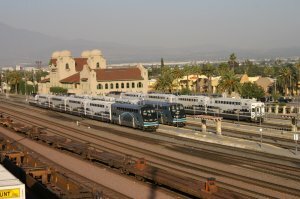 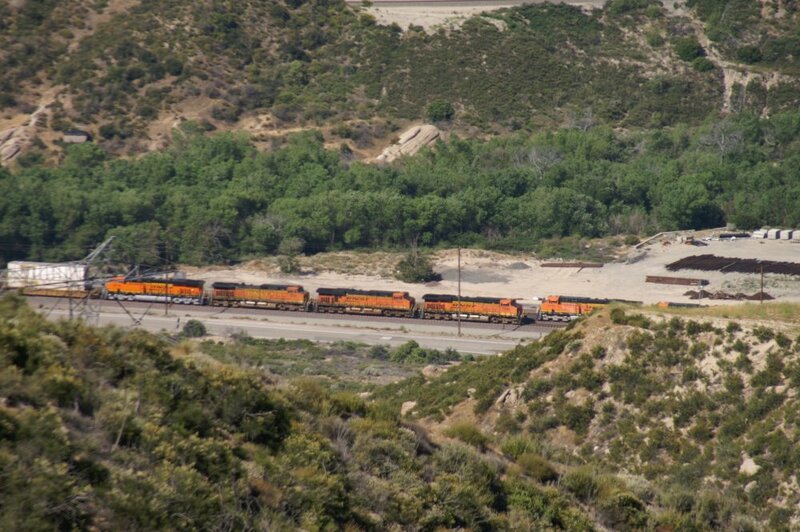 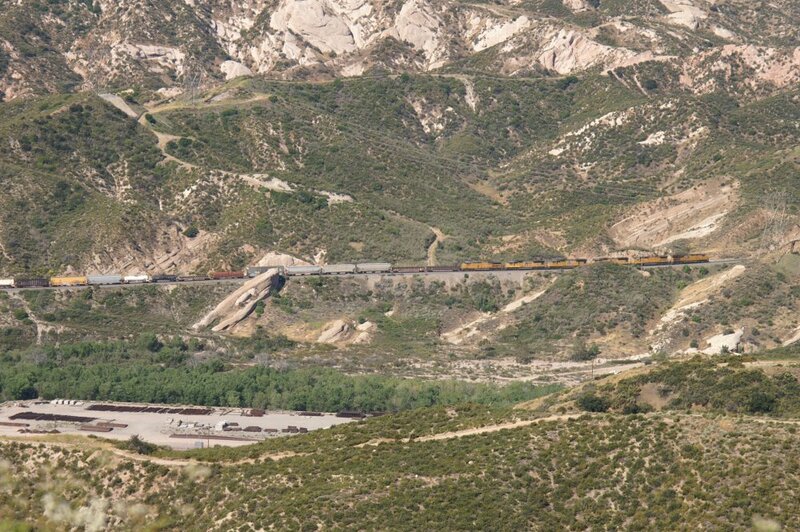 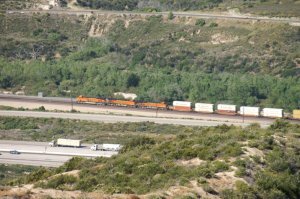 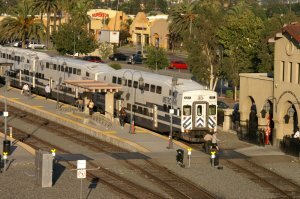 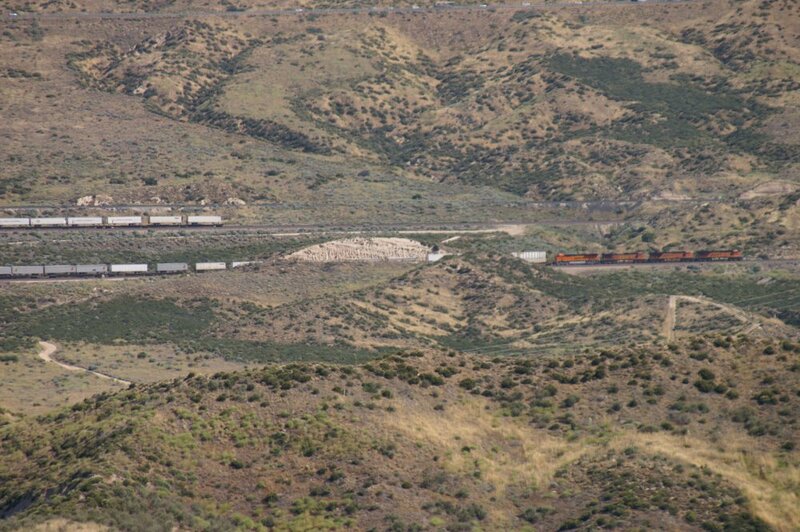 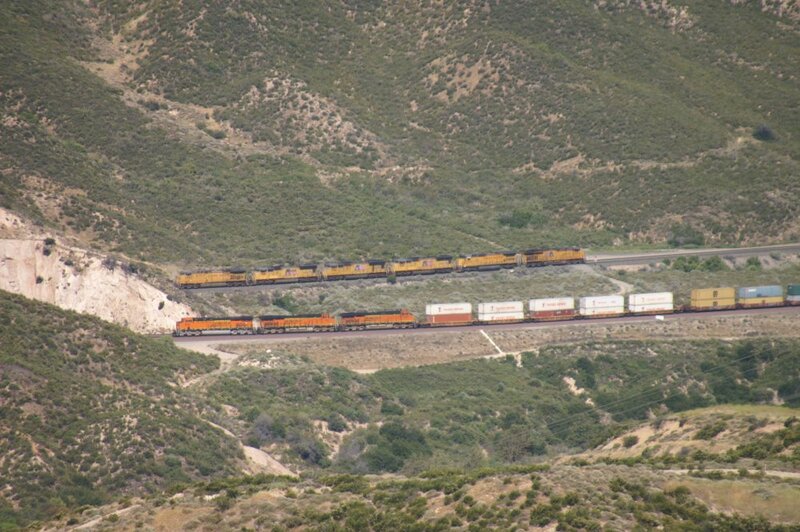 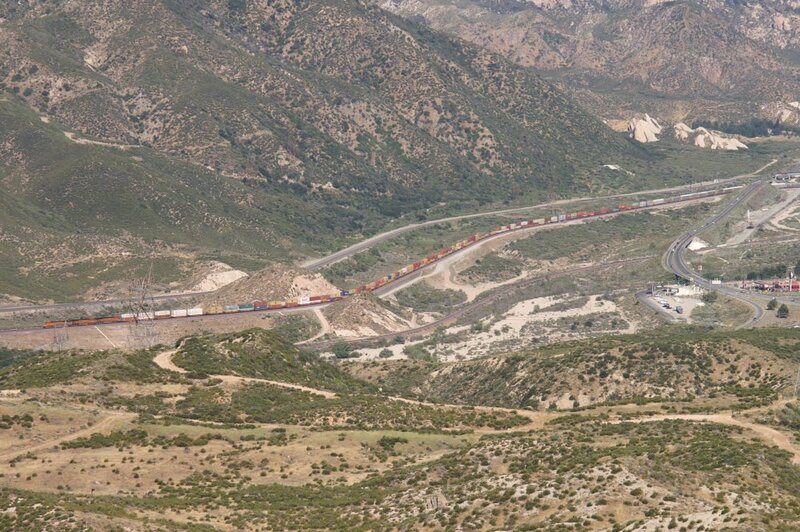 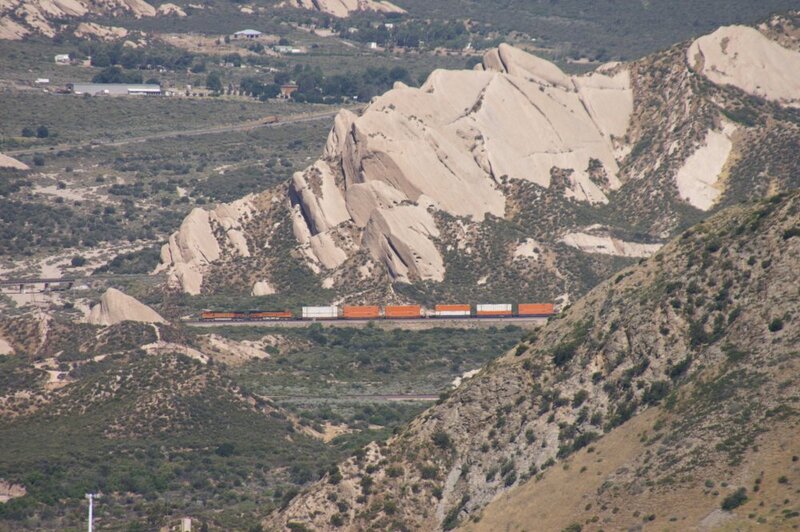 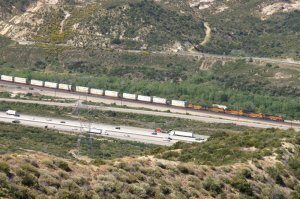 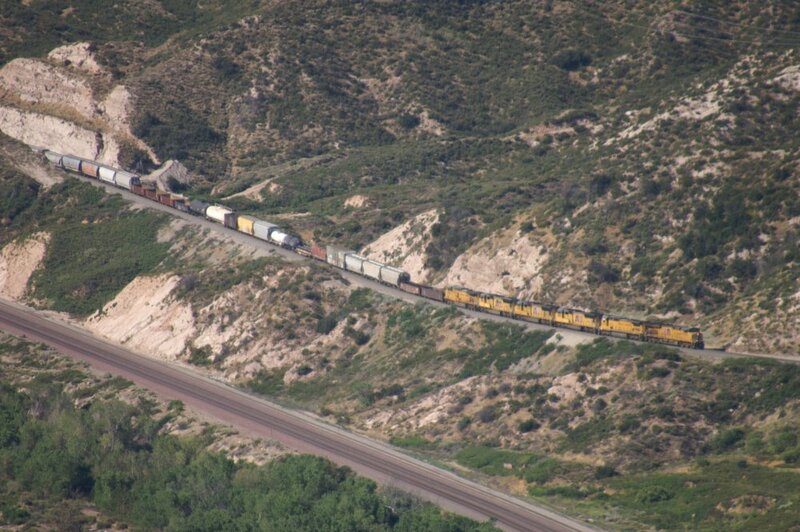 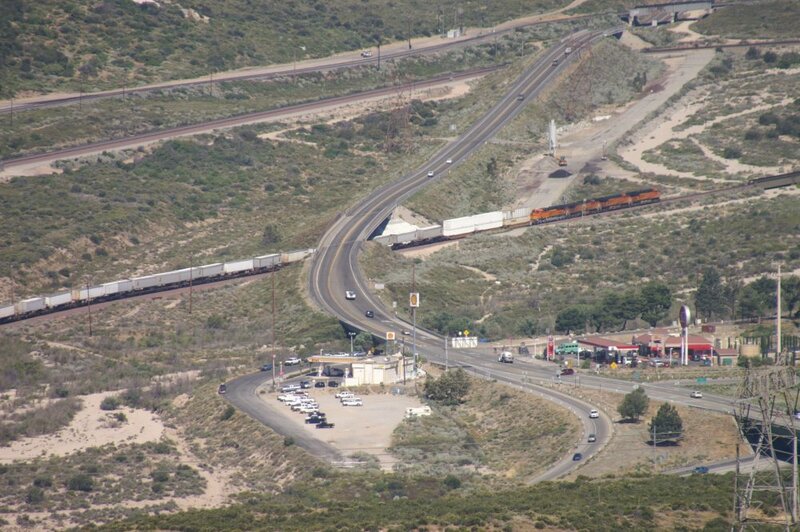 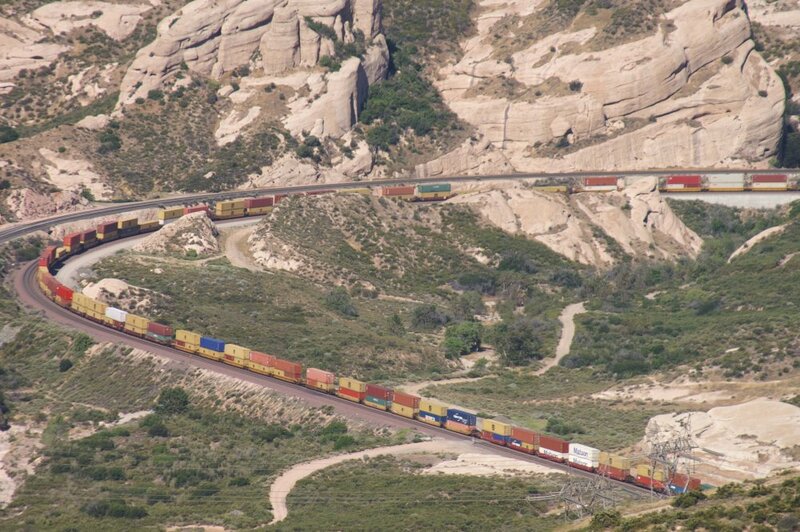 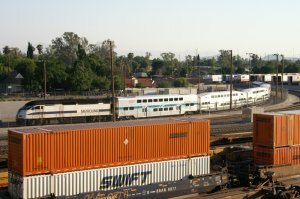 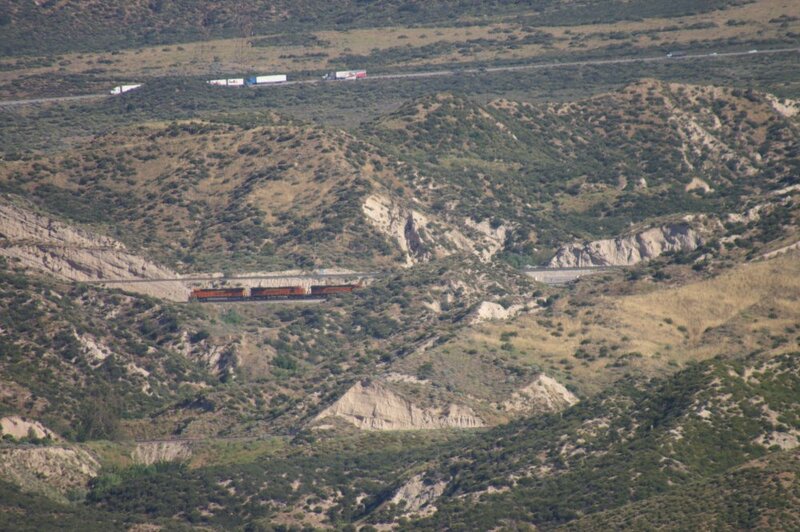 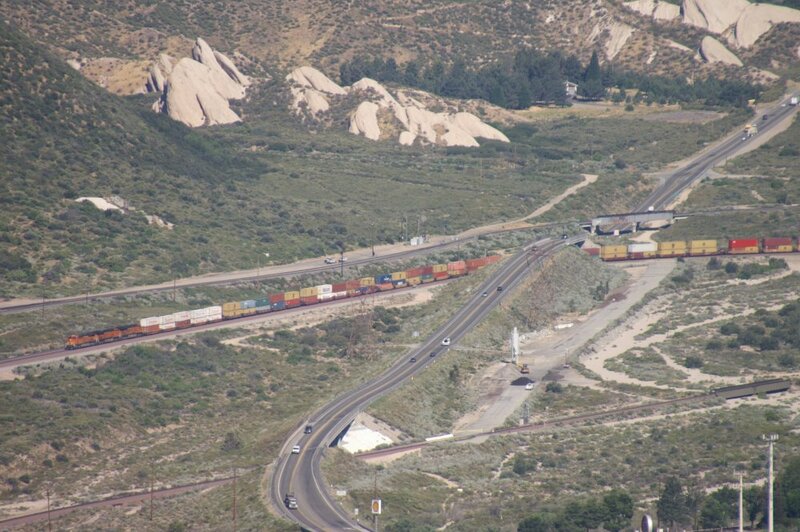 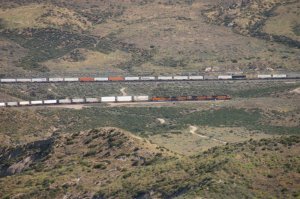 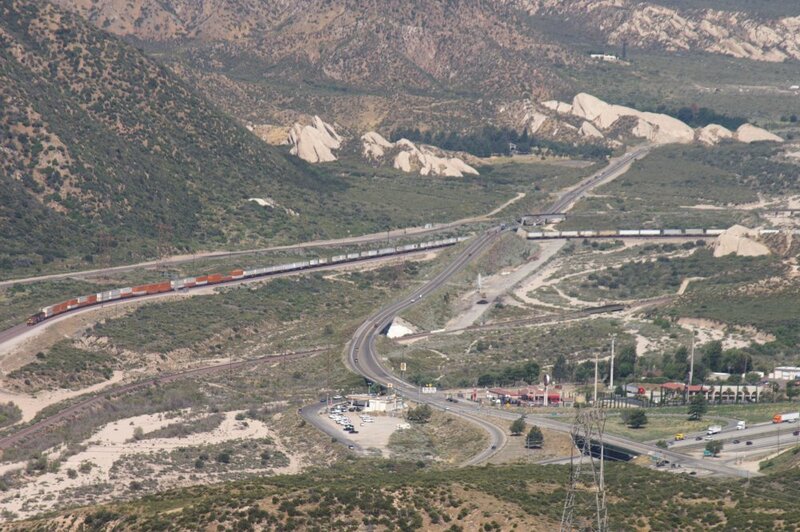 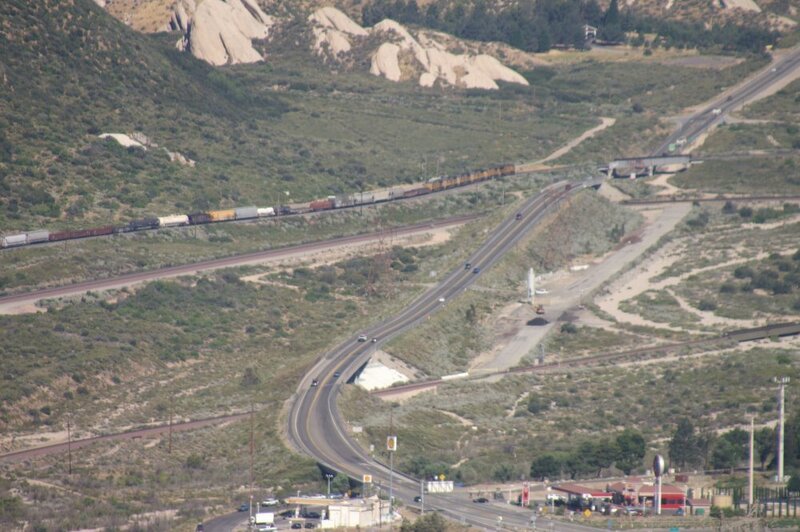 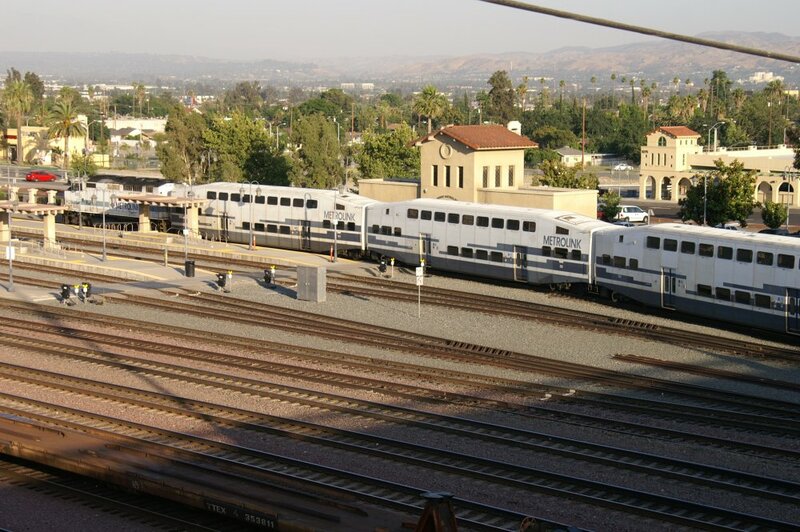 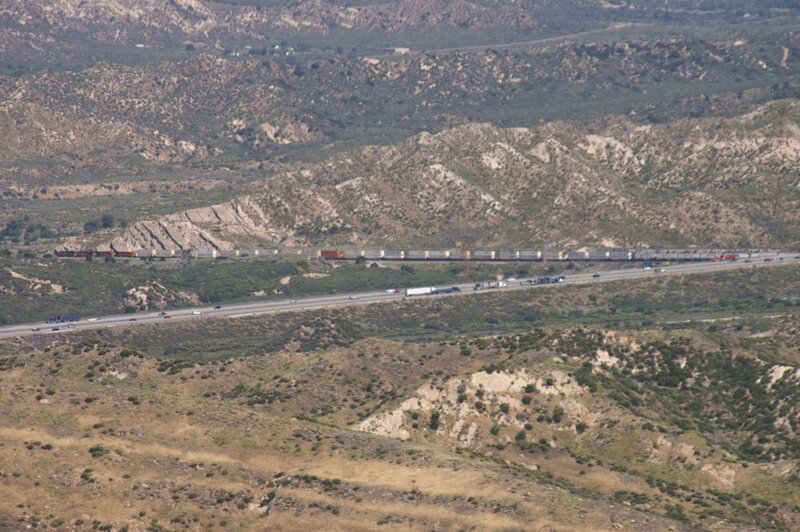 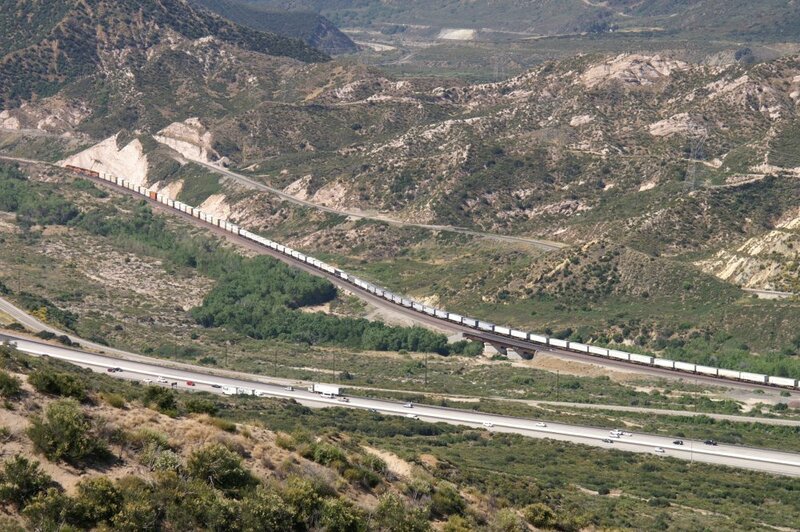 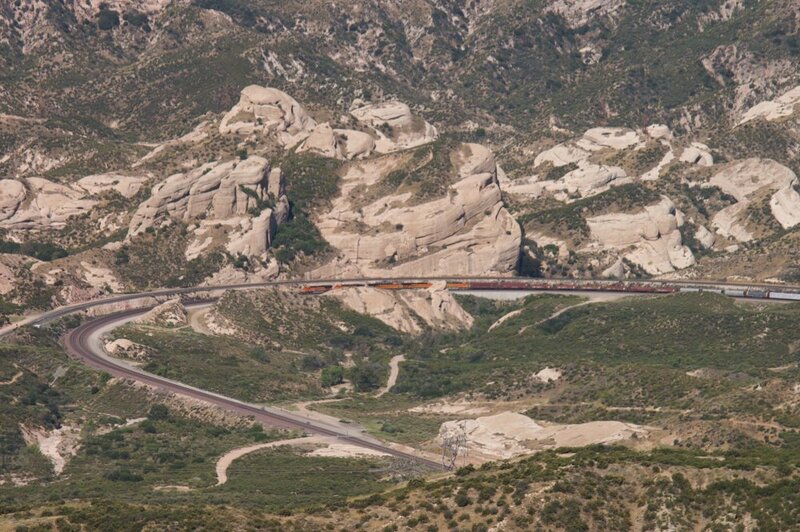 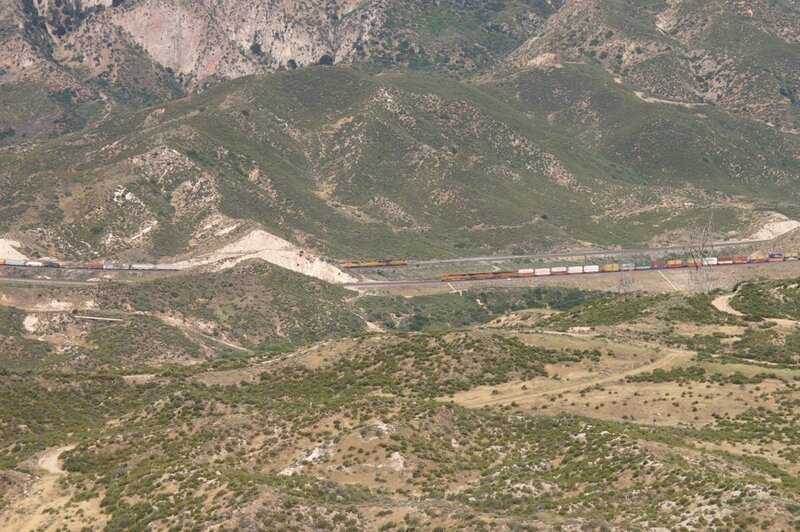 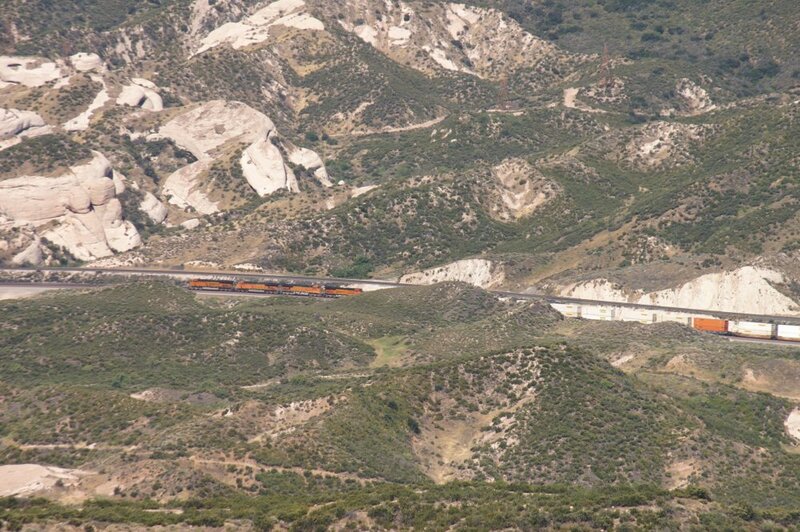 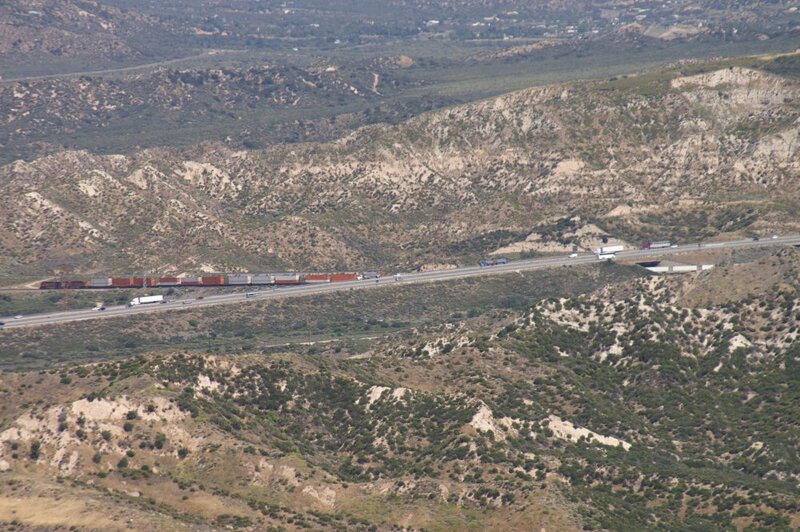 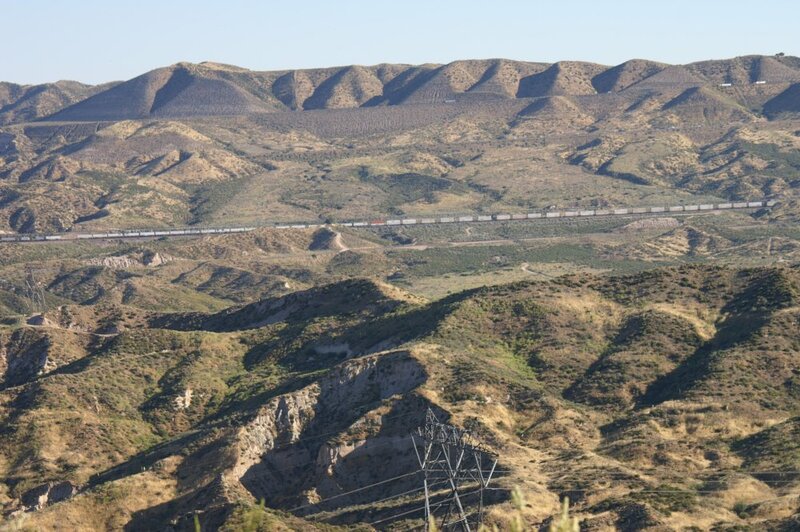 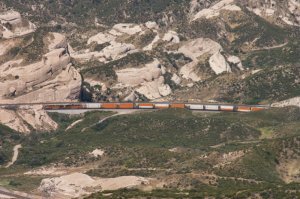 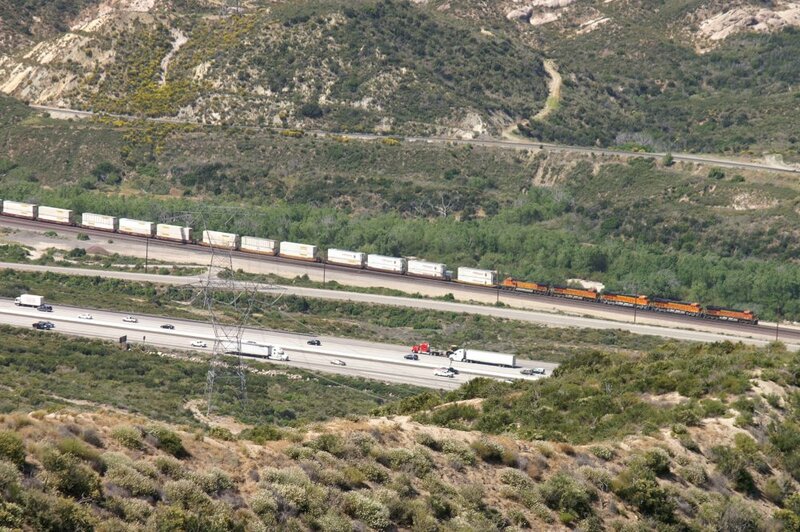 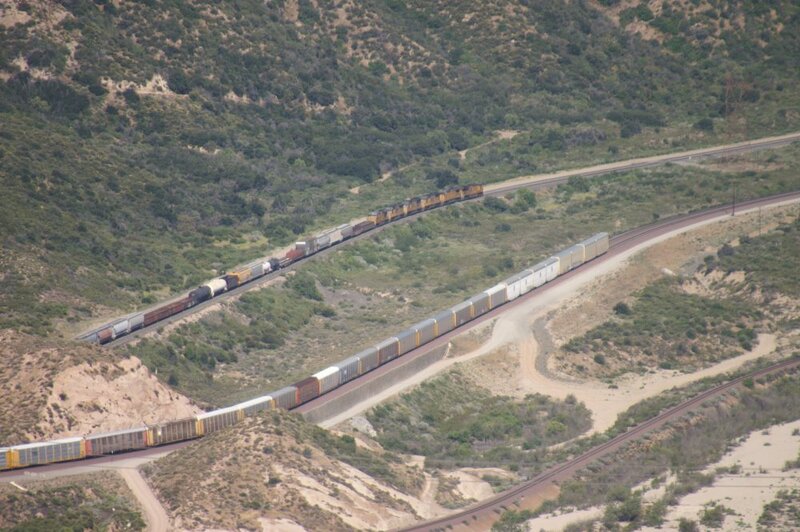 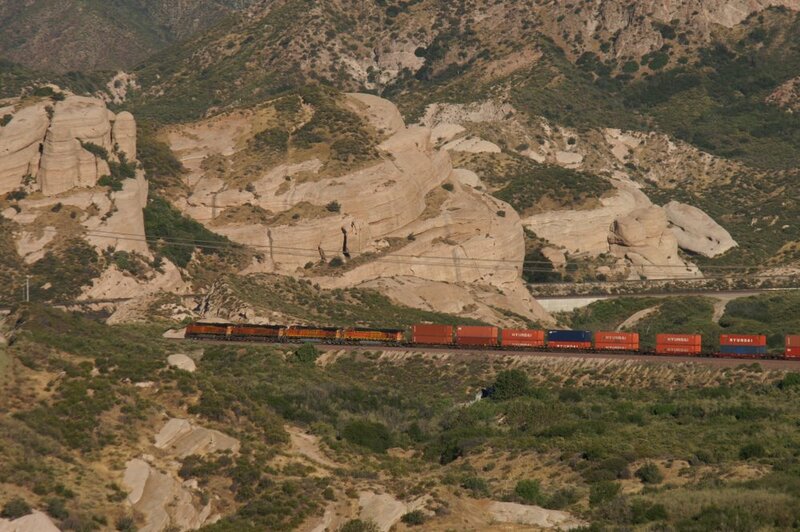 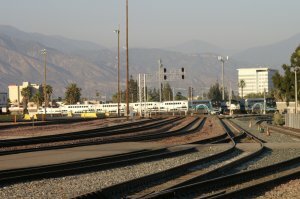 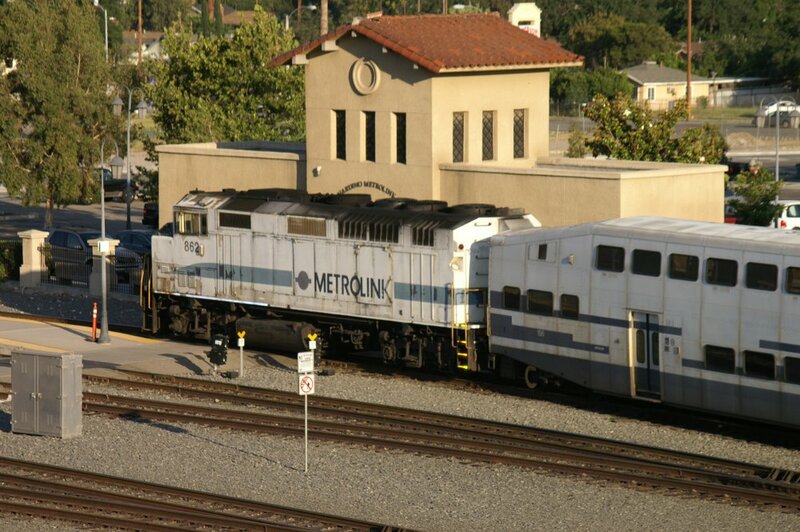 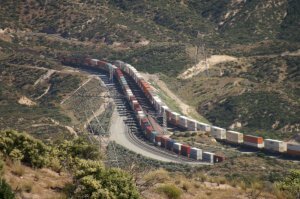 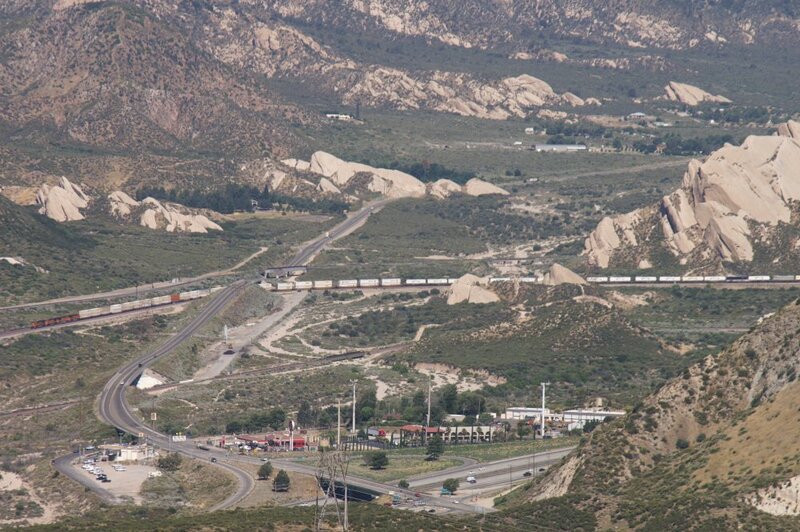 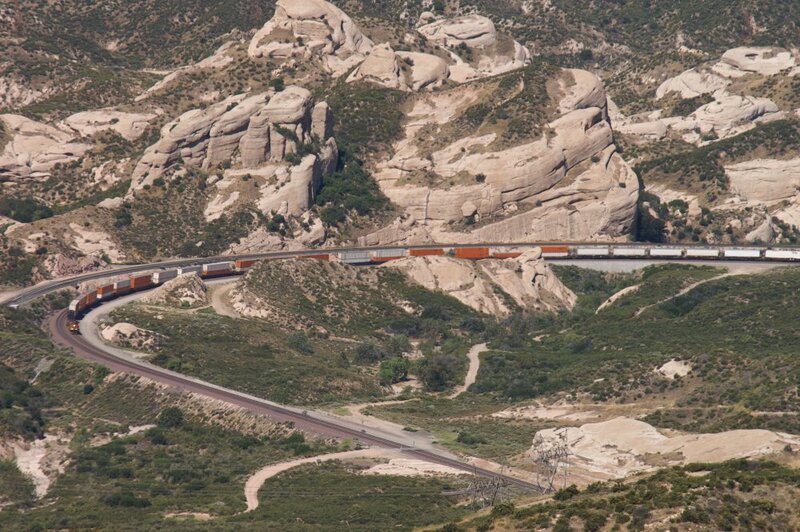 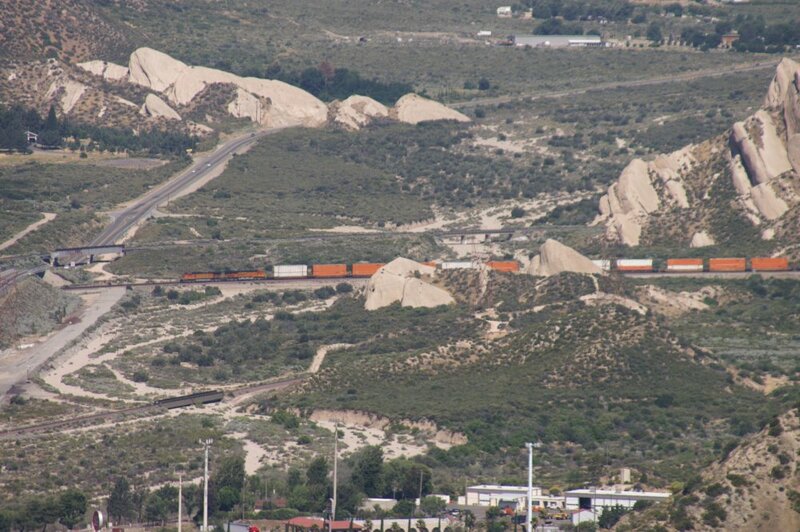 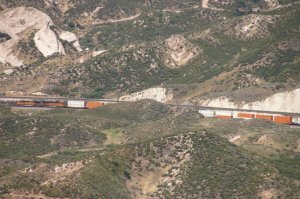 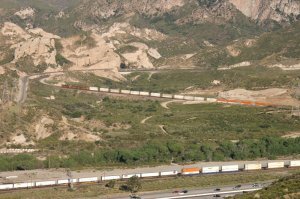 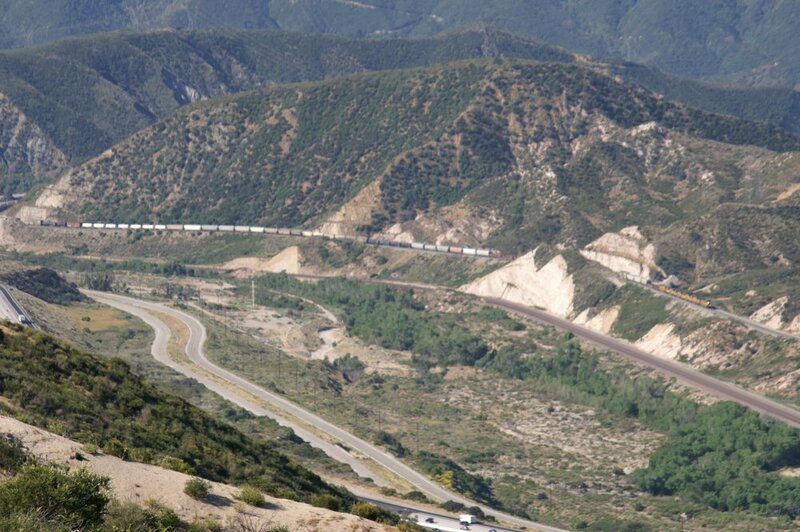 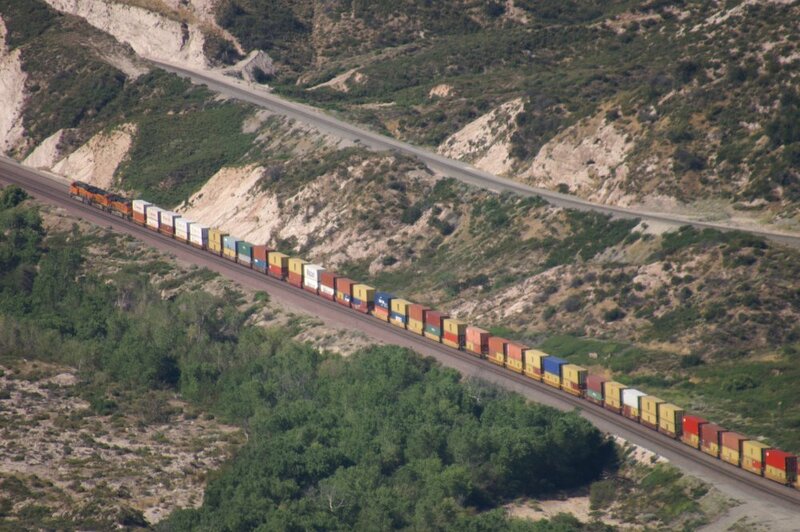 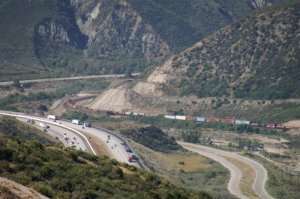 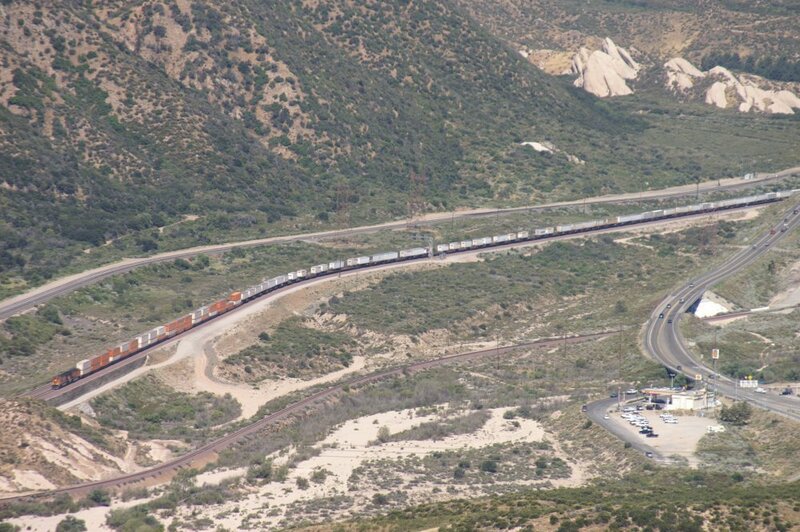 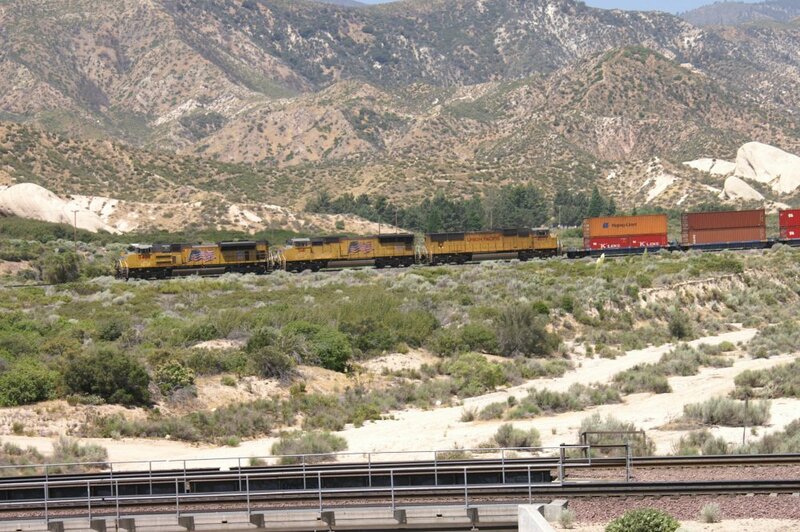 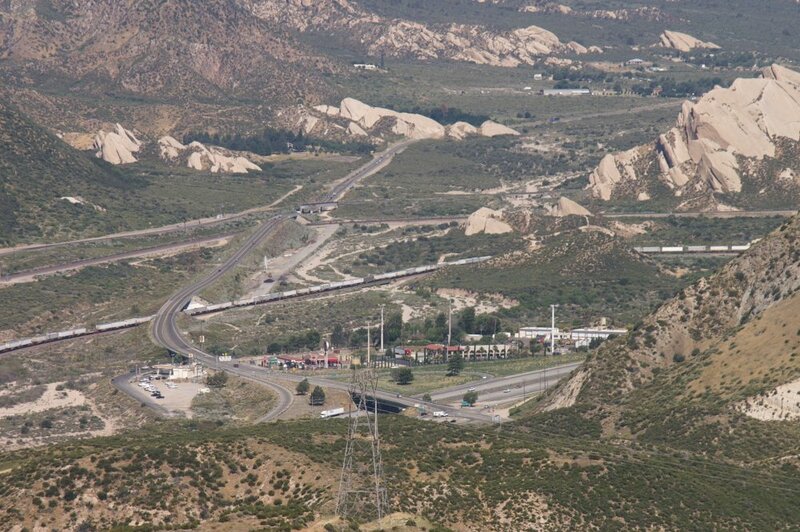 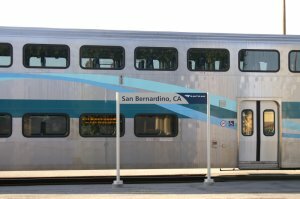 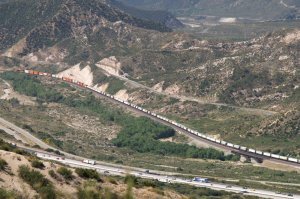 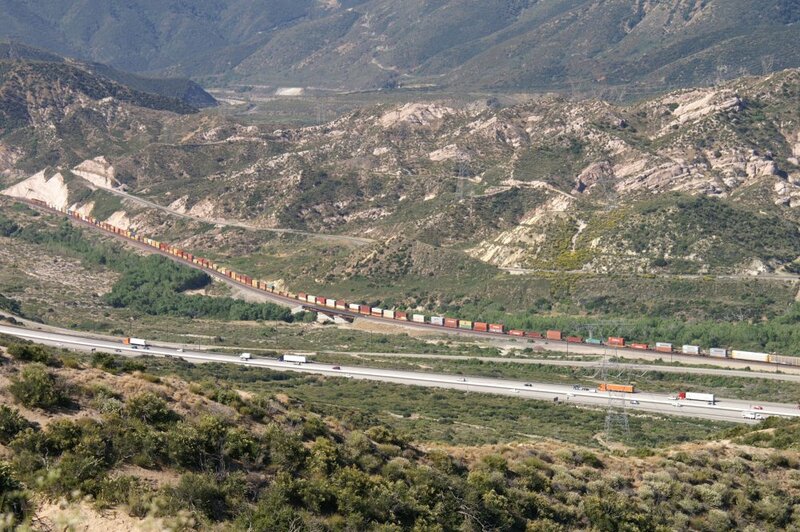 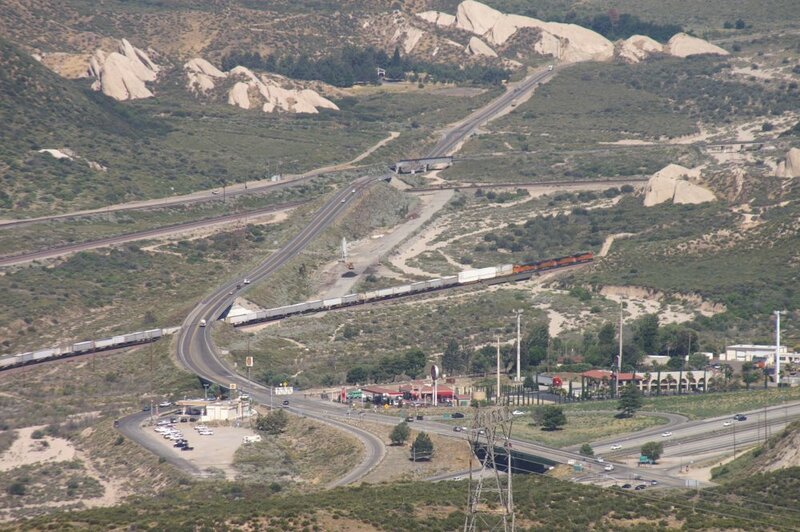 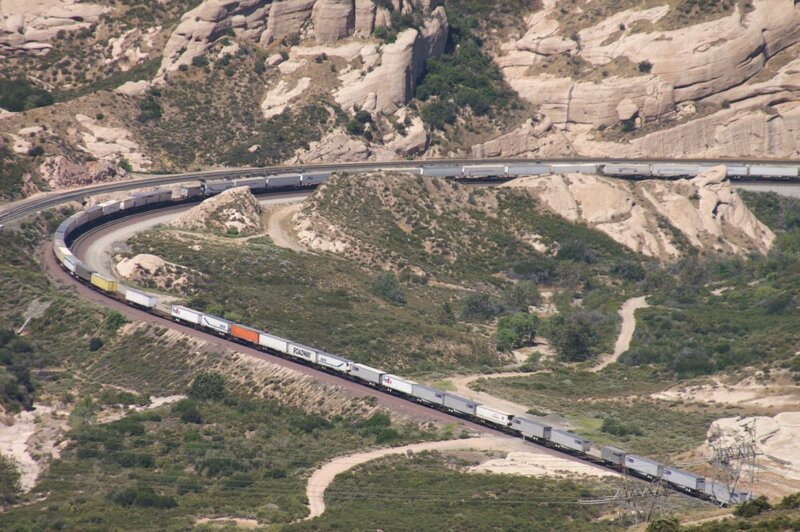 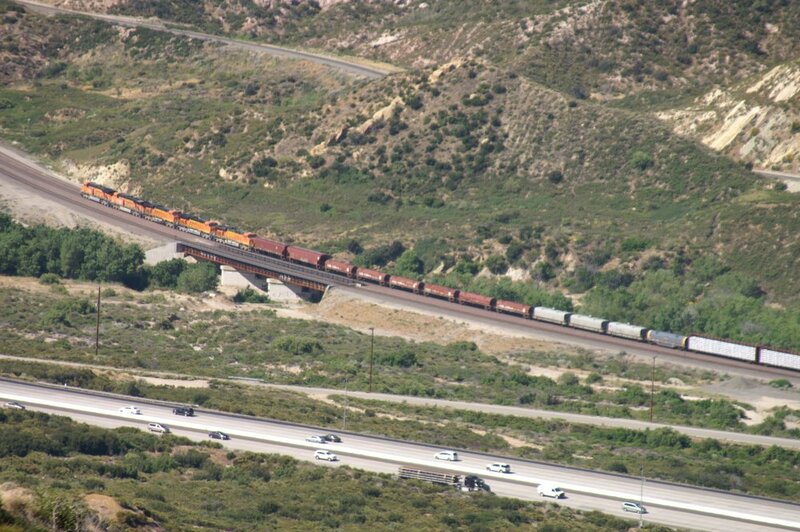 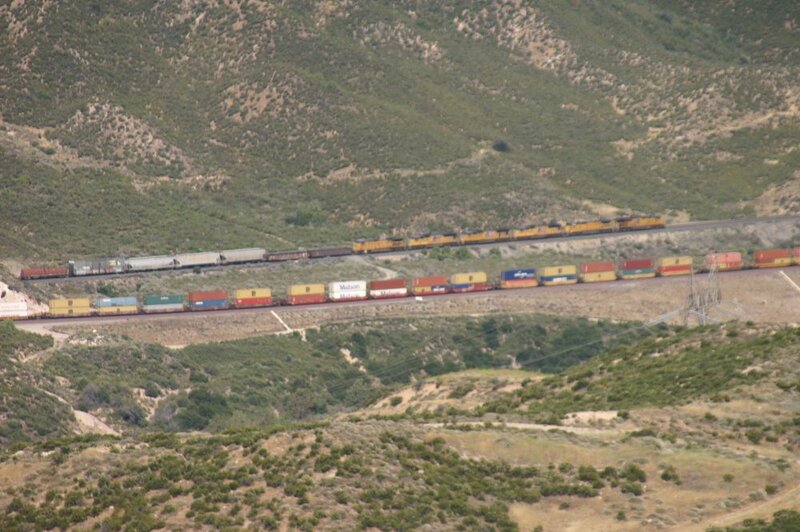 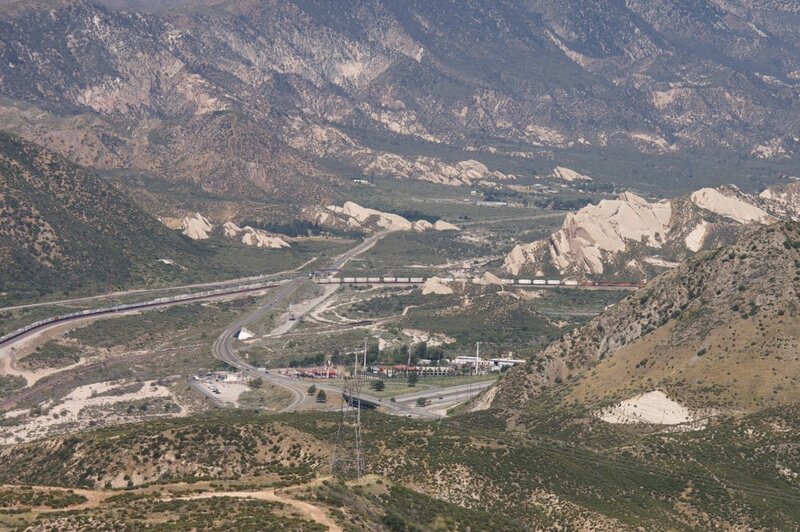 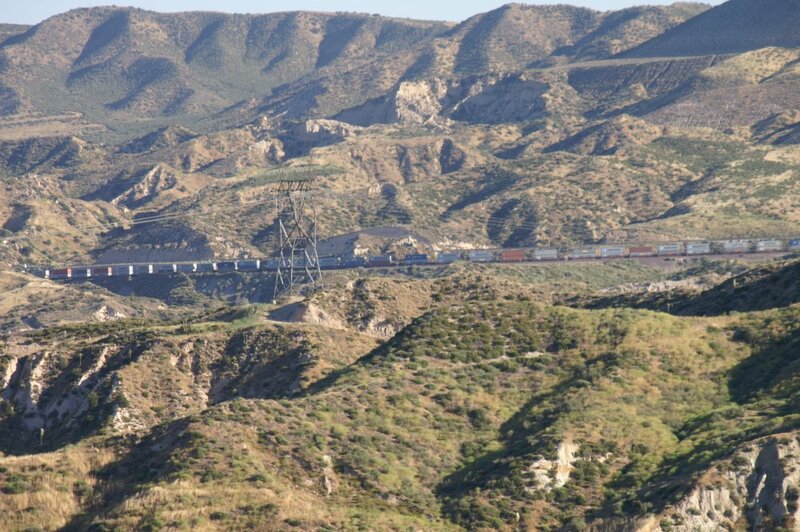 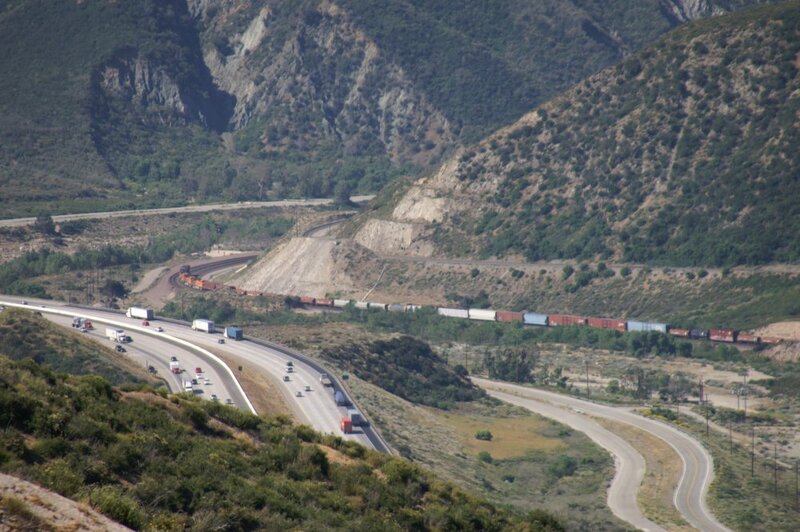 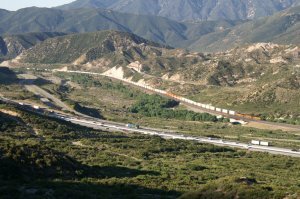 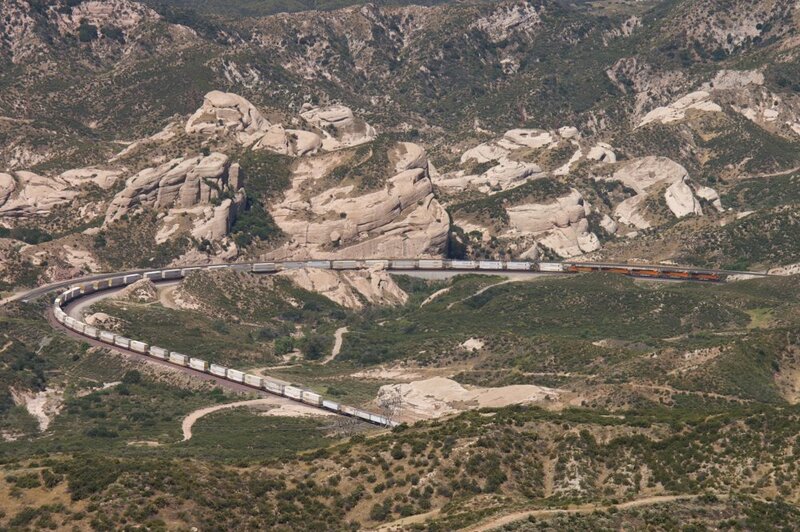 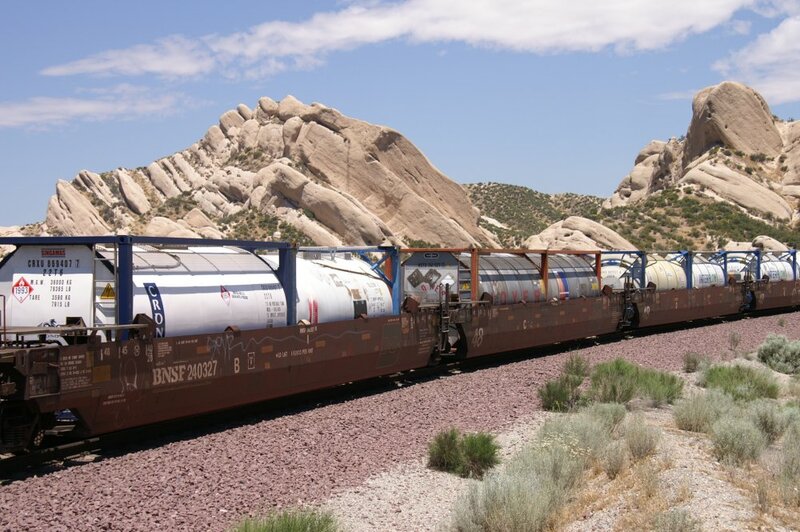 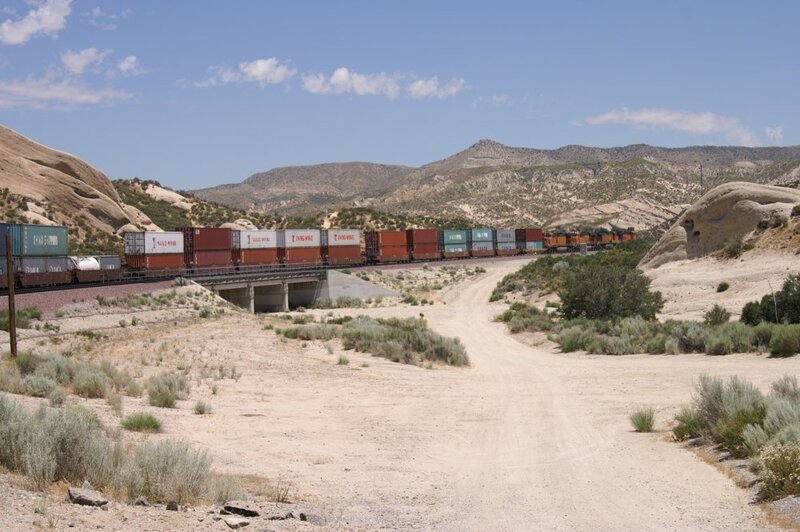 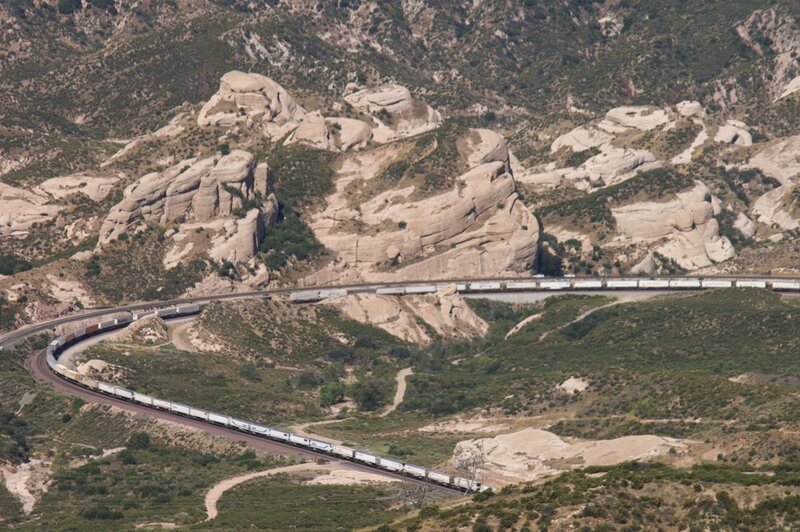 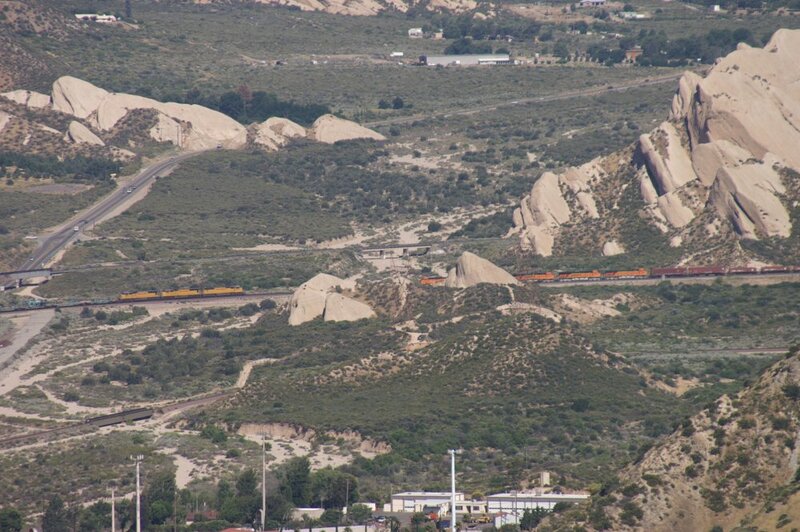 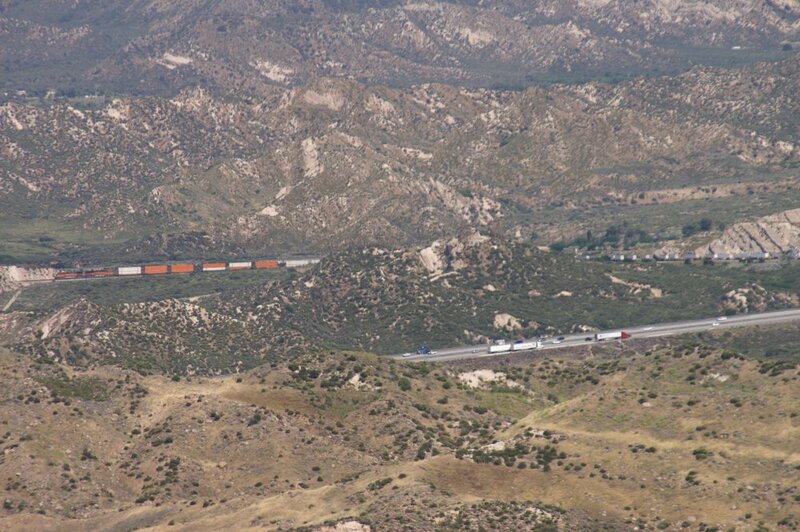 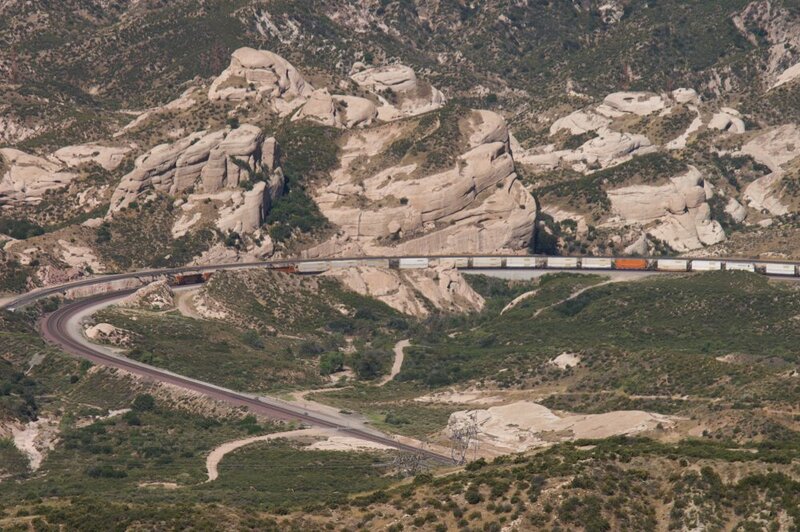 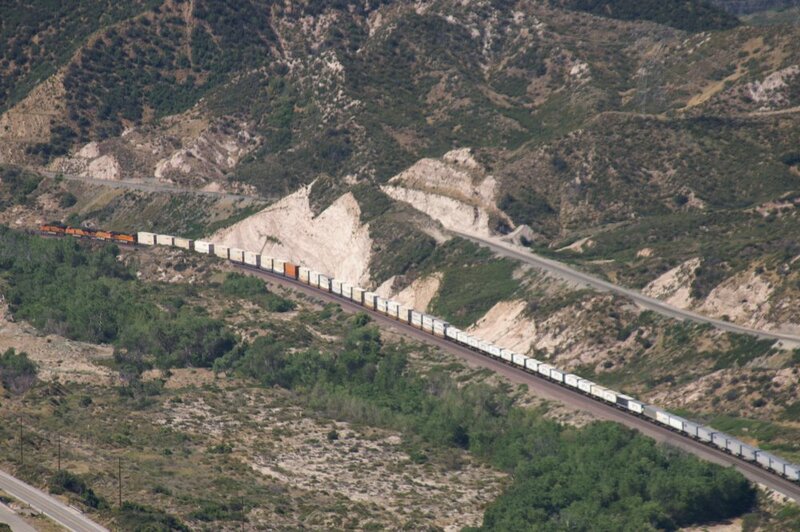 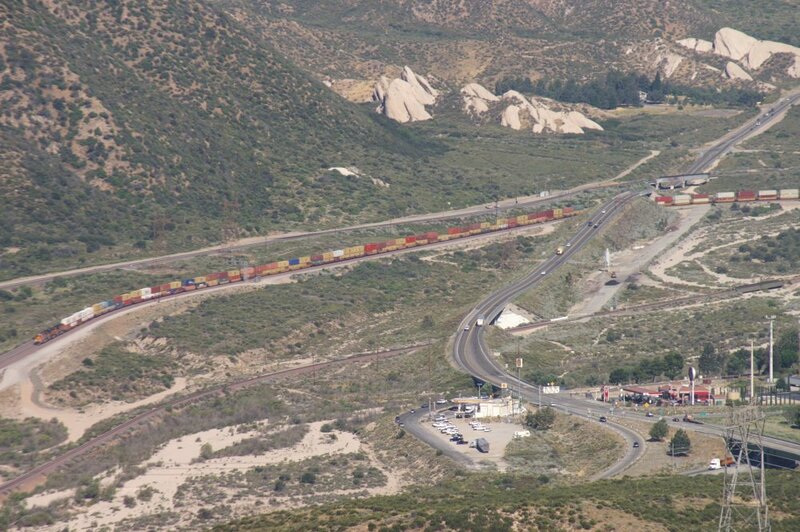 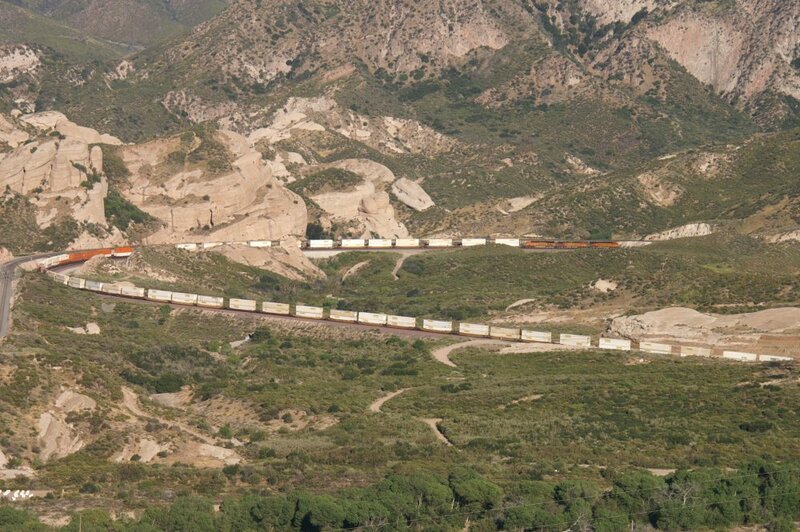 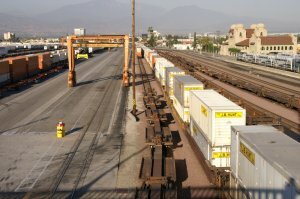 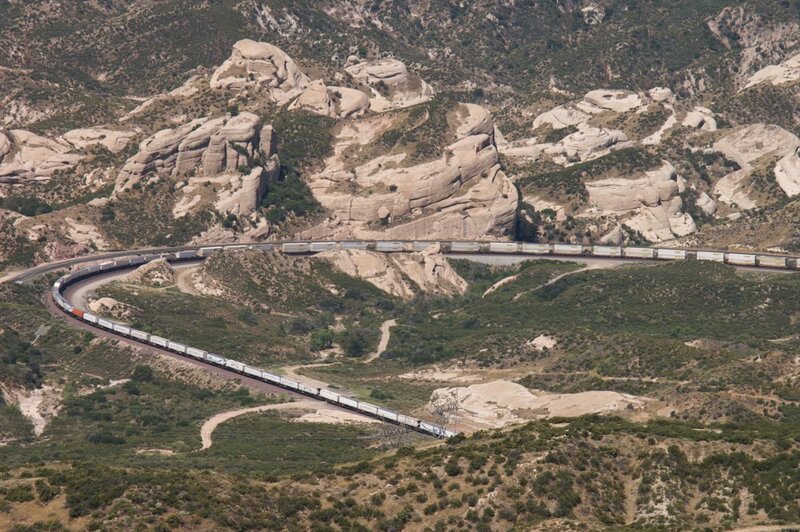 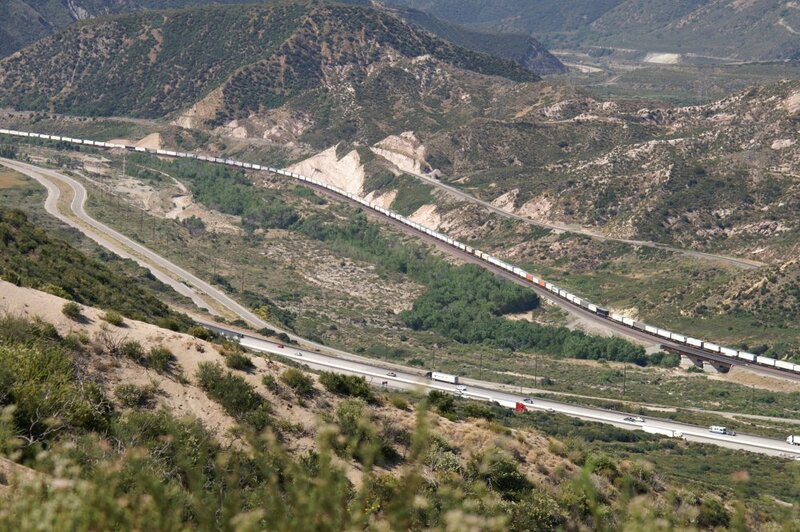 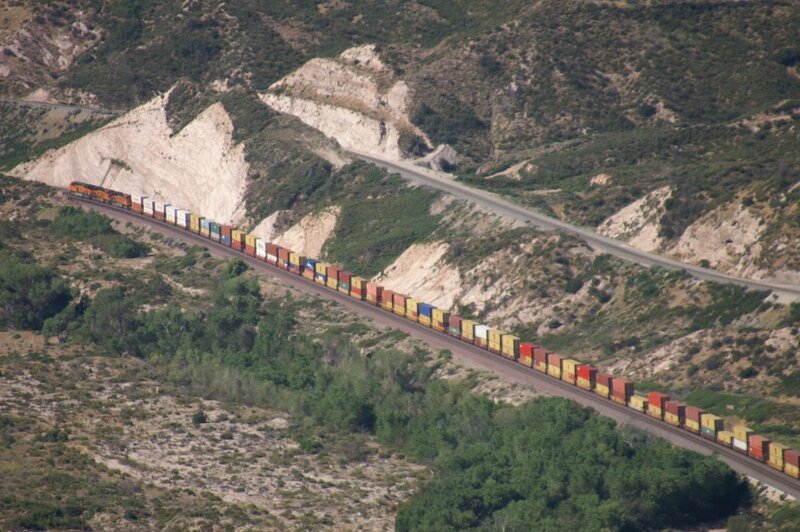 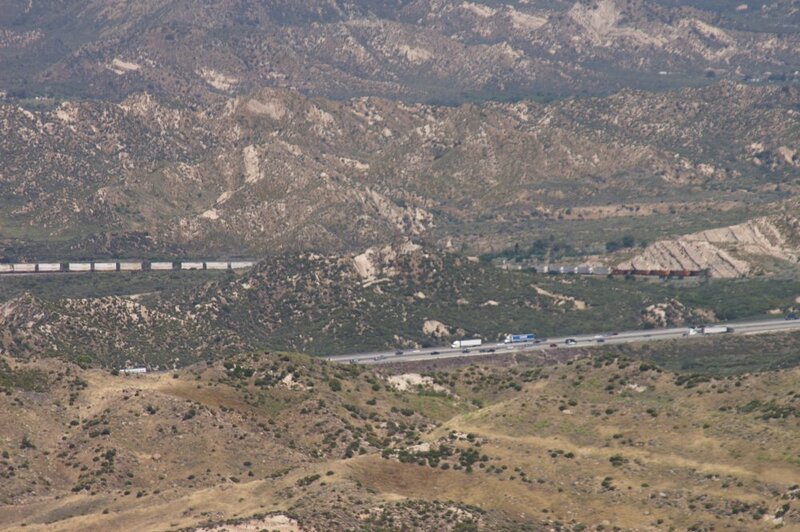 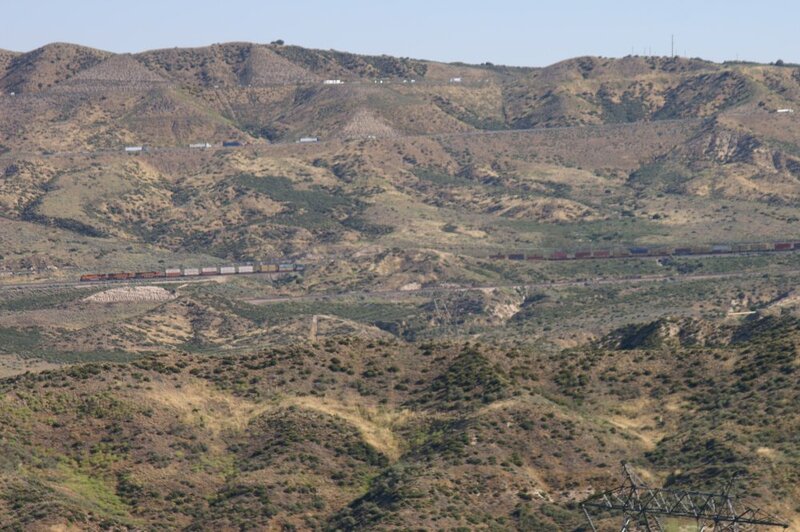 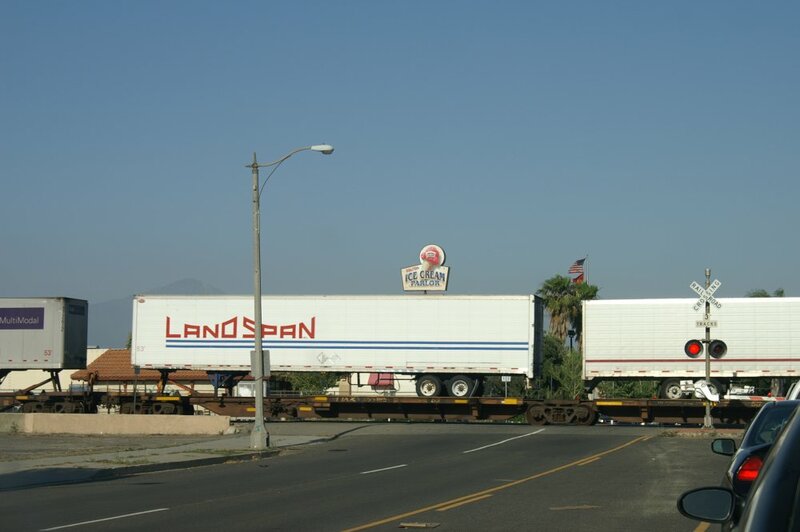 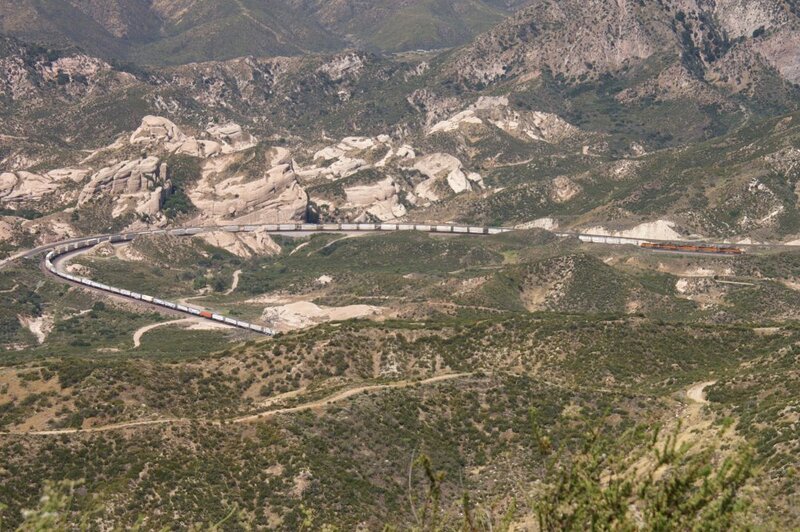 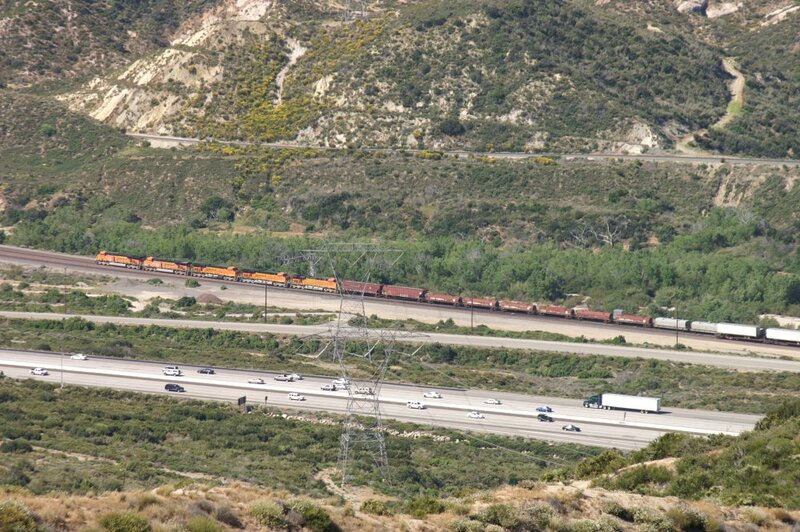 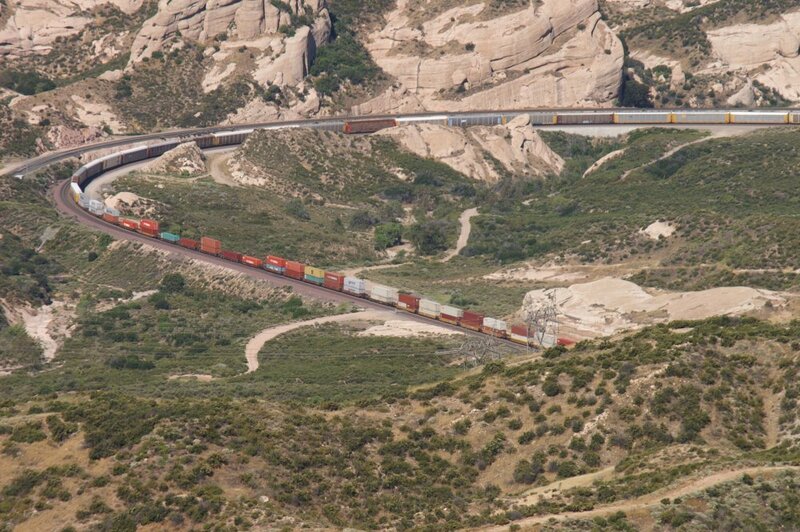 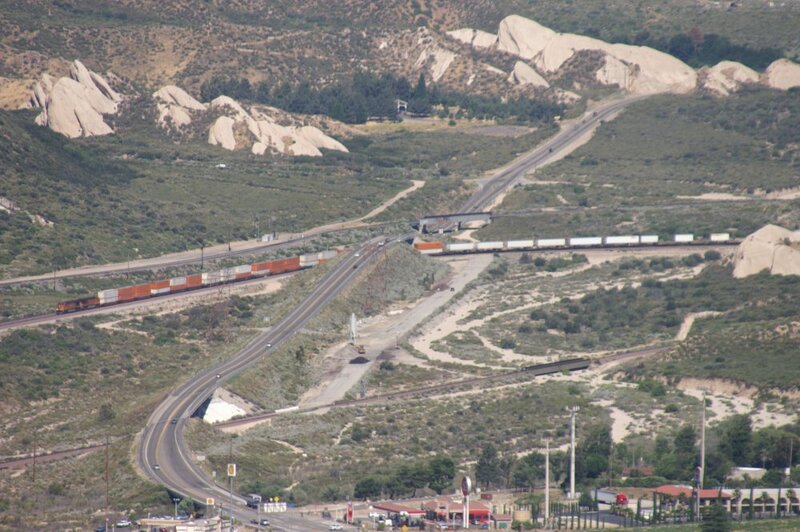 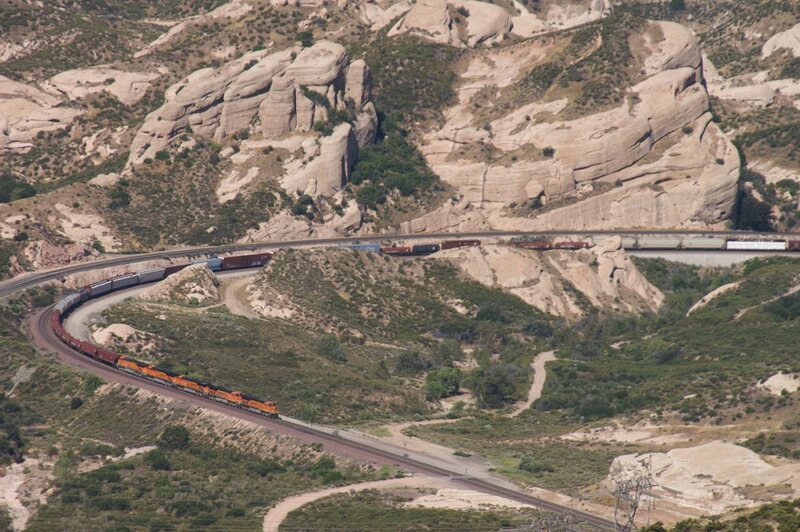 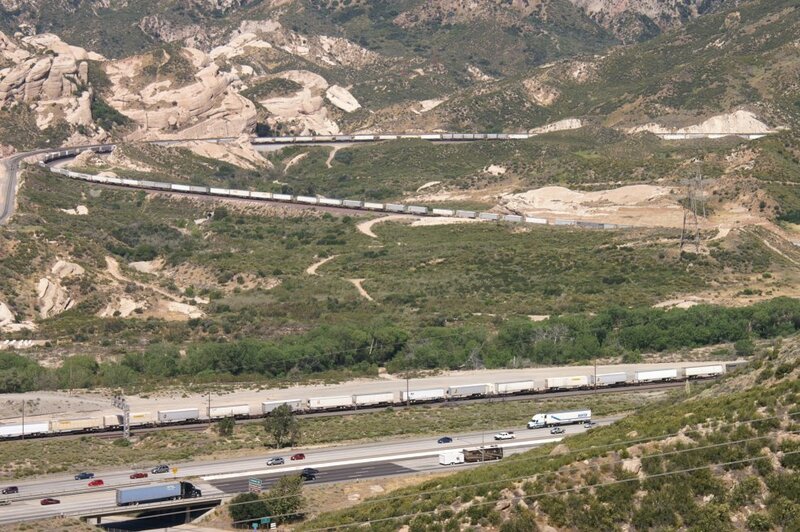 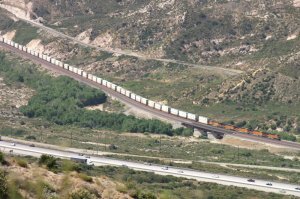 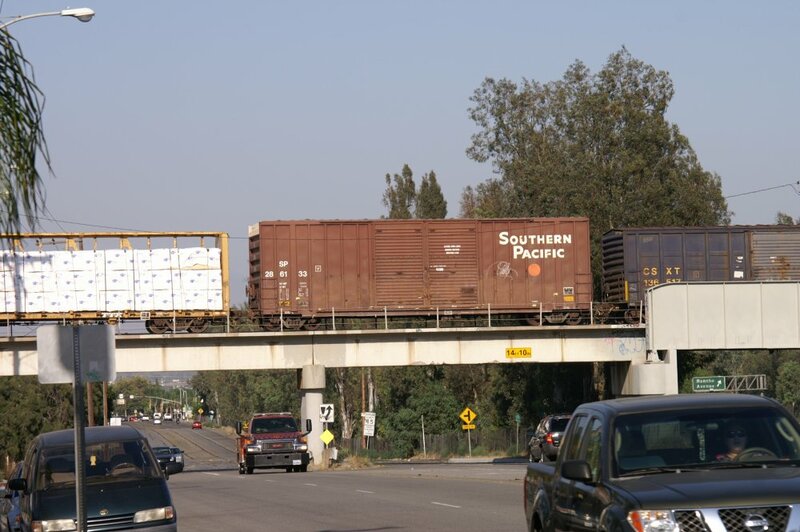 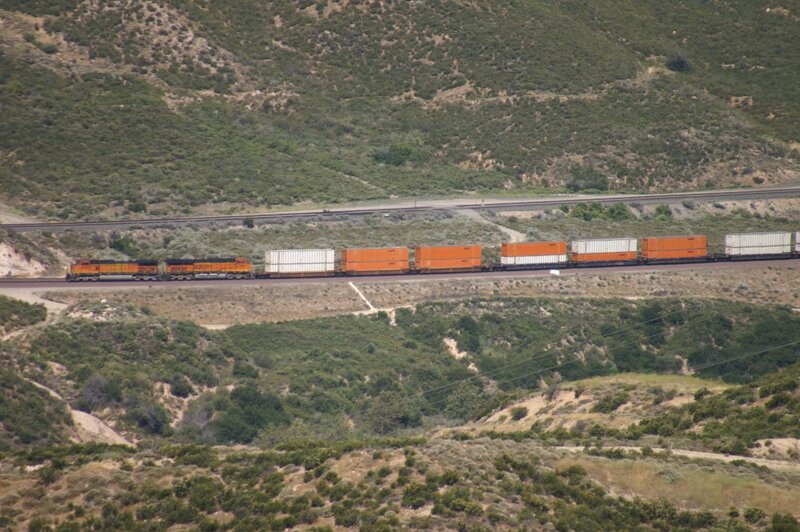 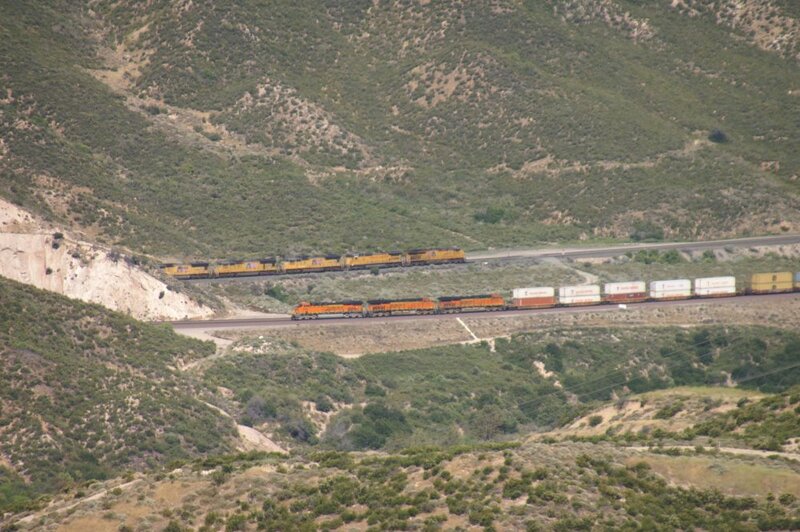 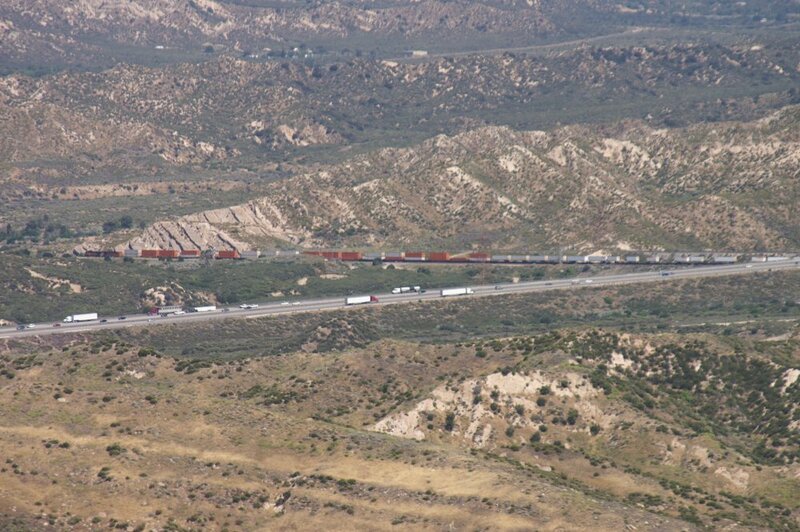 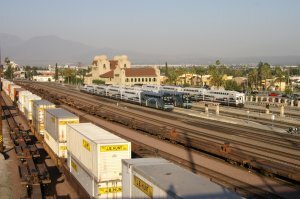 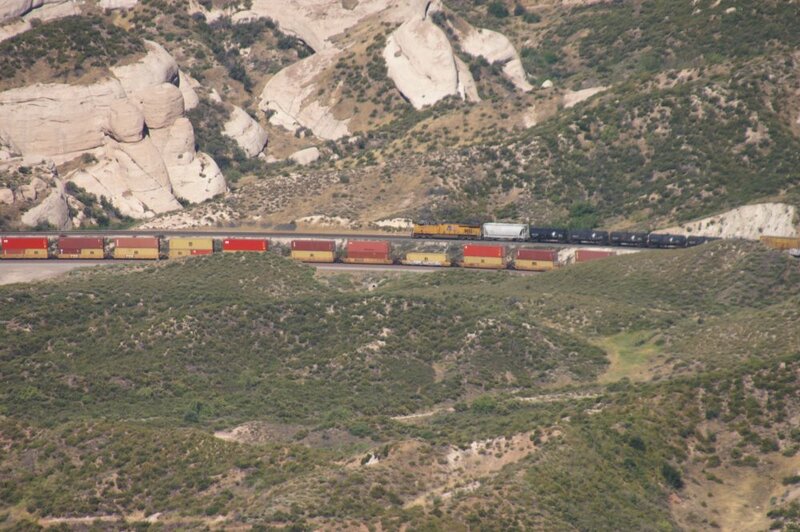 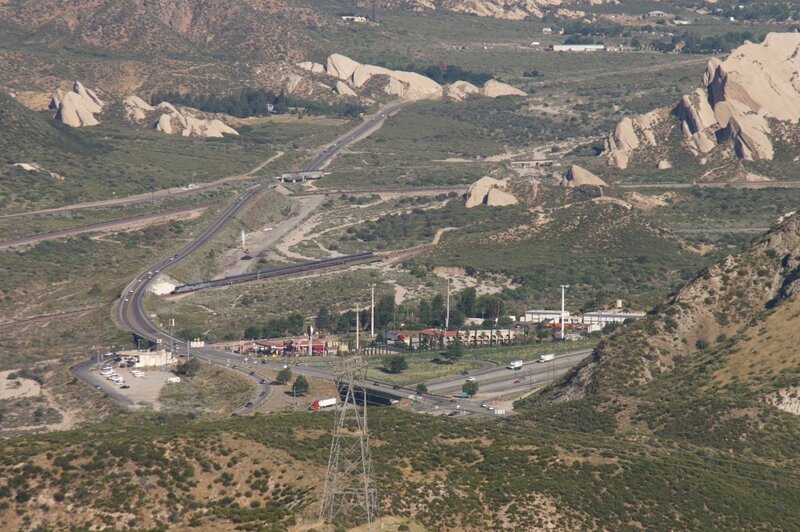 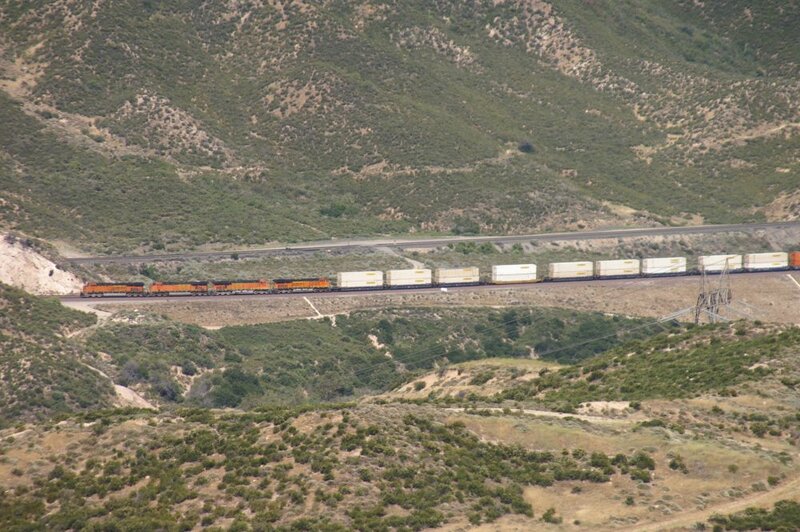 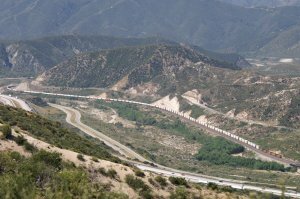 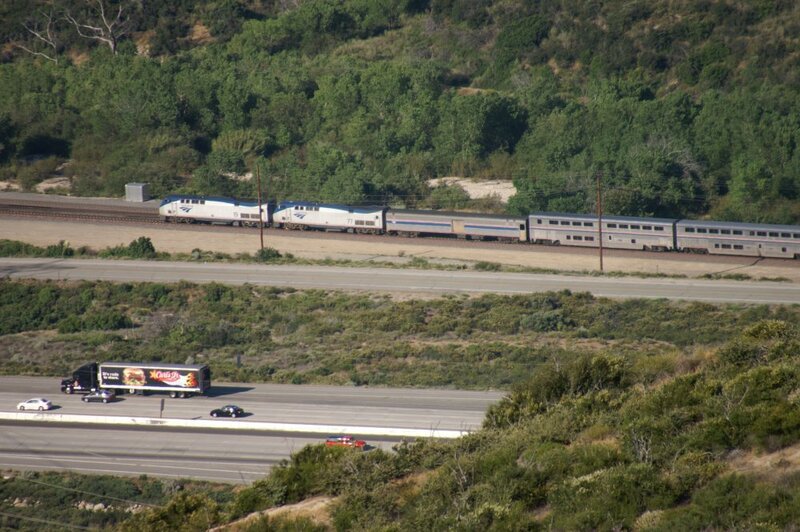 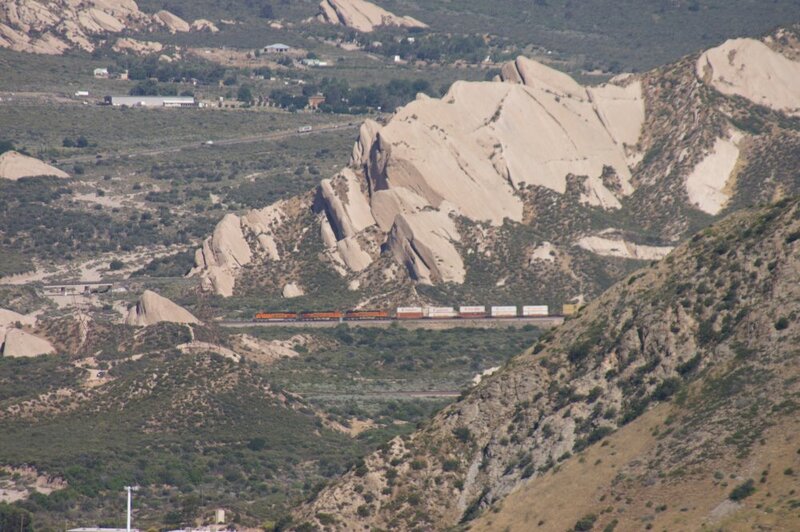 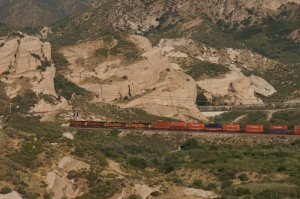 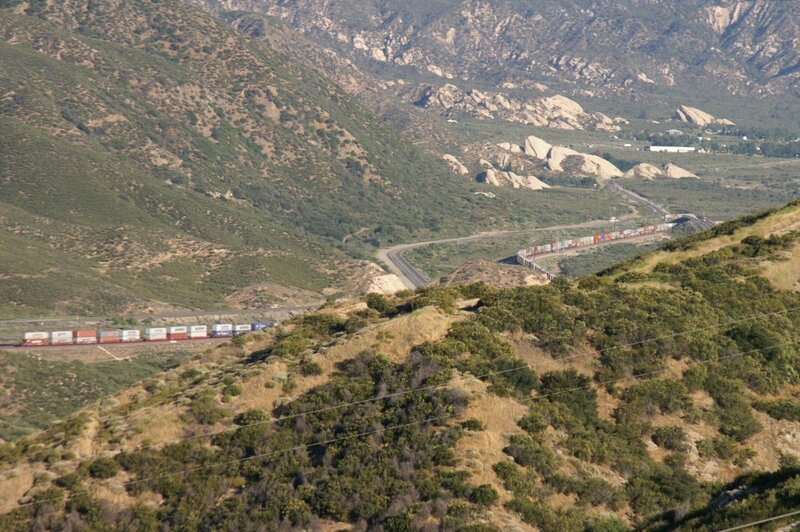 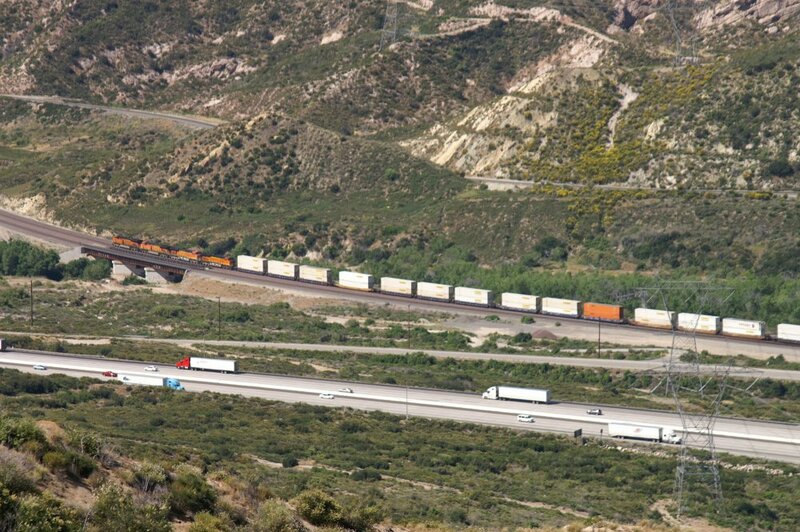 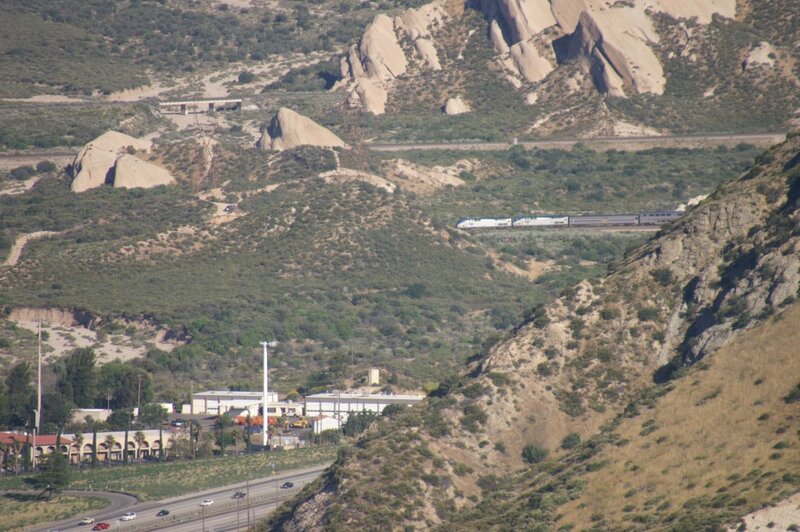 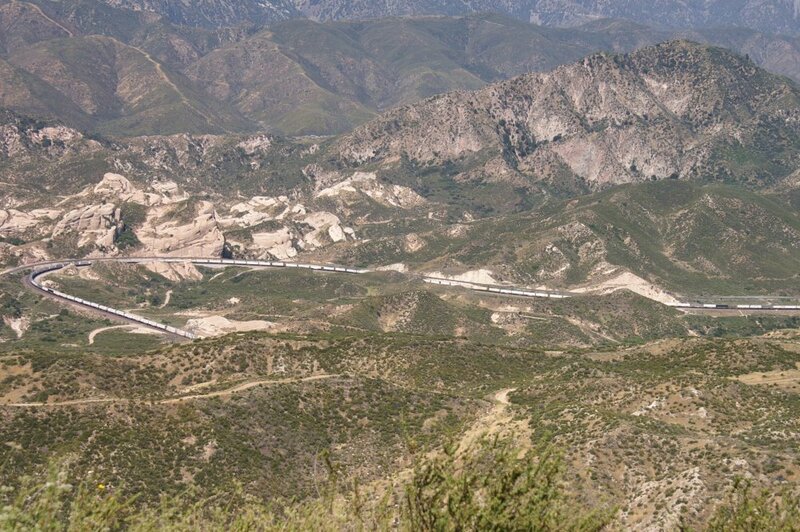 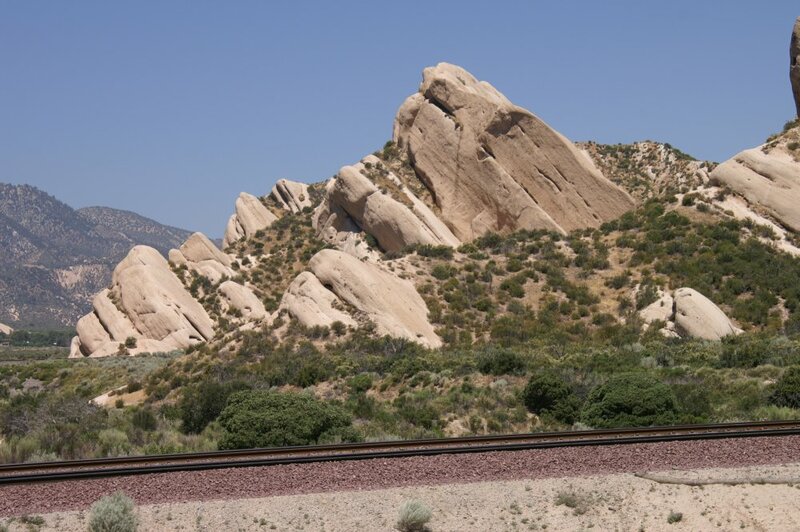 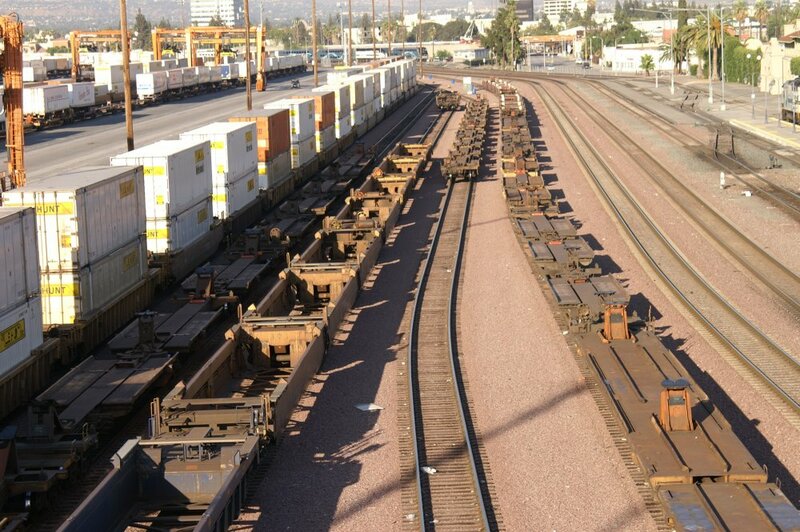 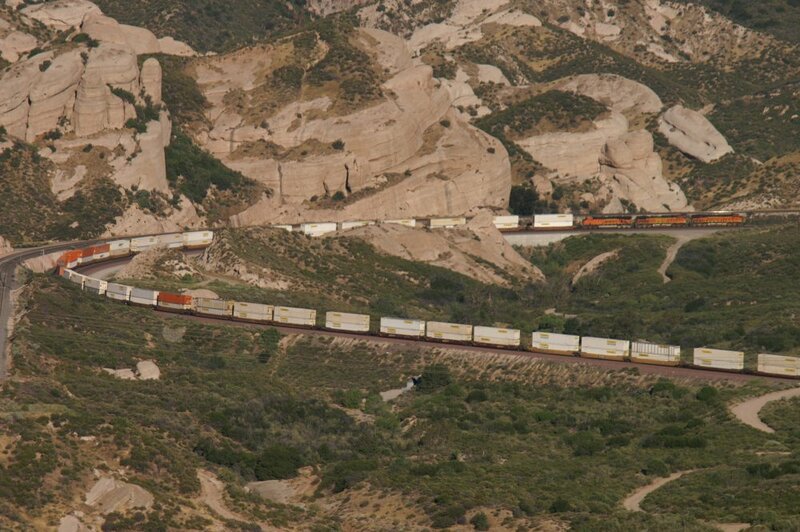 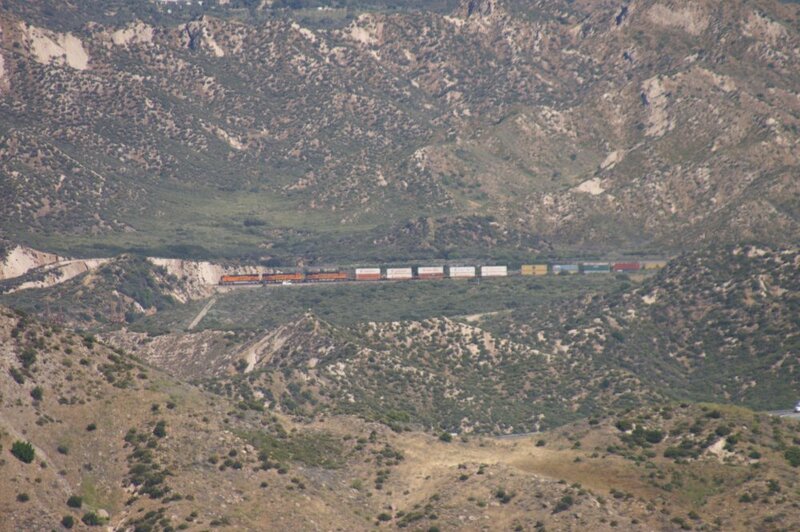 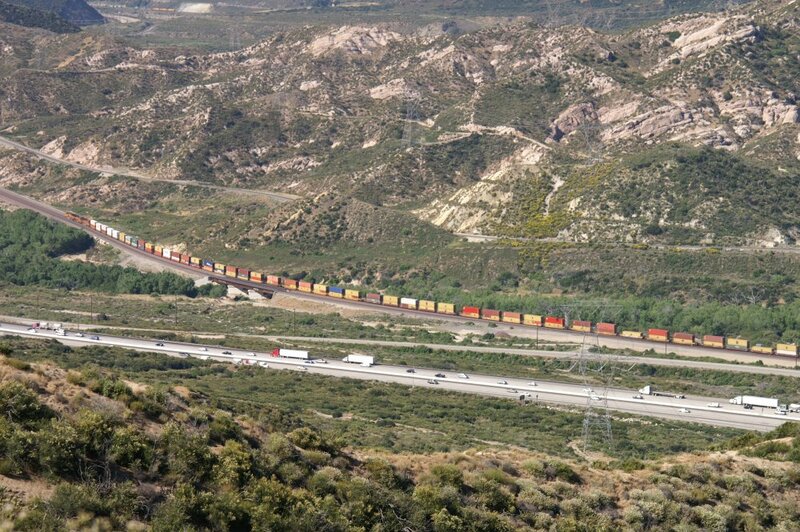 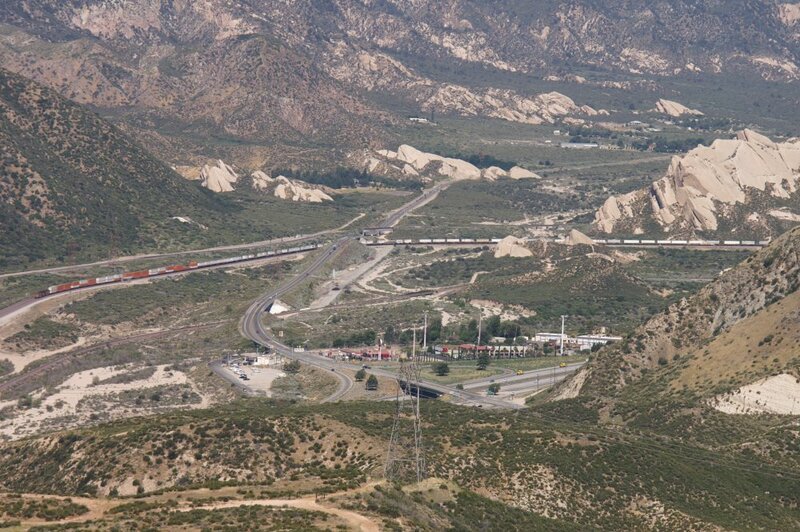 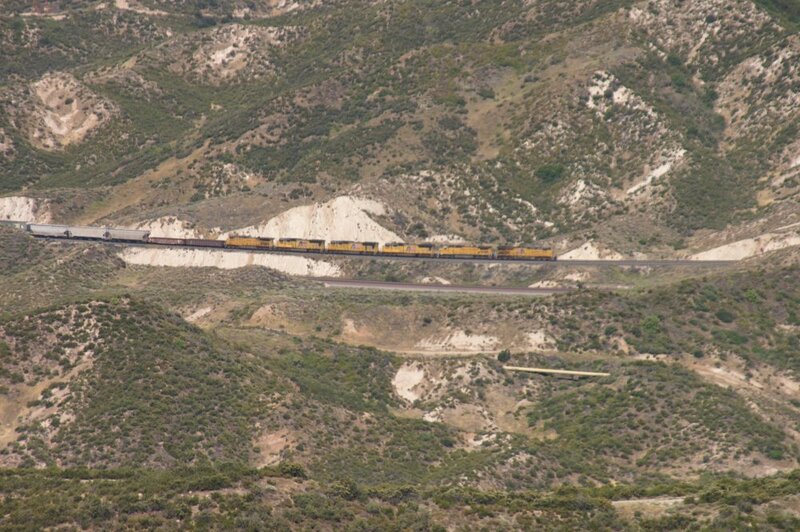 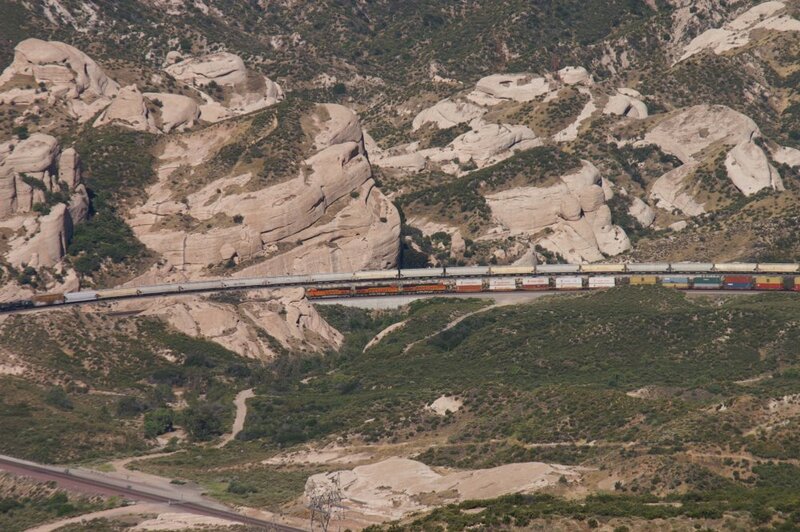 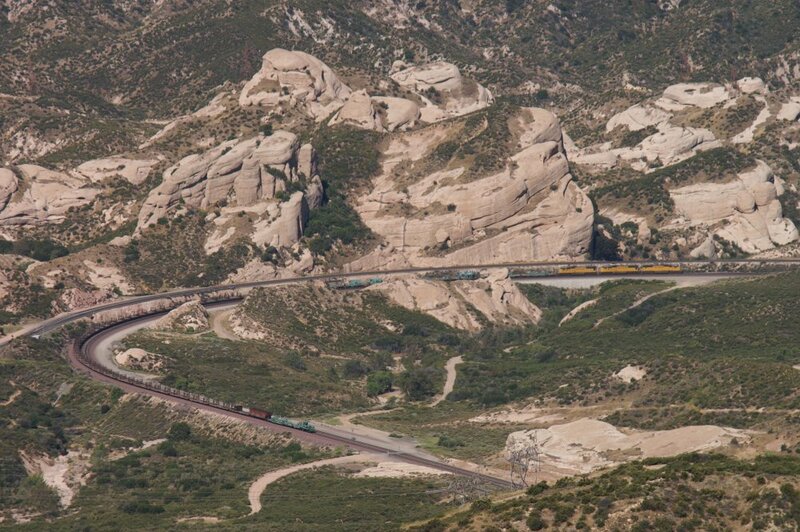 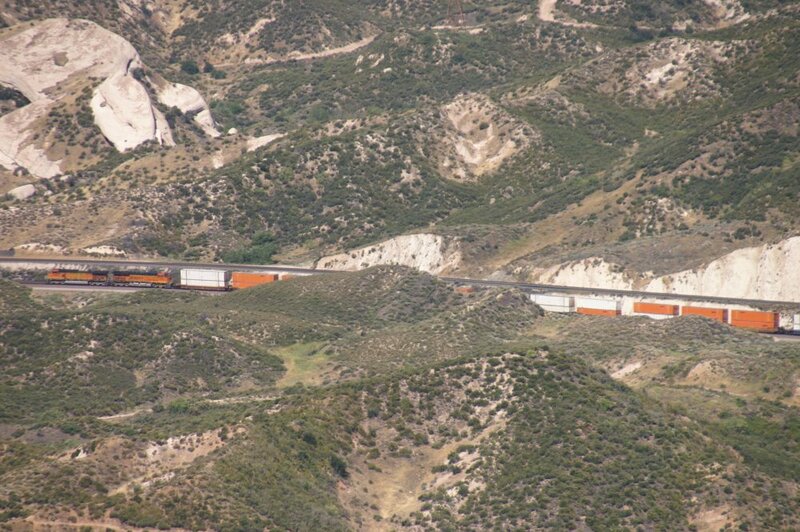 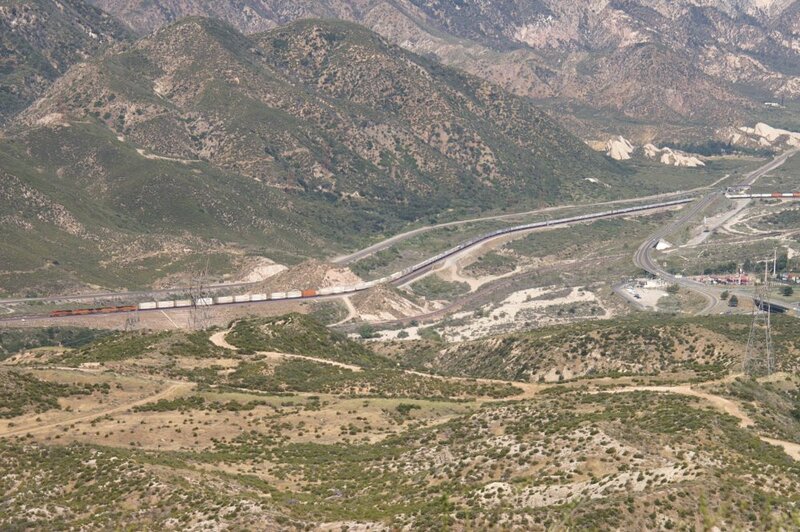 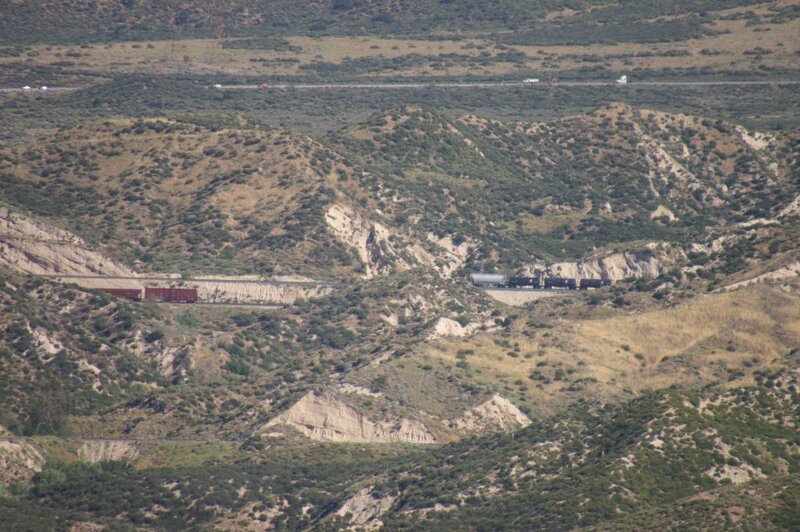 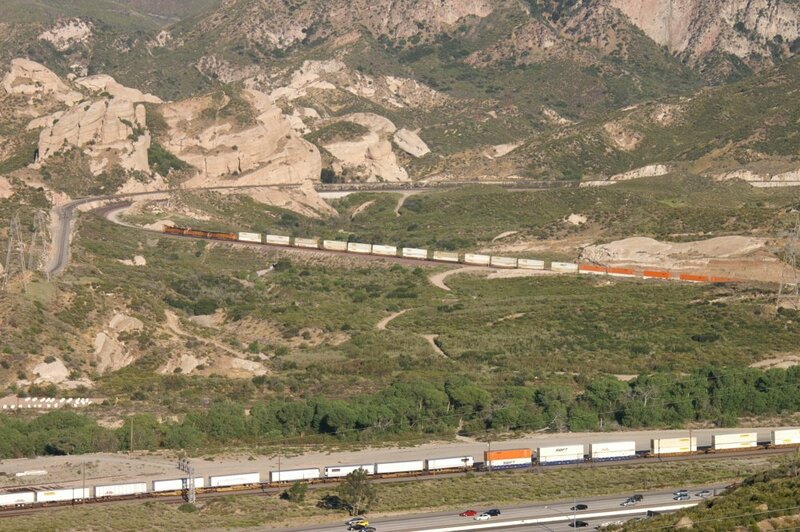 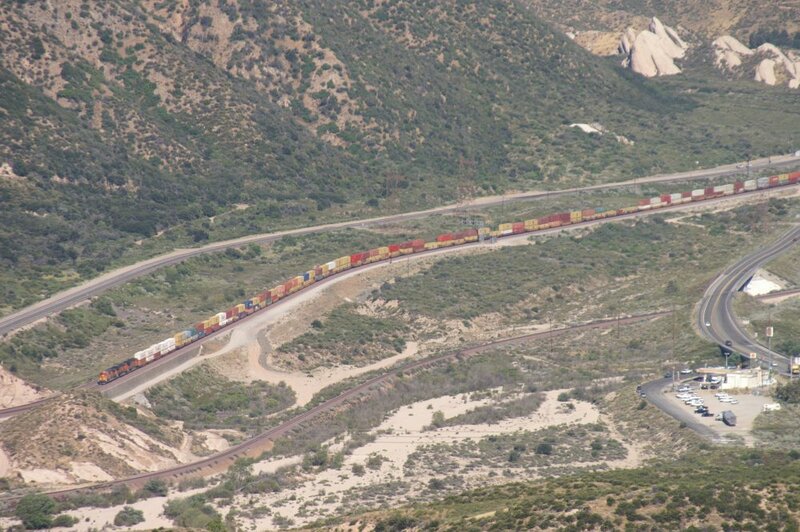 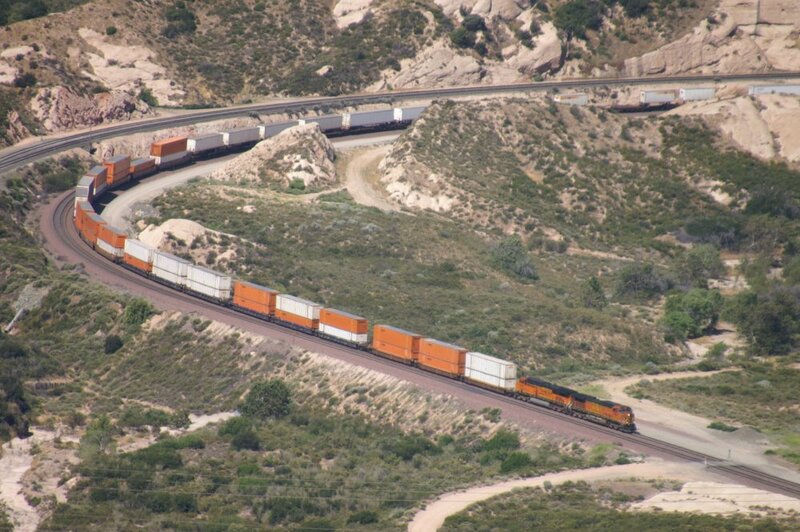 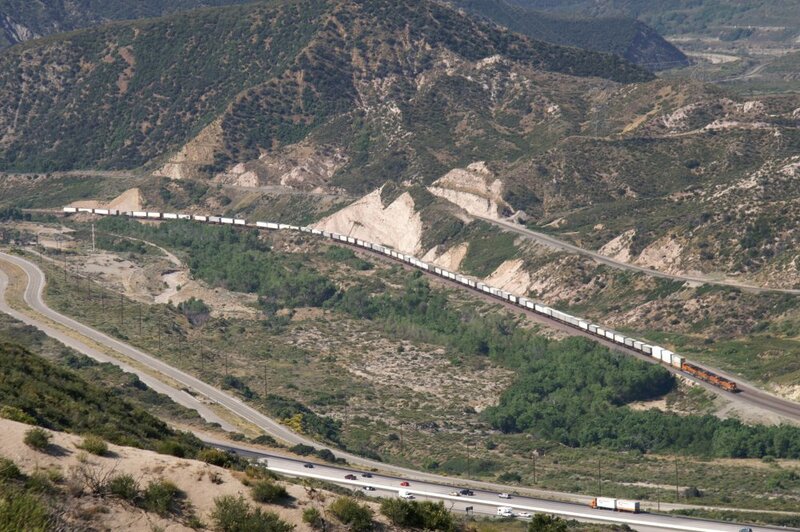 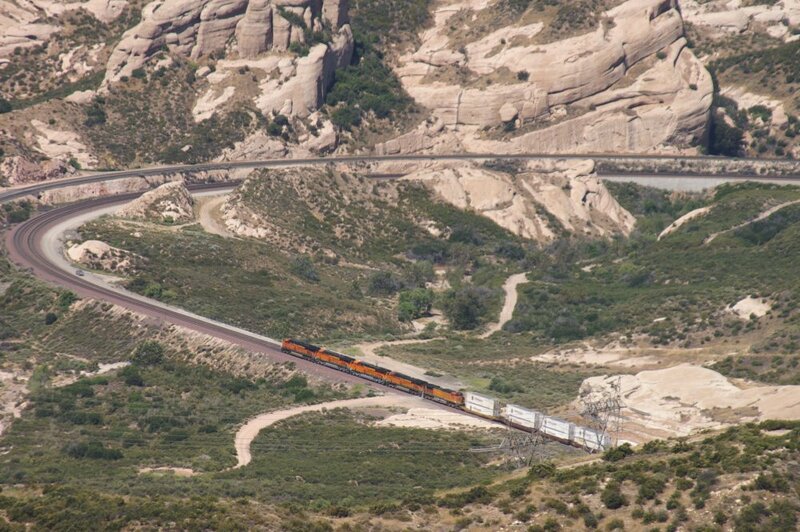 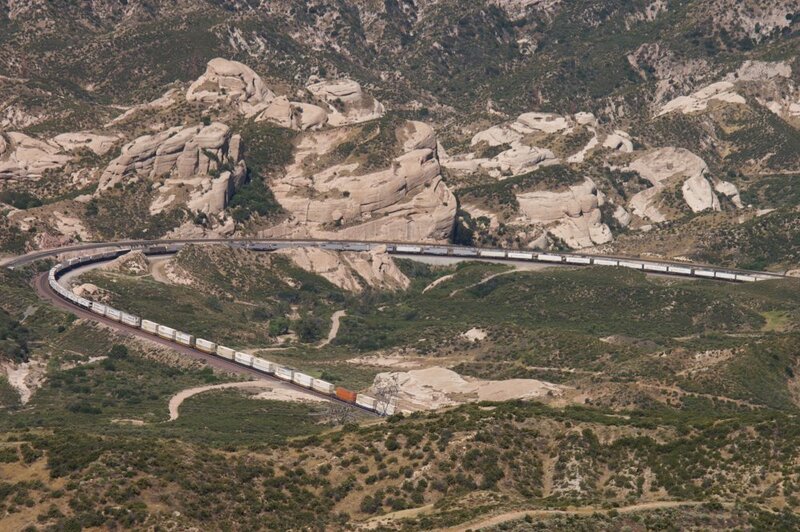 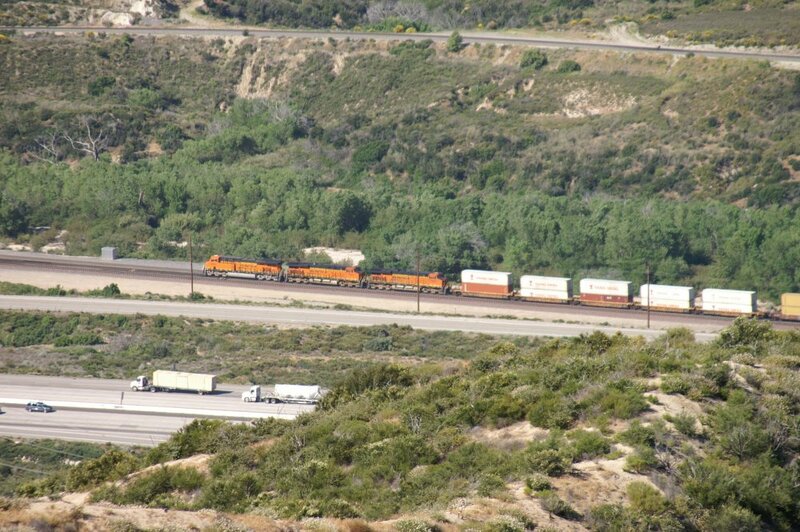 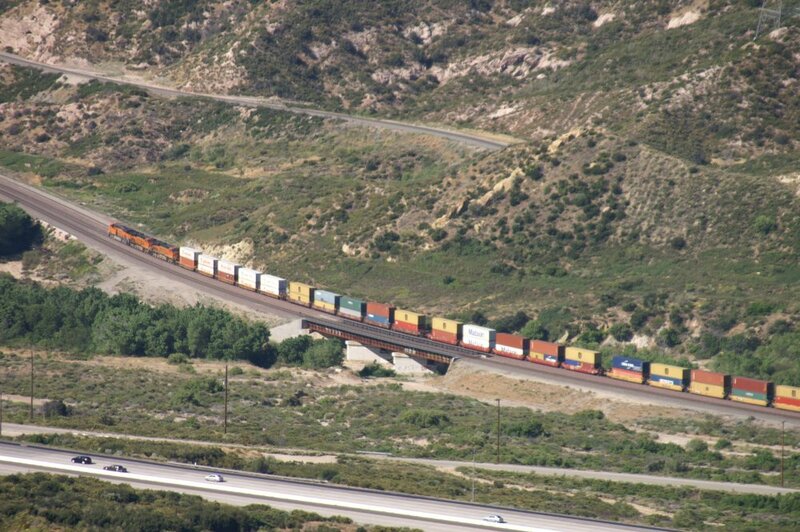 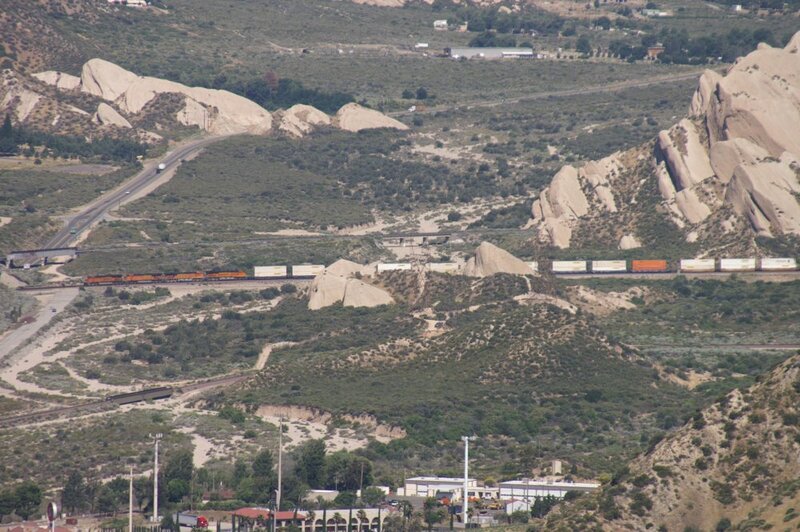 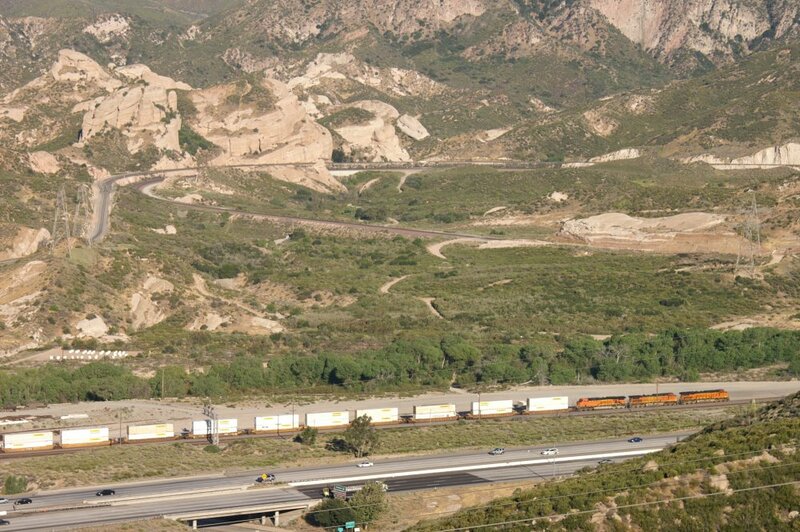 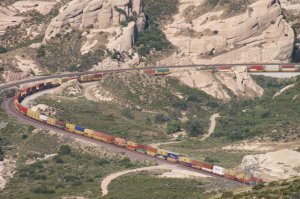 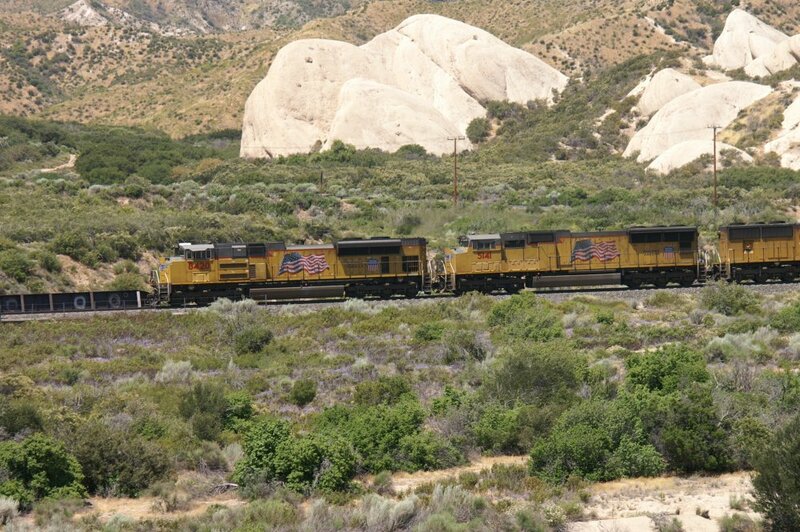 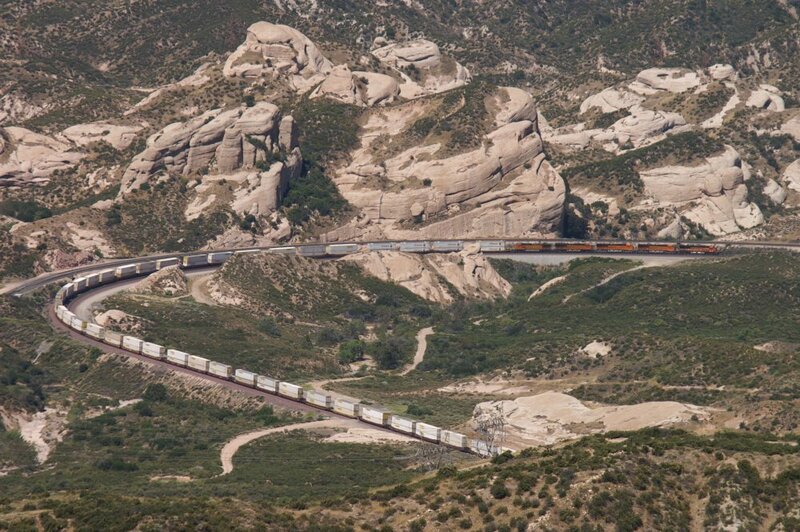 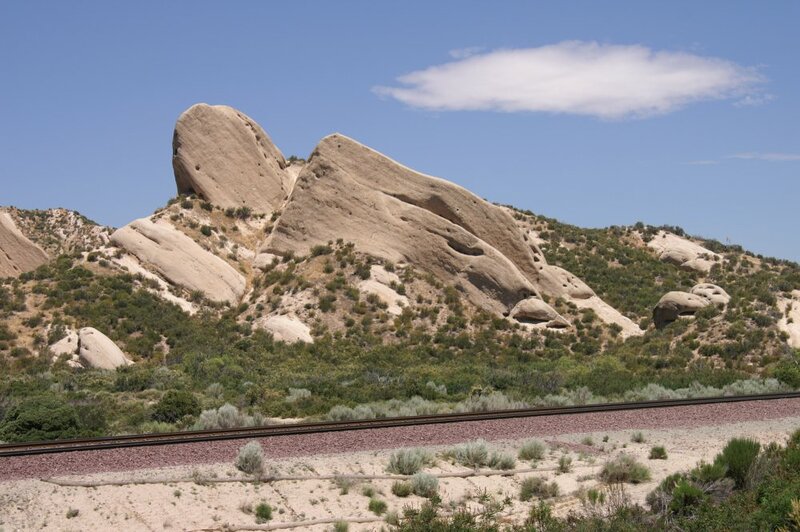 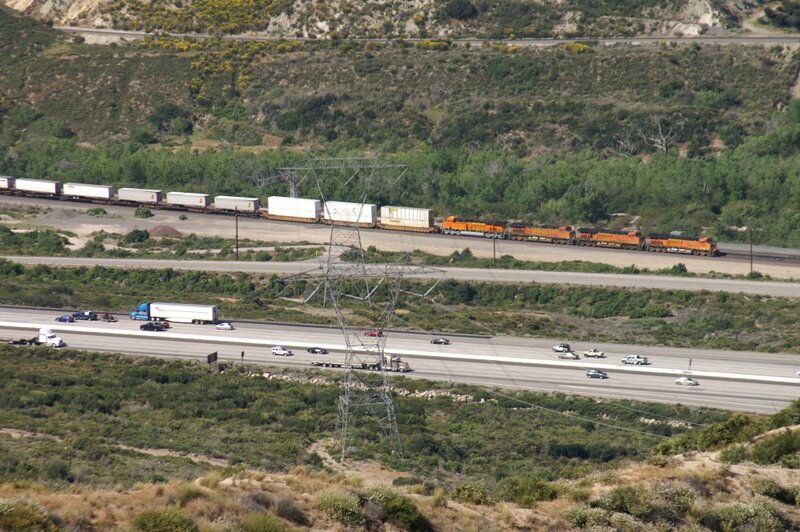 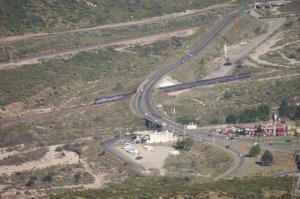 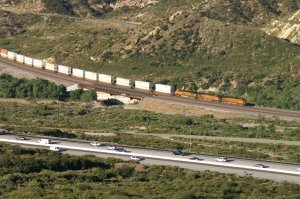 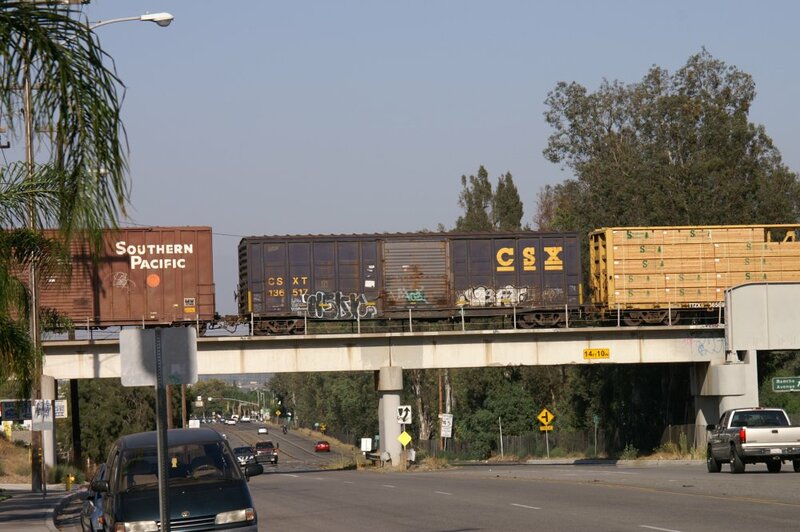 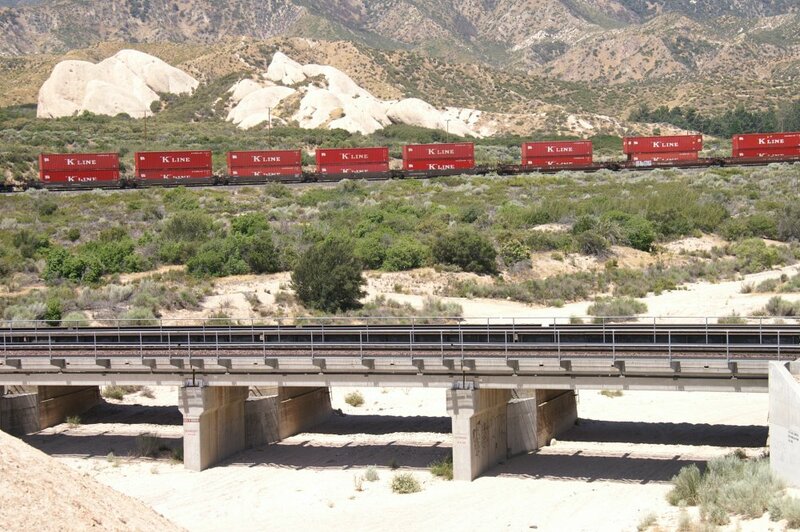 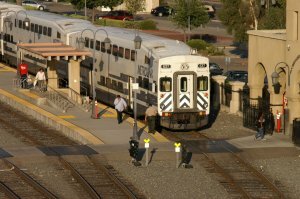 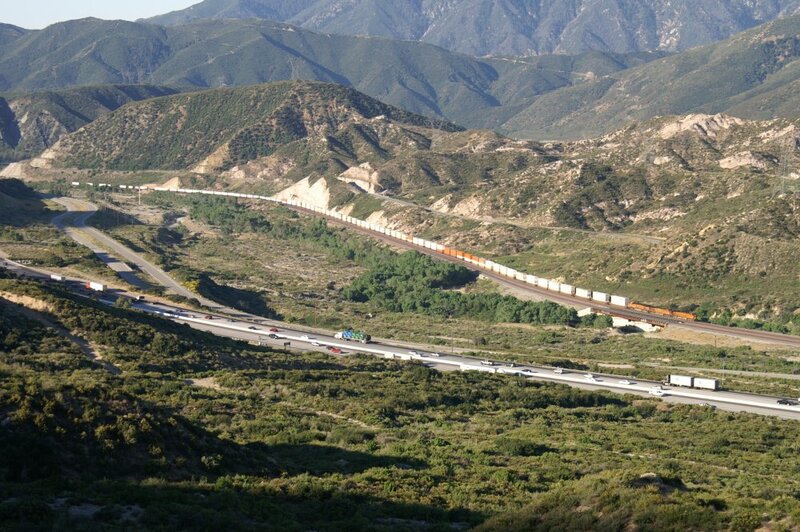 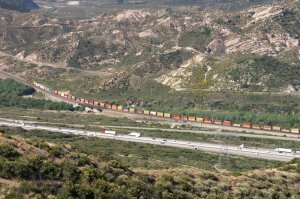 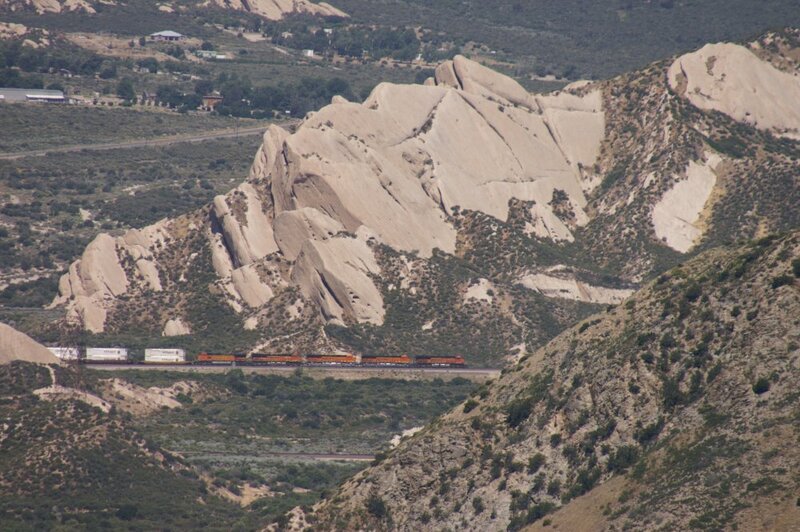 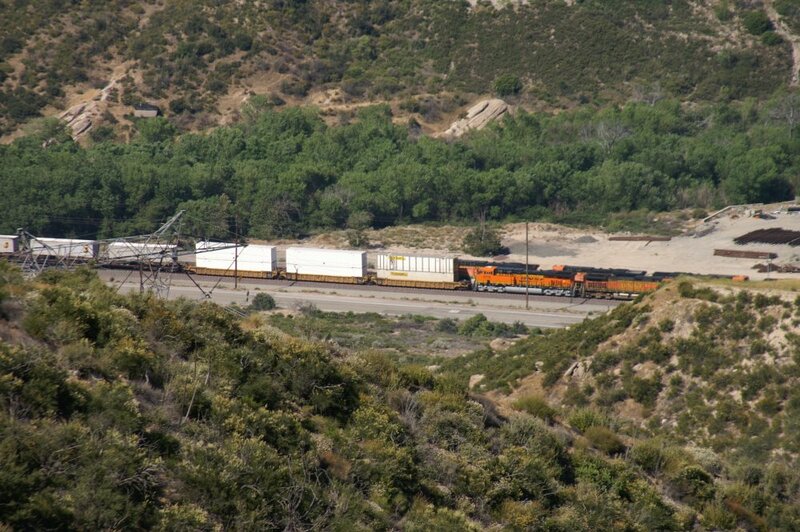 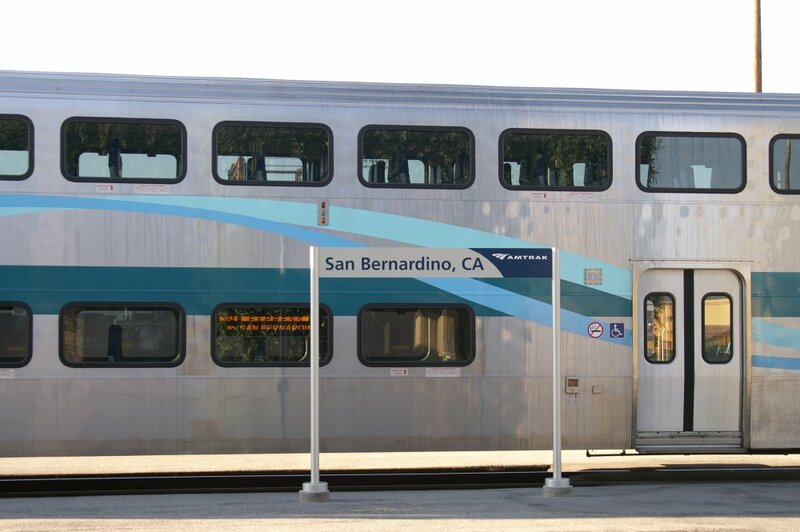 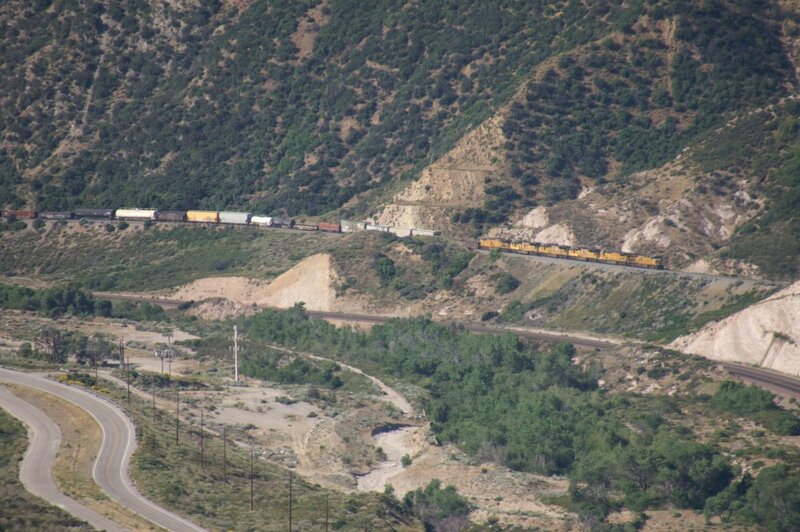 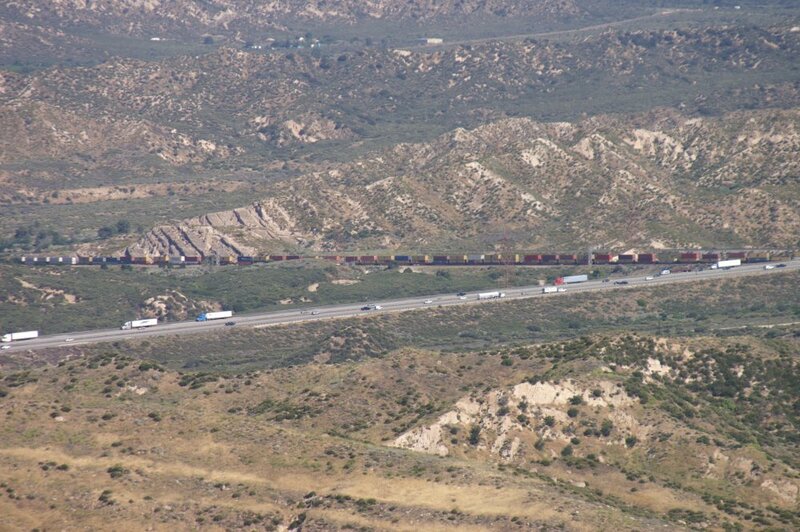 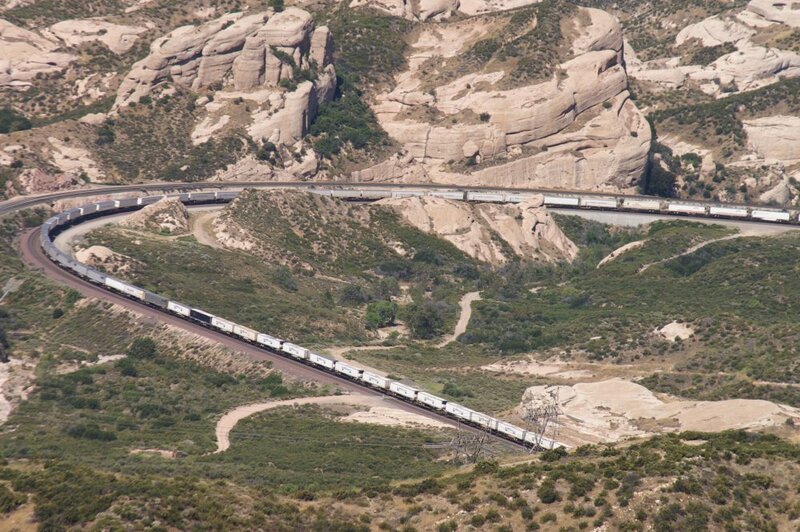 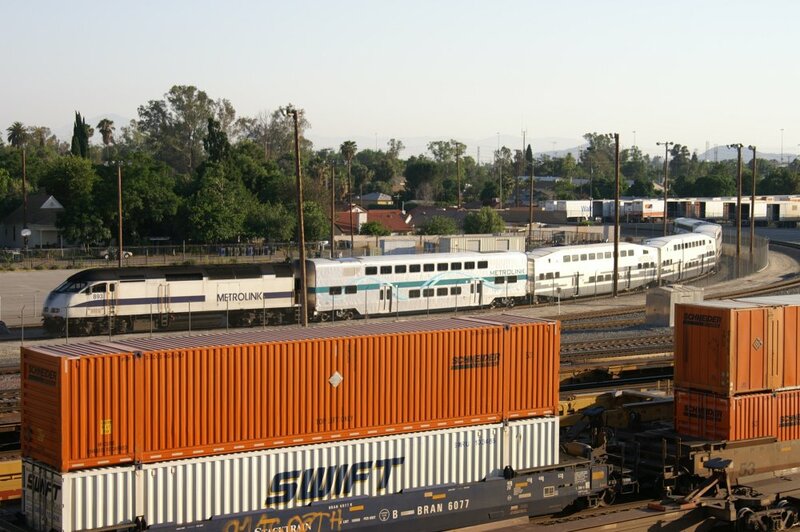 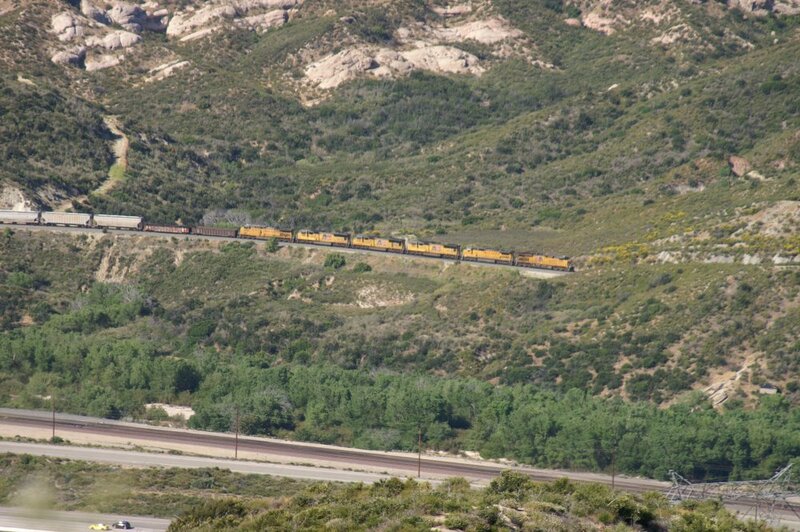 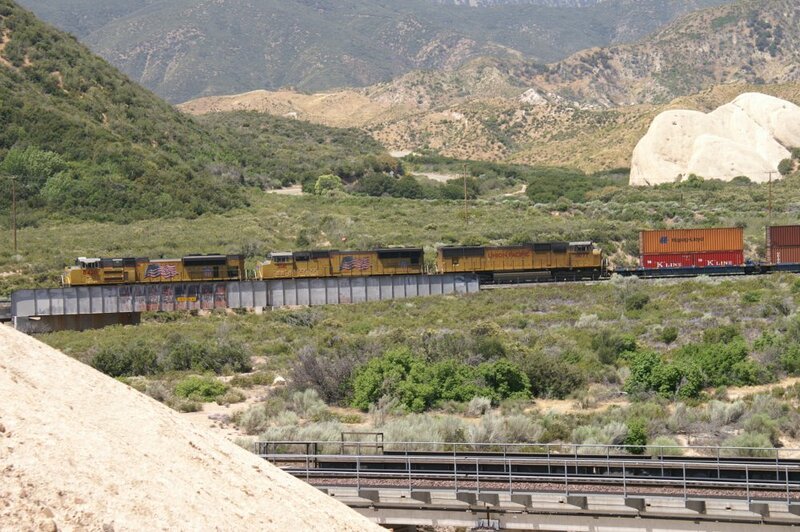 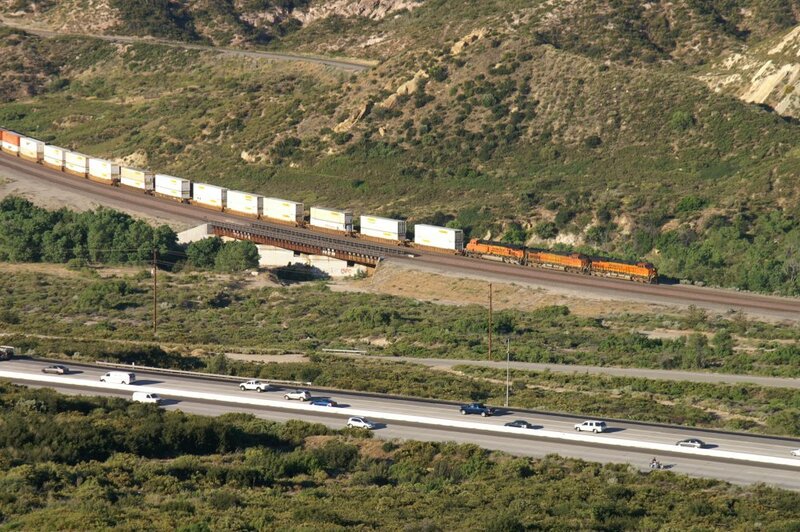 From left: I-15, Cajon Blvd., BNSF MT-3 (3%), MT-2 & MT-1 (2,2%) going to Sullivans Curve. Today, I used my knowledge of yesterday's exploring of USFS 2N47 and Cleghorn Road Overlooks. 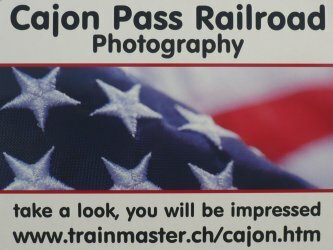 I am not sure if people like the endless amount of photos for each and every train. 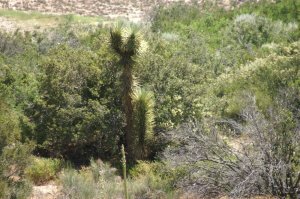 But that way, it shows exactly how I was exploring a certain situation, every minute, almost like a movie - sorry about that. Of course, I am aware, the qualitiy of the photos from high above is by far not satisfactory. I did not have a tripod (just a monopod) nor a high end camera! 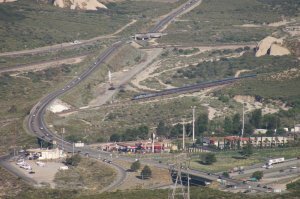 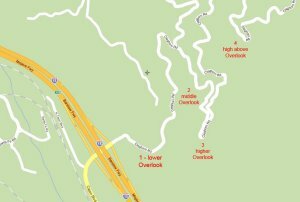 Now, I finally went to Overlook 4 (see map above) which is high above and gives a great overview from SWC up to Silverwood. 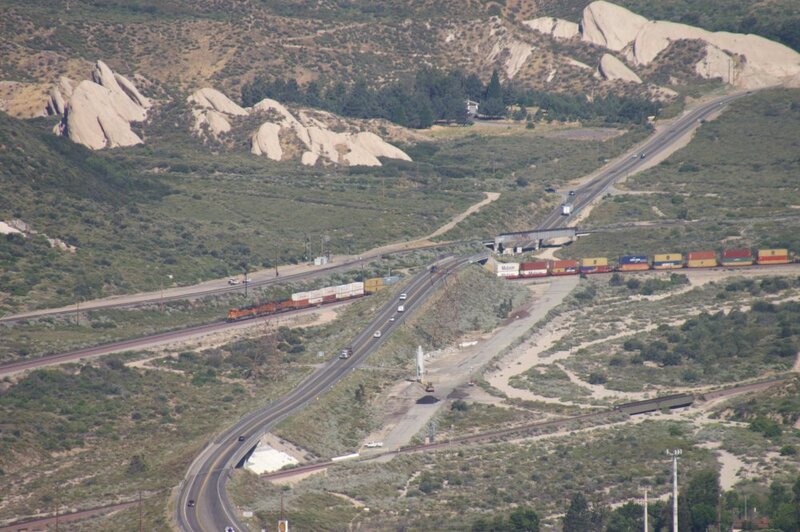 Once again I am having the problem with the long distance, haze and heavy wind. 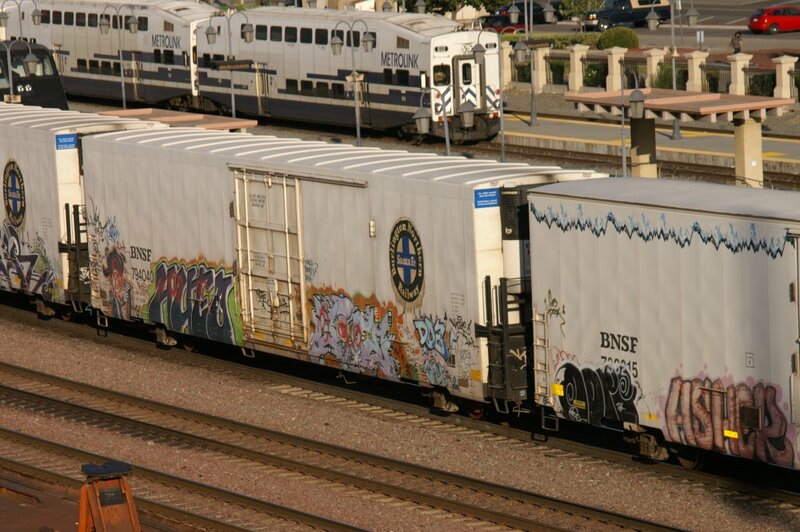 In other words, the quality is not satisfactory. 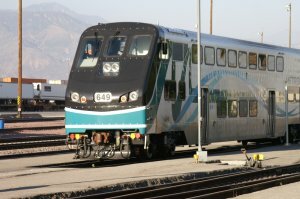 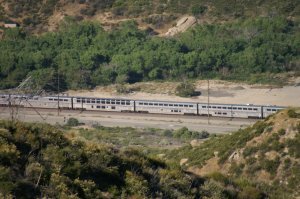 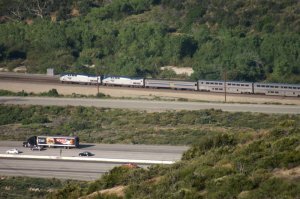 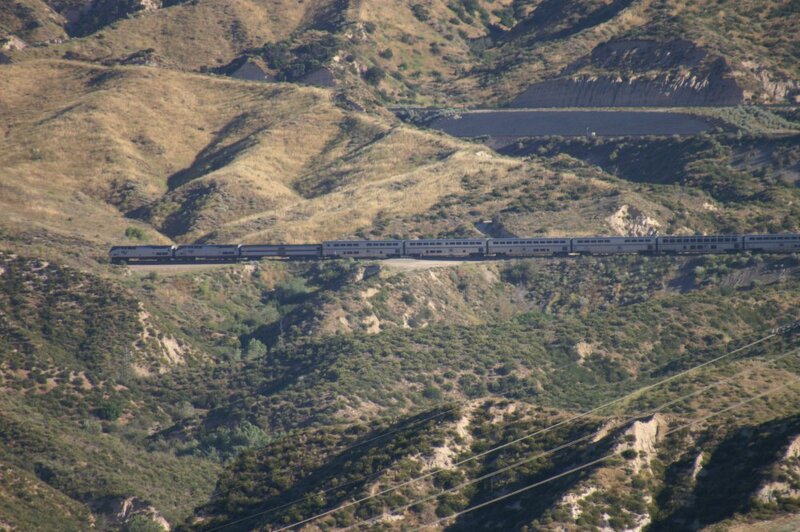 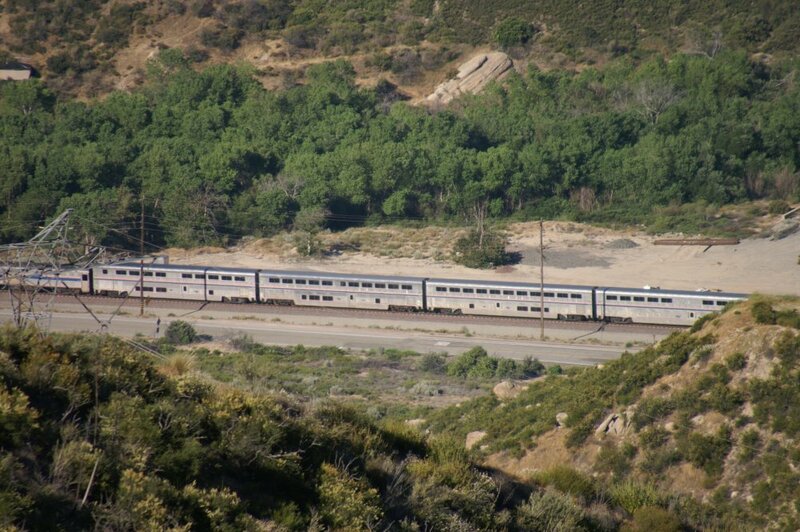 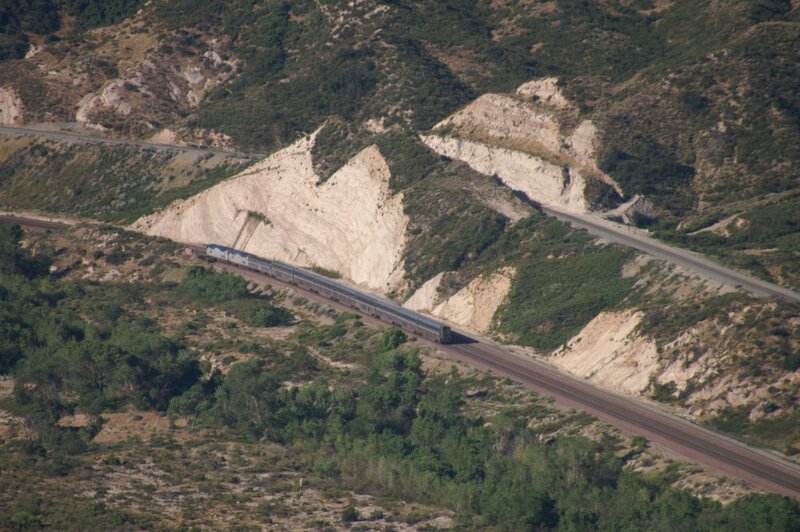 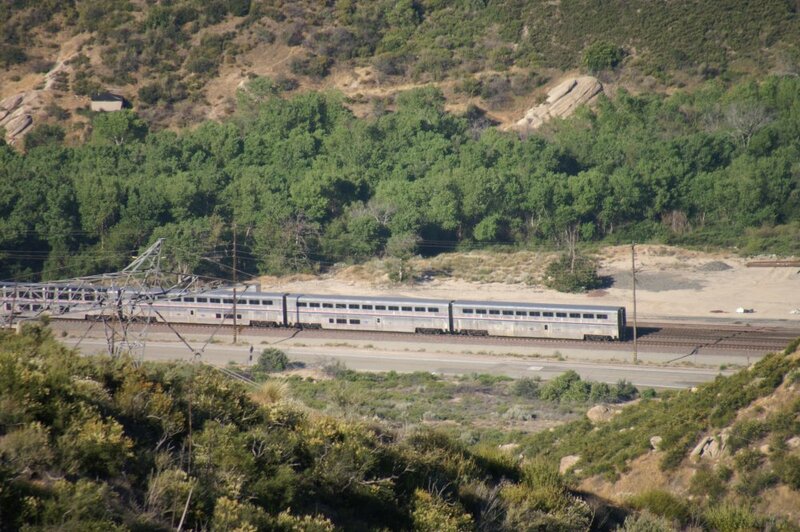 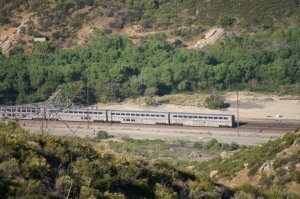 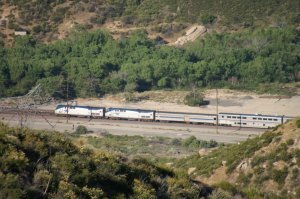 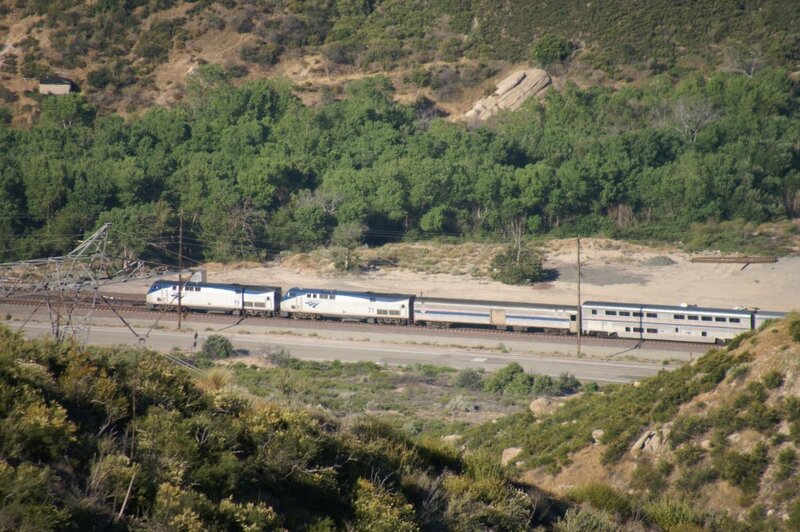 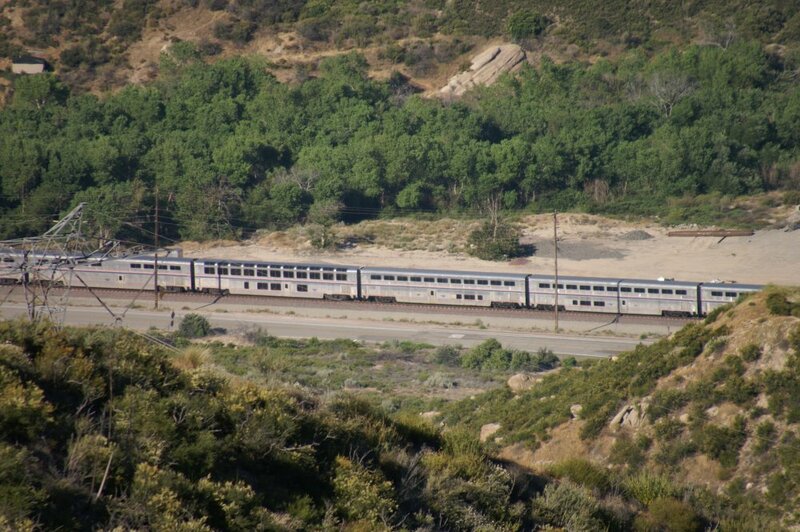 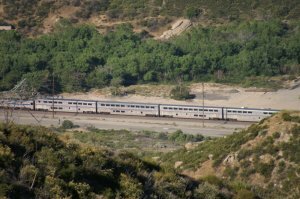 Big surprise to see the Amtrak # 3 WB coming from Summit and Silverwood downhill on MT-3. It is just passing Hill 582. 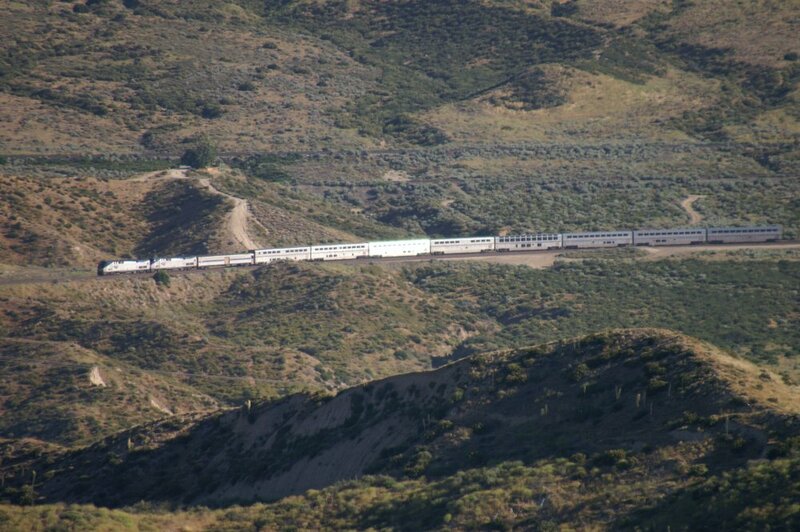 We will follow this train. 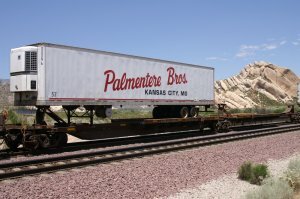 After 28 photos the show is over. Please note: From my overlook I could not see MT-3 between photo 30374 and 30375 because there was a hill in the way. 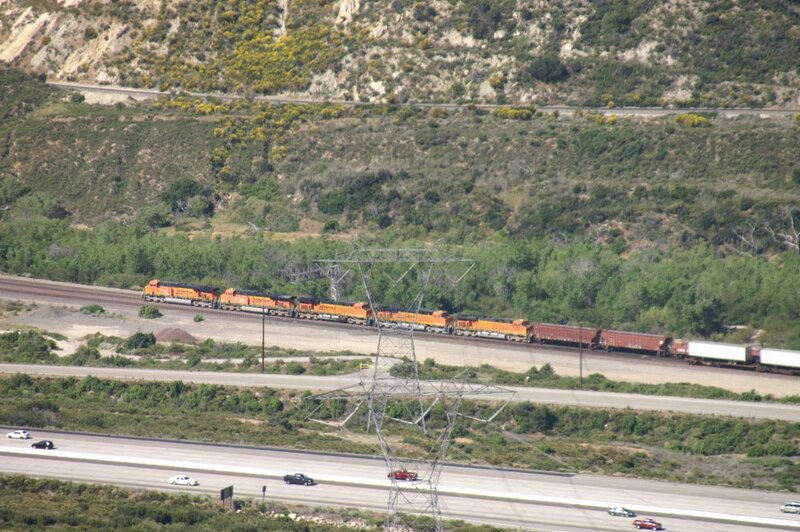 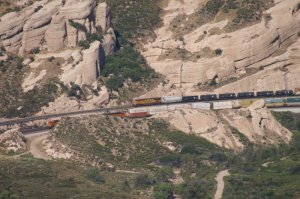 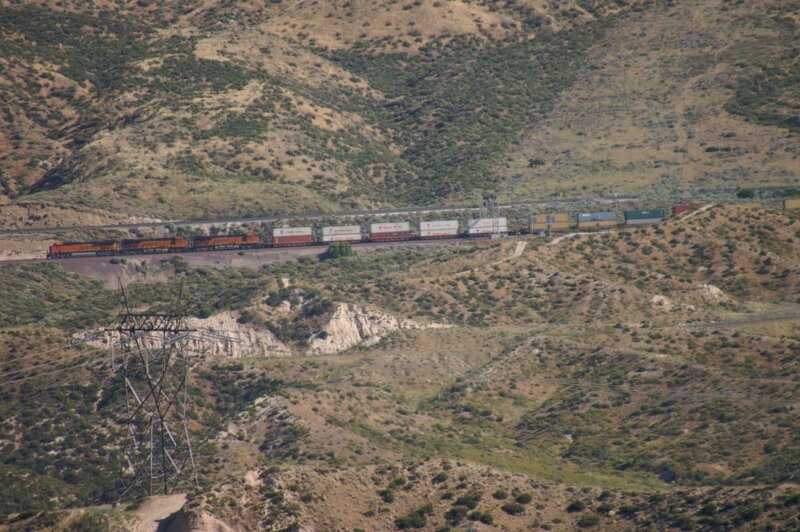 My dream fulfilled - the perfect meet between Sullivans Curve and Pine Lodge with UP Train 5 NB on UPT and BNSF Train 4 WB on BNSF MT-2 at 08.38 h.
On photo 30485, just behind the last Auto Rack of Train 4 we can see the nose of an UP EB which is a Worktrain No. 7 at 08.49 h.
Between photo 30487 (last of BNSF Train 4) and photo 30385 (first photo of this WB) a total of 23 minutes passed. 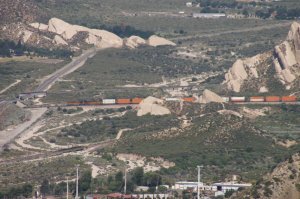 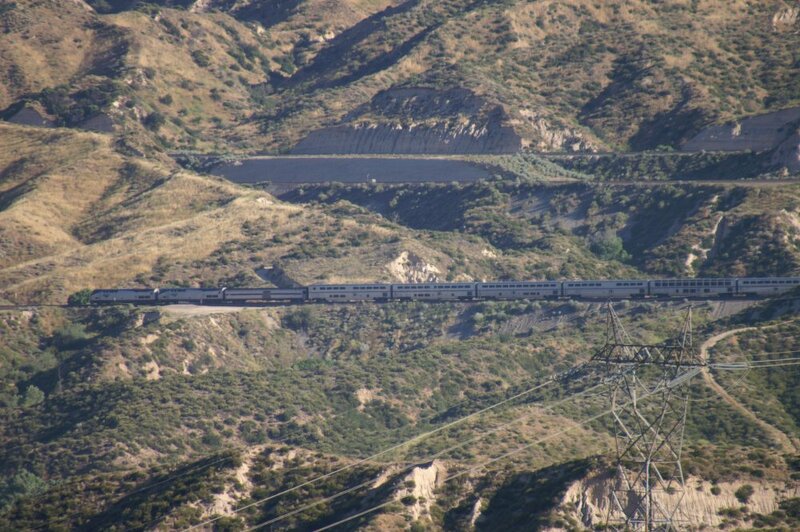 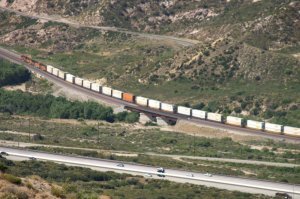 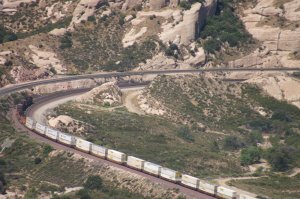 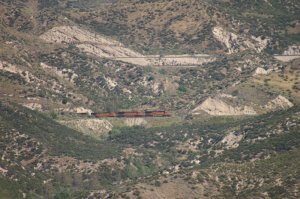 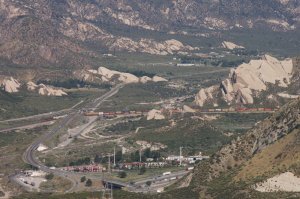 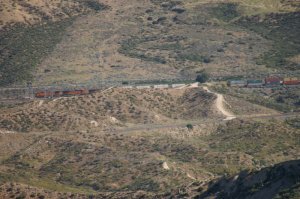 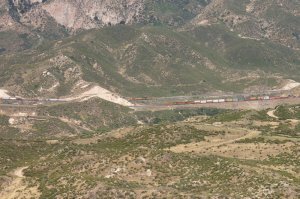 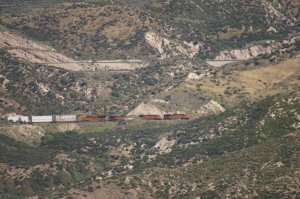 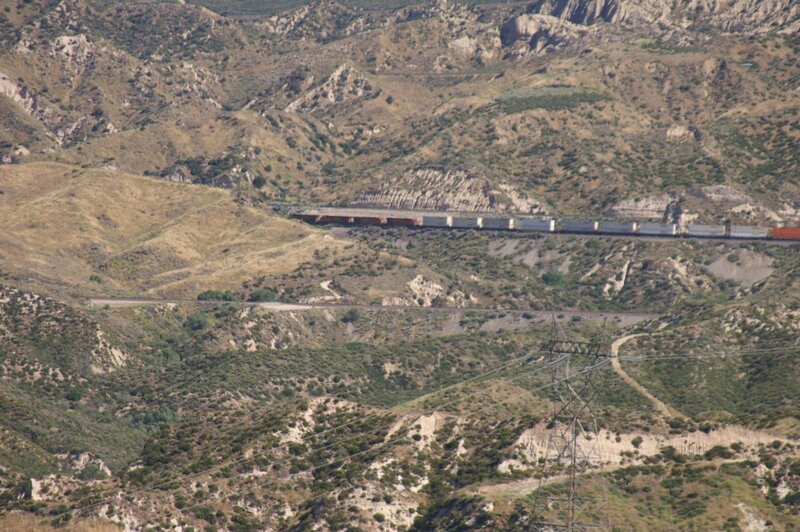 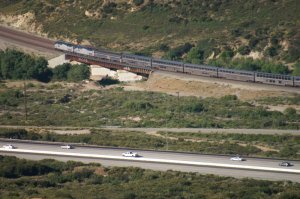 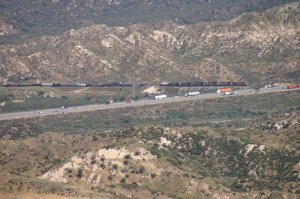 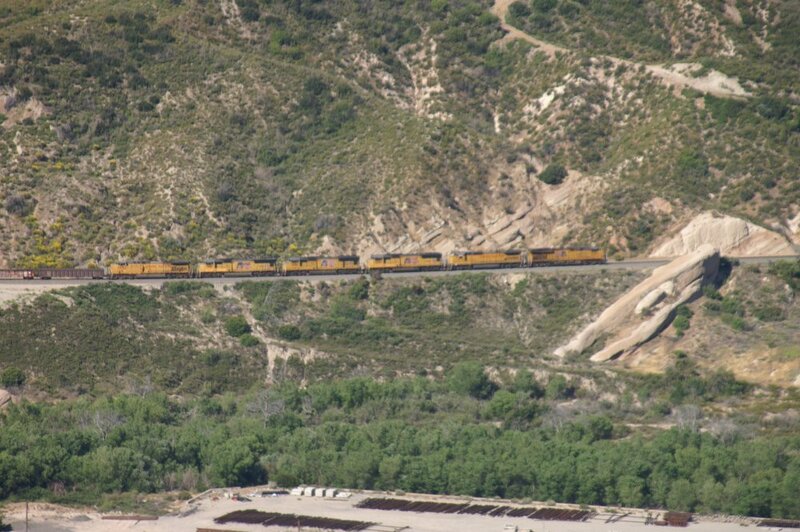 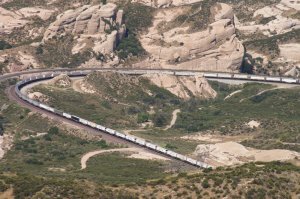 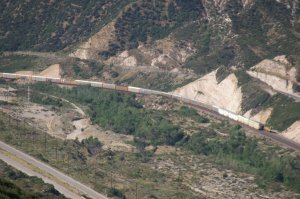 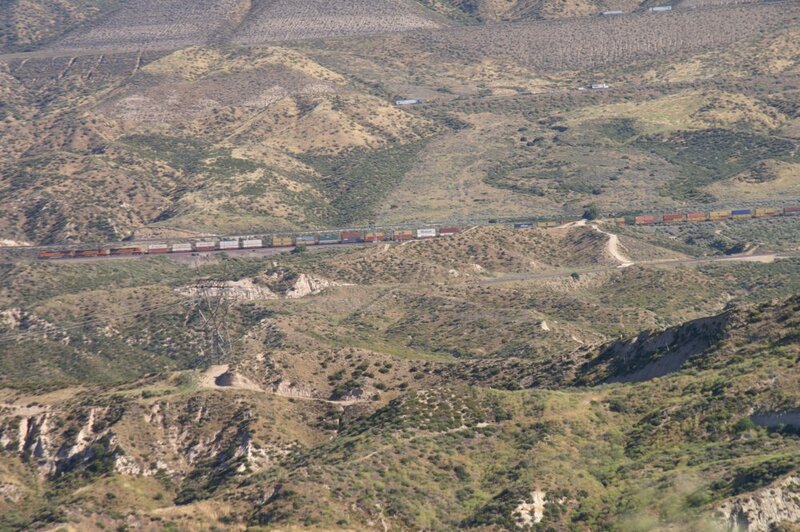 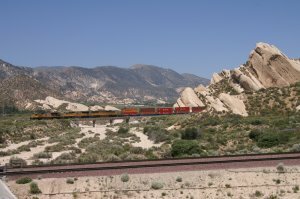 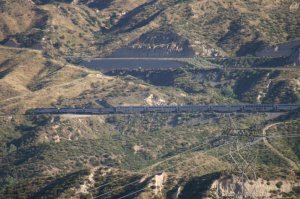 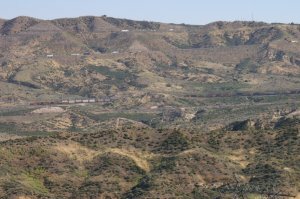 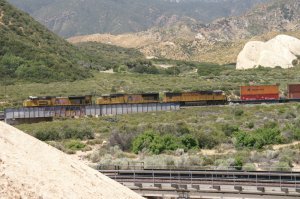 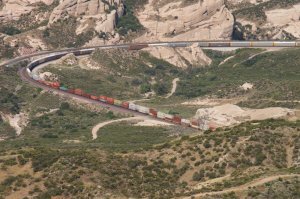 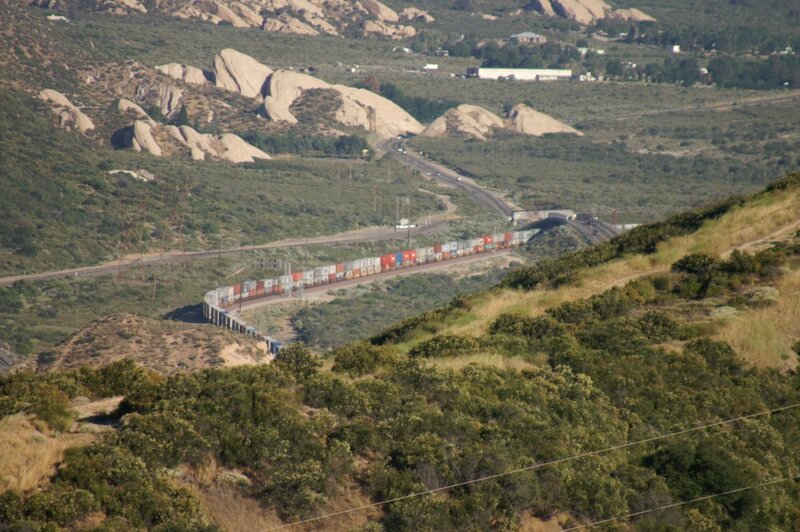 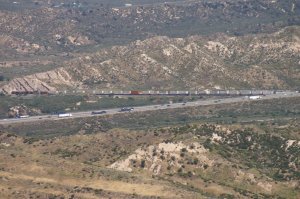 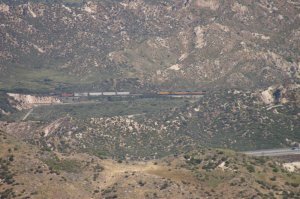 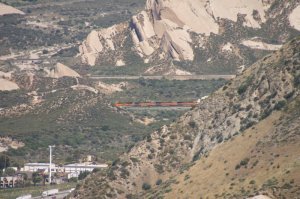 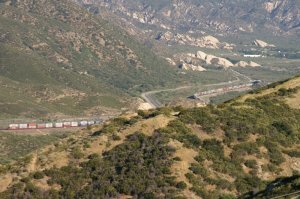 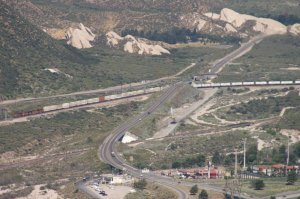 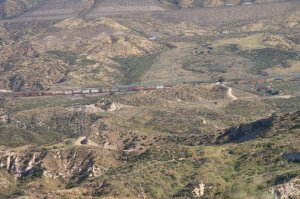 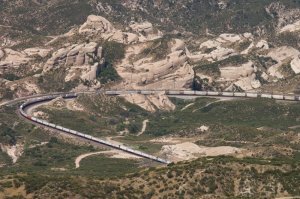 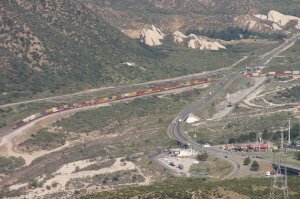 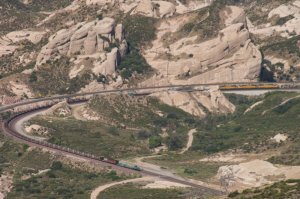 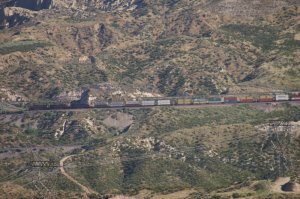 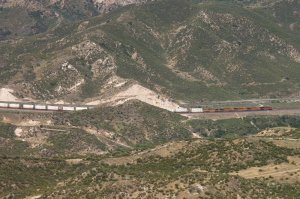 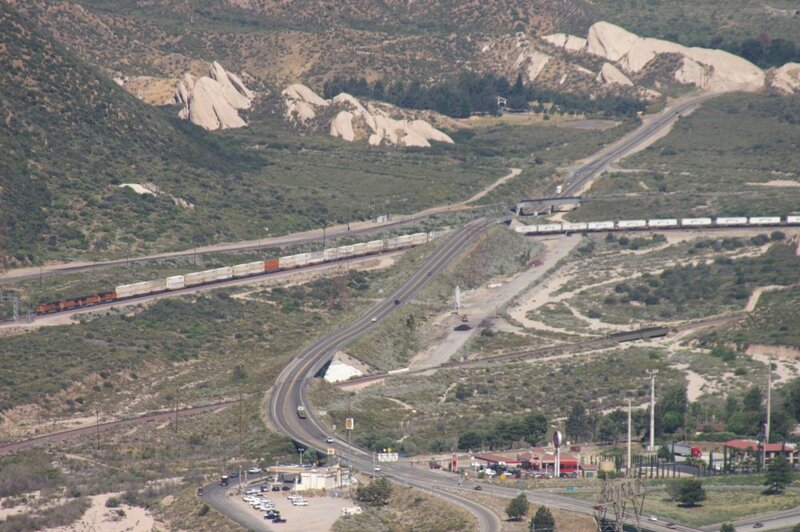 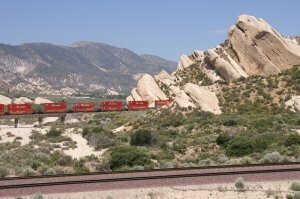 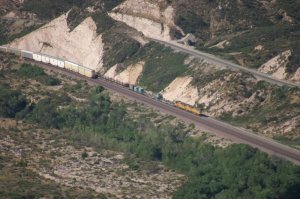 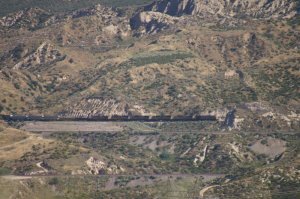 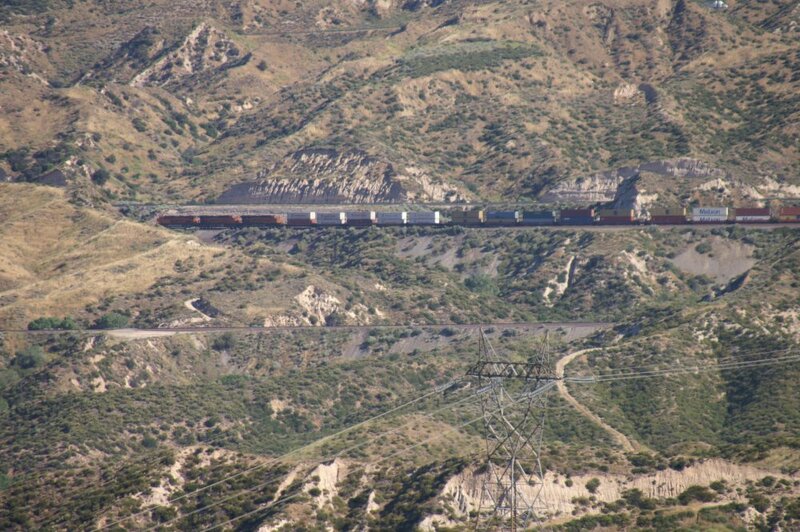 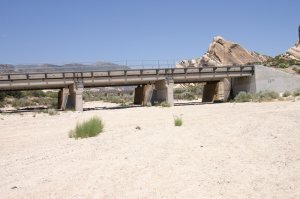 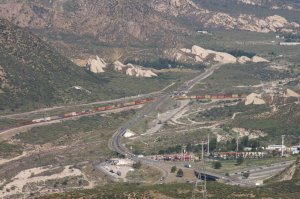 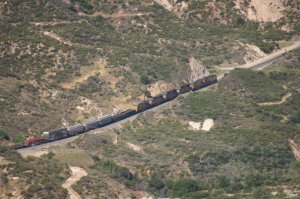 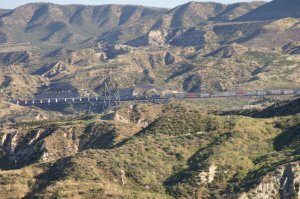 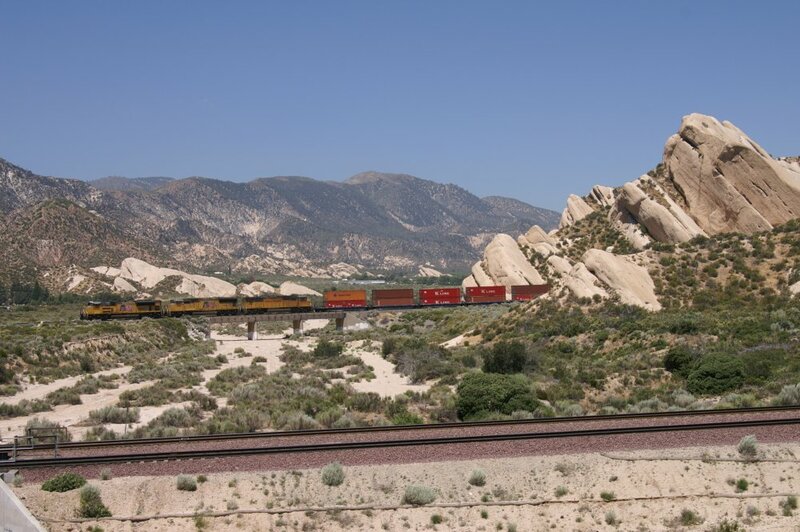 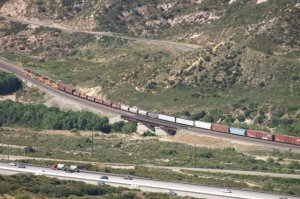 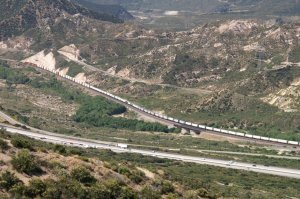 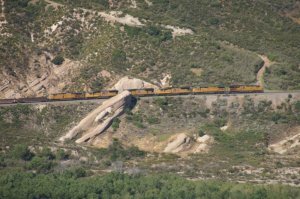 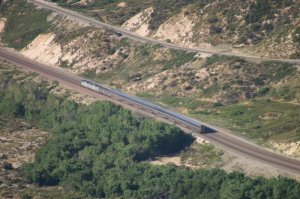 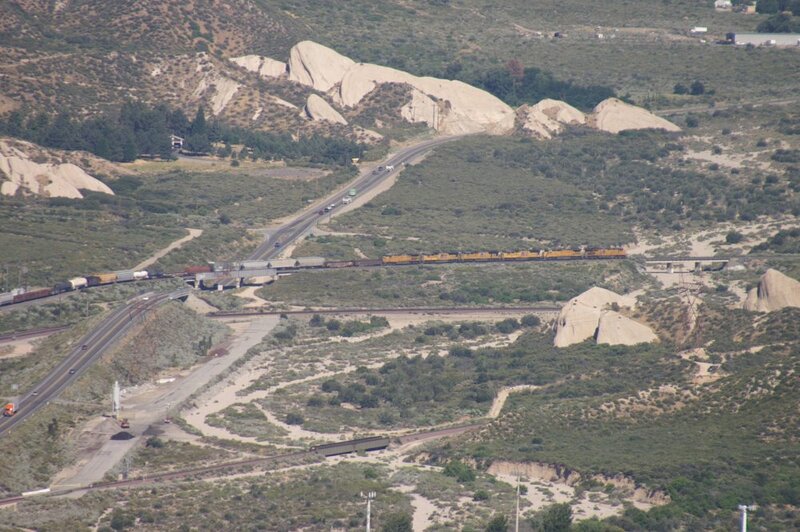 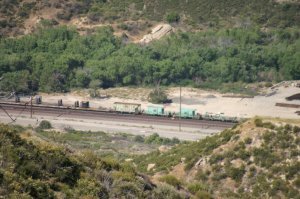 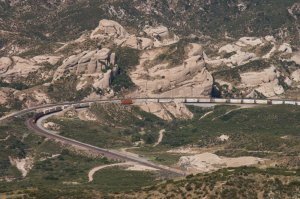 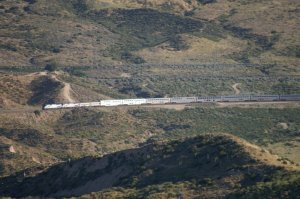 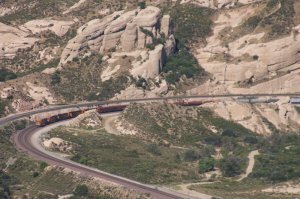 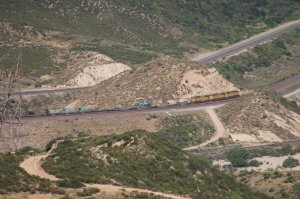 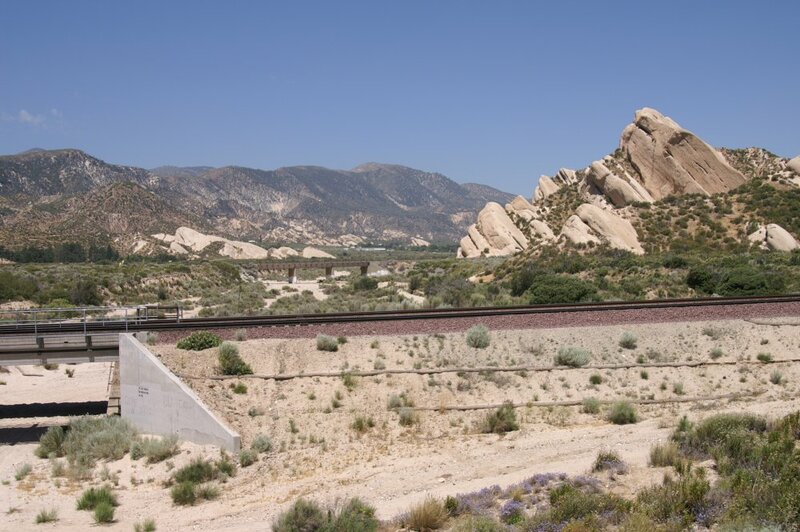 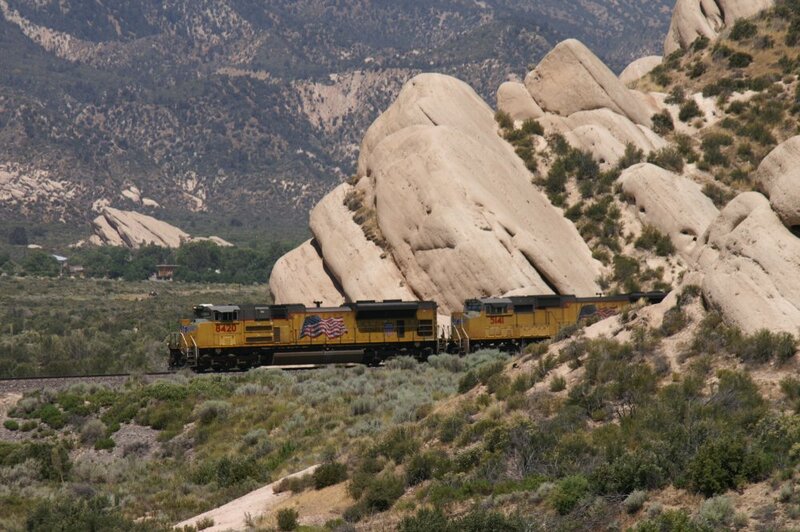 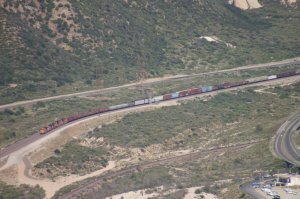 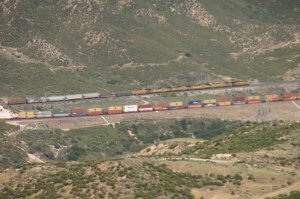 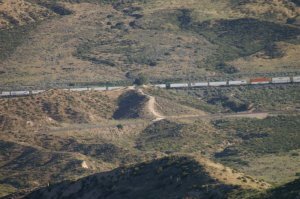 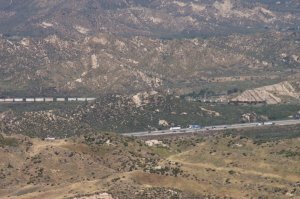 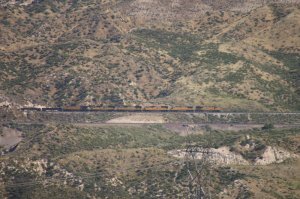 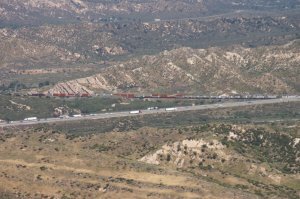 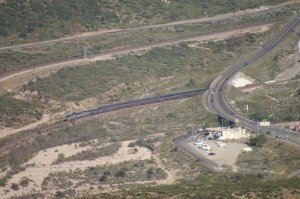 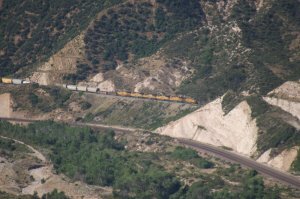 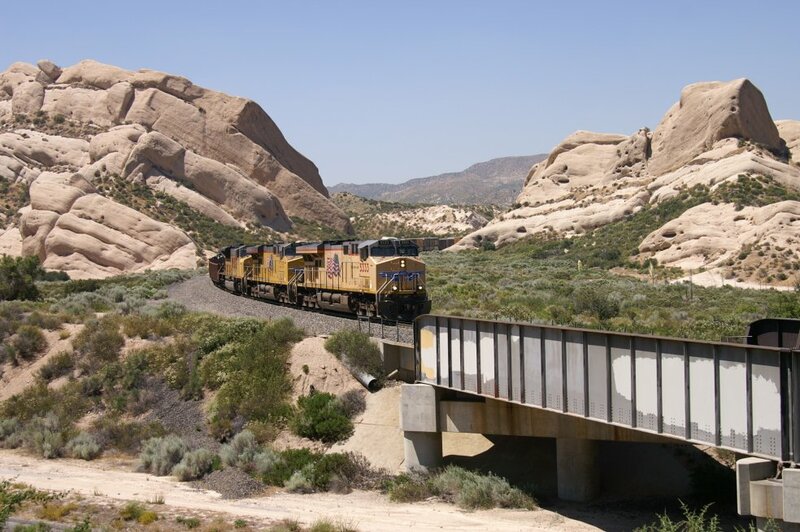 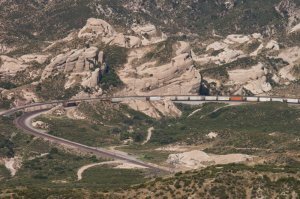 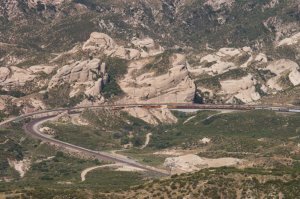 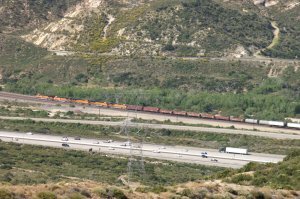 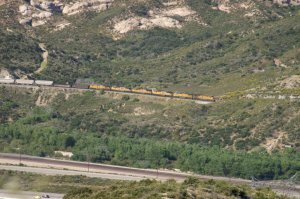 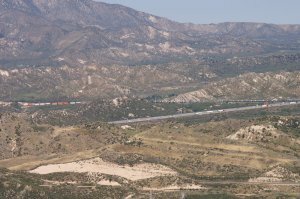 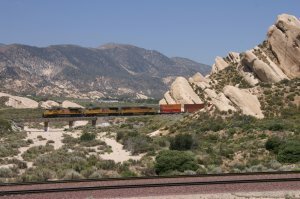 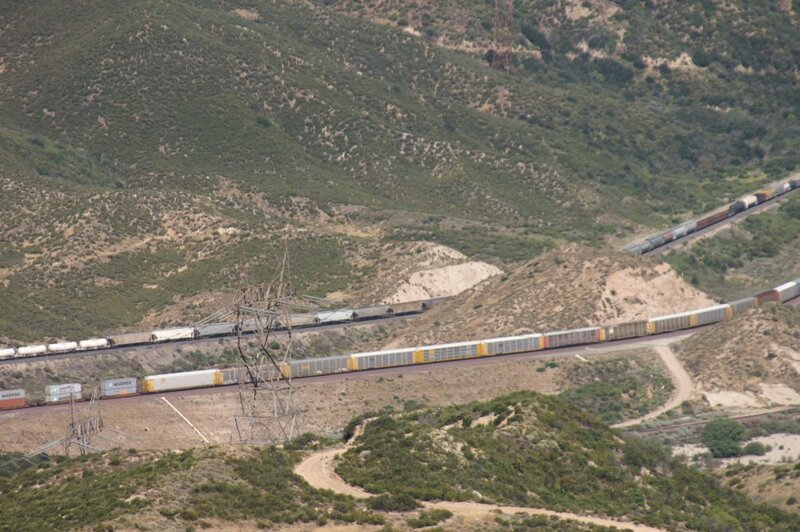 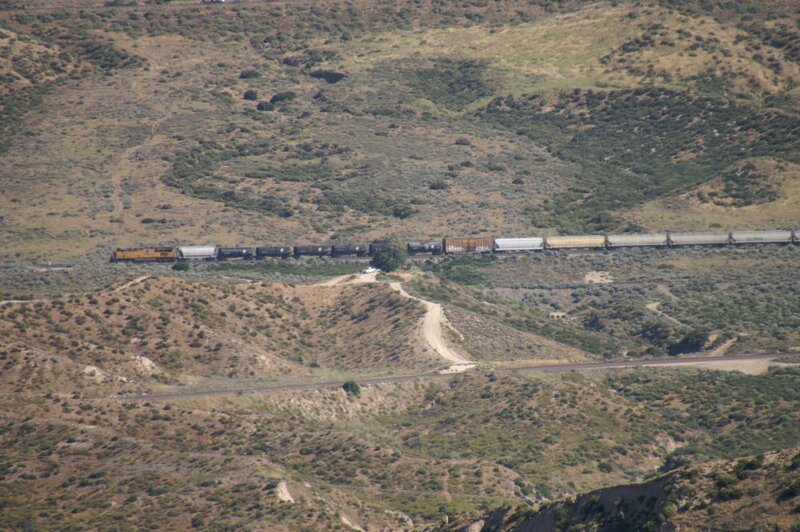 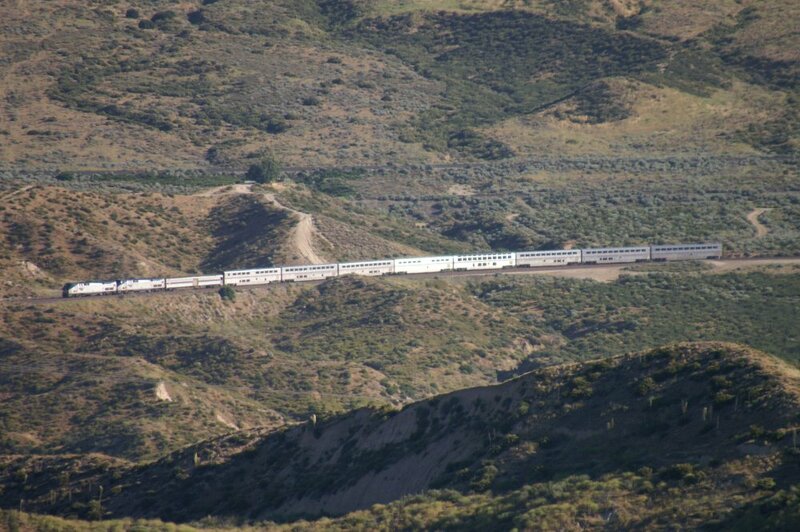 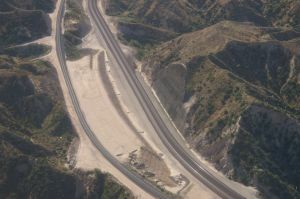 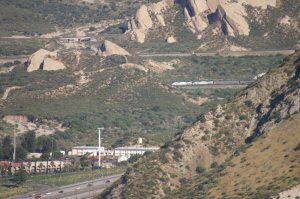 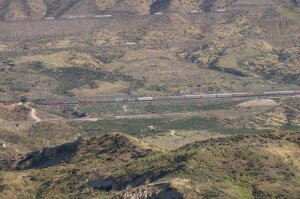 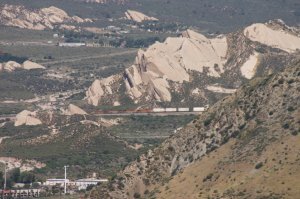 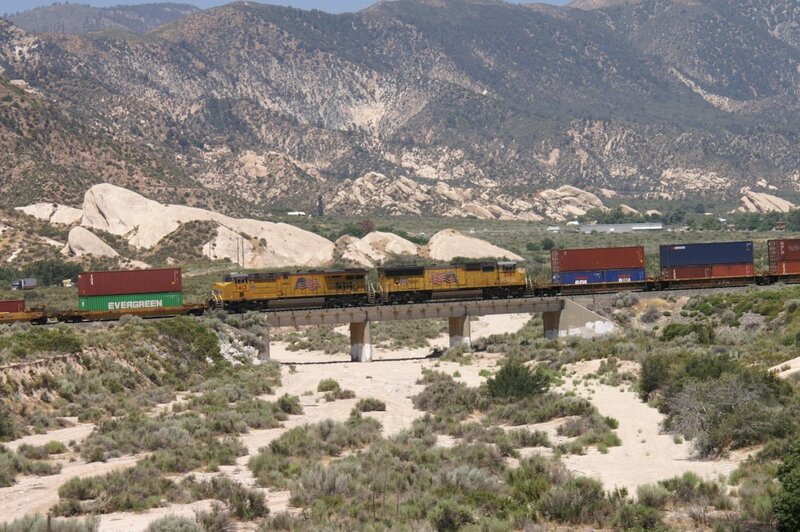 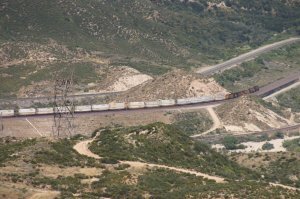 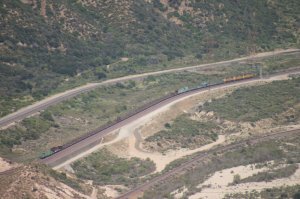 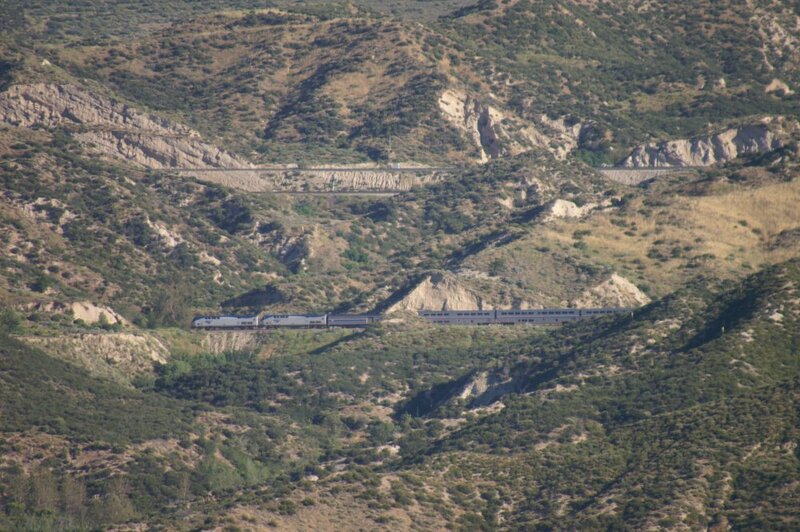 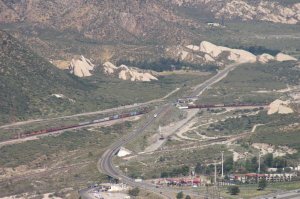 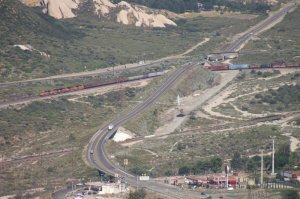 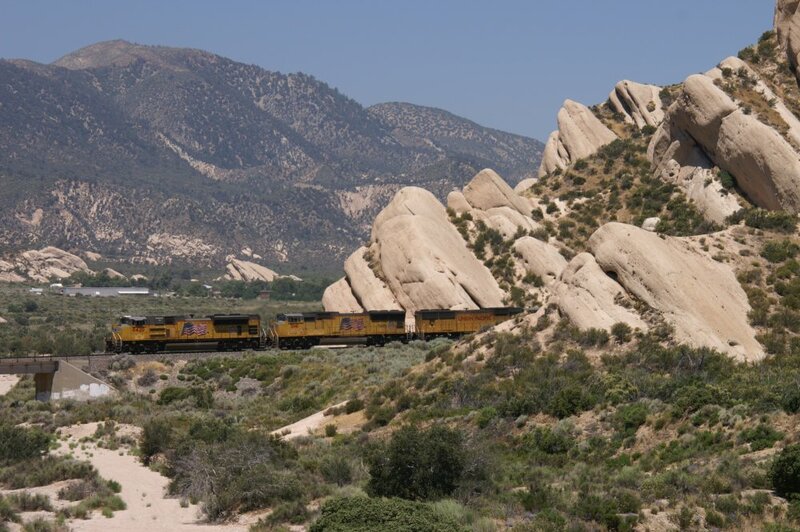 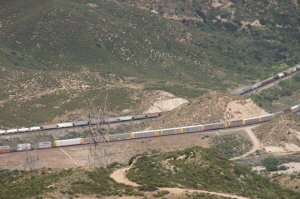 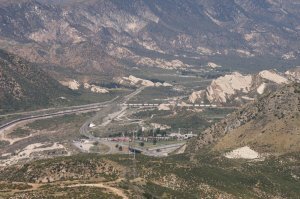 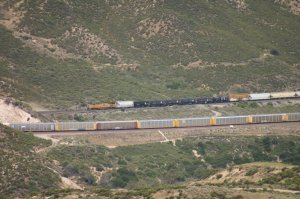 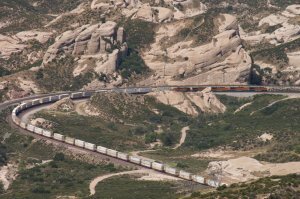 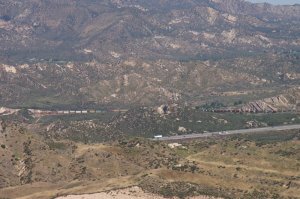 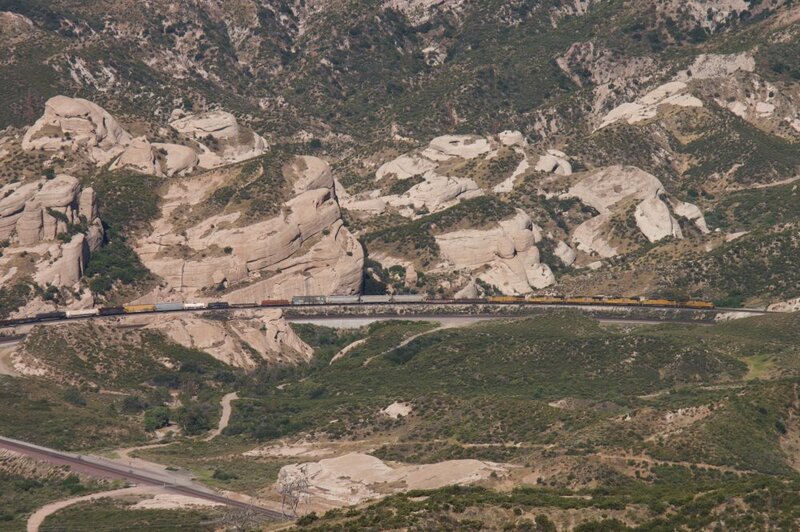 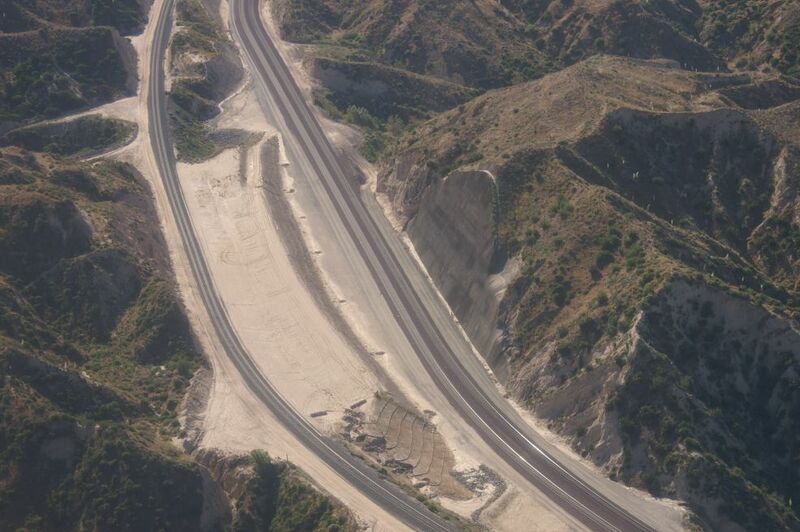 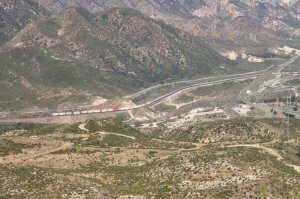 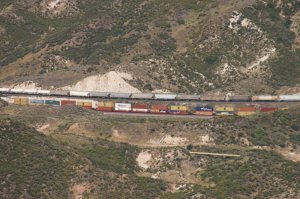 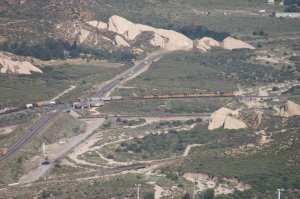 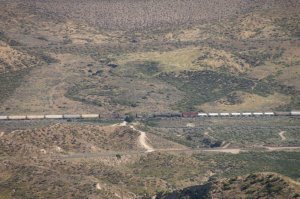 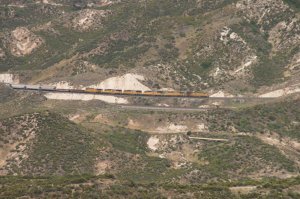 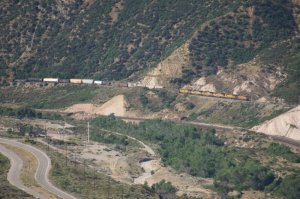 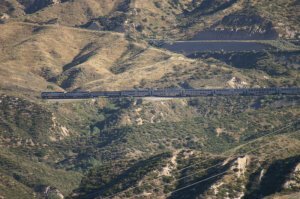 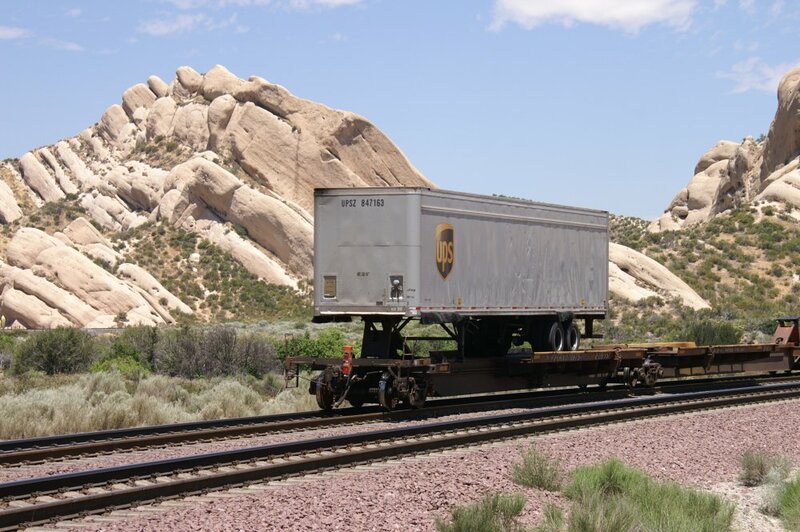 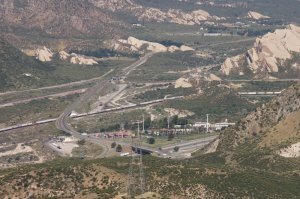 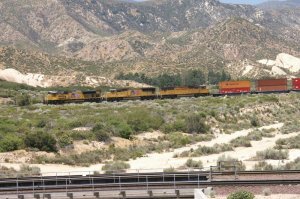 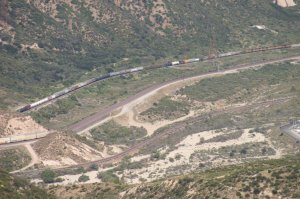 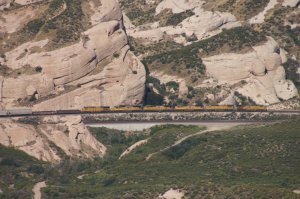 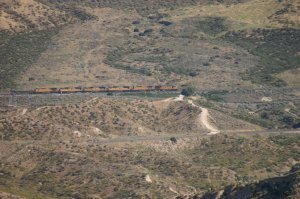 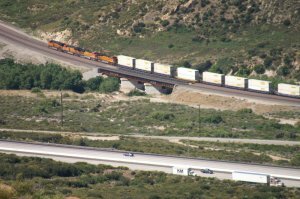 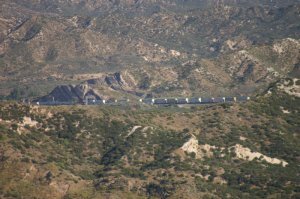 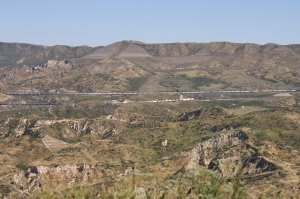 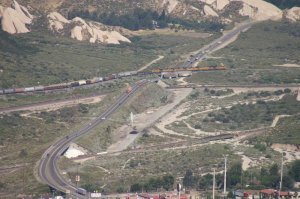 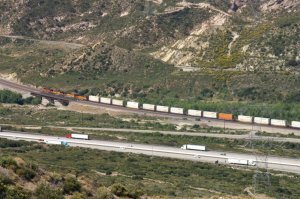 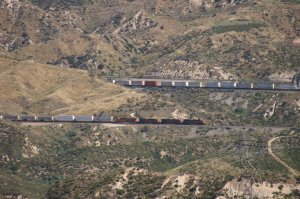 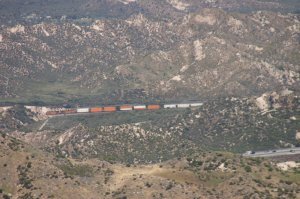 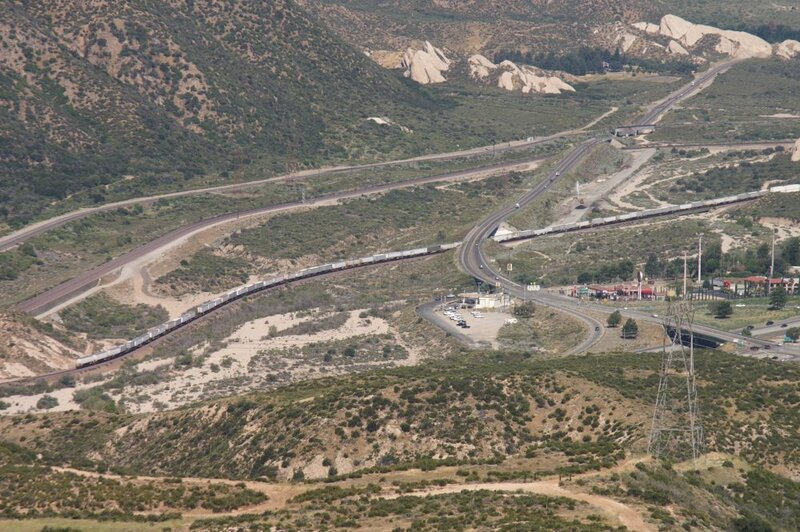 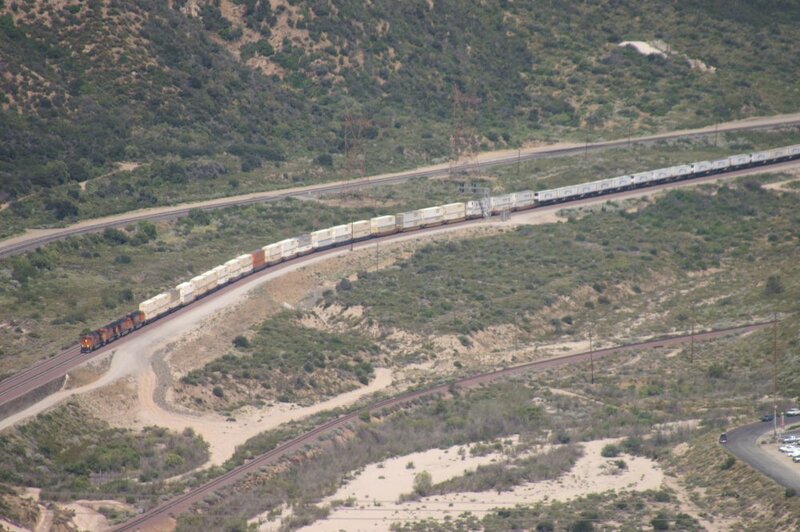 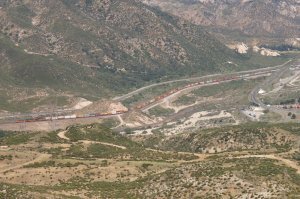 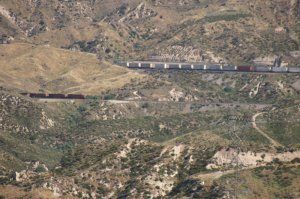 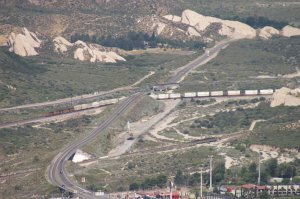 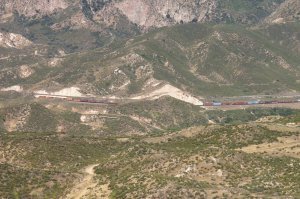 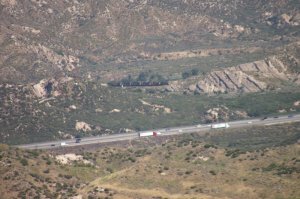 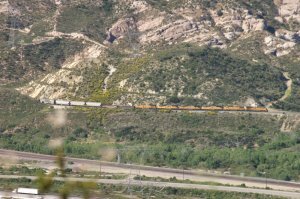 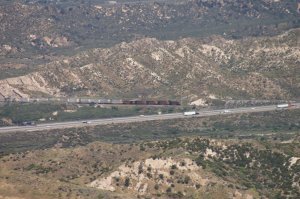 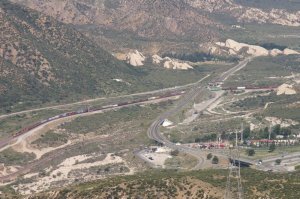 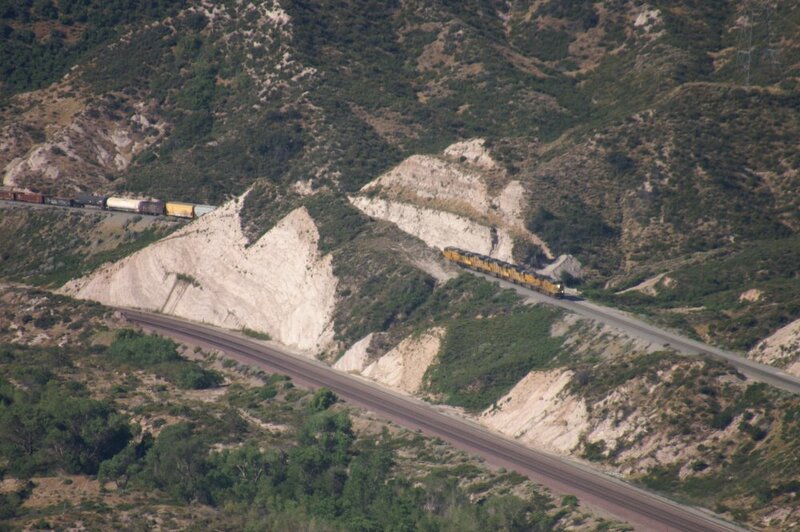 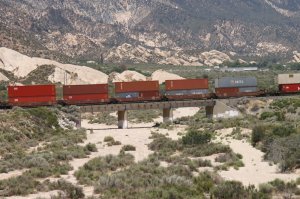 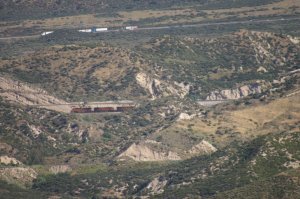 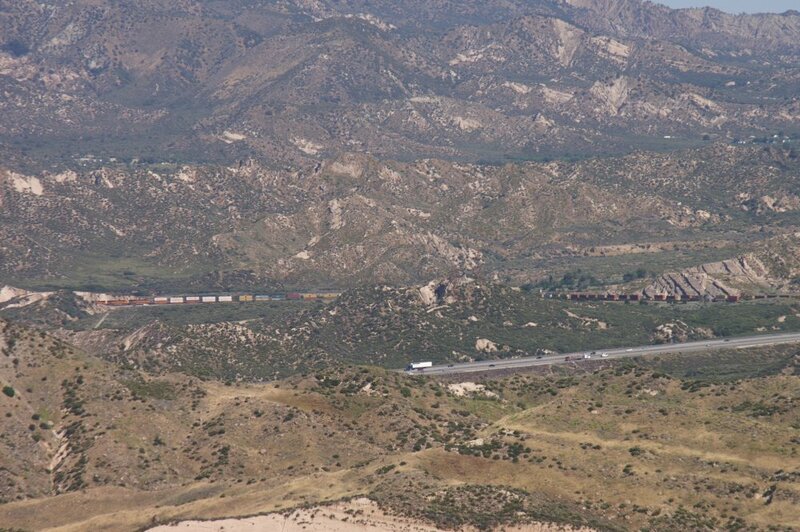 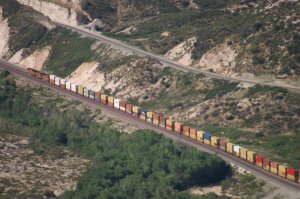 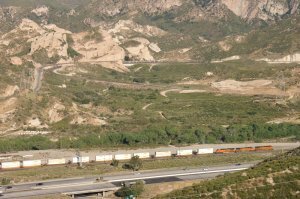 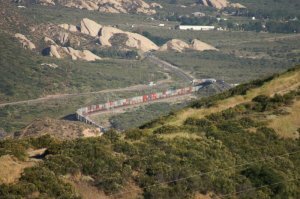 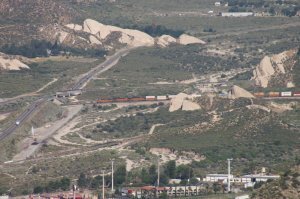 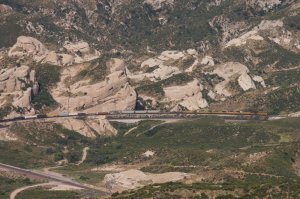 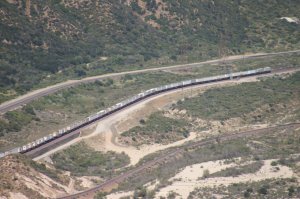 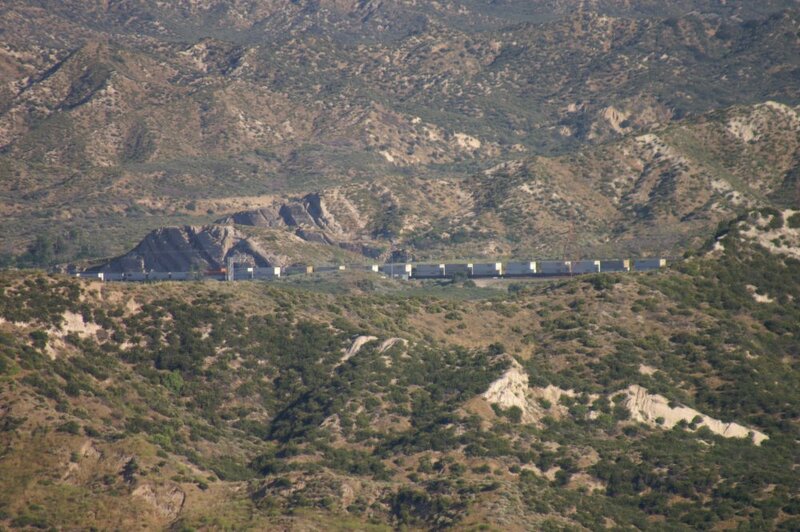 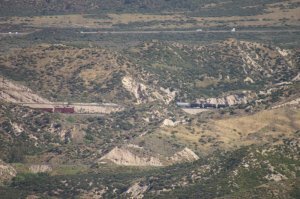 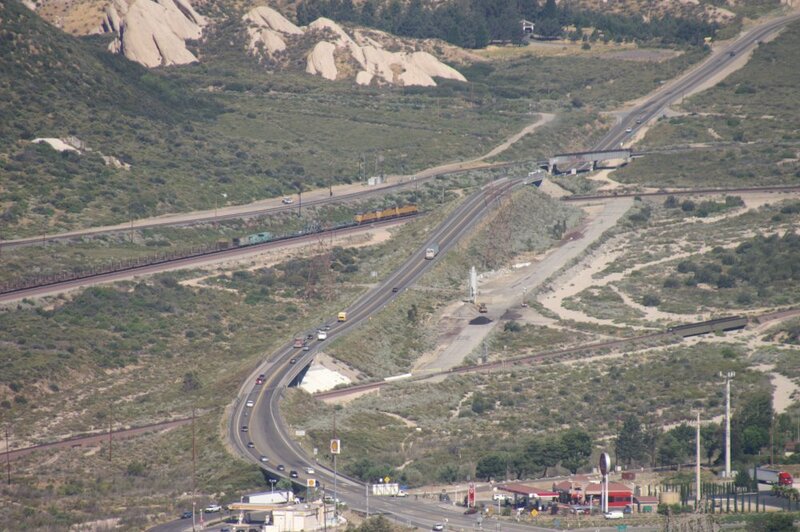 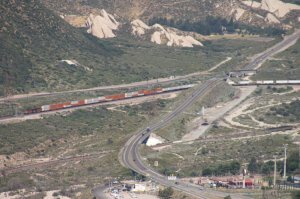 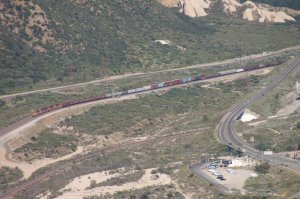 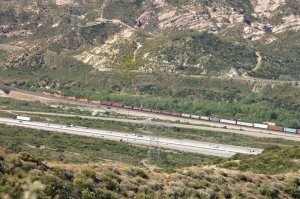 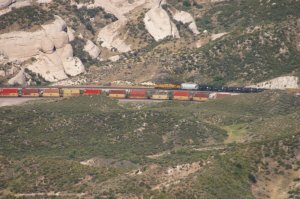 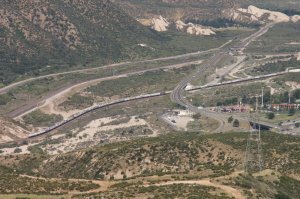 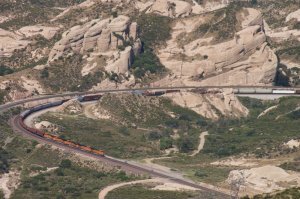 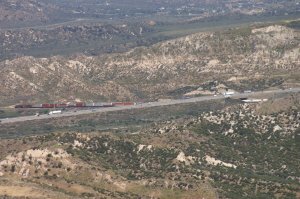 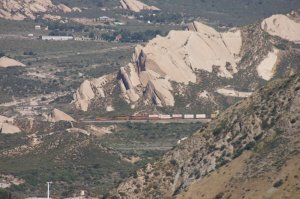 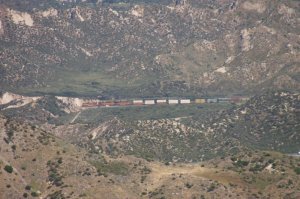 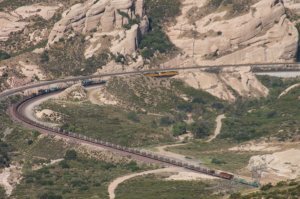 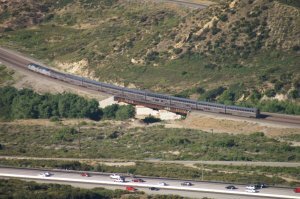 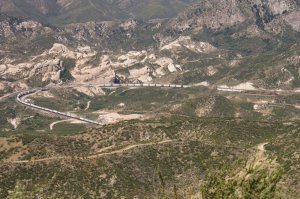 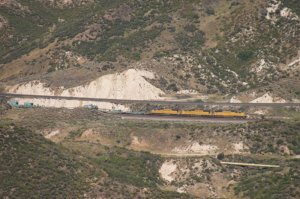 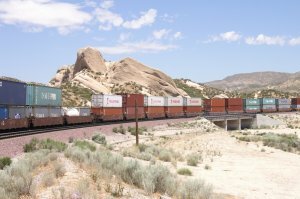 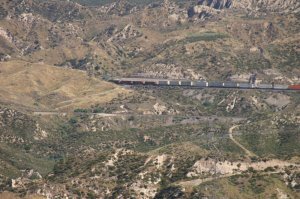 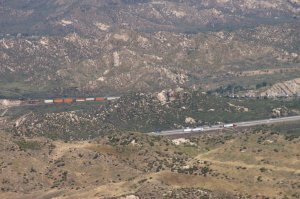 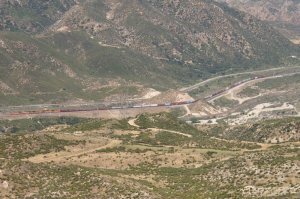 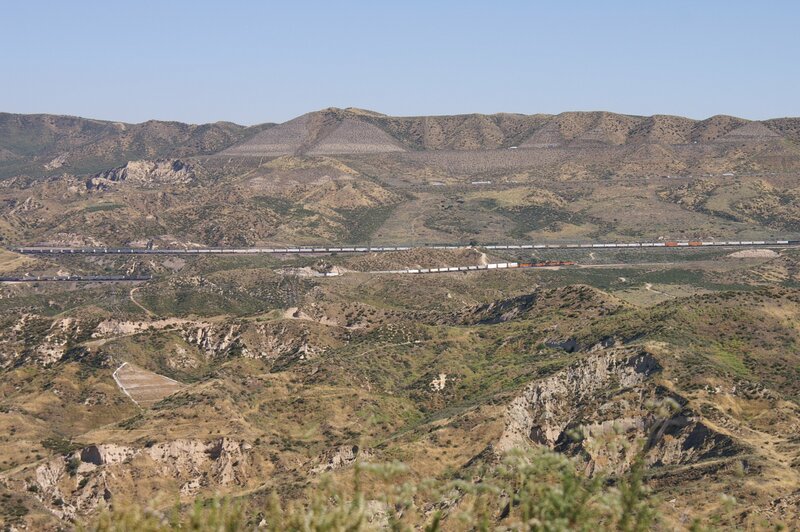 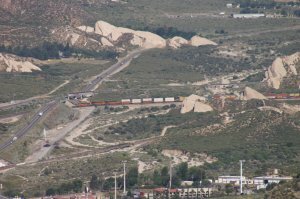 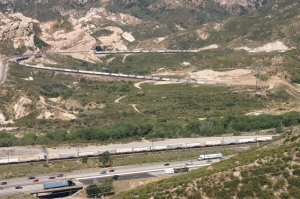 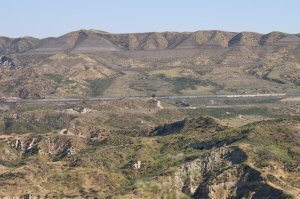 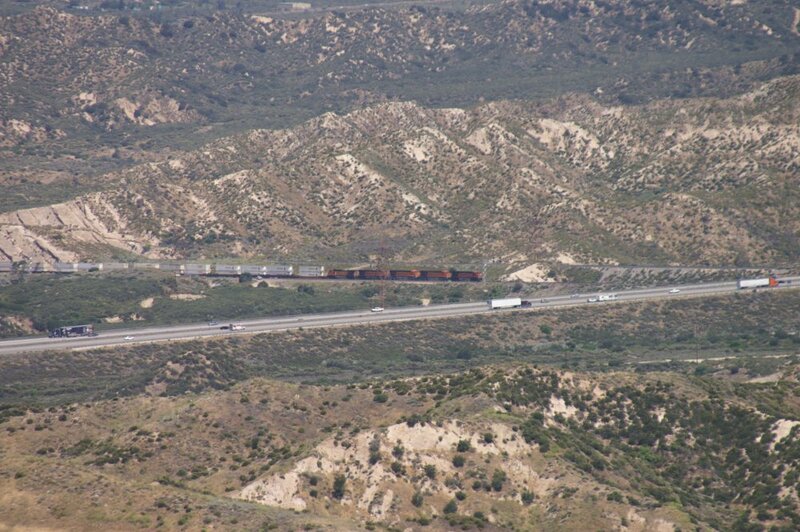 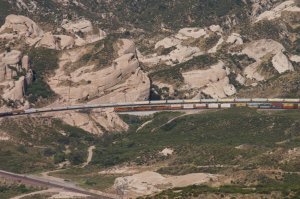 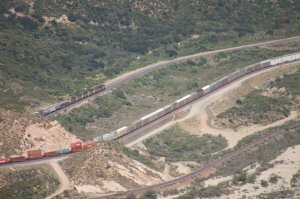 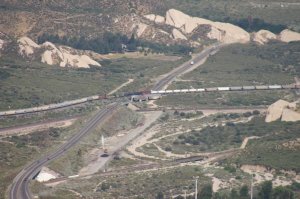 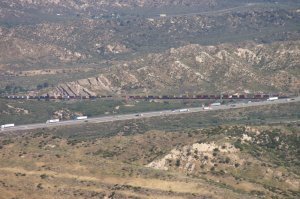 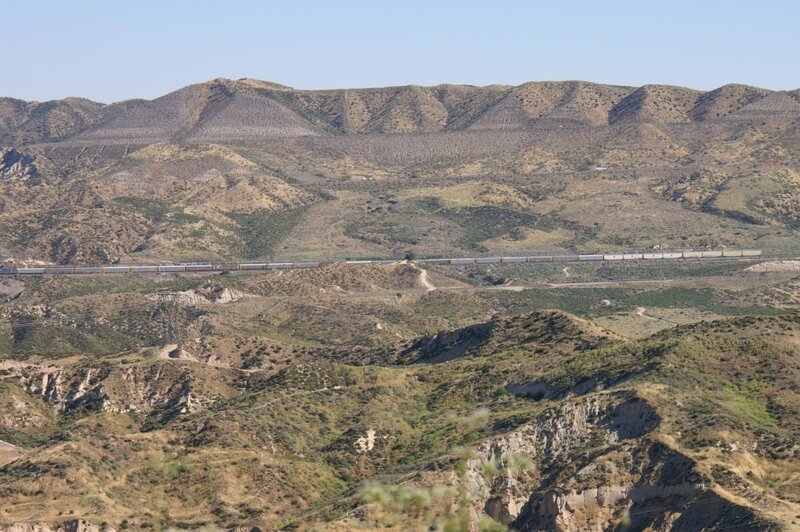 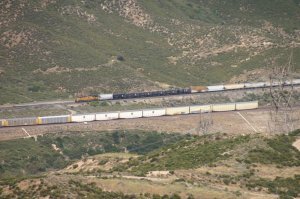 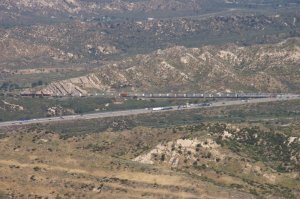 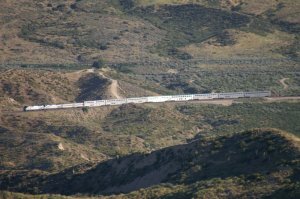 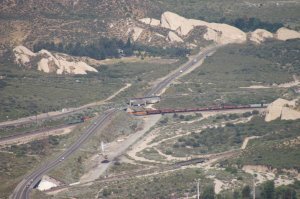 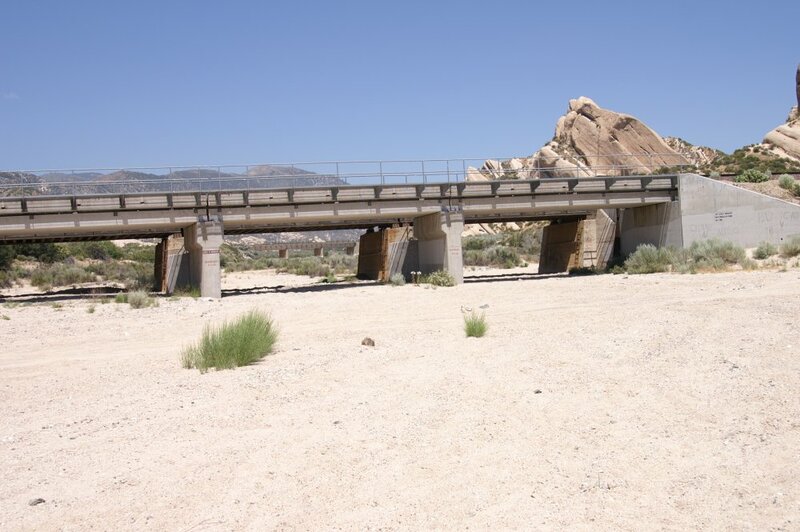 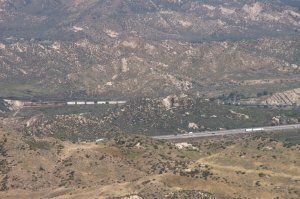 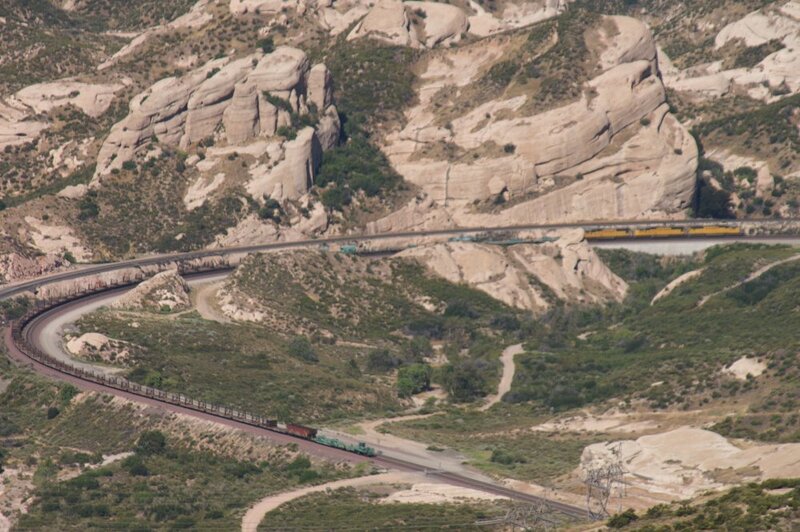 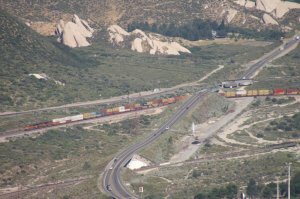 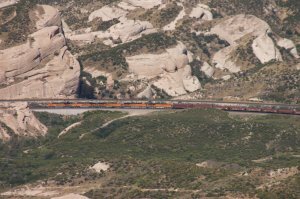 From this view, we can see all tracks going over Cajon Pass: Above is the UPT (Union Pacific) Colton Palmdale Cutoff which was built by SP in 1967. 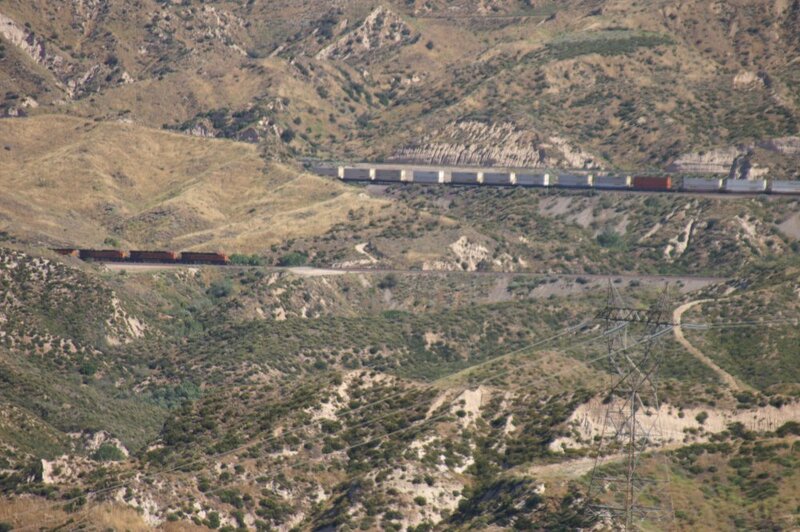 There is also a siding between left of Sullivans Curve and Highway 138 (even it looks like double track). 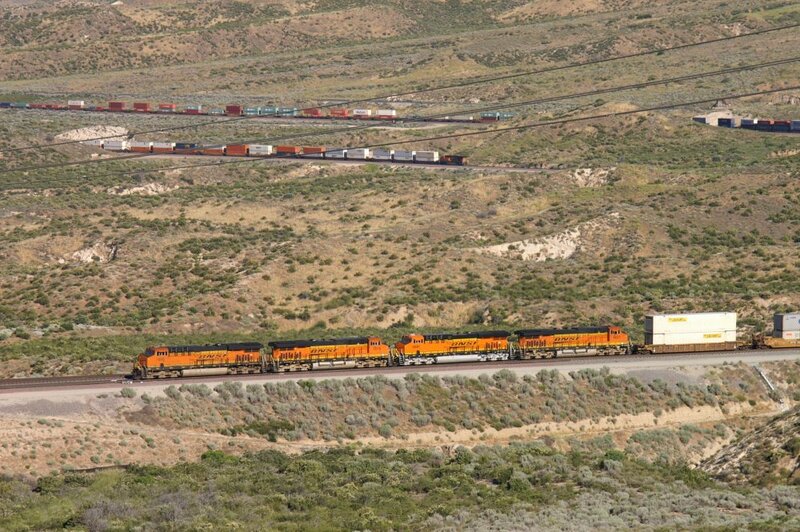 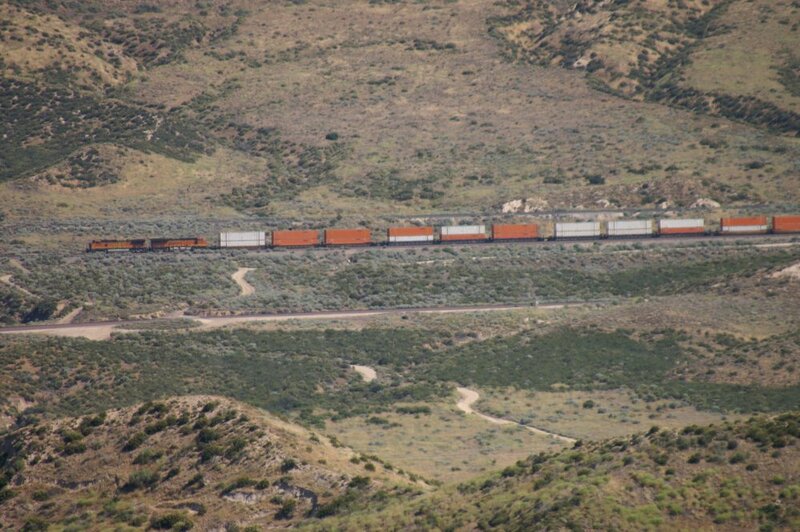 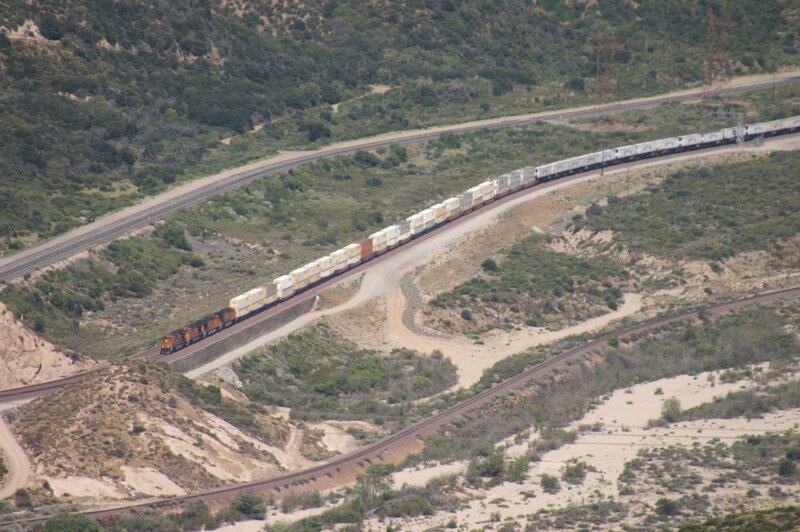 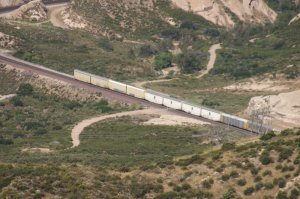 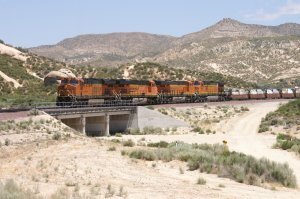 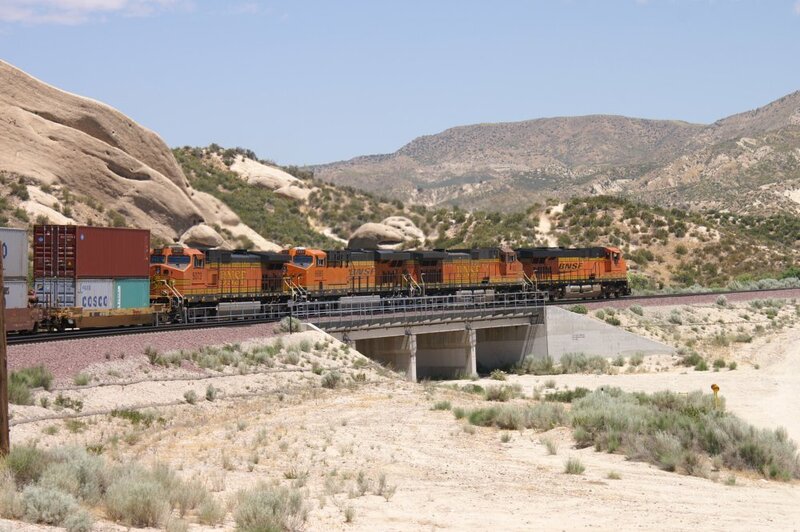 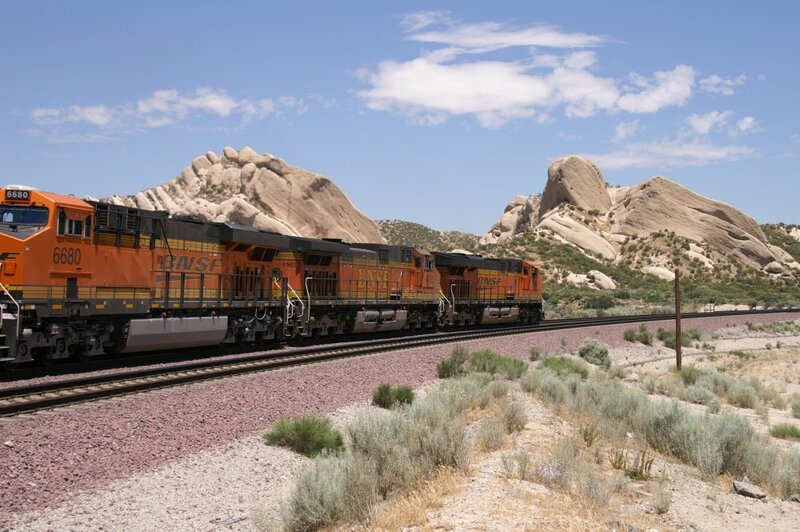 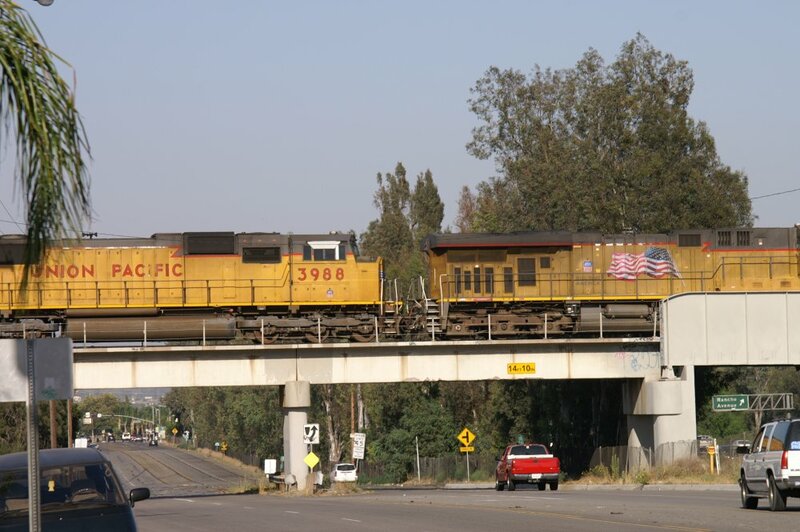 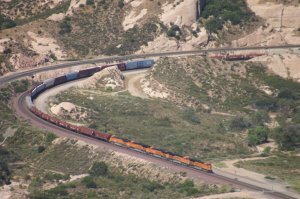 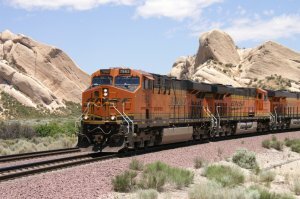 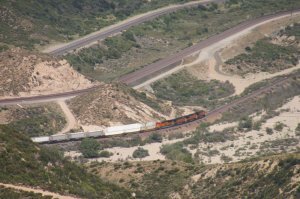 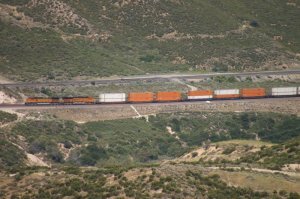 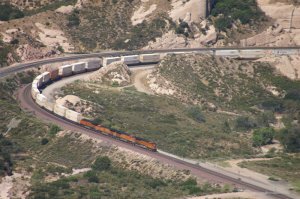 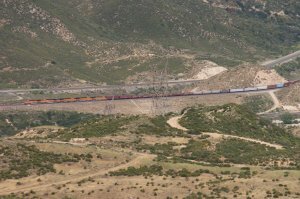 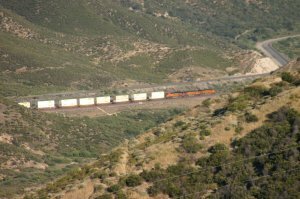 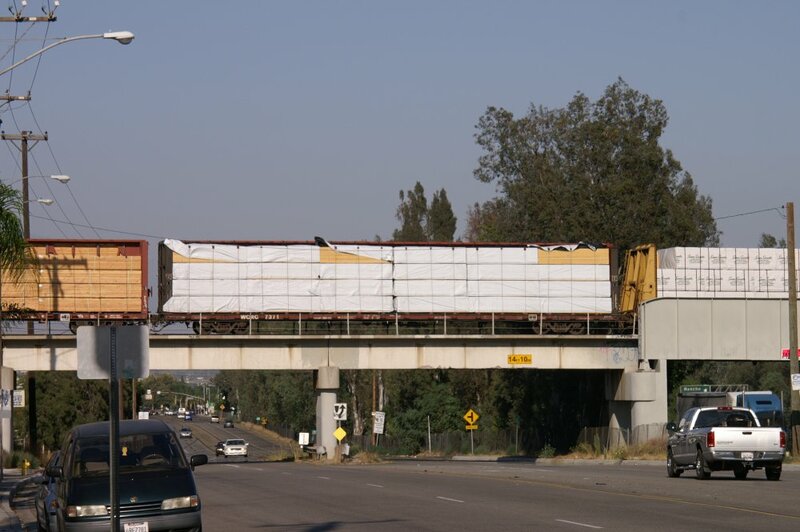 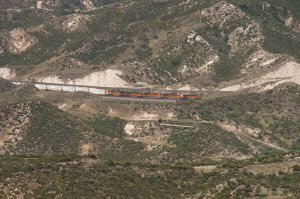 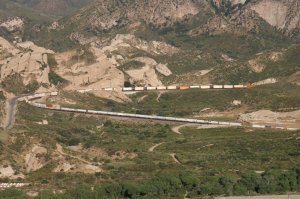 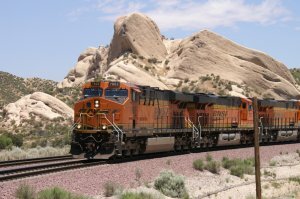 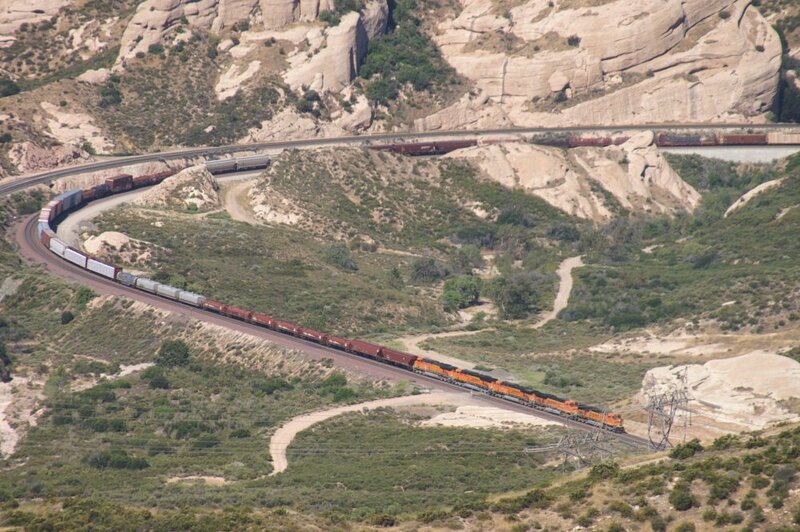 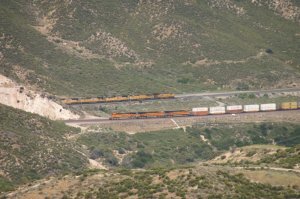 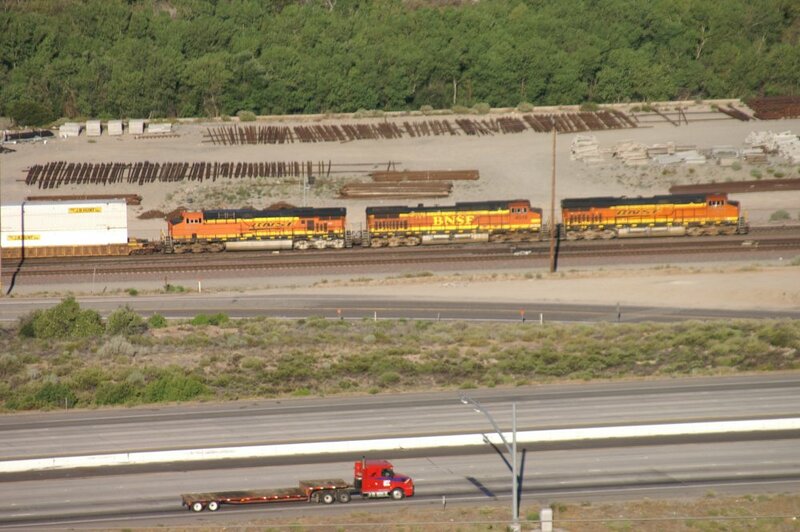 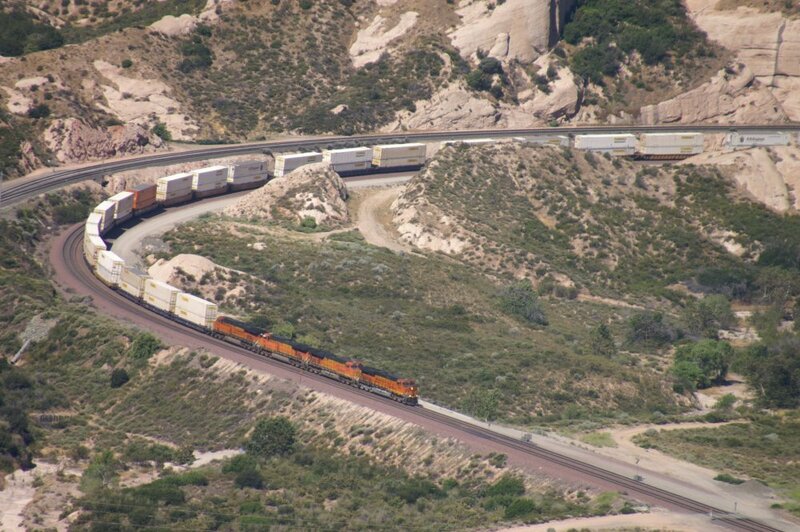 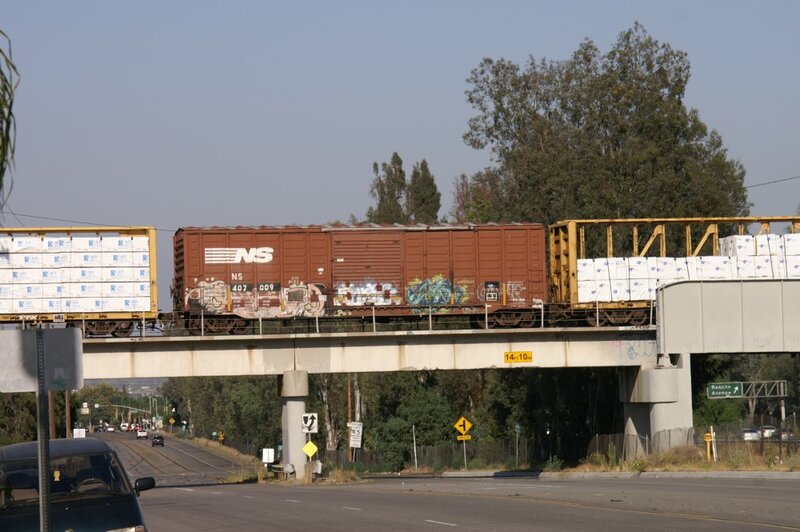 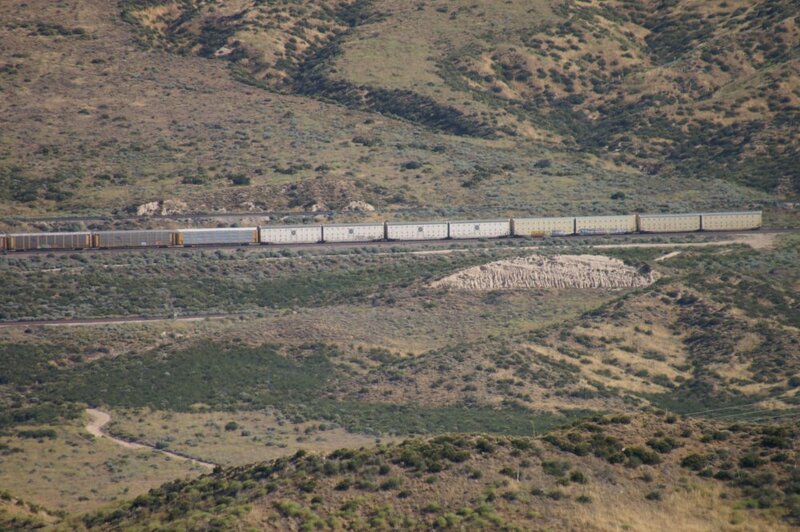 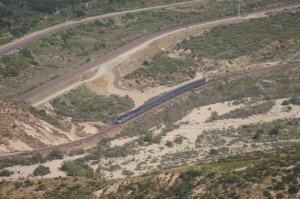 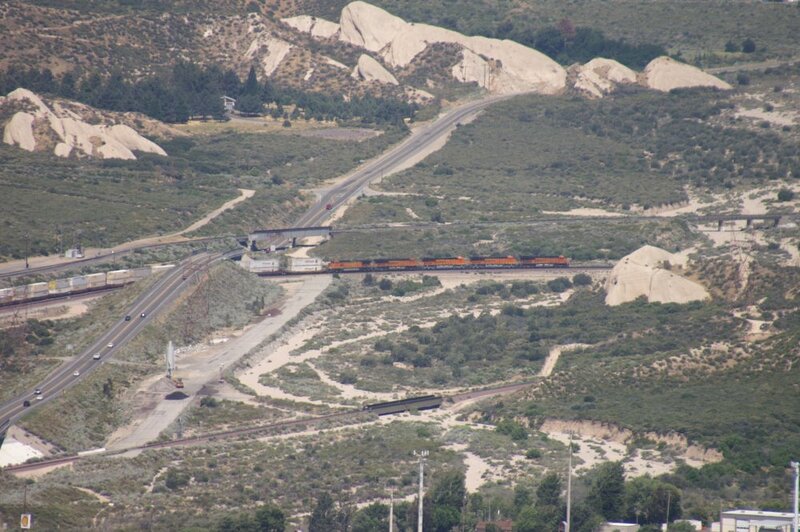 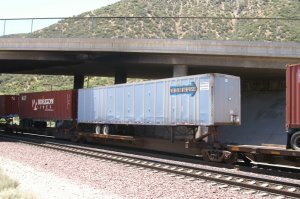 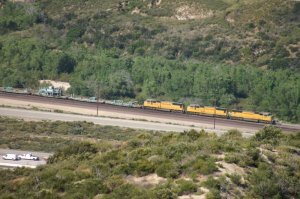 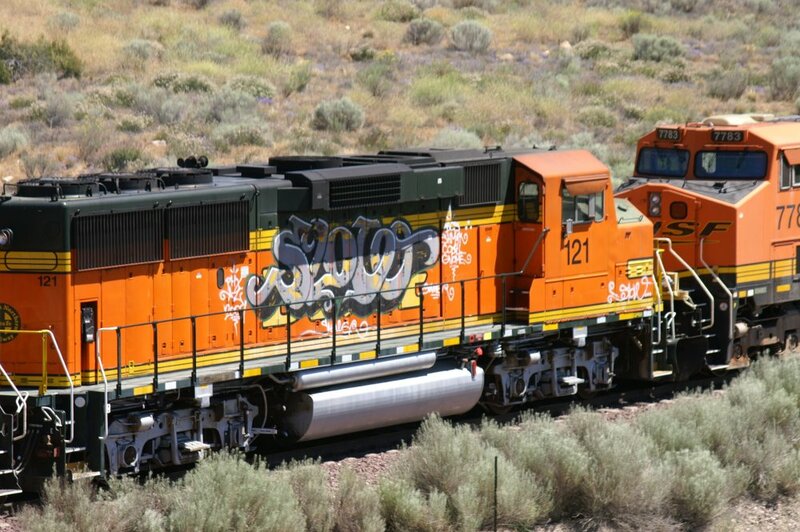 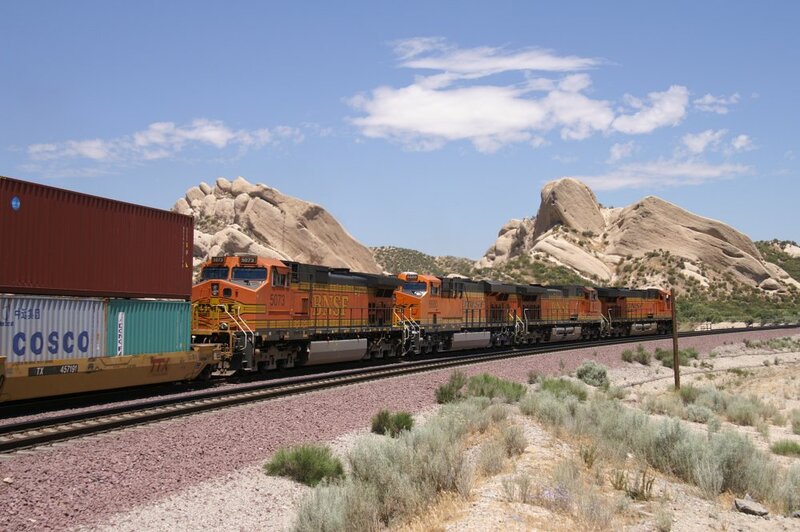 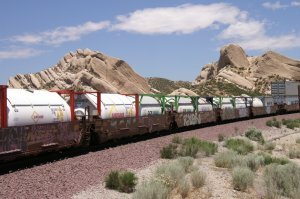 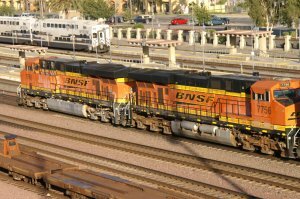 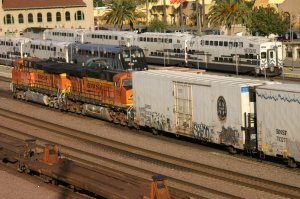 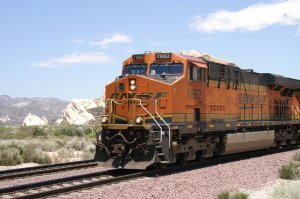 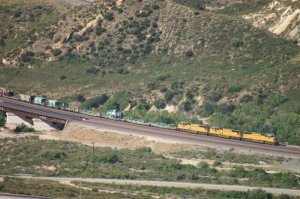 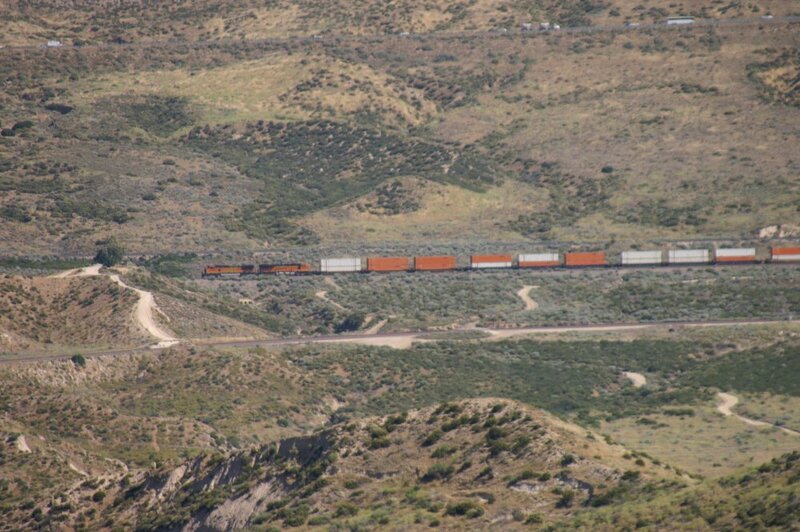 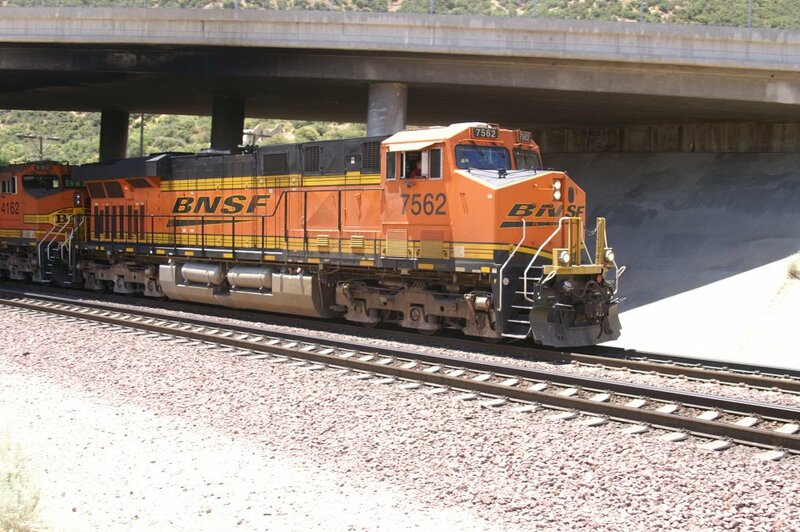 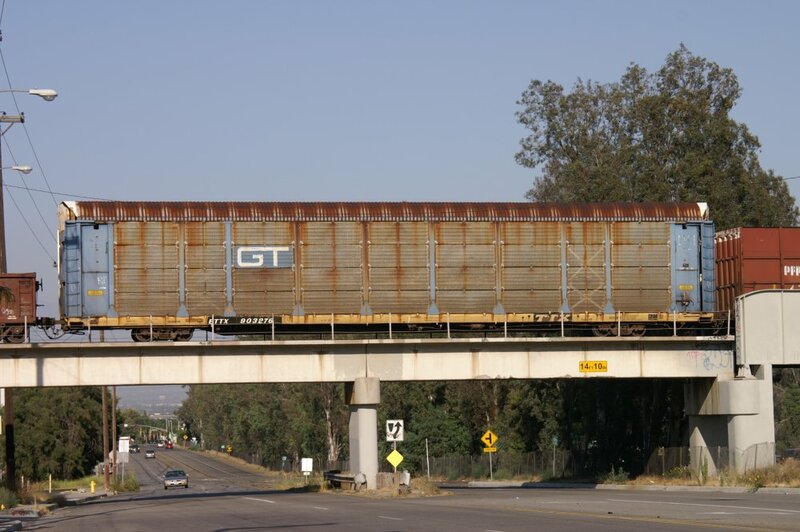 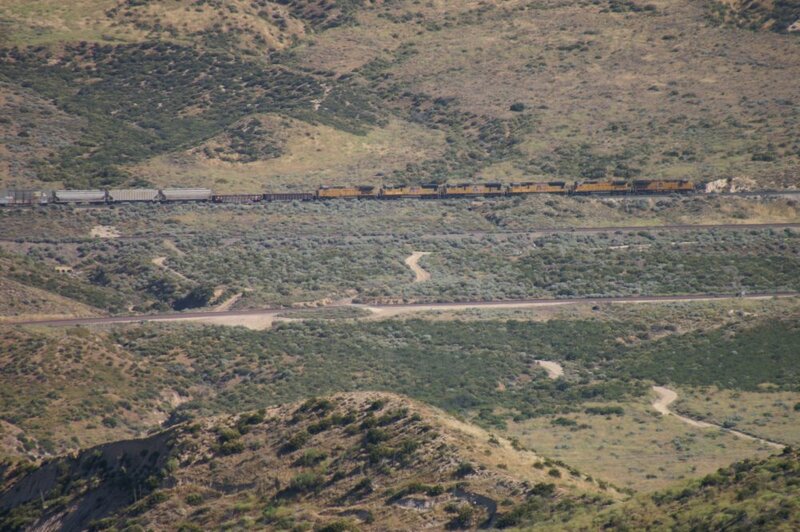 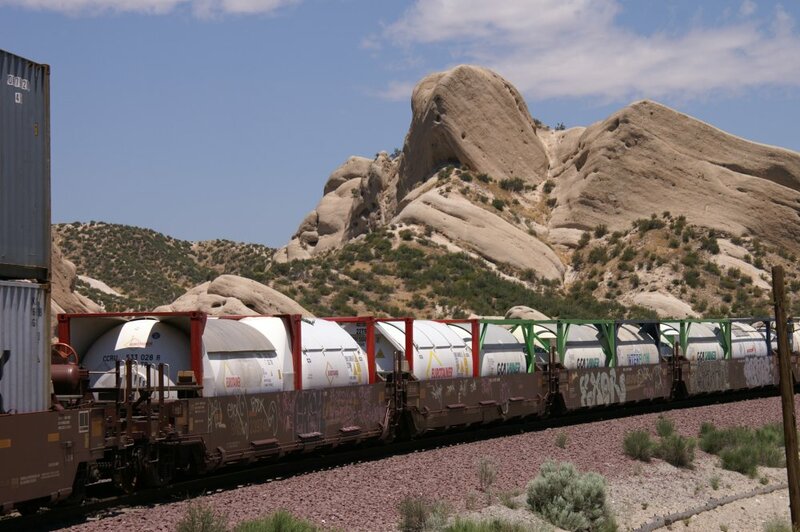 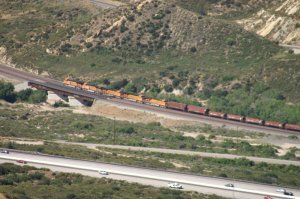 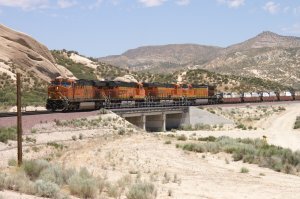 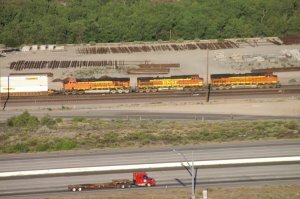 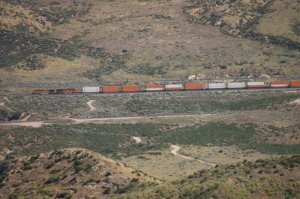 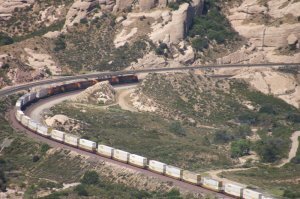 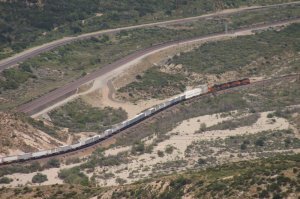 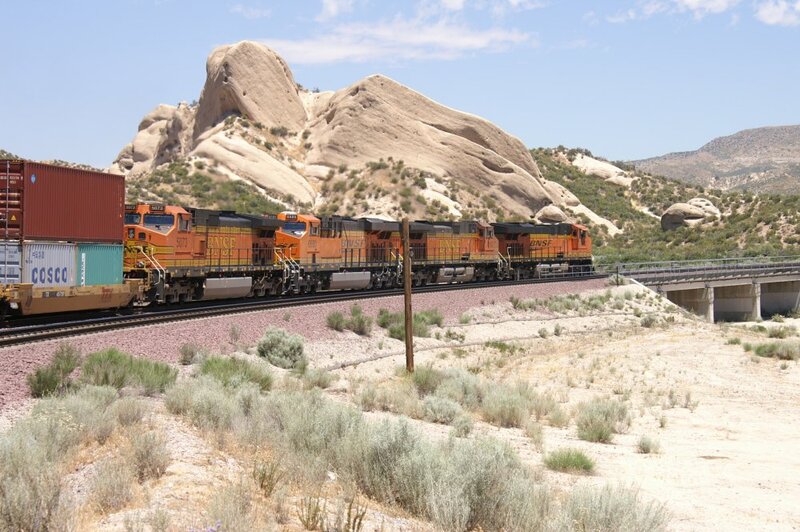 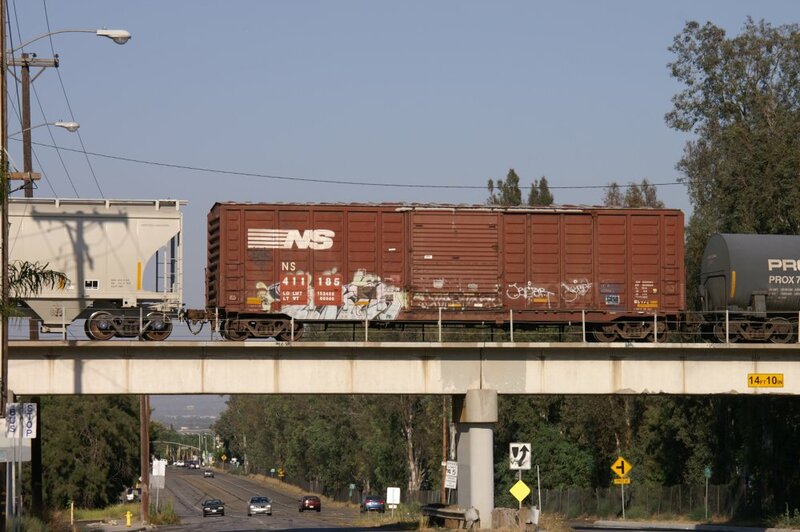 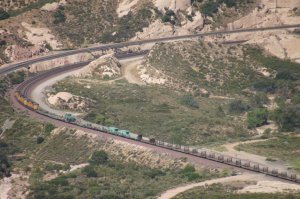 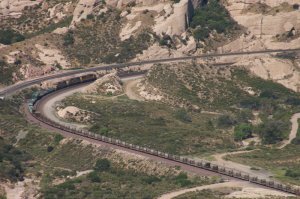 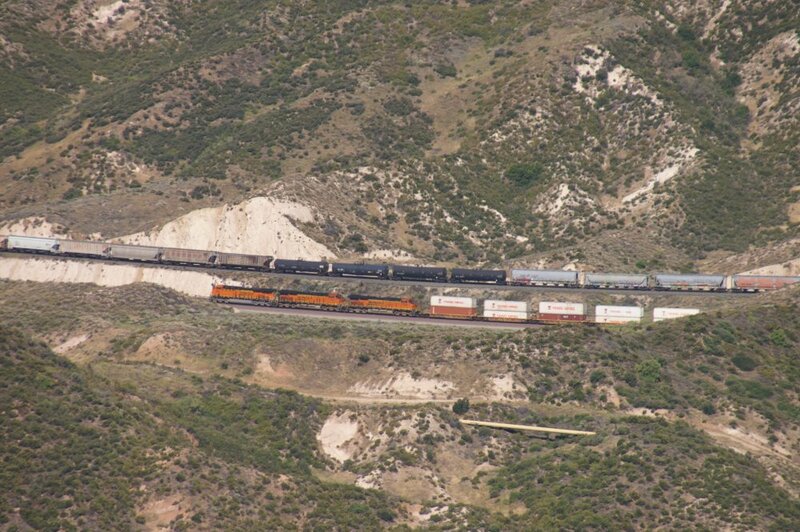 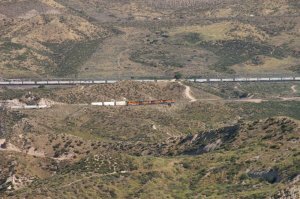 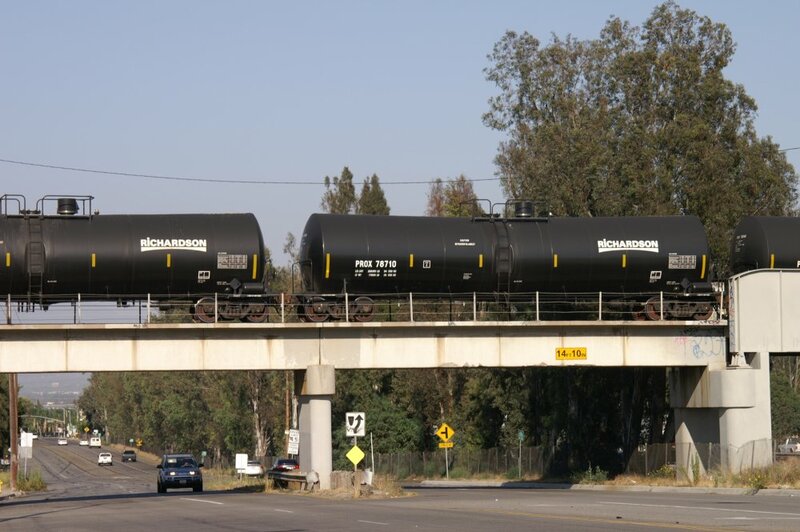 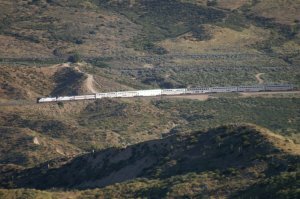 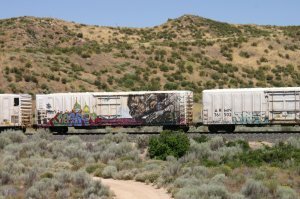 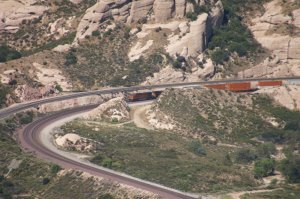 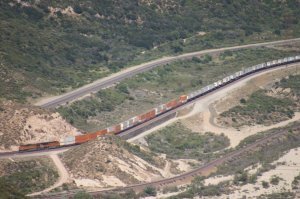 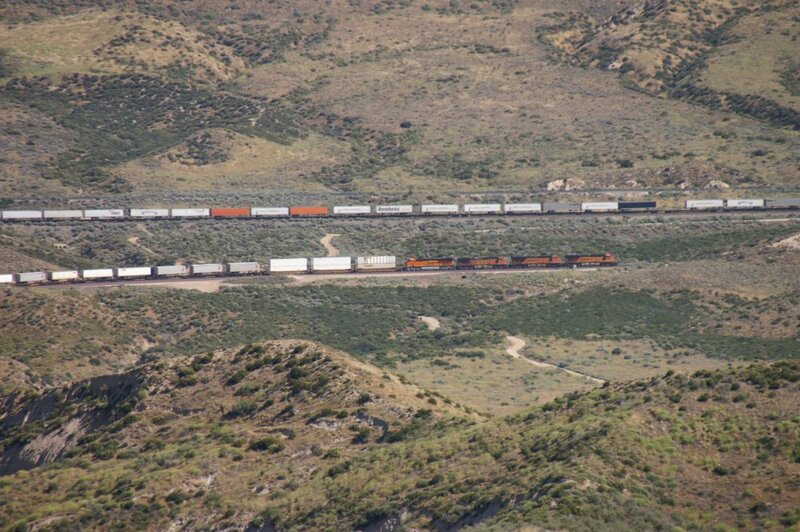 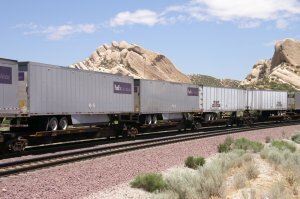 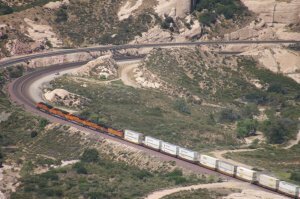 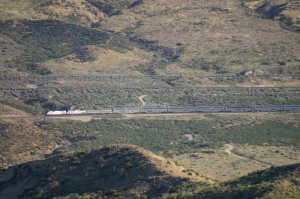 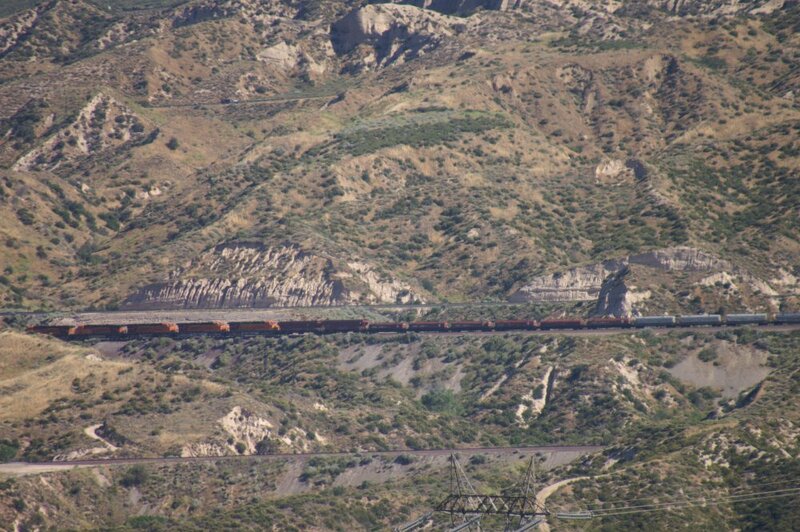 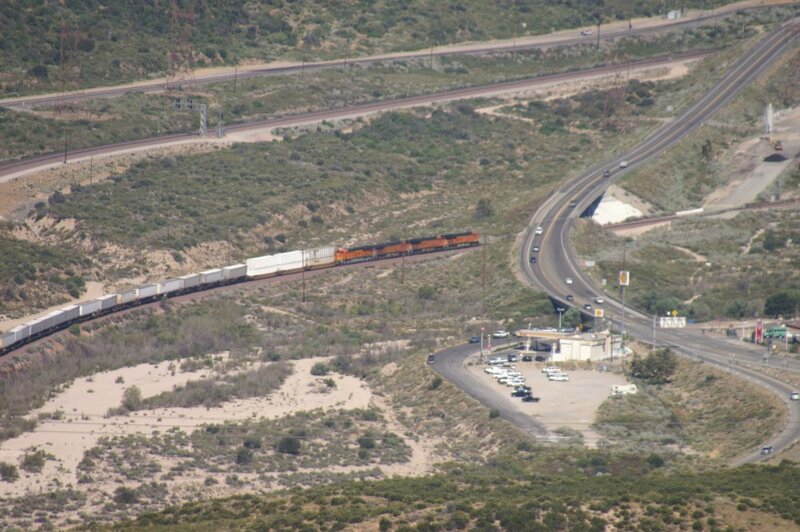 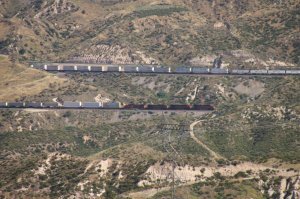 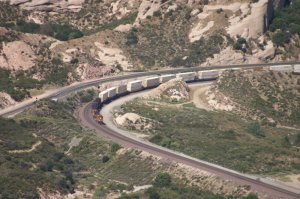 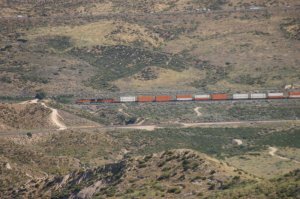 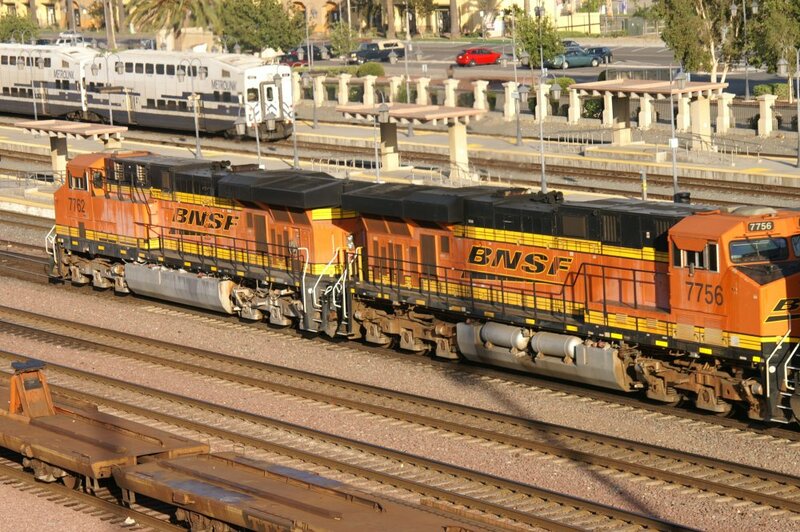 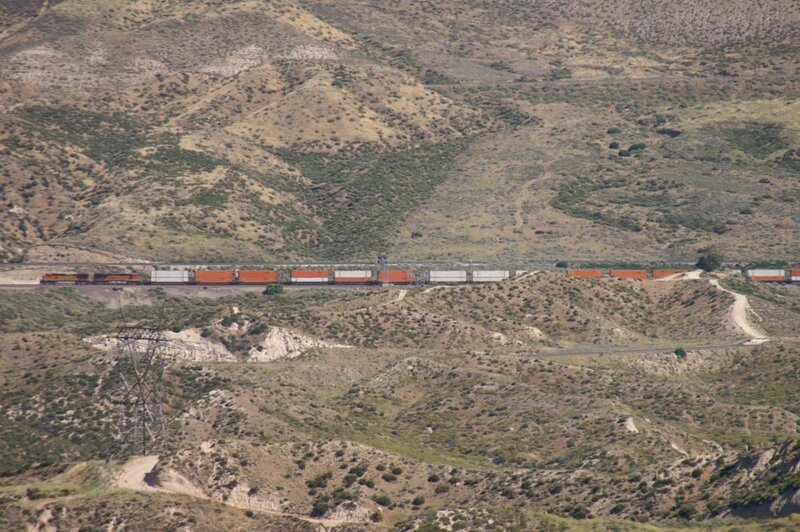 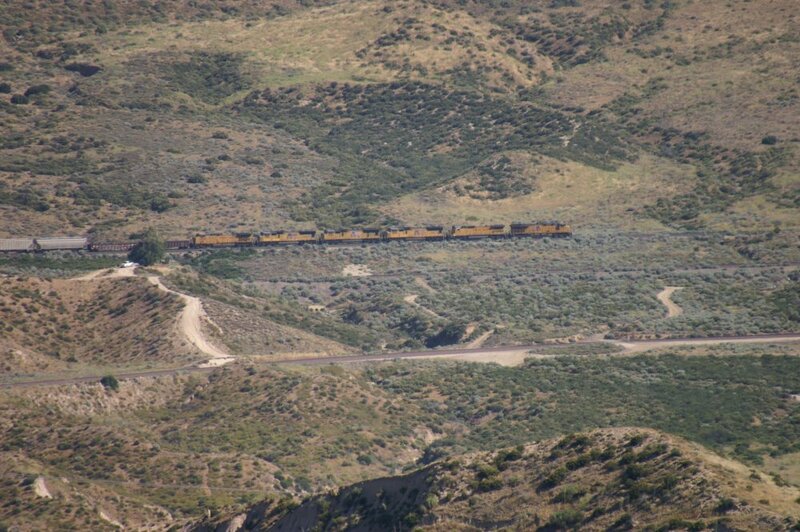 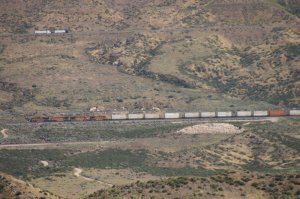 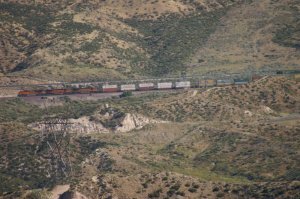 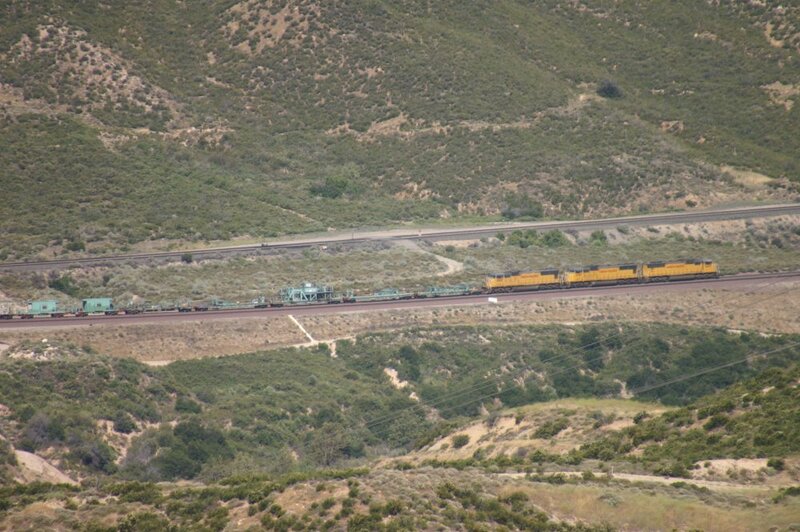 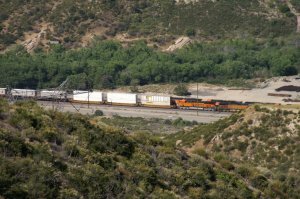 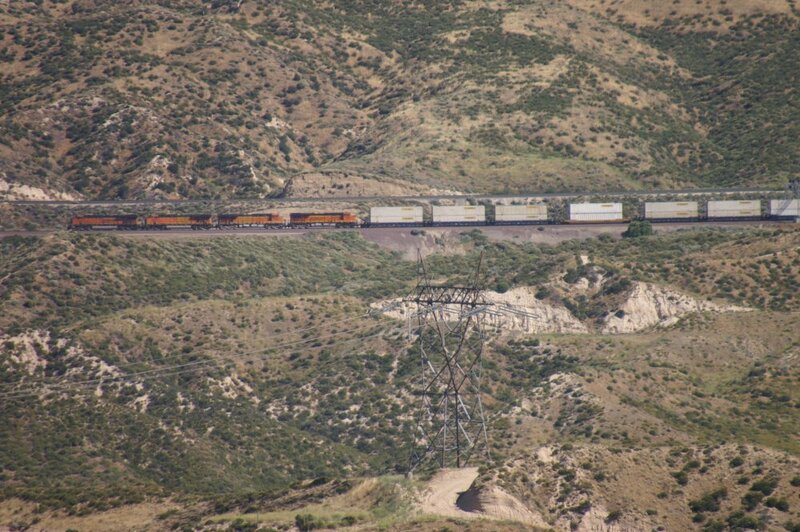 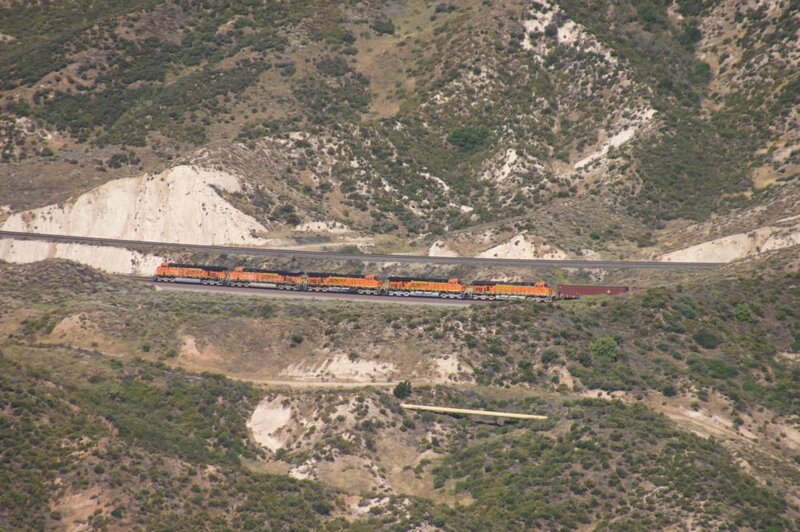 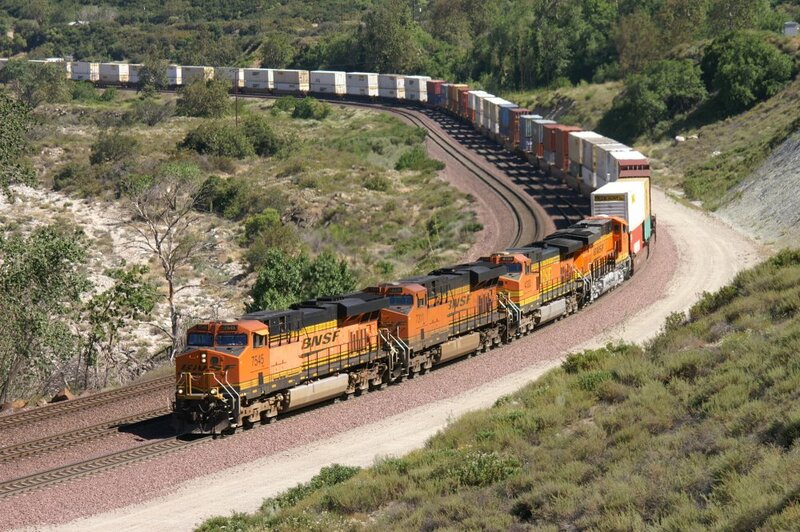 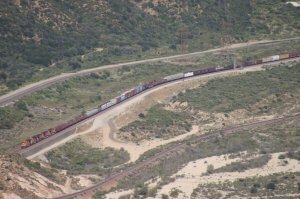 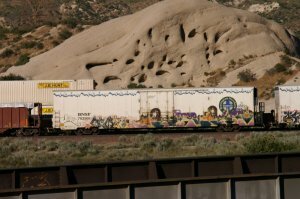 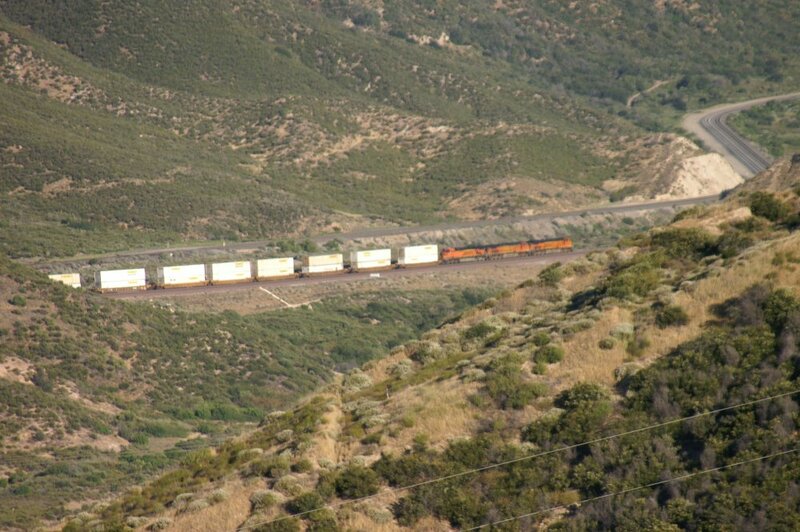 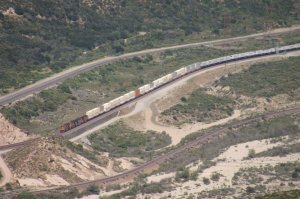 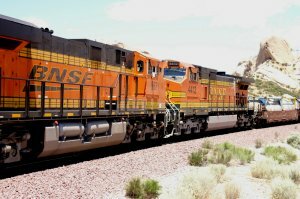 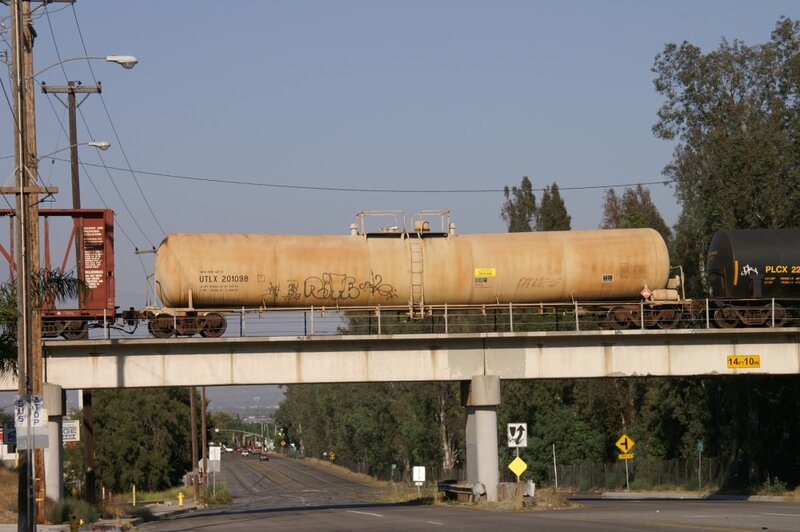 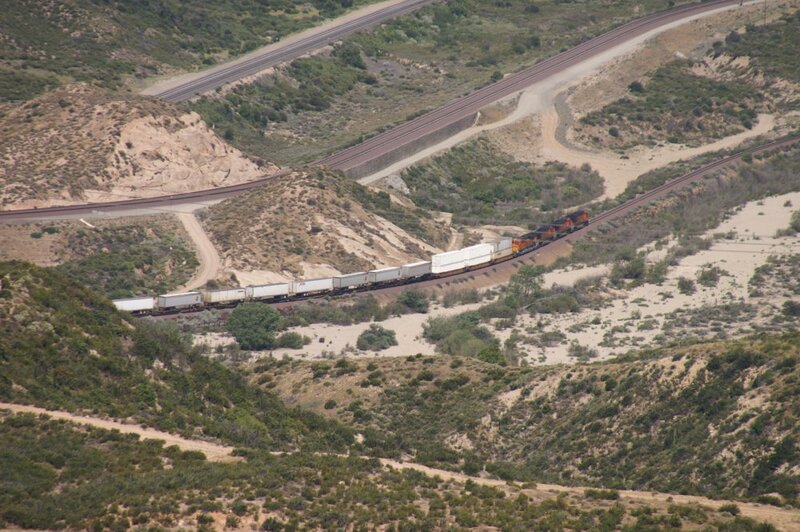 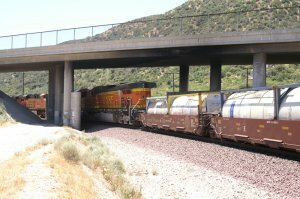 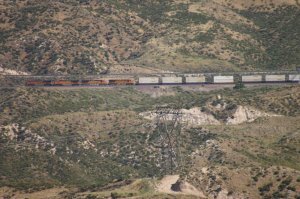 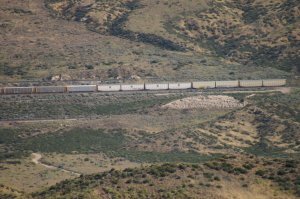 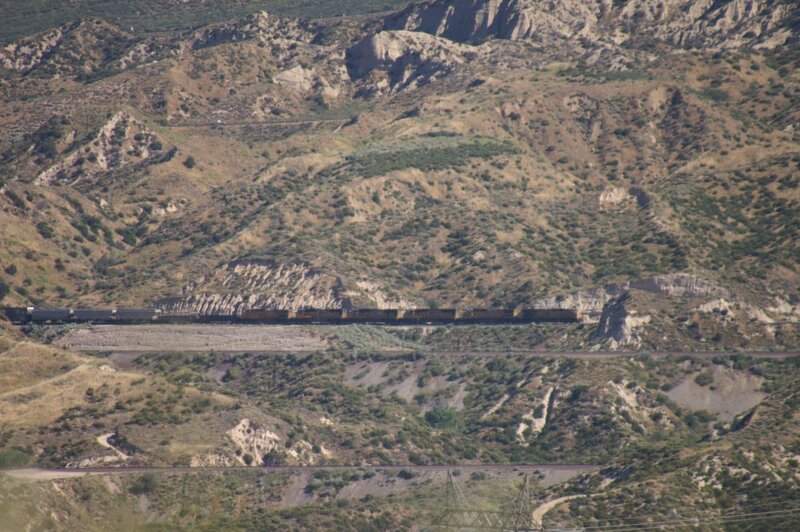 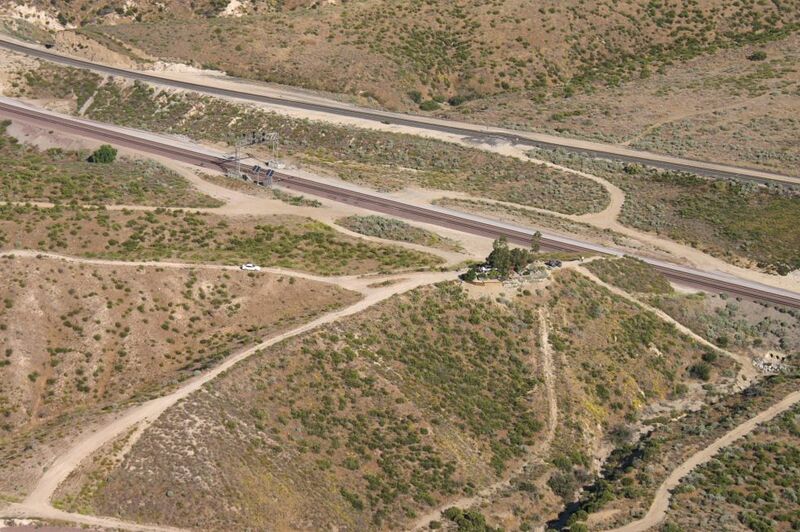 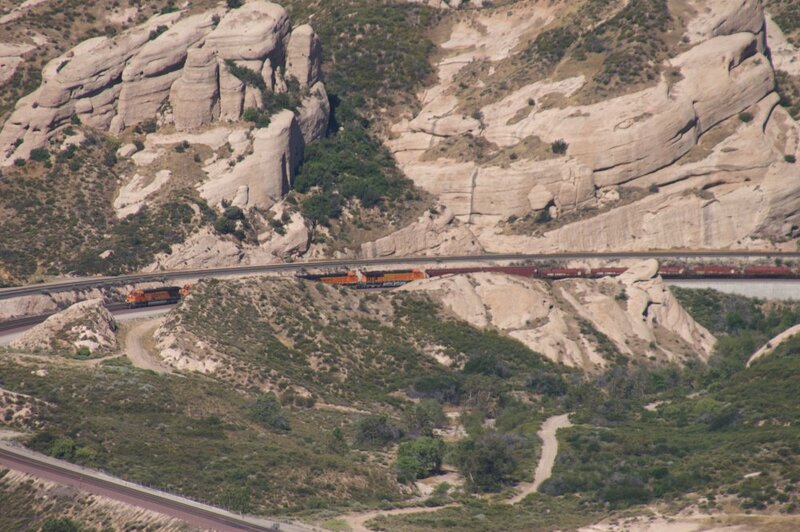 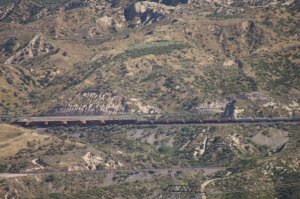 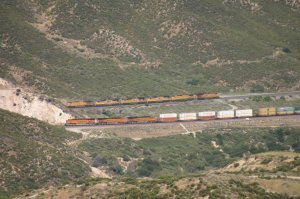 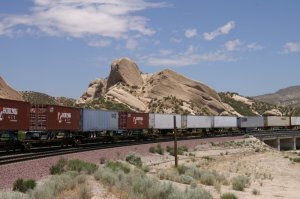 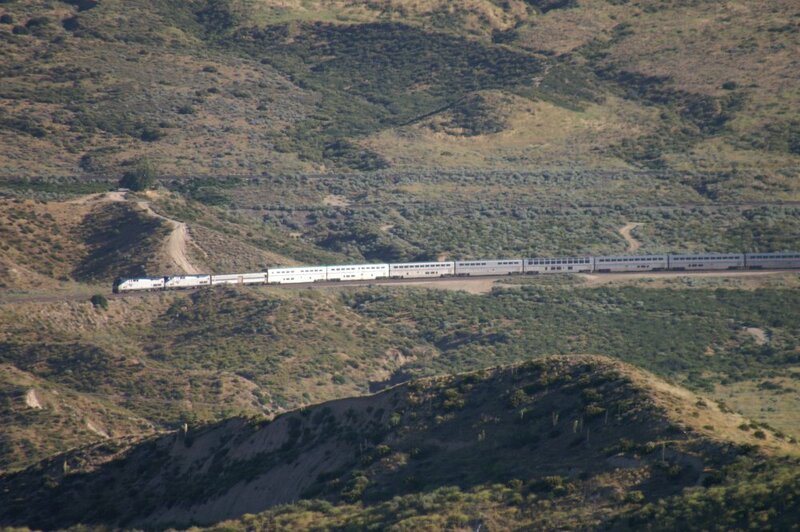 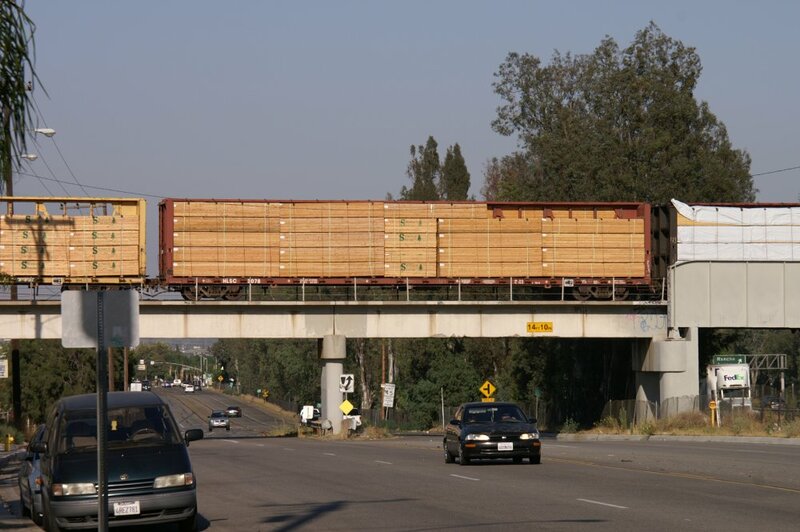 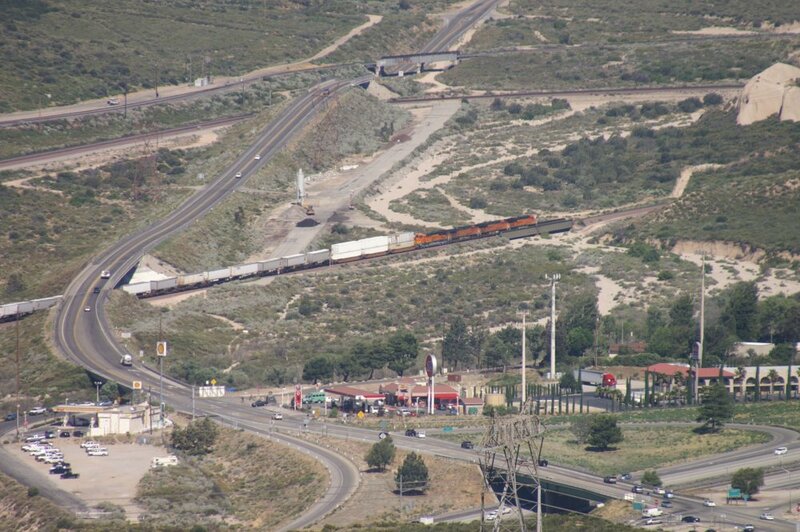 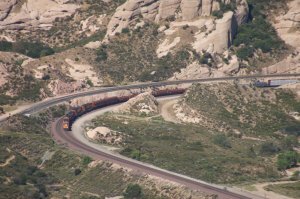 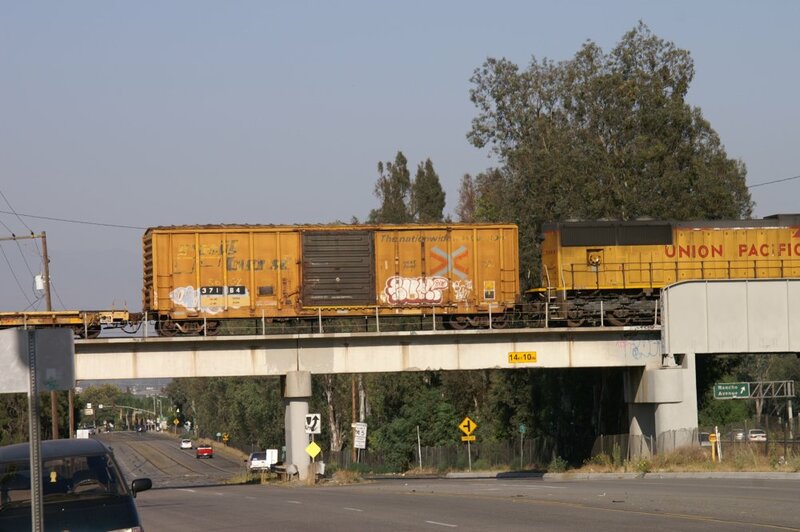 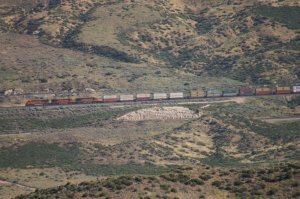 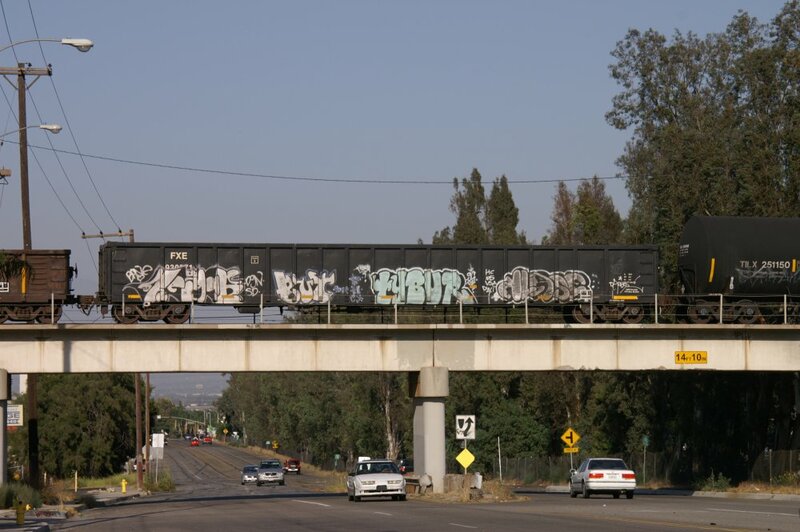 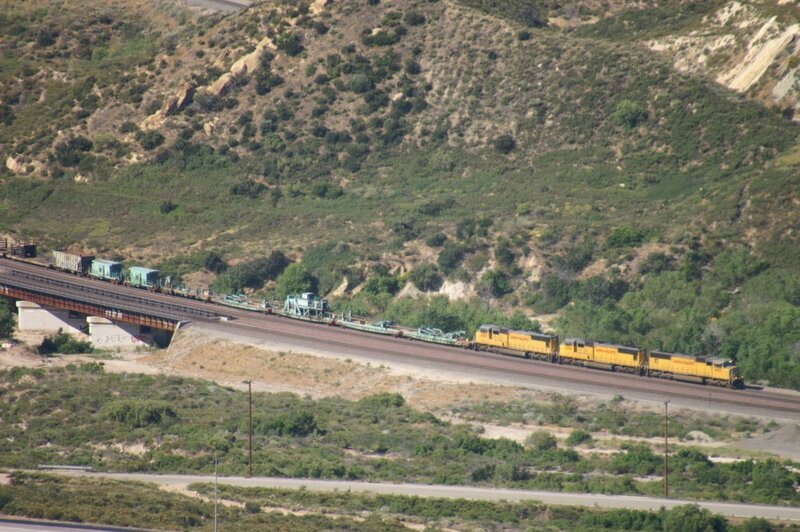 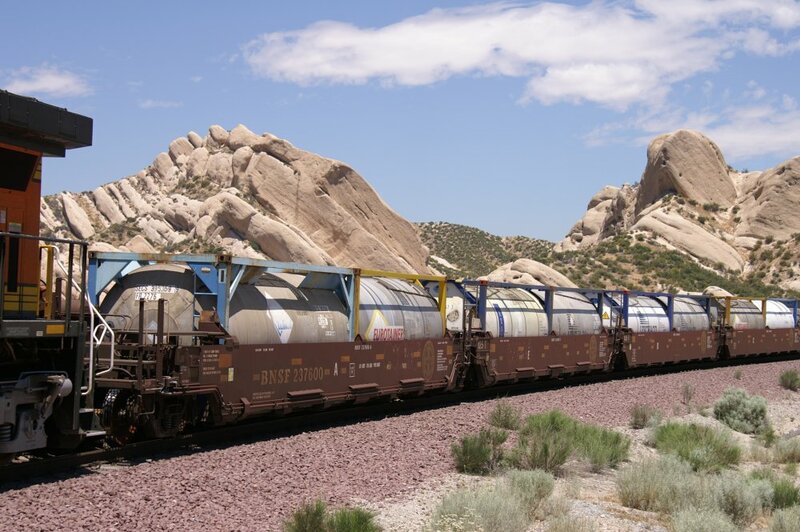 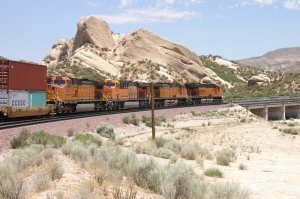 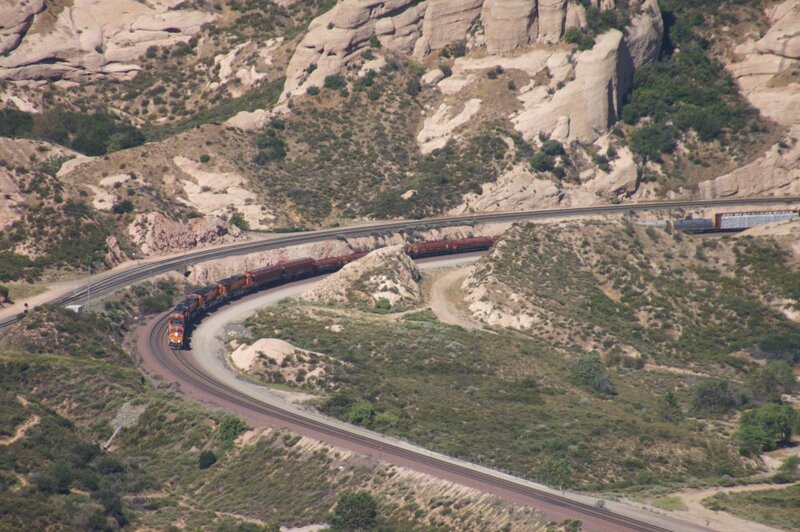 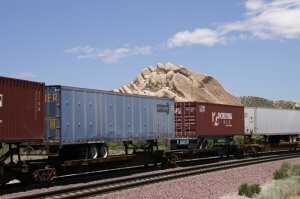 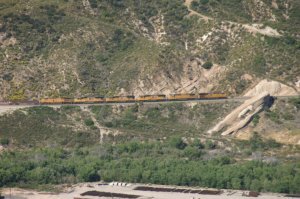 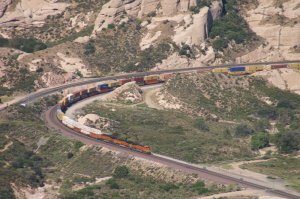 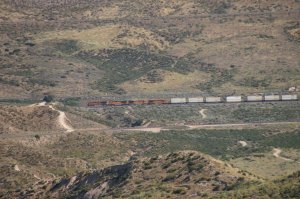 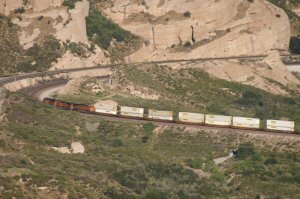 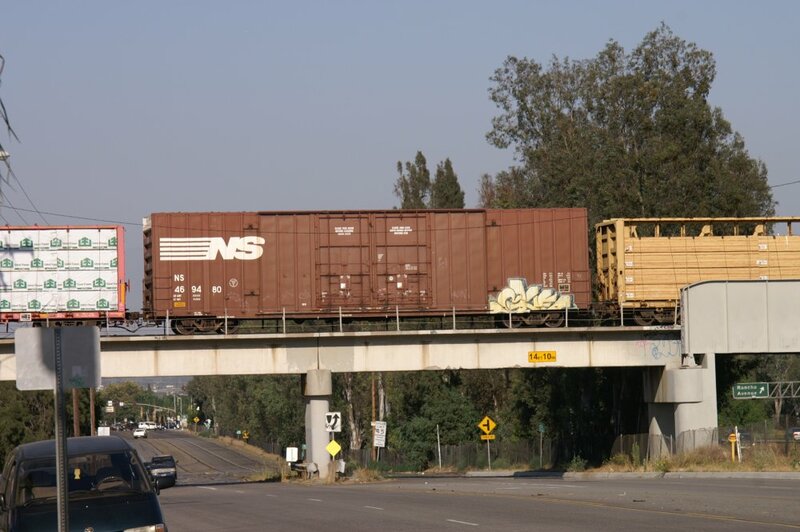 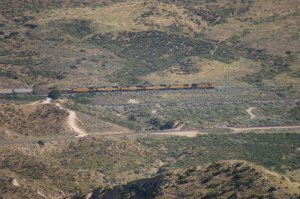 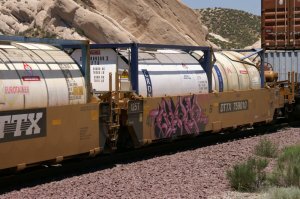 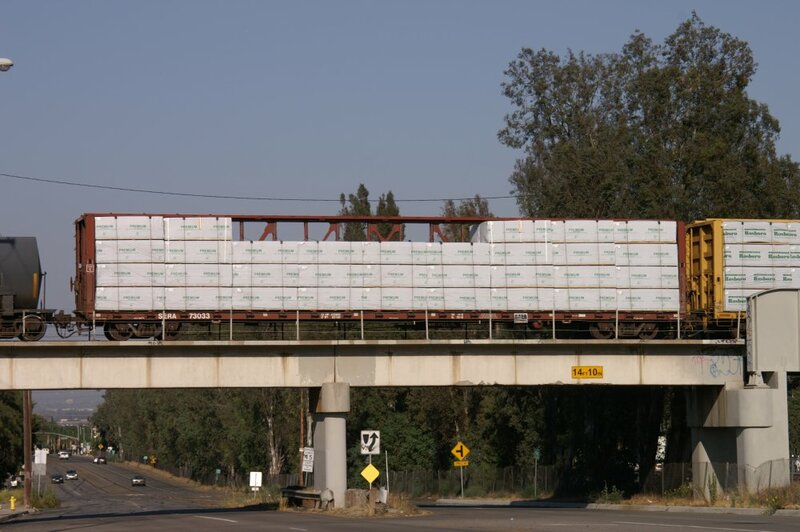 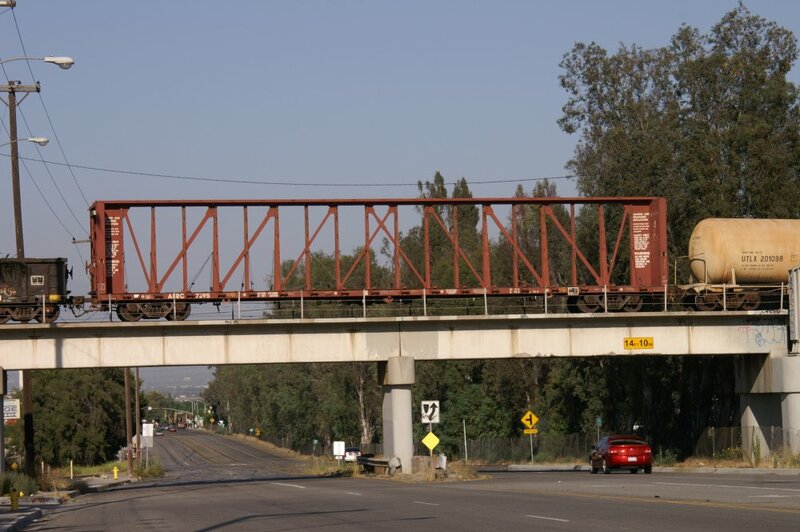 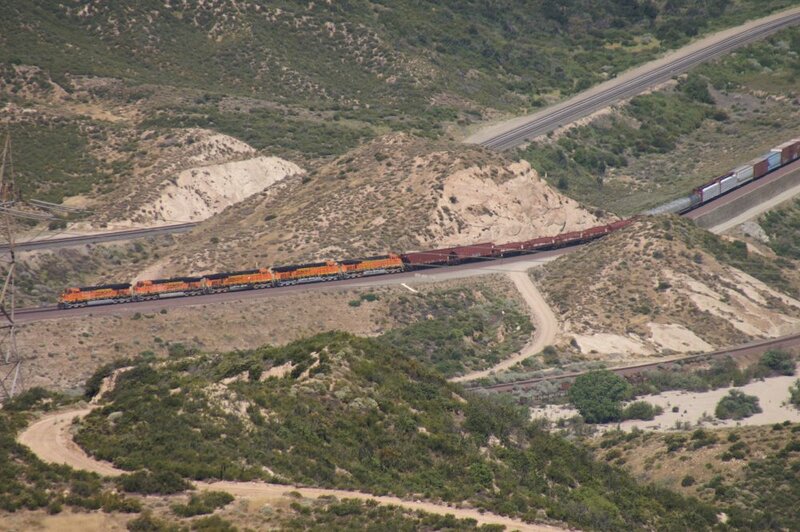 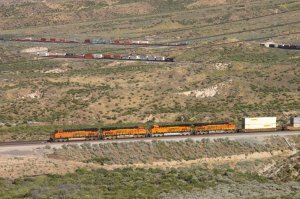 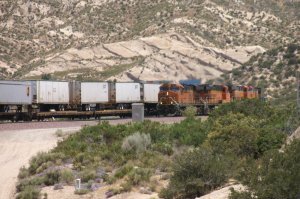 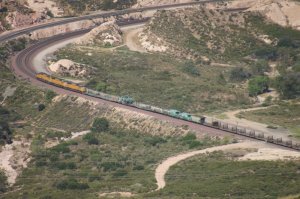 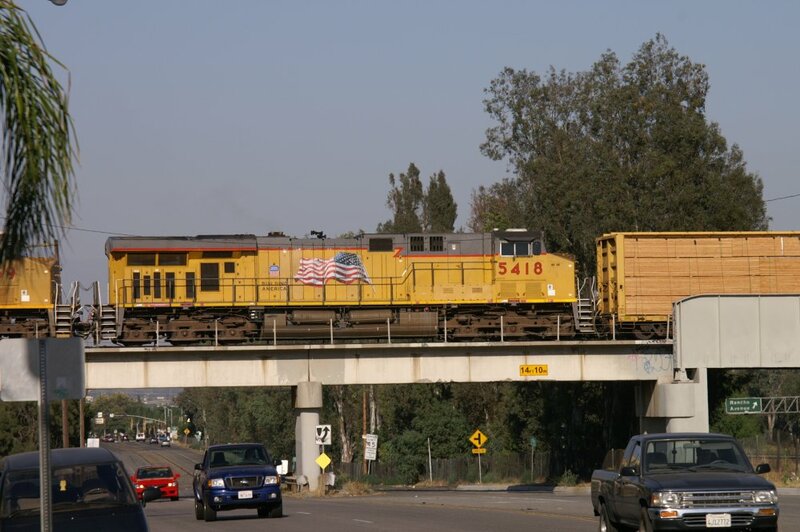 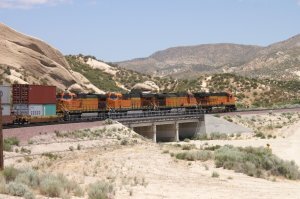 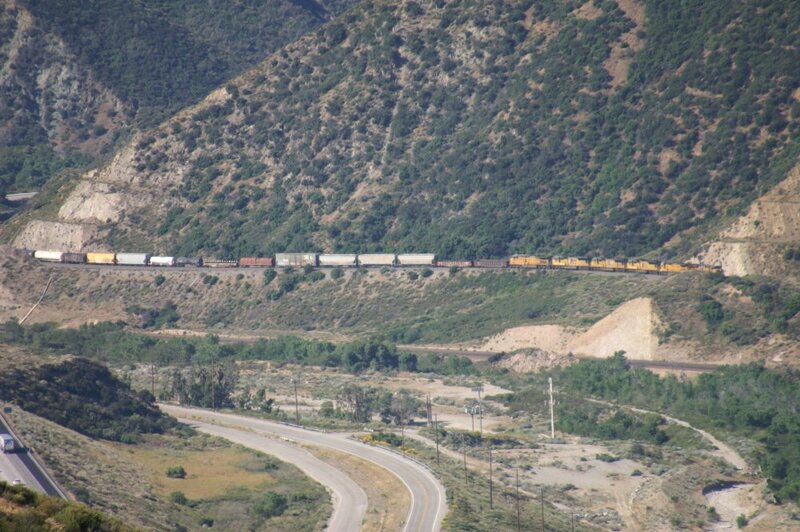 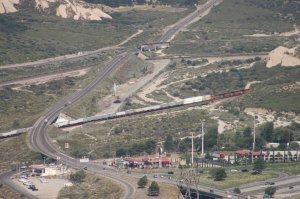 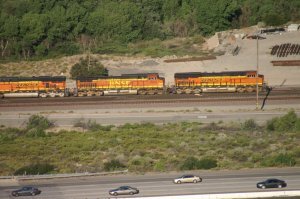 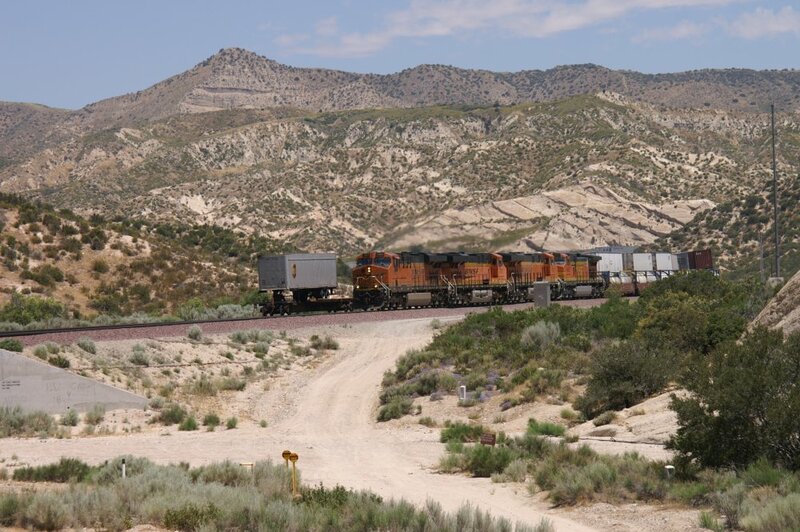 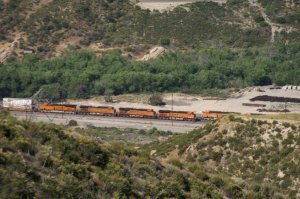 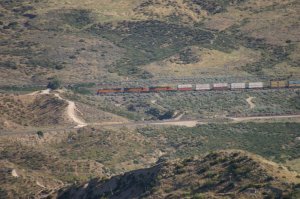 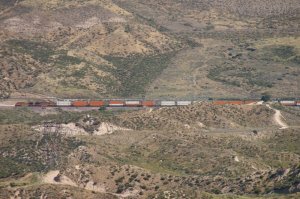 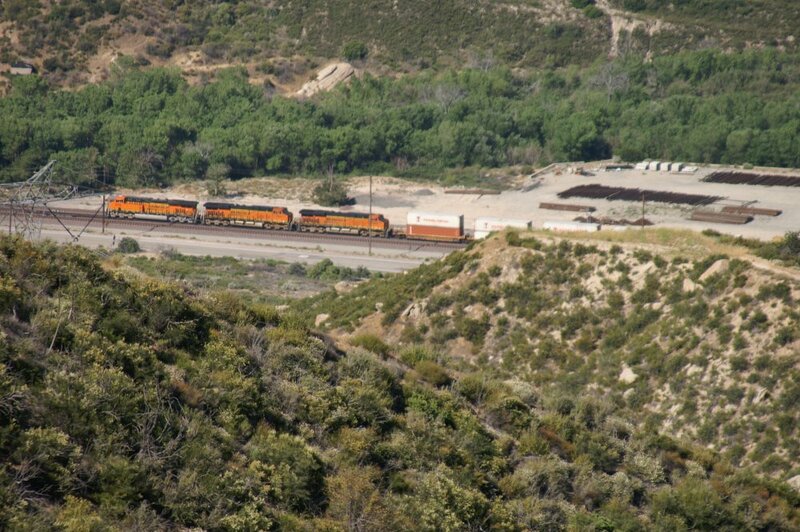 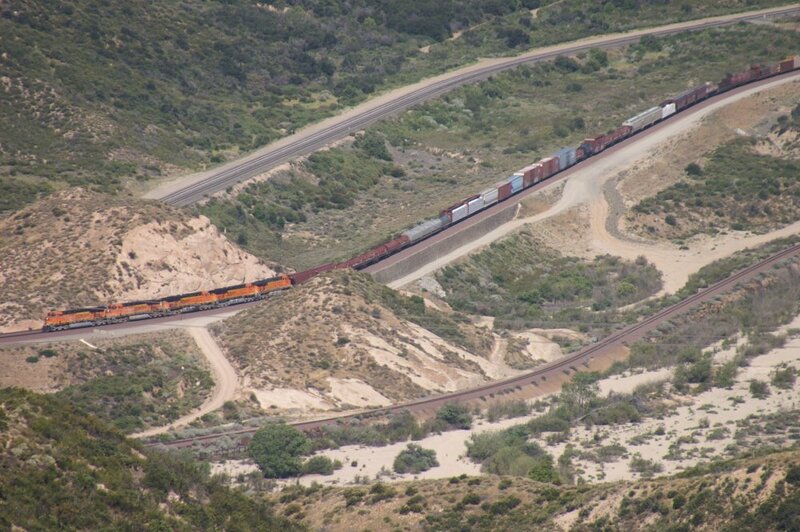 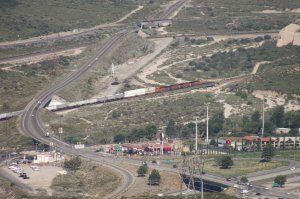 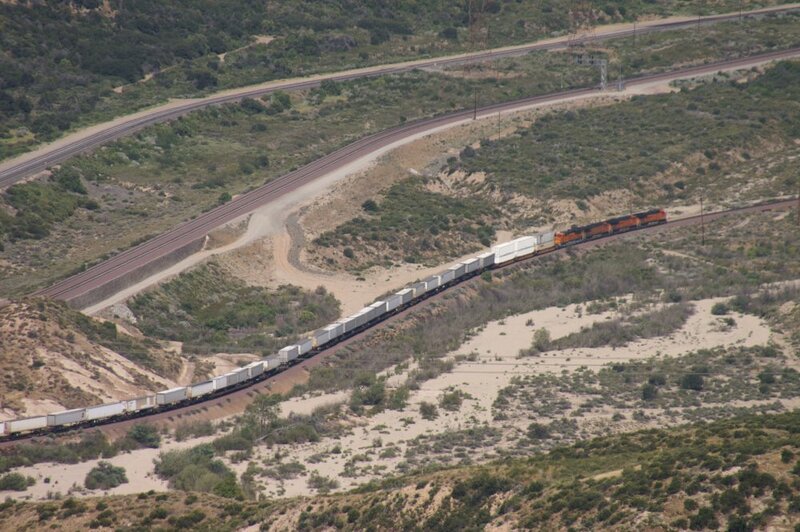 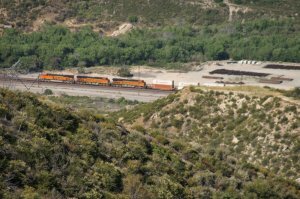 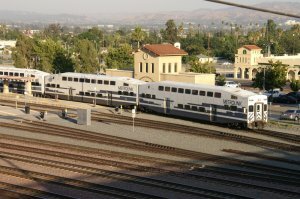 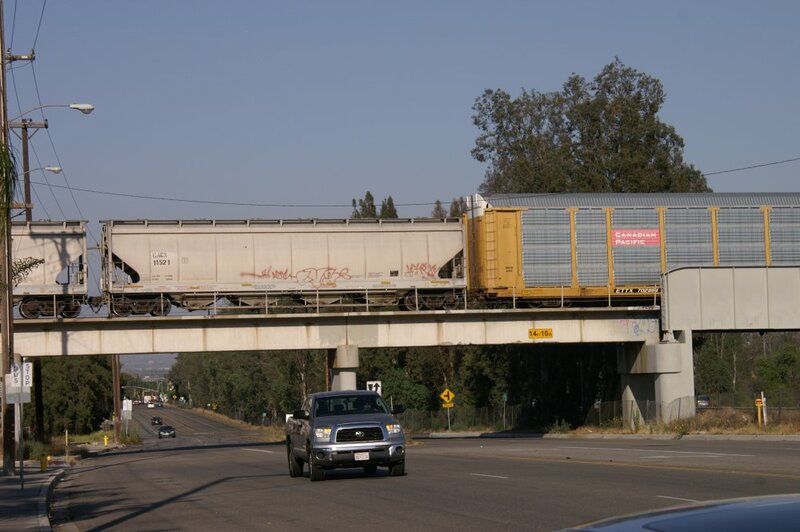 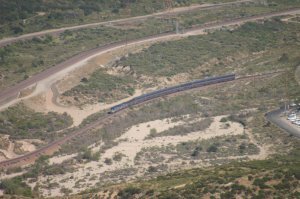 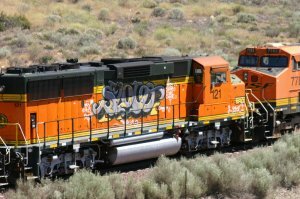 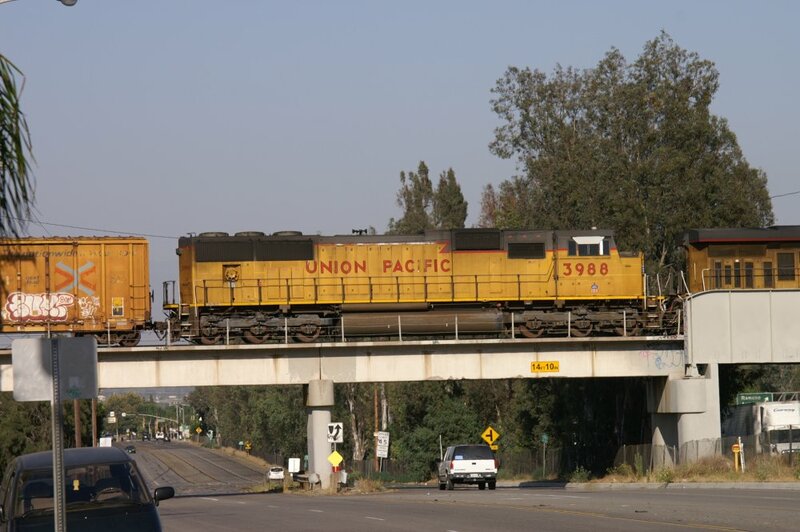 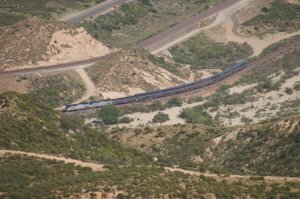 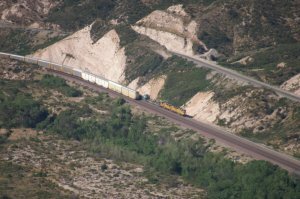 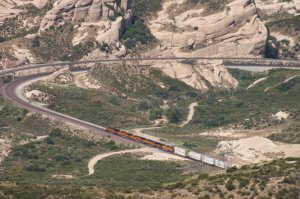 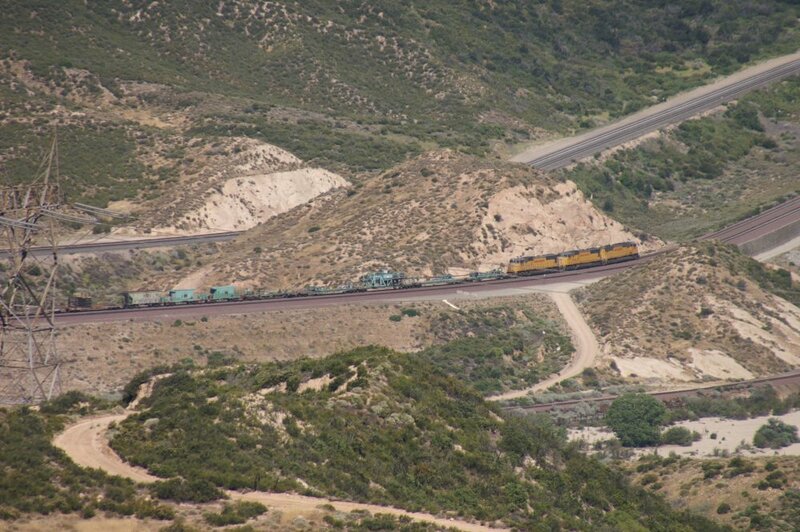 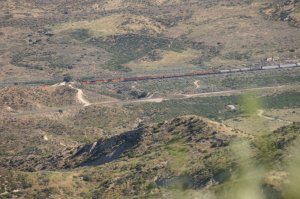 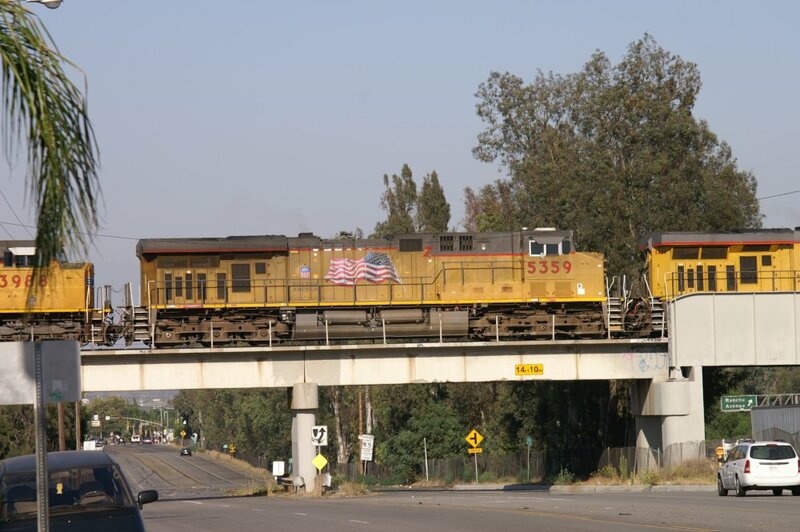 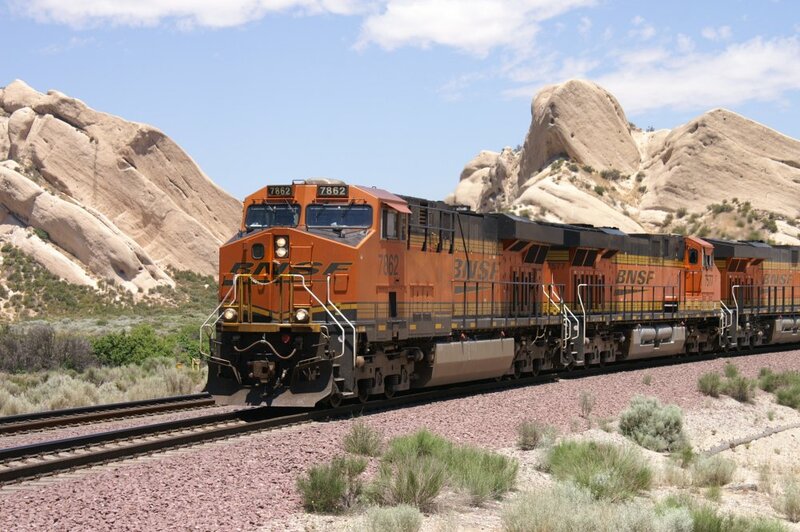 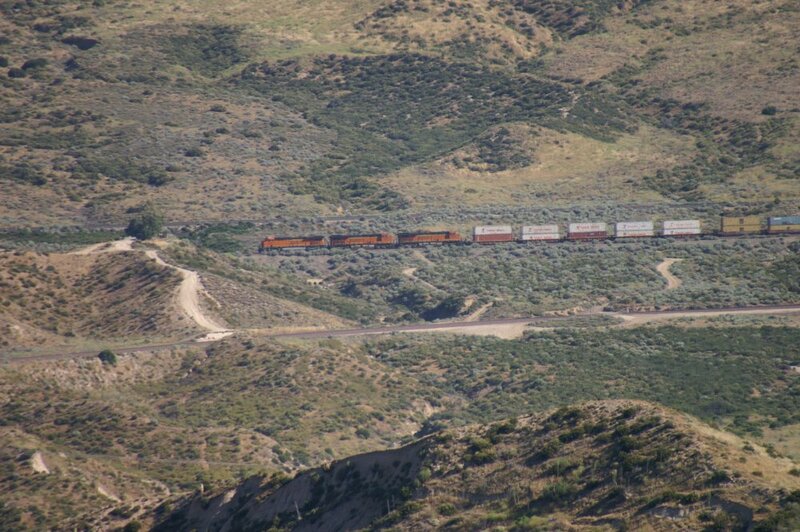 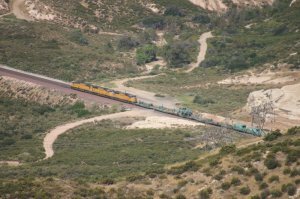 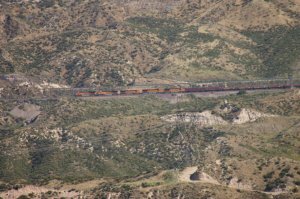 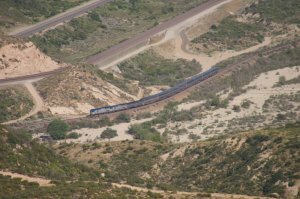 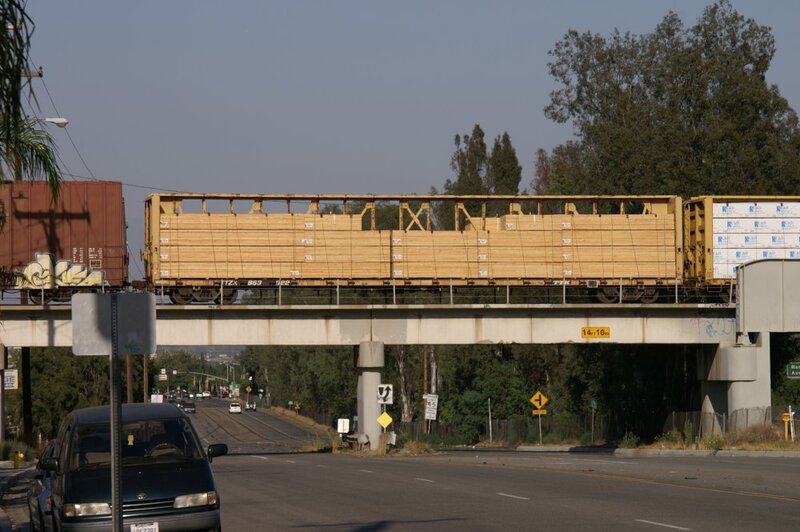 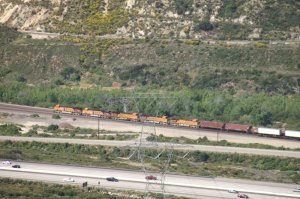 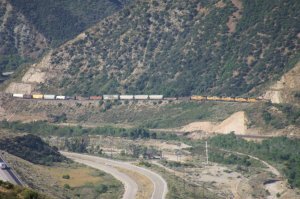 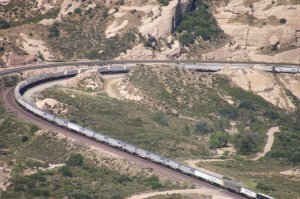 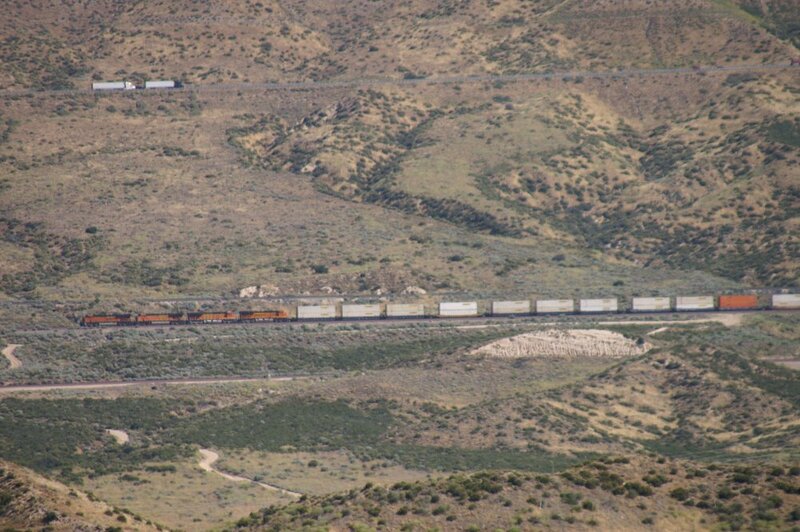 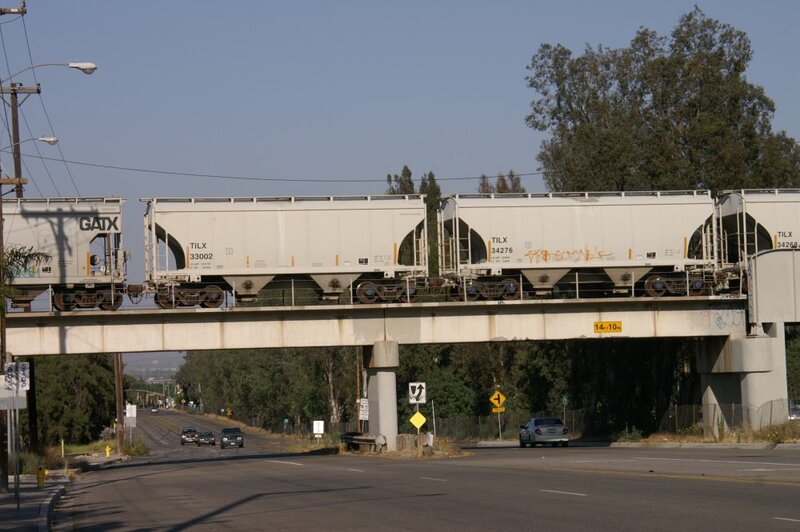 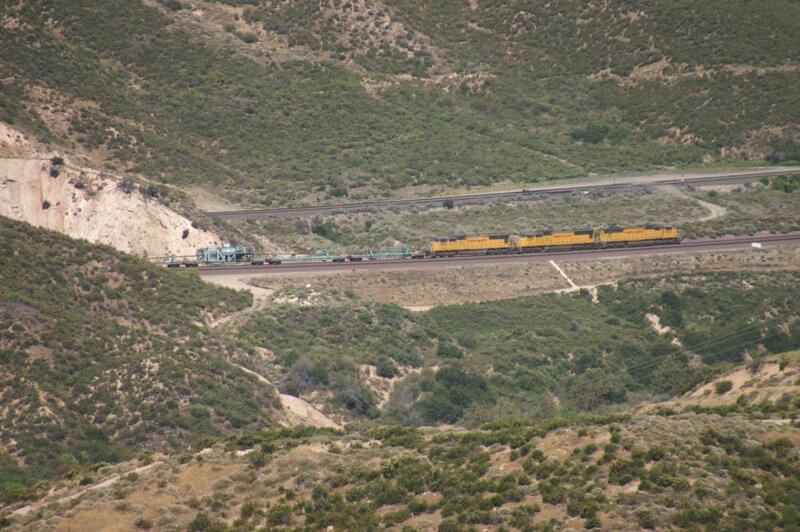 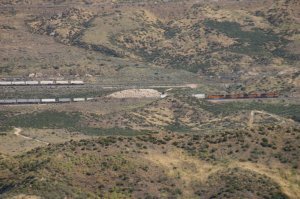 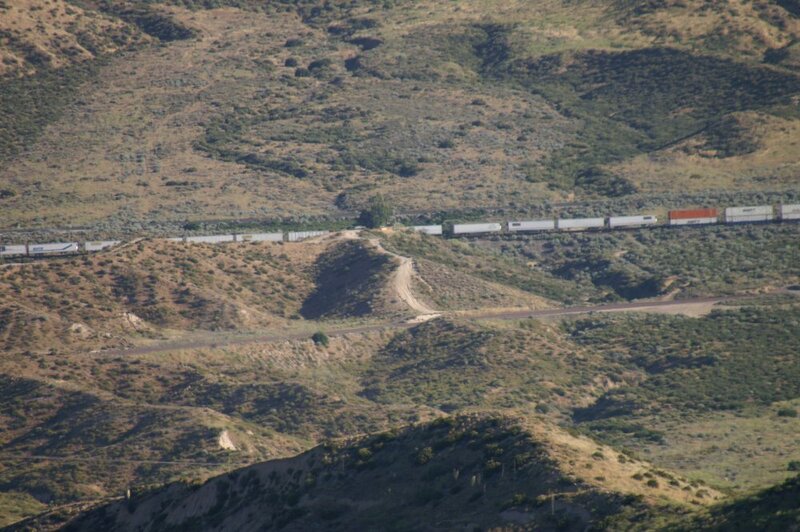 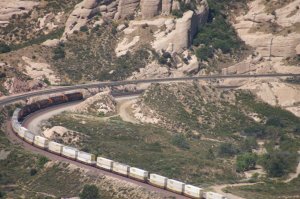 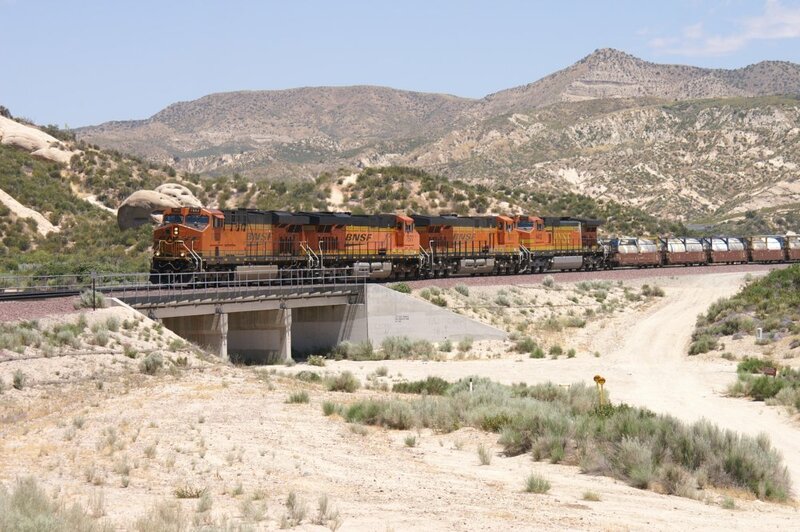 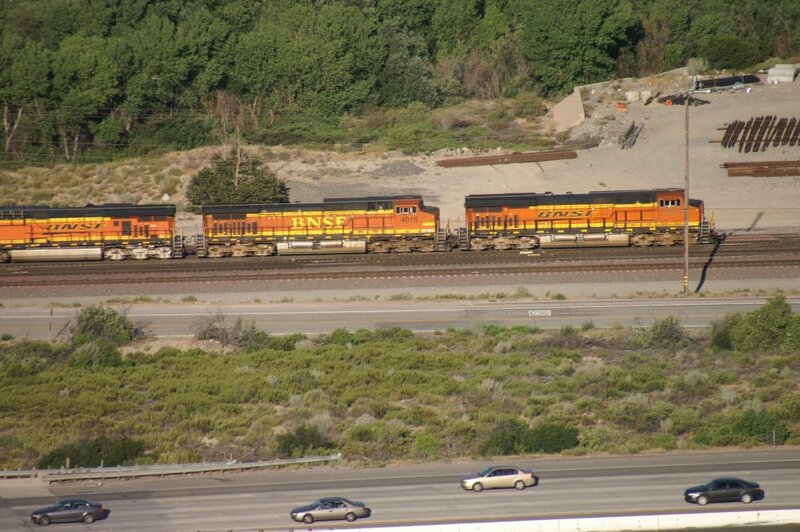 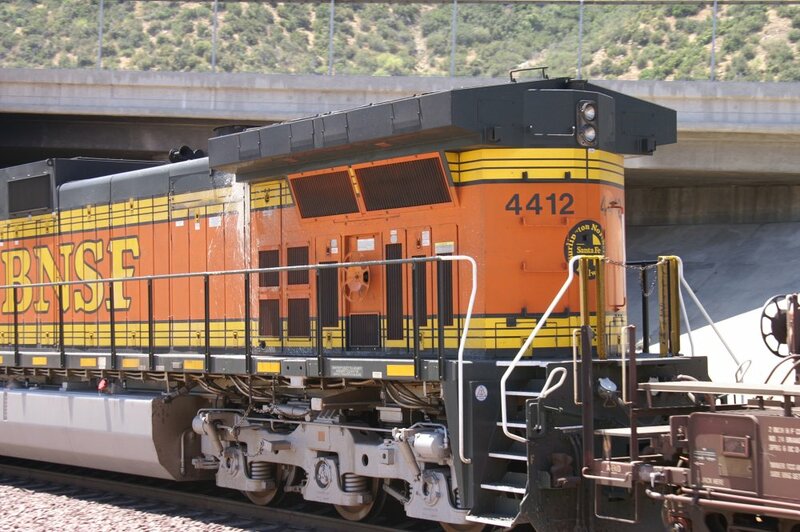 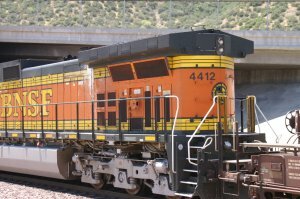 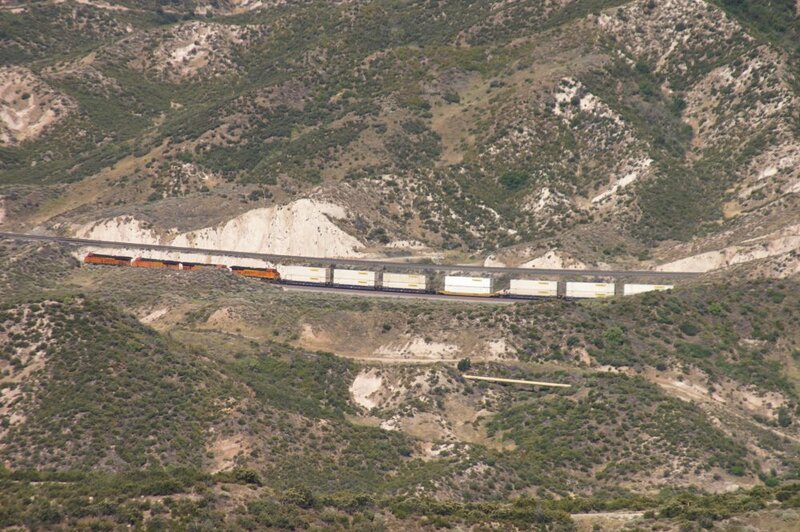 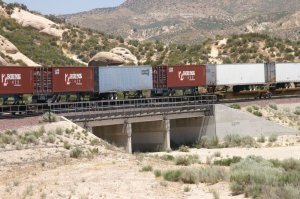 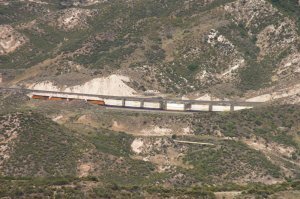 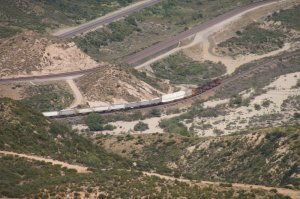 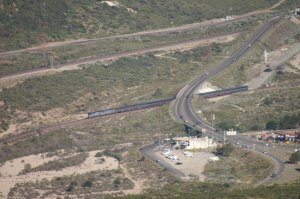 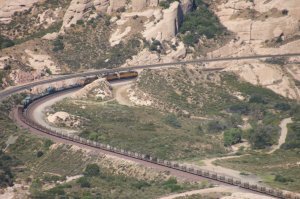 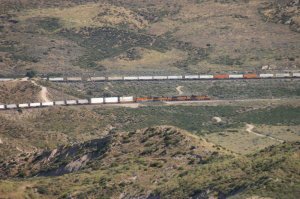 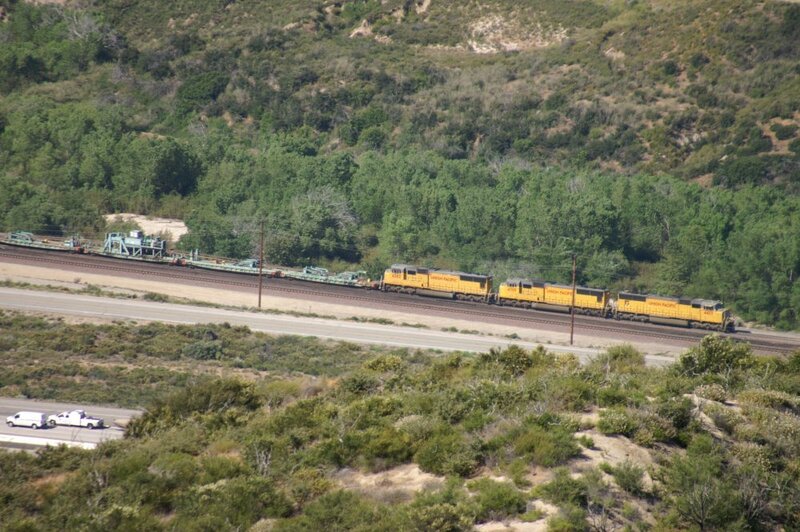 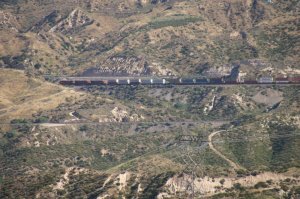 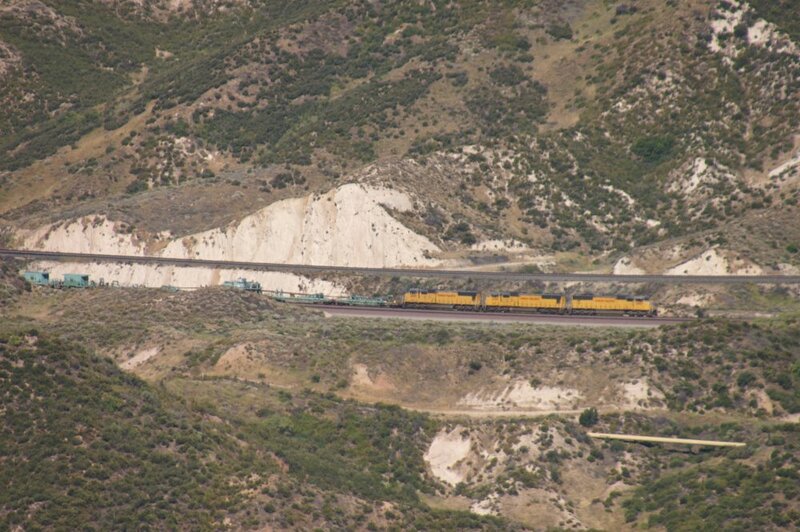 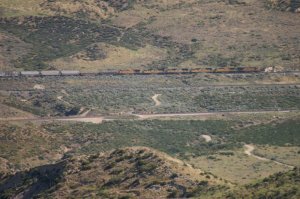 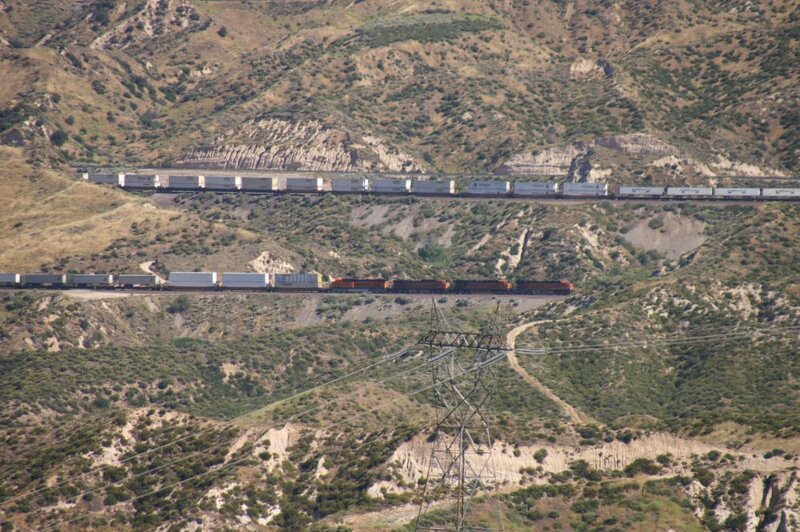 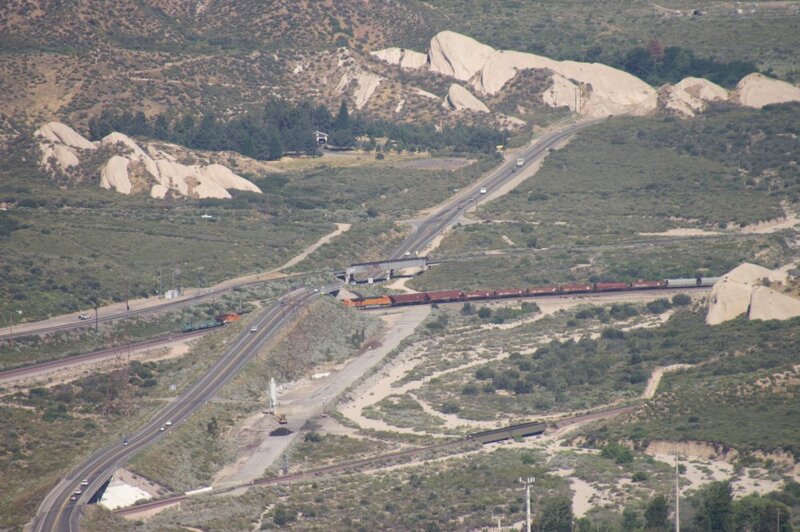 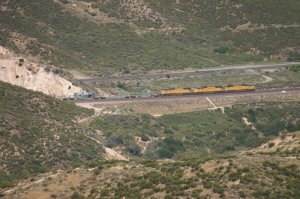 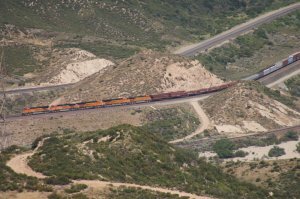 Below are BNSF MT-1 and MT-2 (2,2 % grade) which includes the 3rd Main Track which was built in 2007/2008. 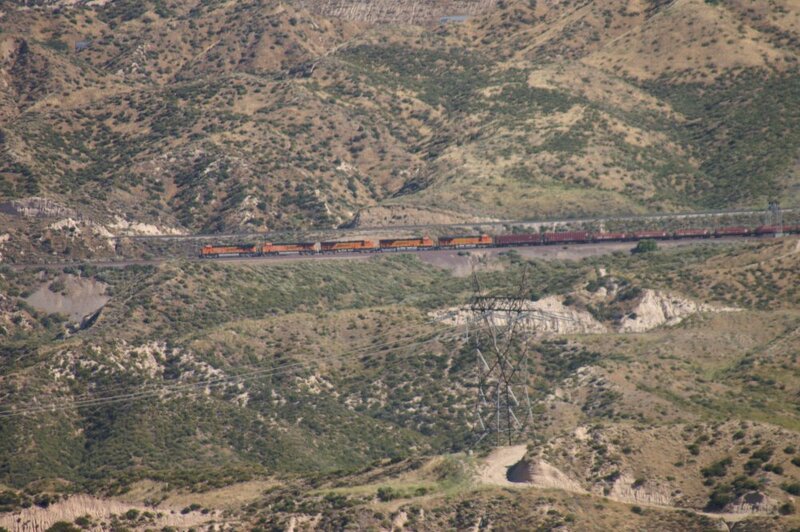 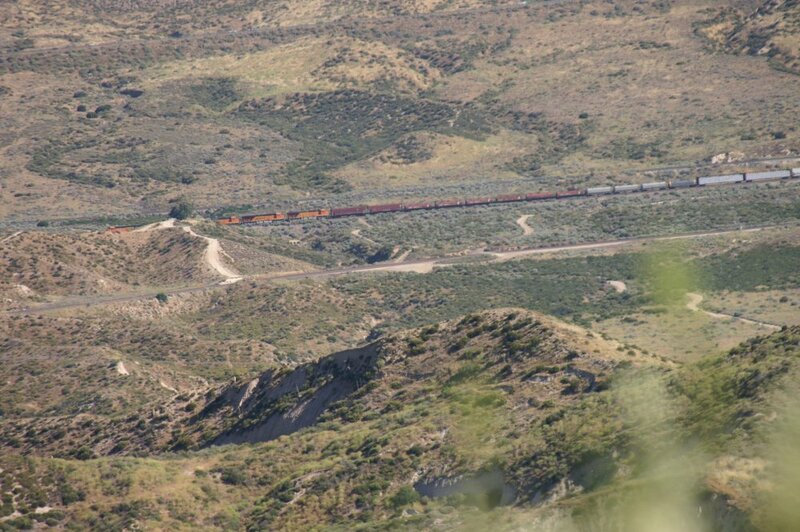 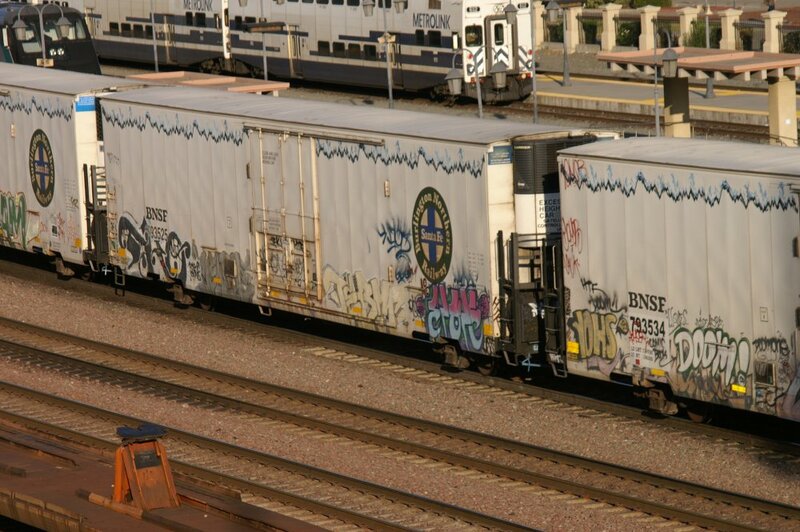 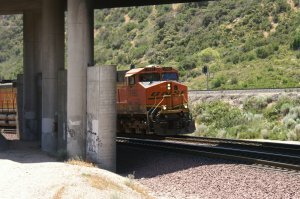 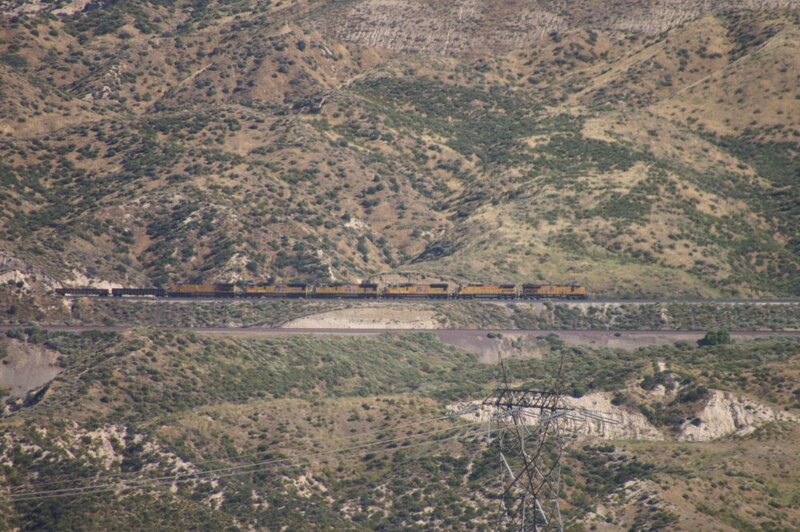 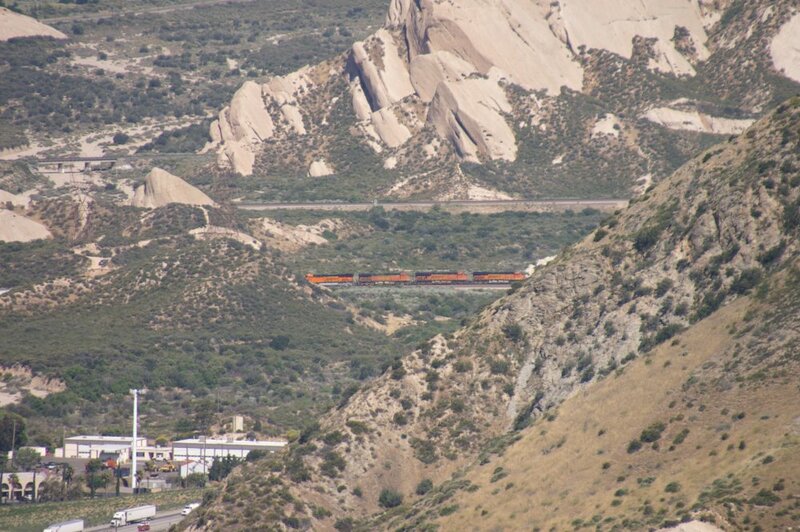 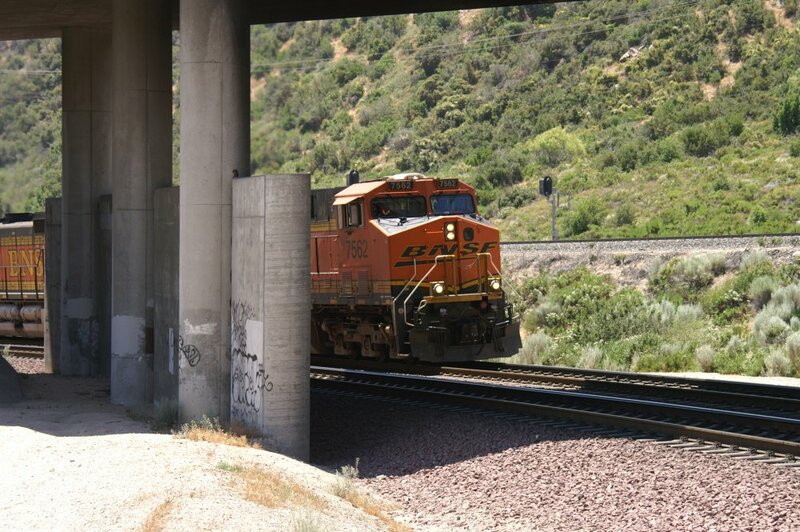 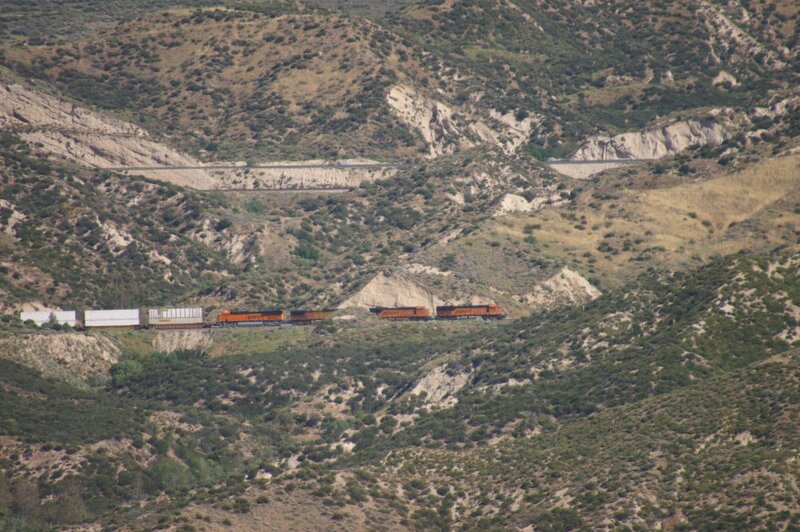 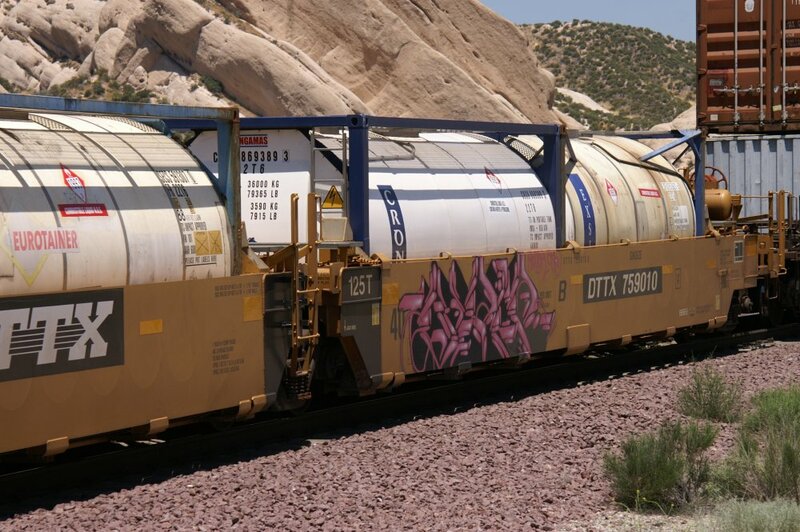 And below the BNSF Double Track is BNSF MT-3 with 3 % grade. 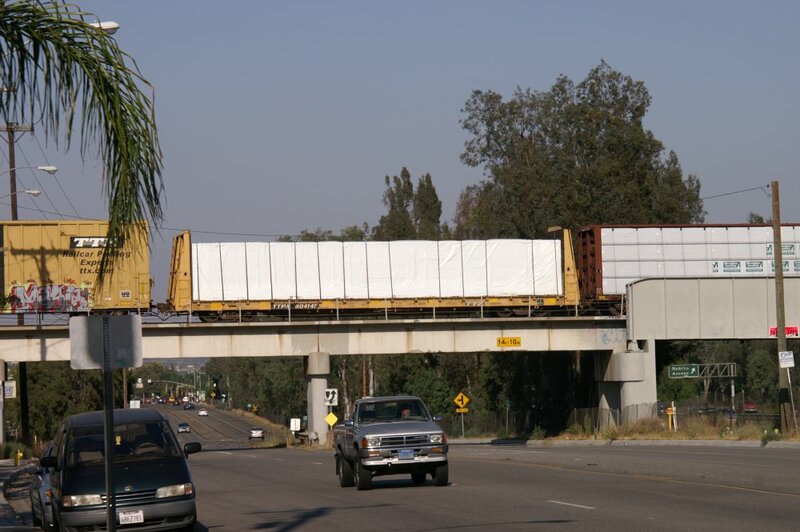 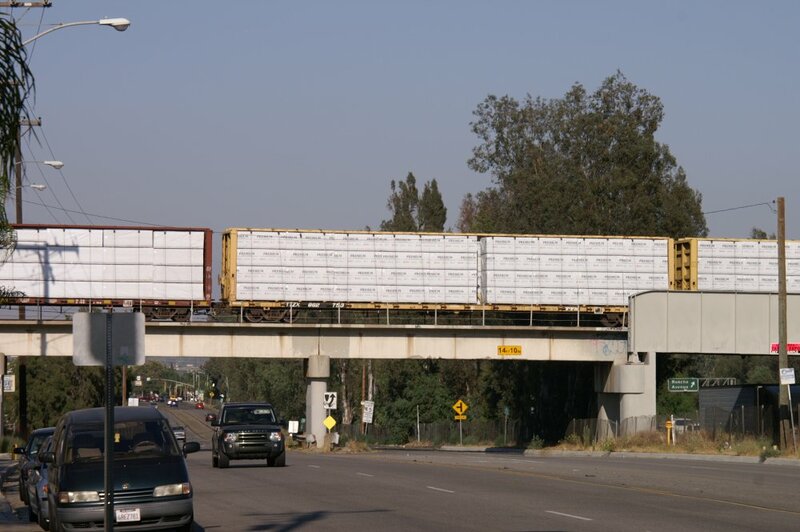 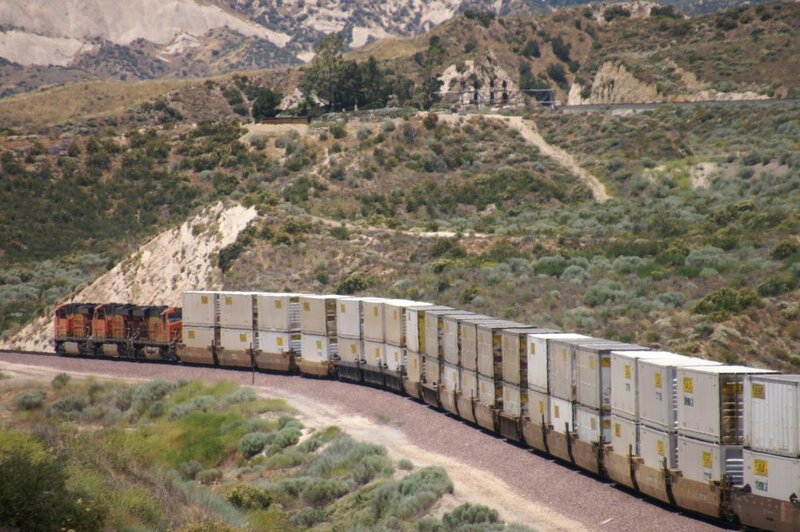 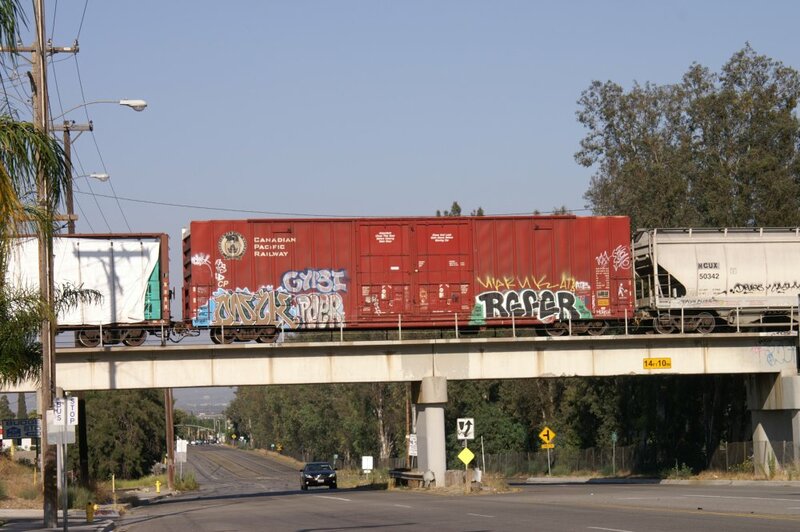 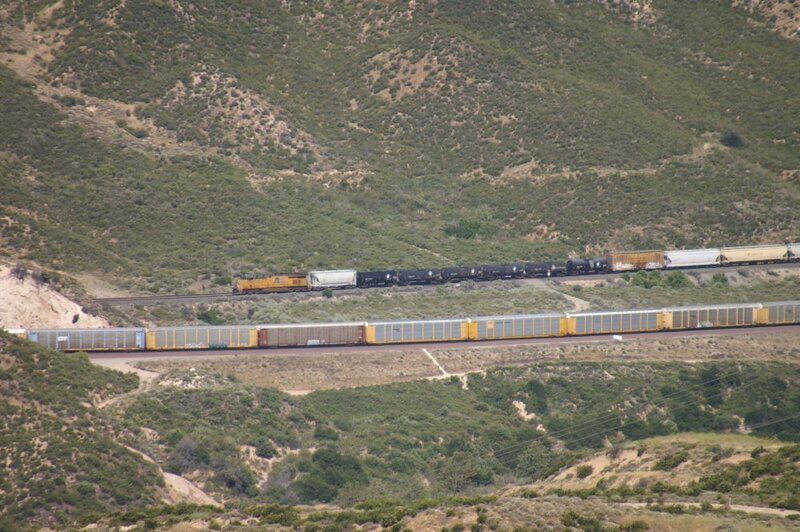 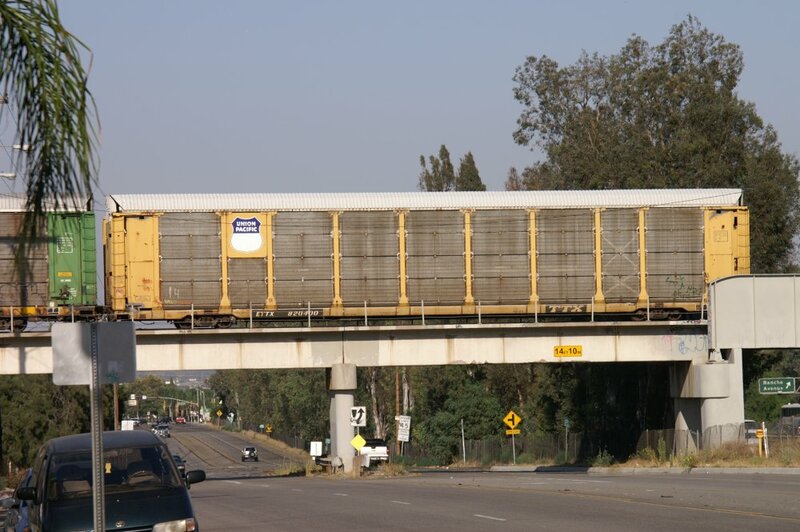 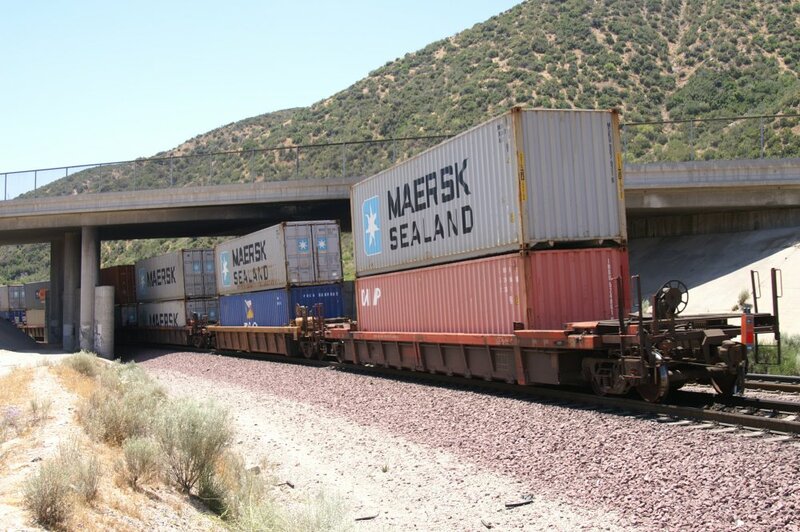 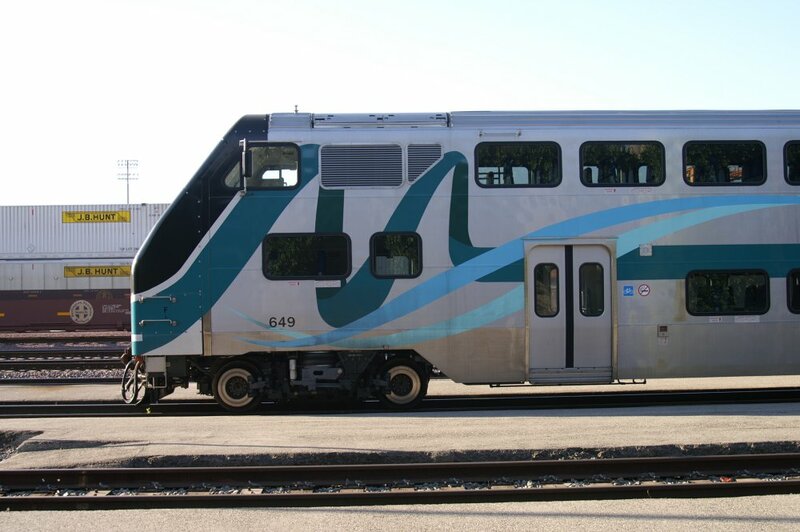 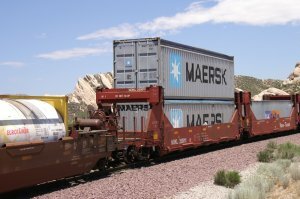 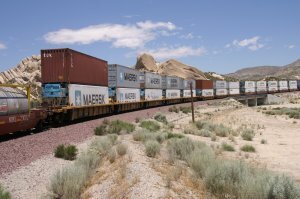 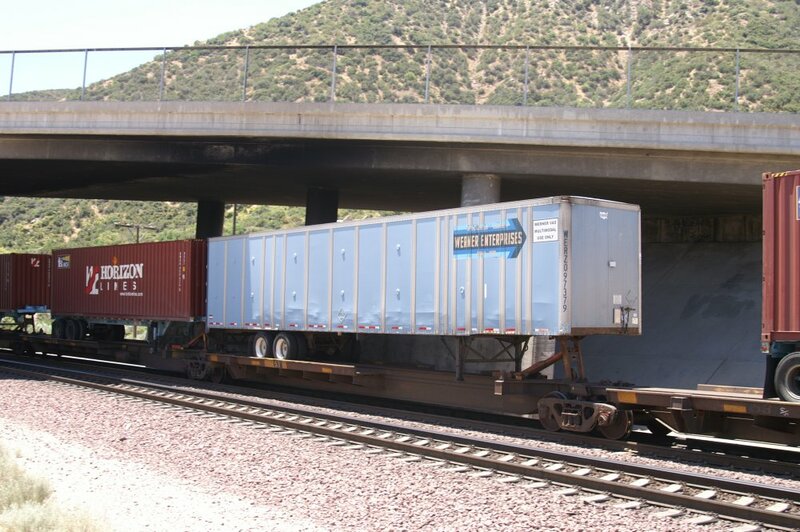 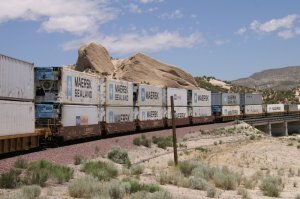 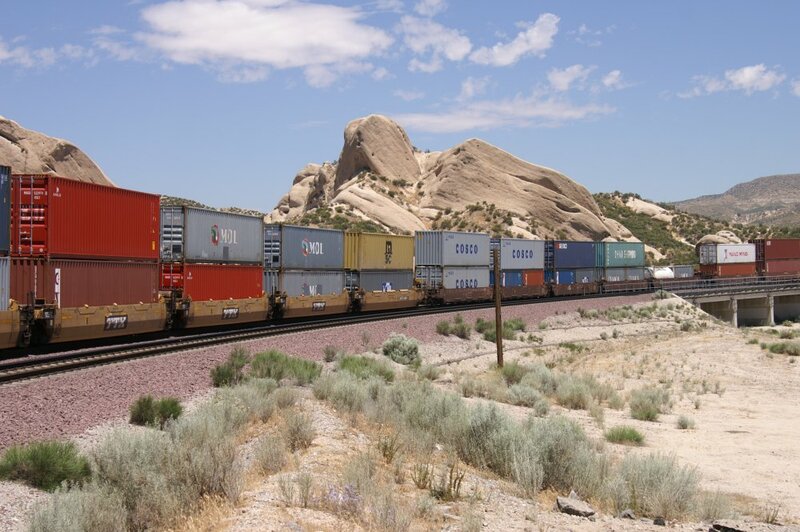 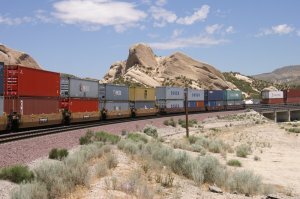 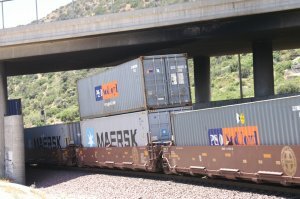 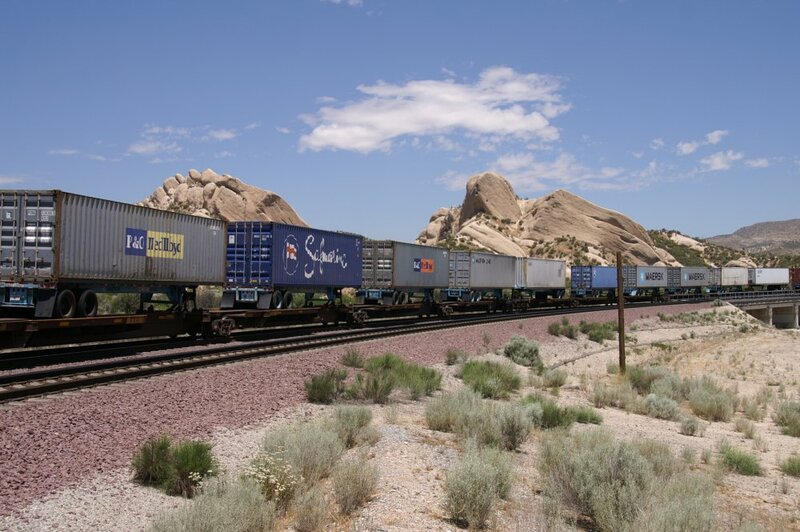 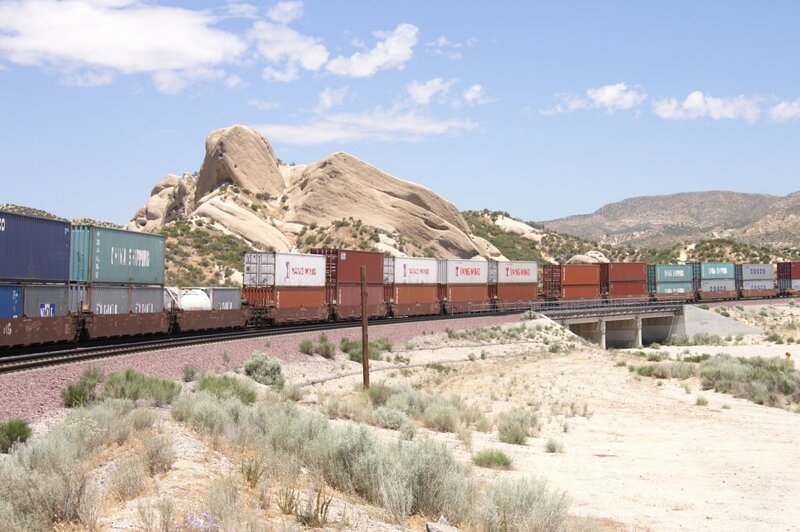 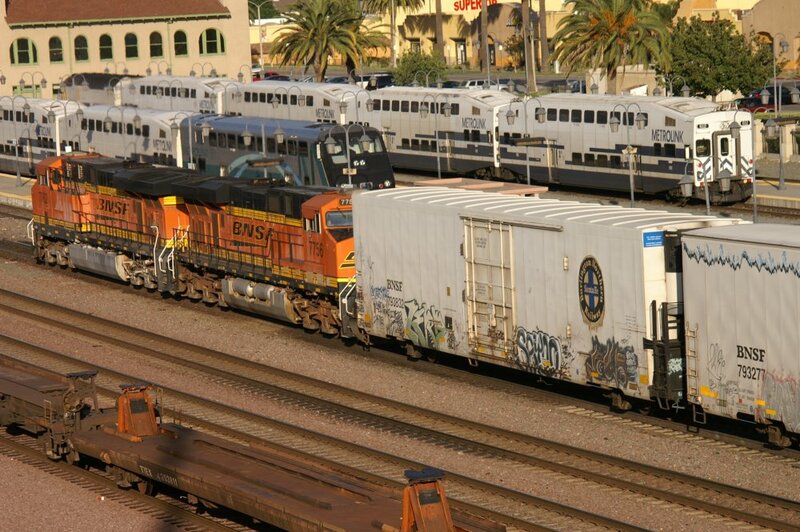 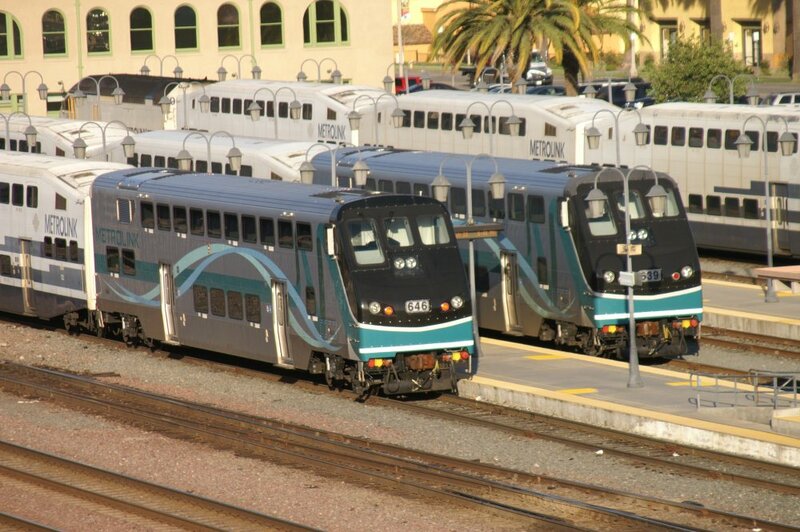 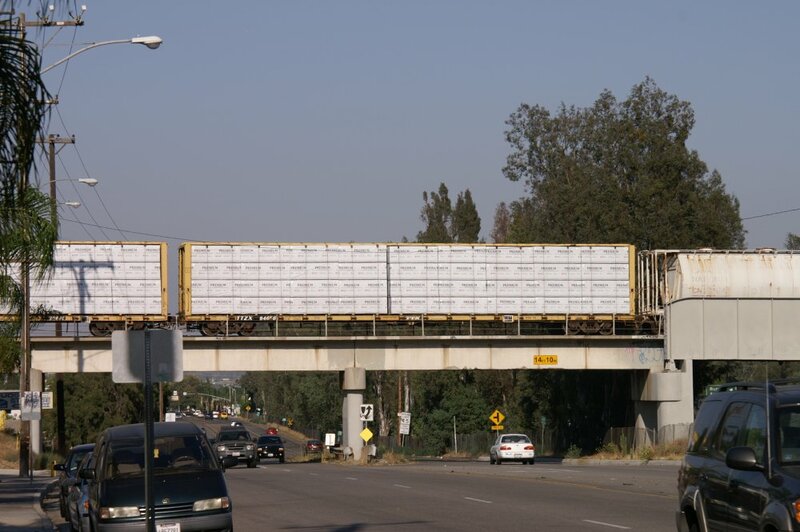 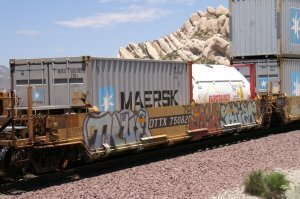 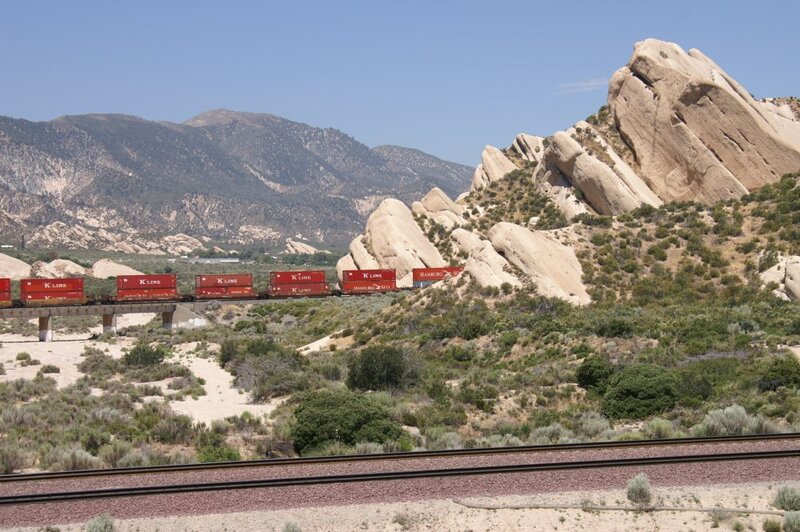 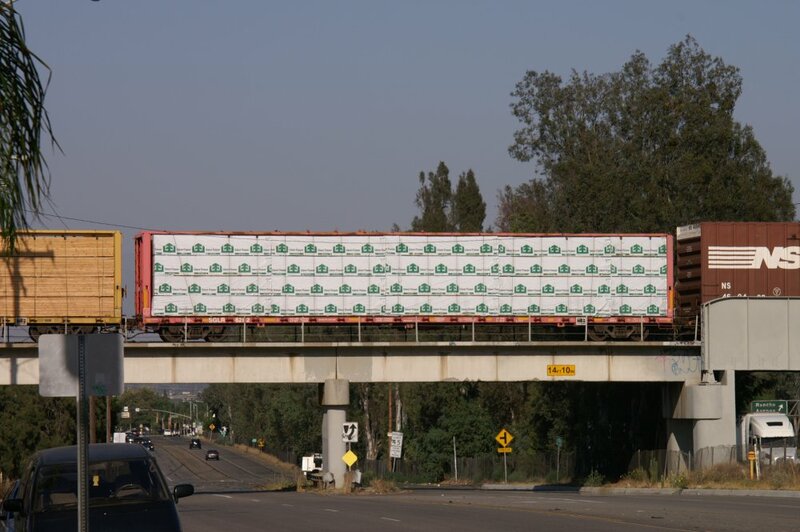 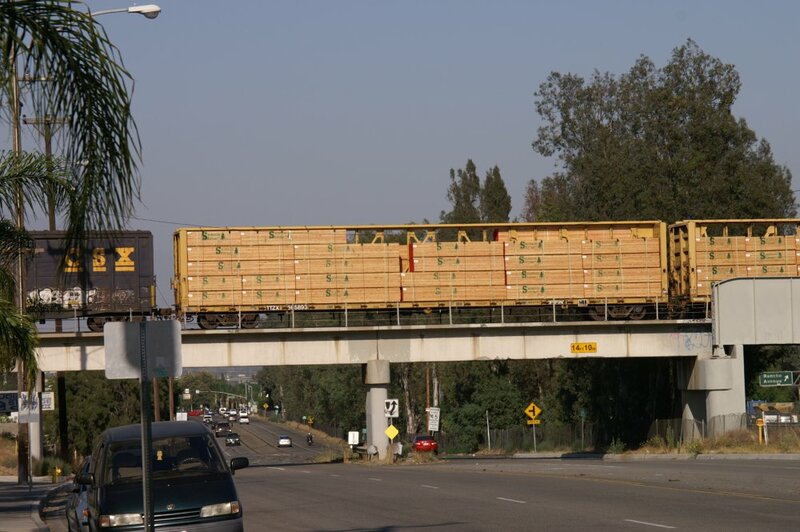 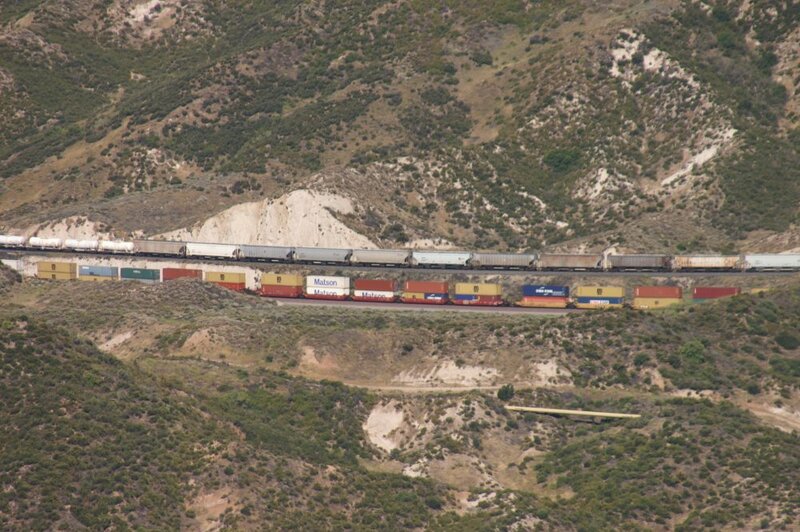 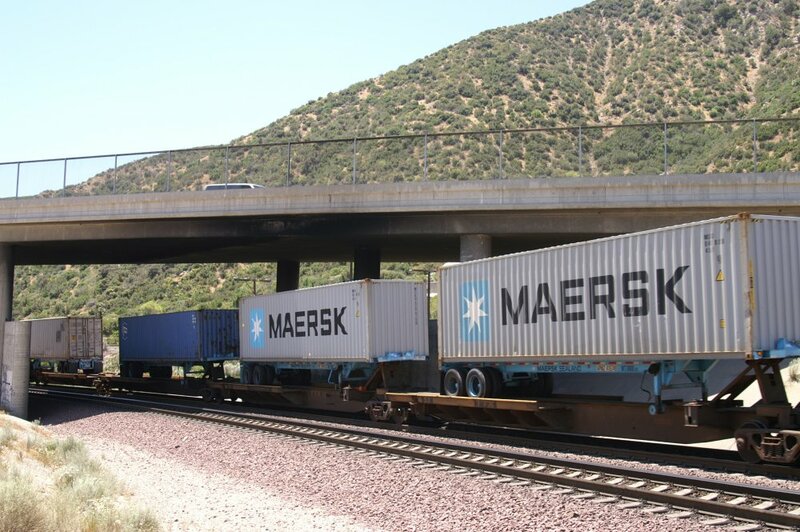 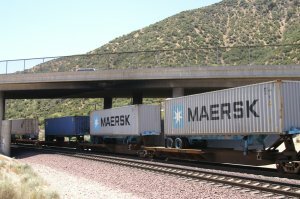 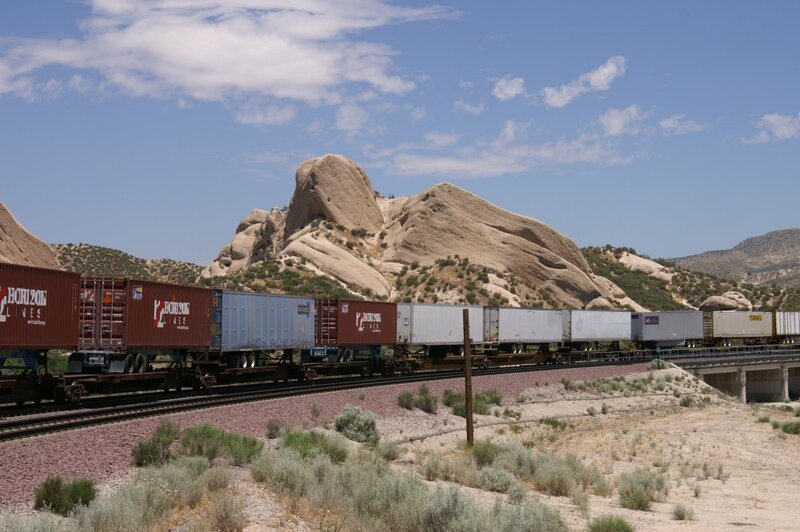 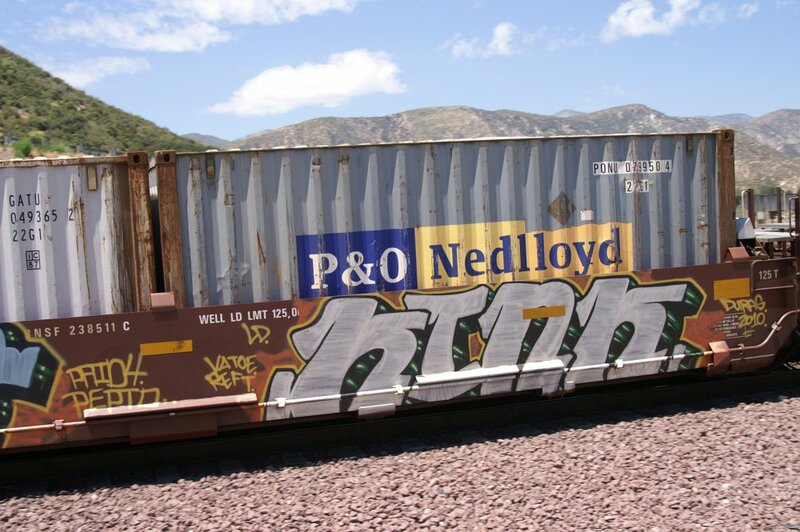 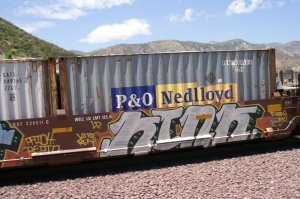 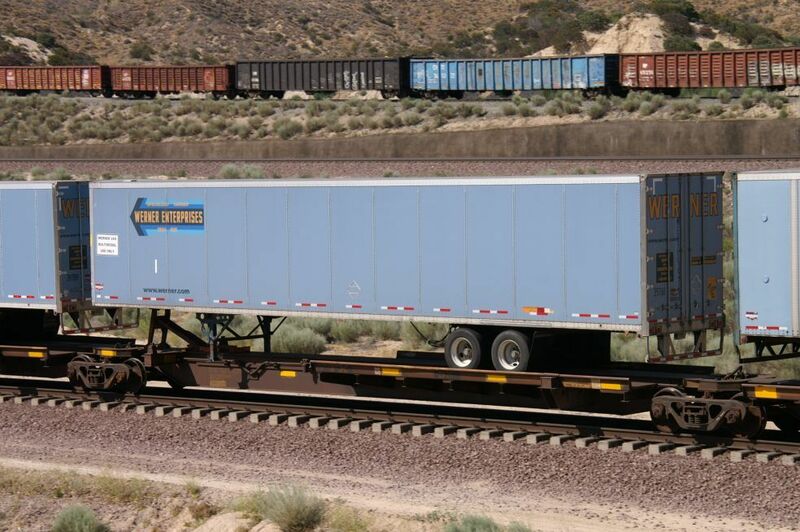 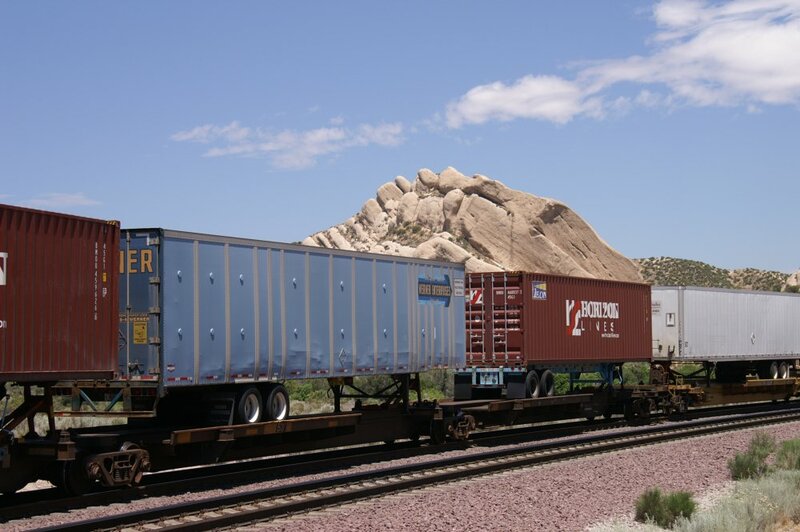 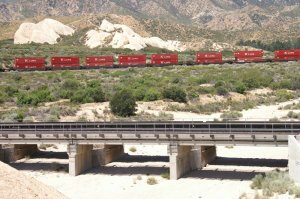 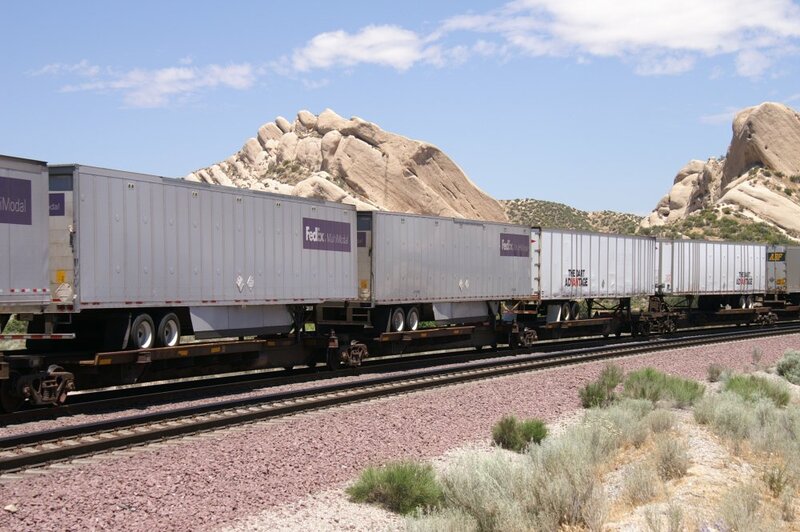 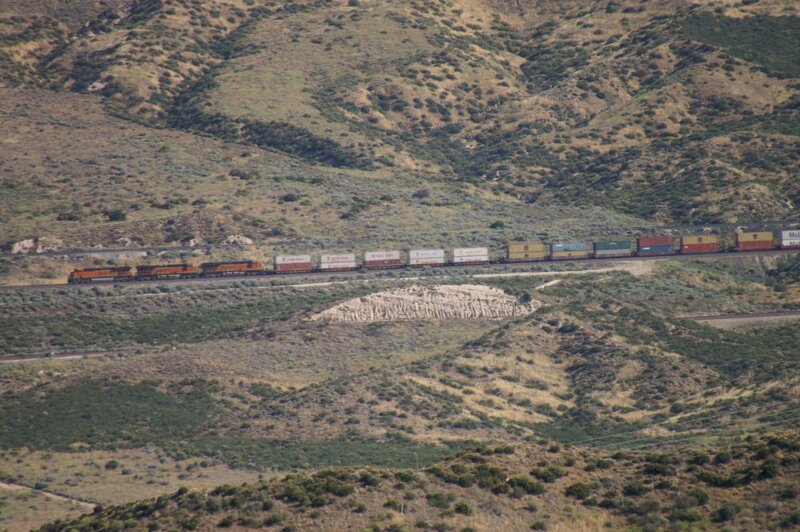 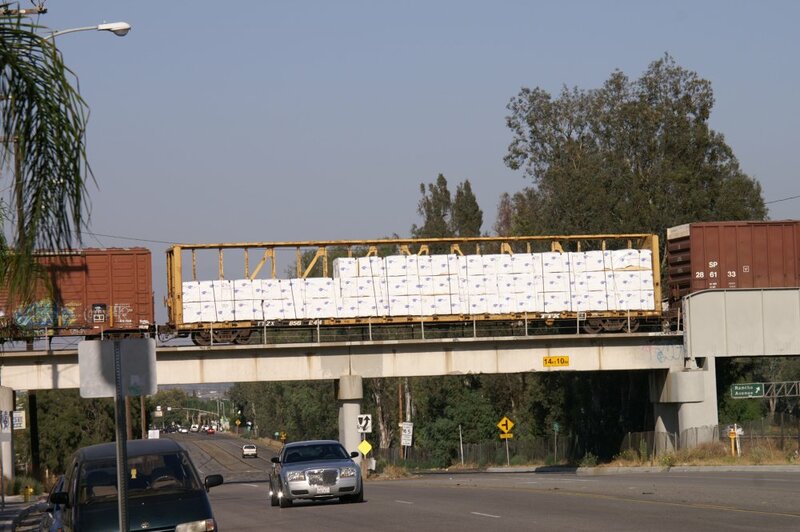 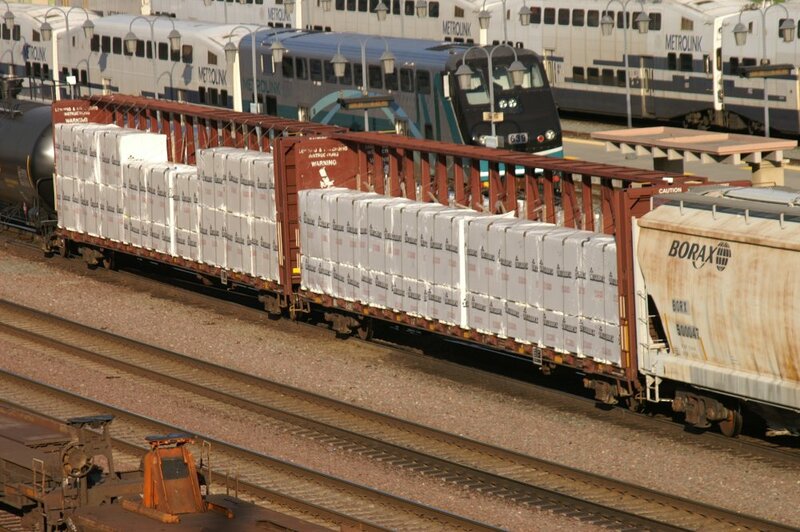 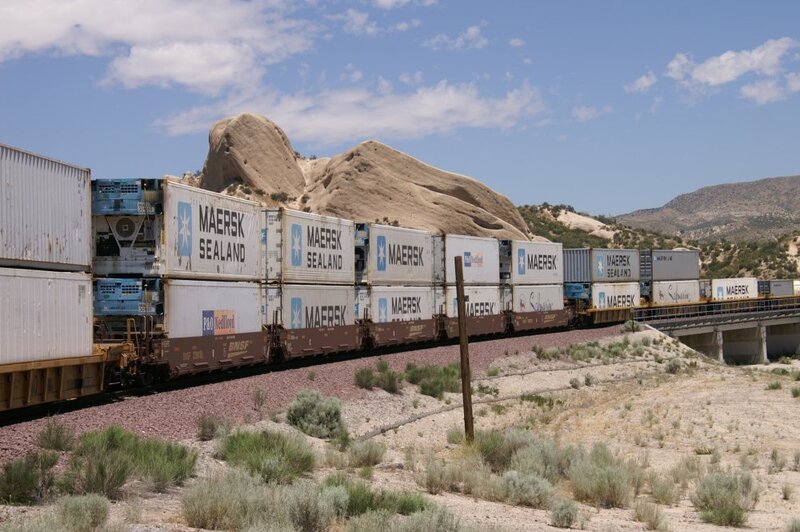 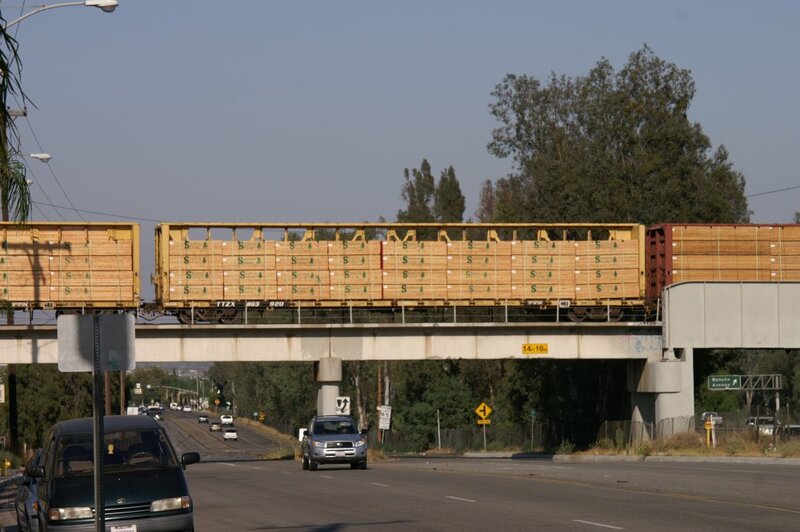 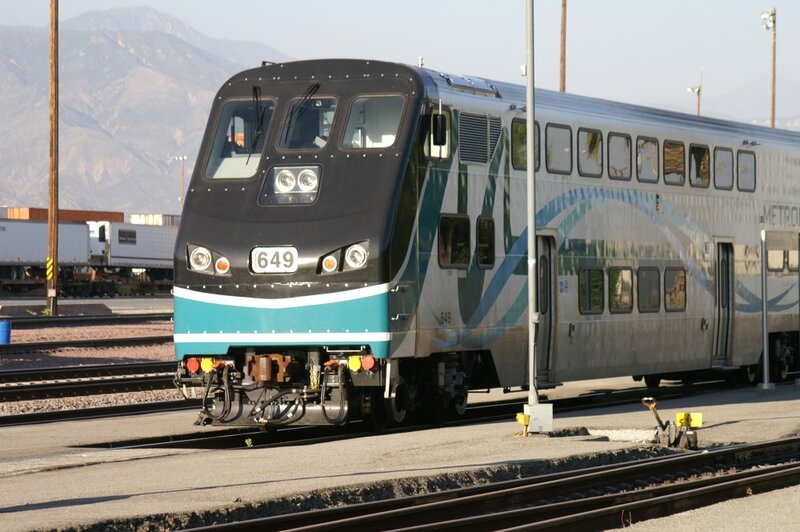 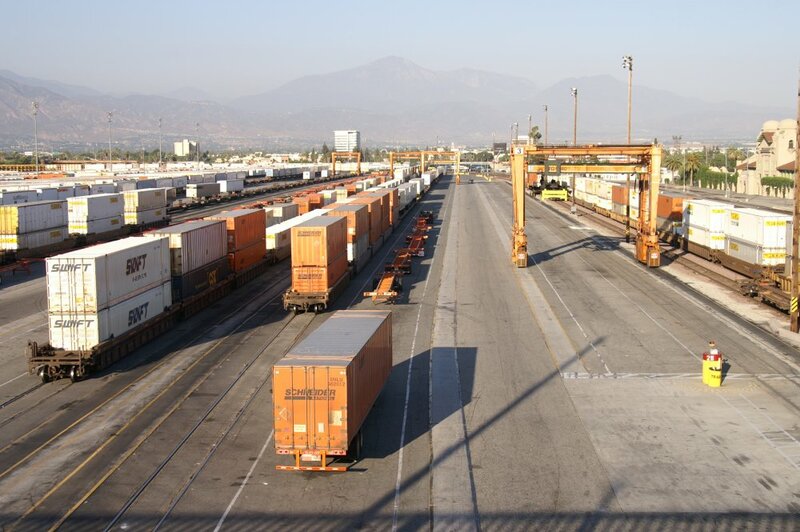 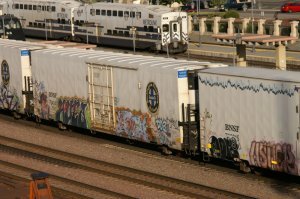 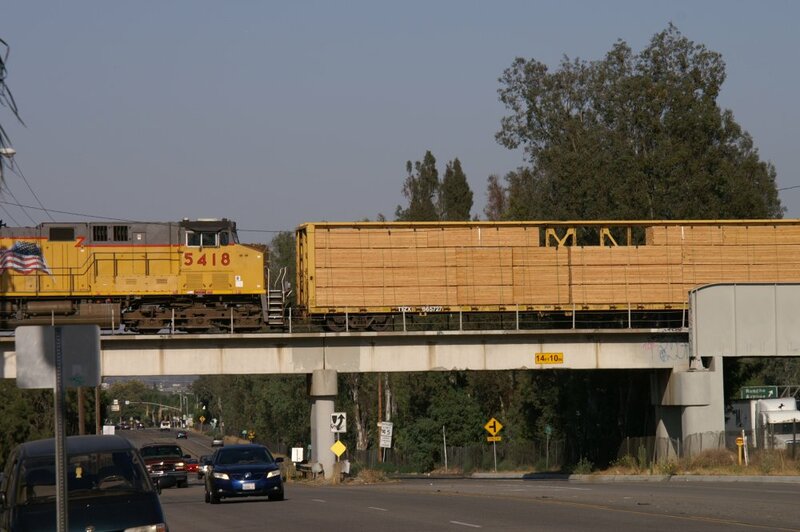 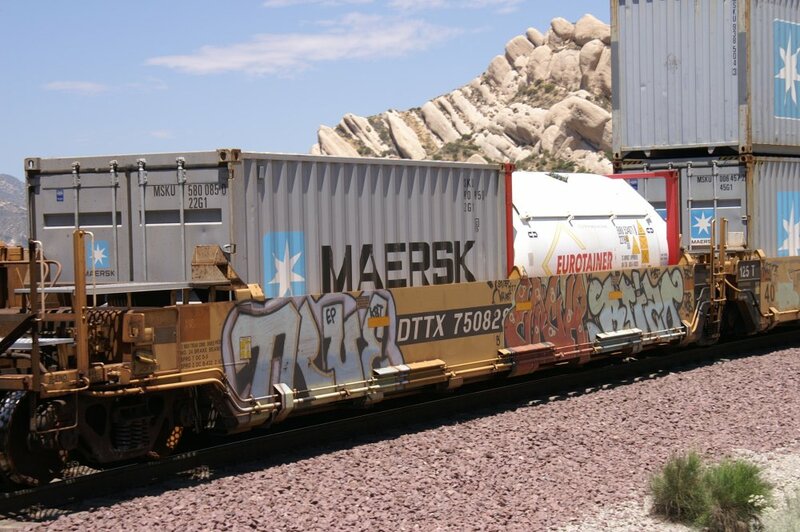 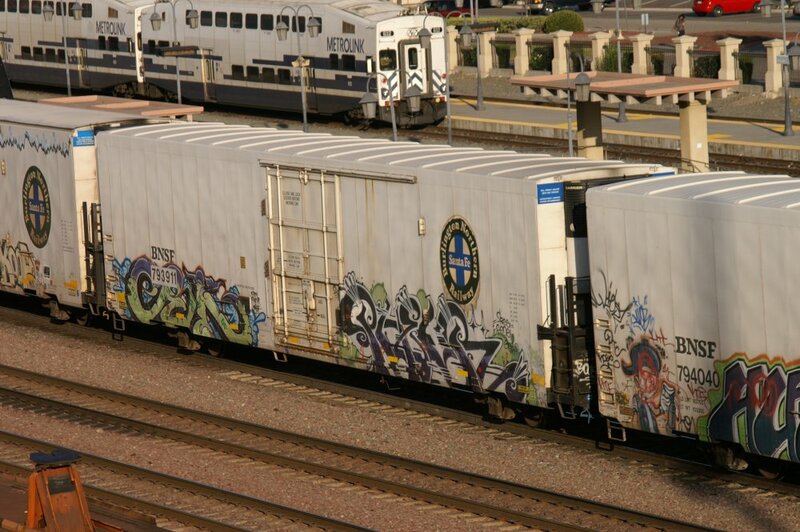 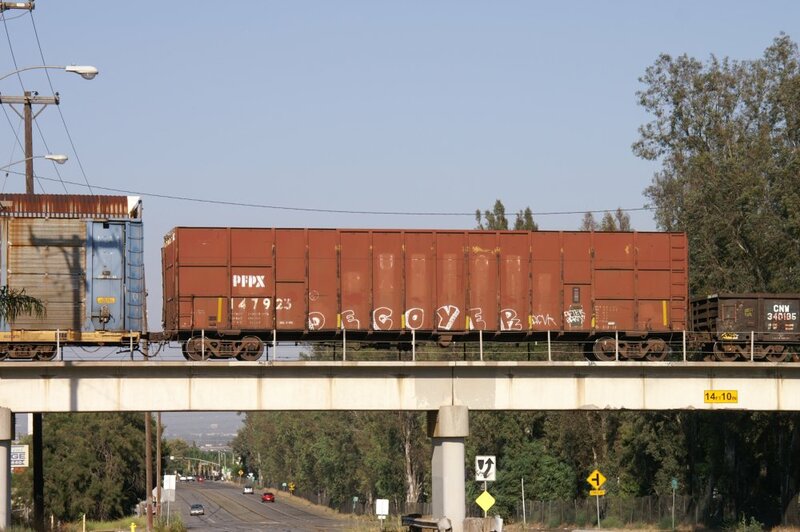 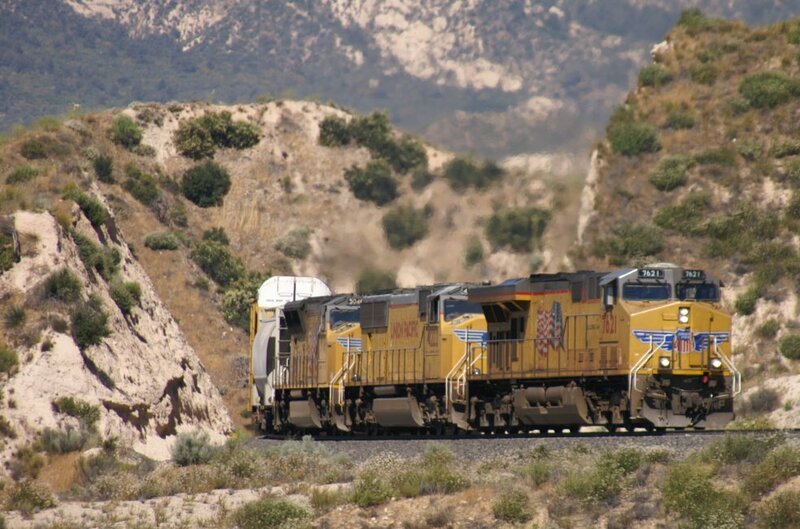 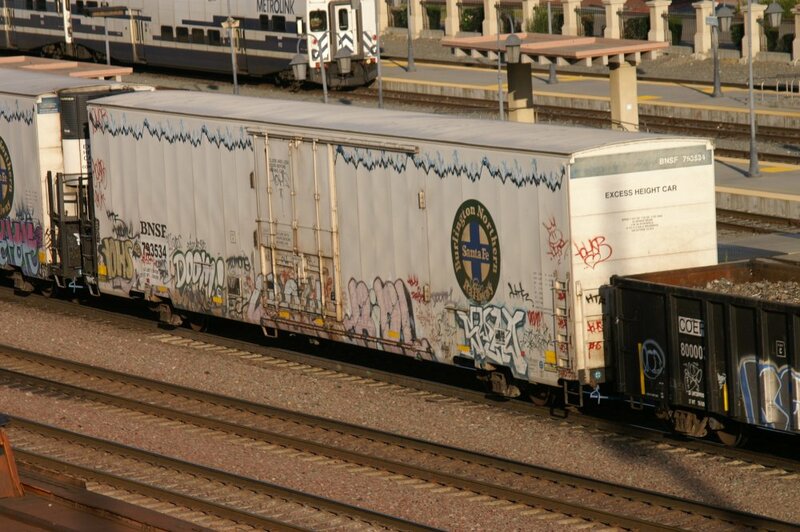 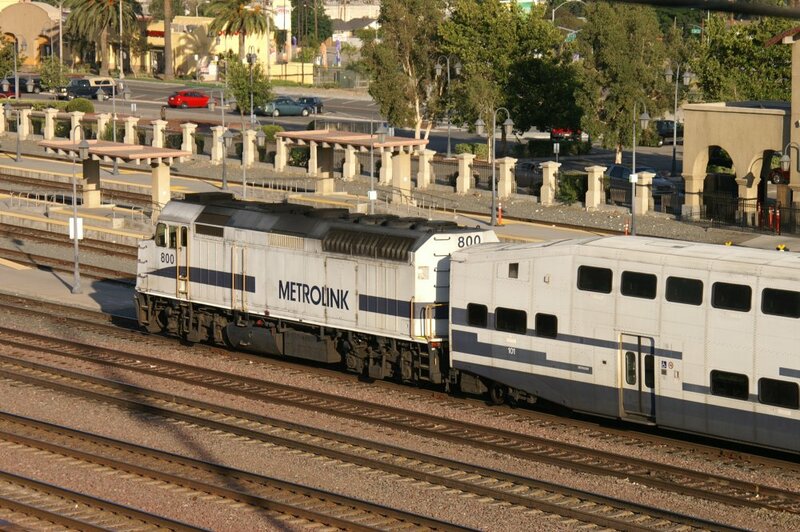 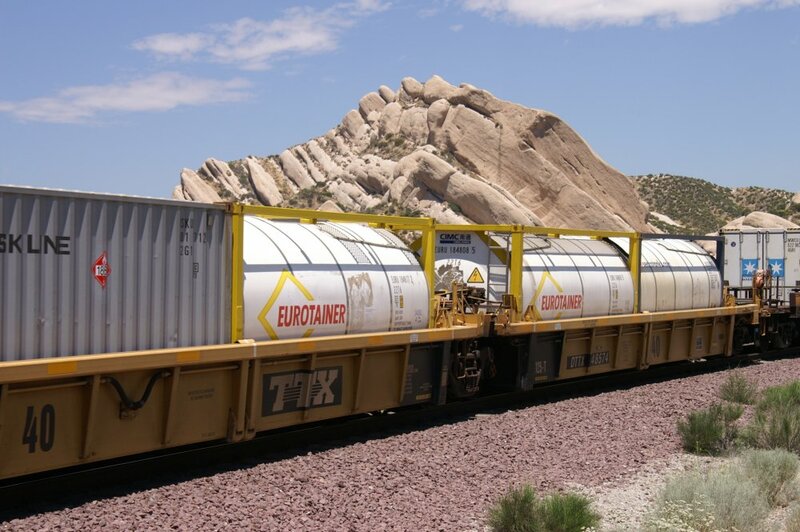 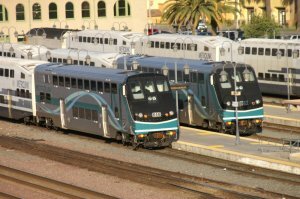 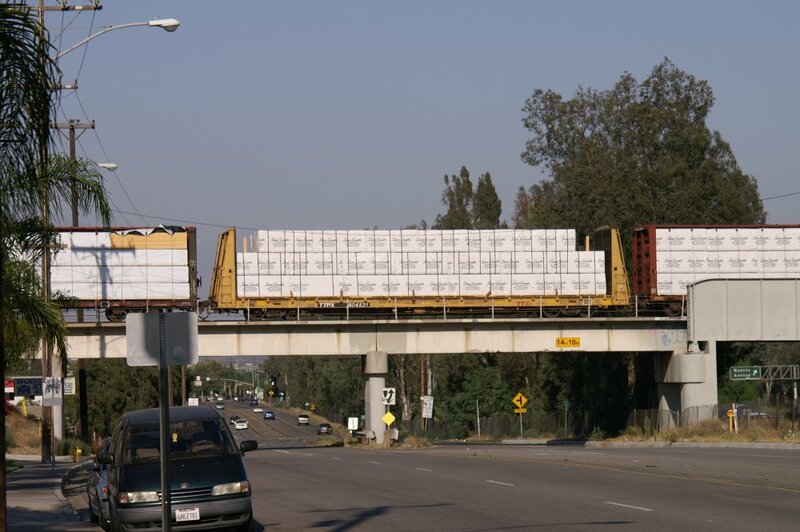 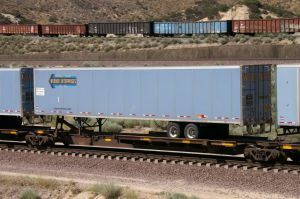 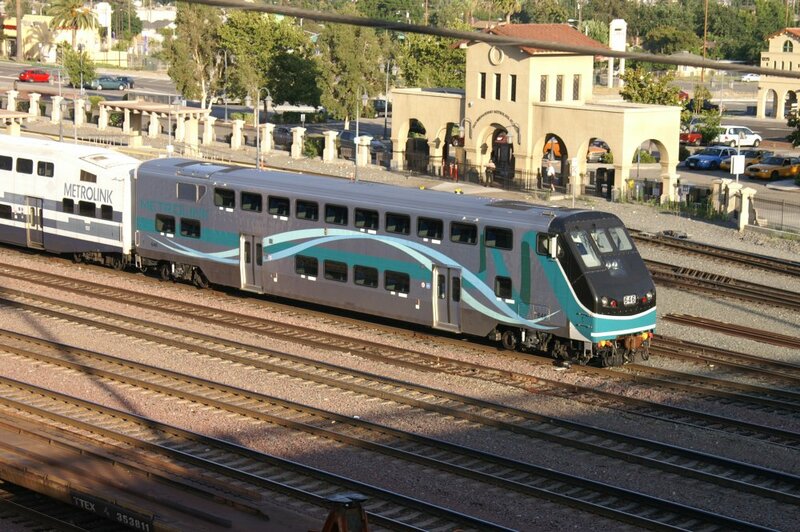 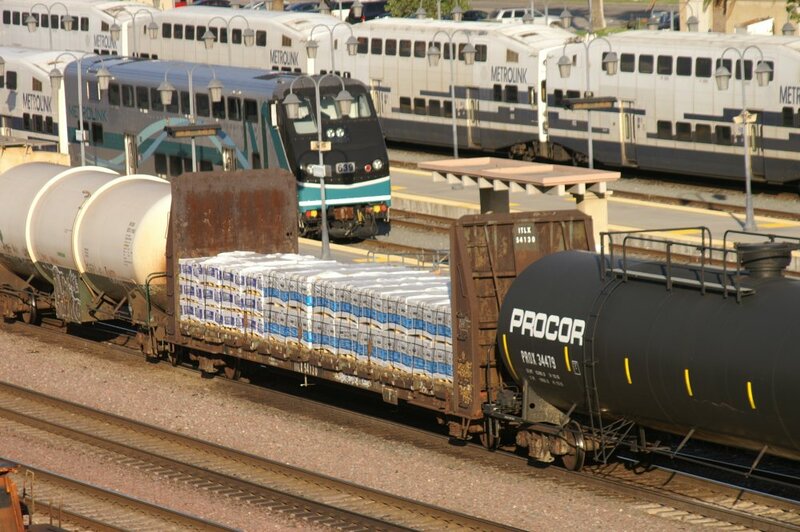 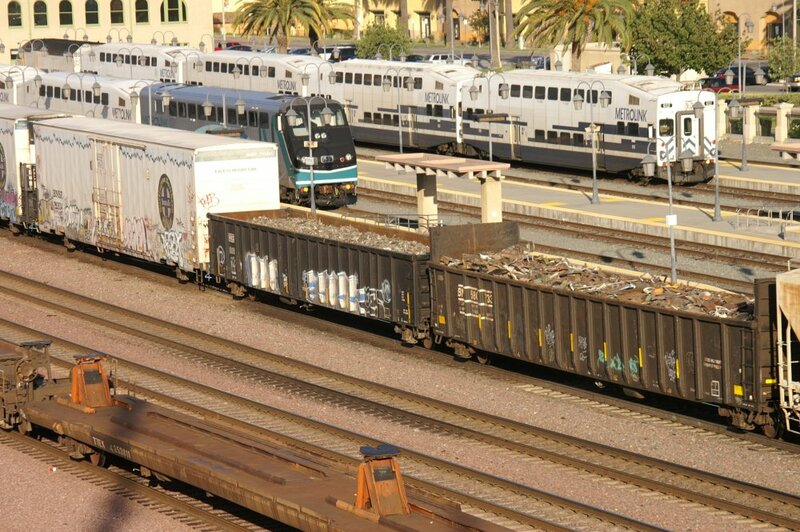 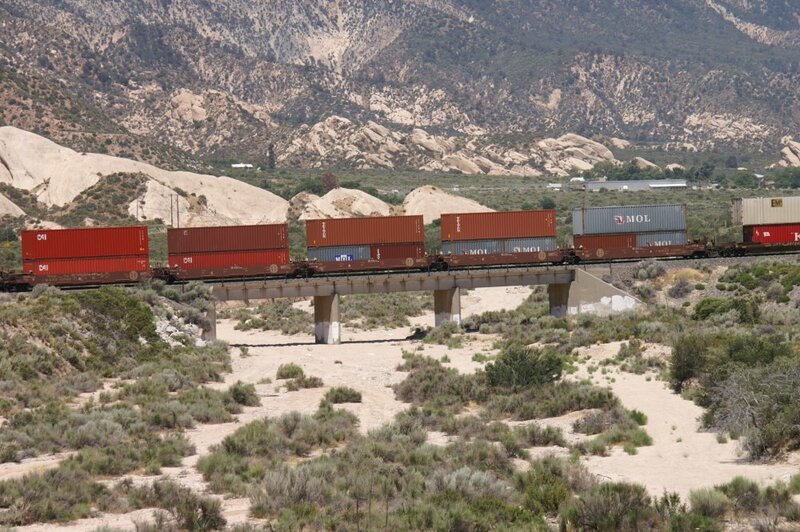 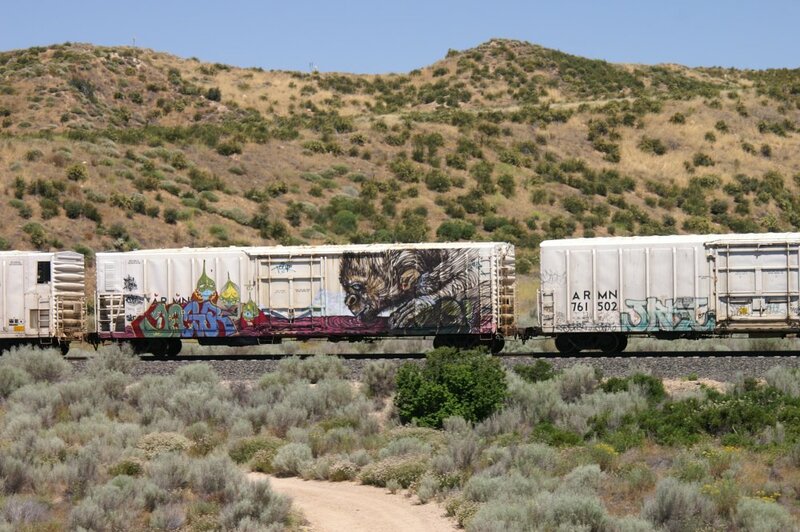 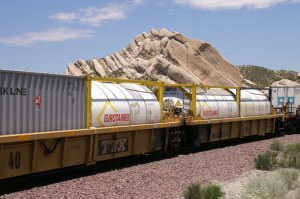 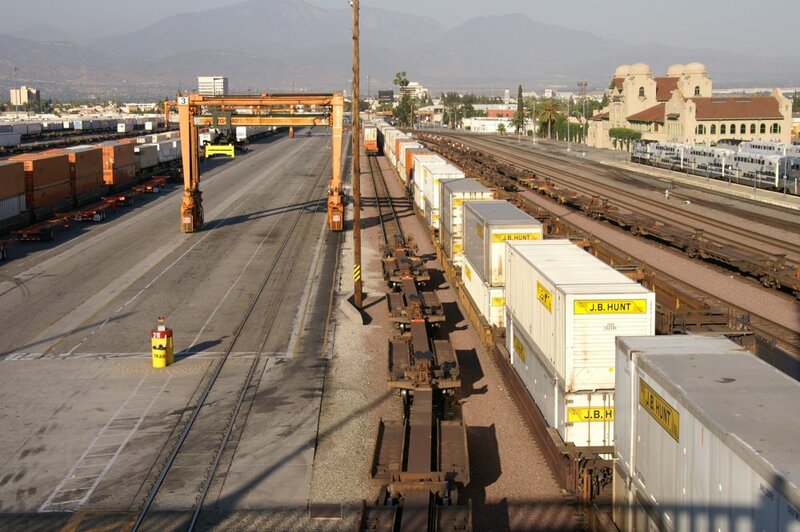 we have two intermodal trains: Train 8 on MT-3 with 3 % grade (uphill) and Train 9 on MT-2 with 2,2 % grade (downhill). 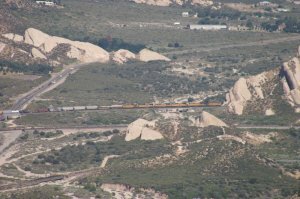 I was on overlook 4 between 08.12 h and 11.51 h (3 h 40'), got 11 trains and made 330 photos. As usual, I made lots of photos of every train to get an idea how it passed. 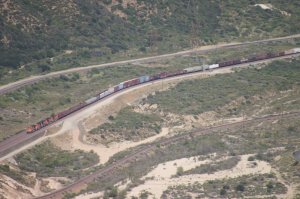 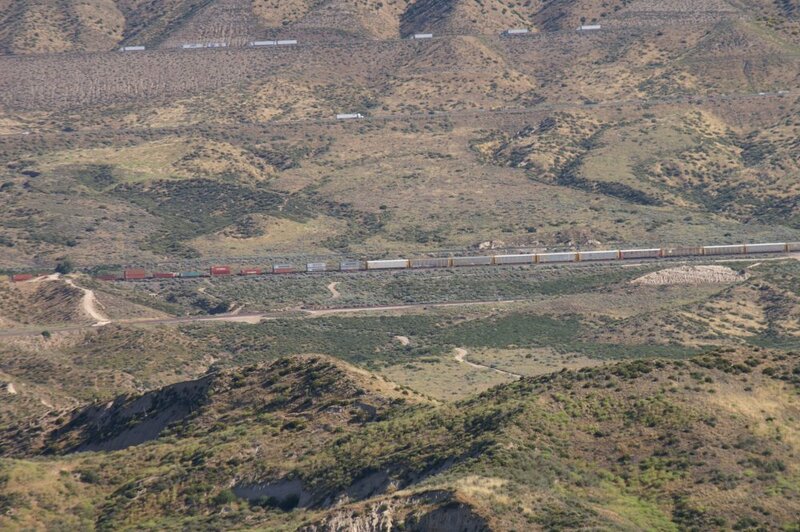 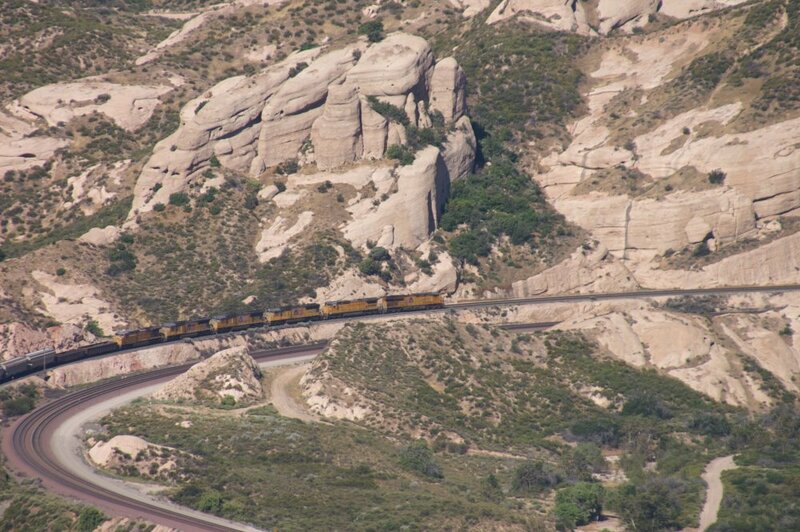 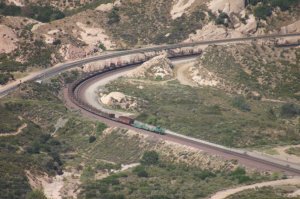 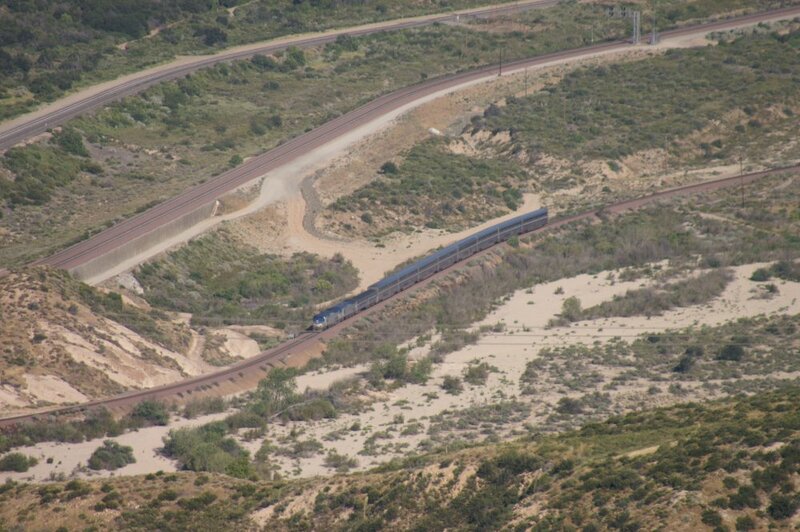 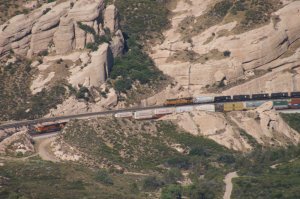 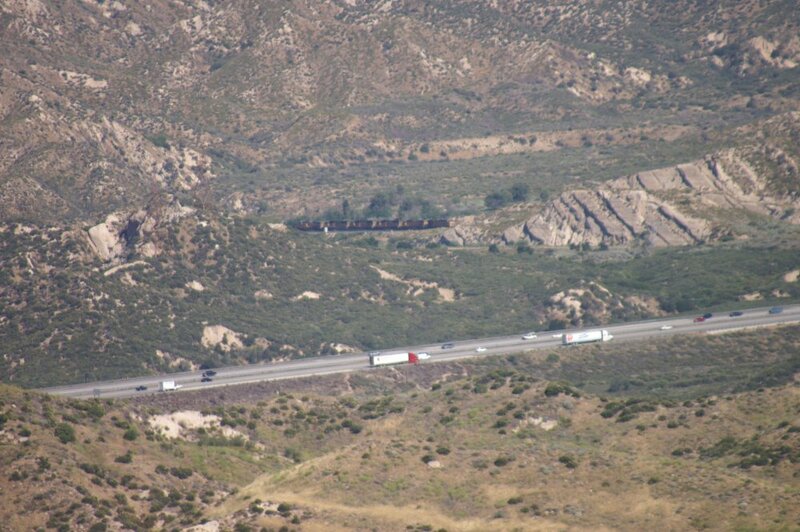 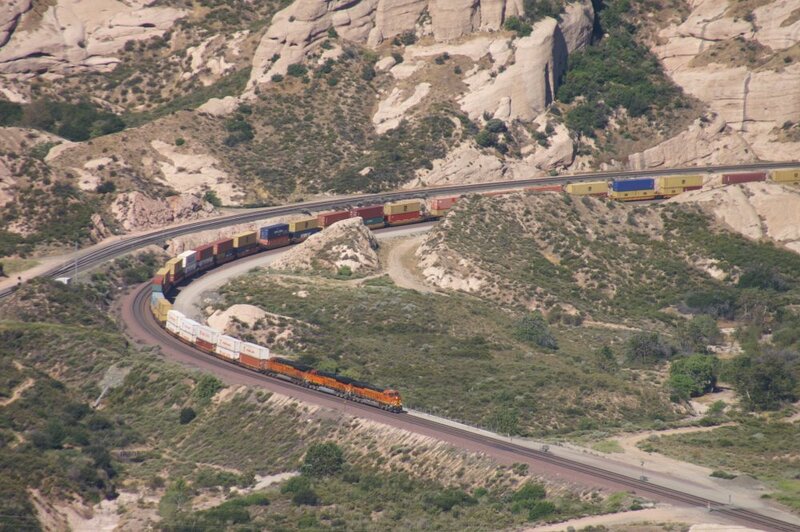 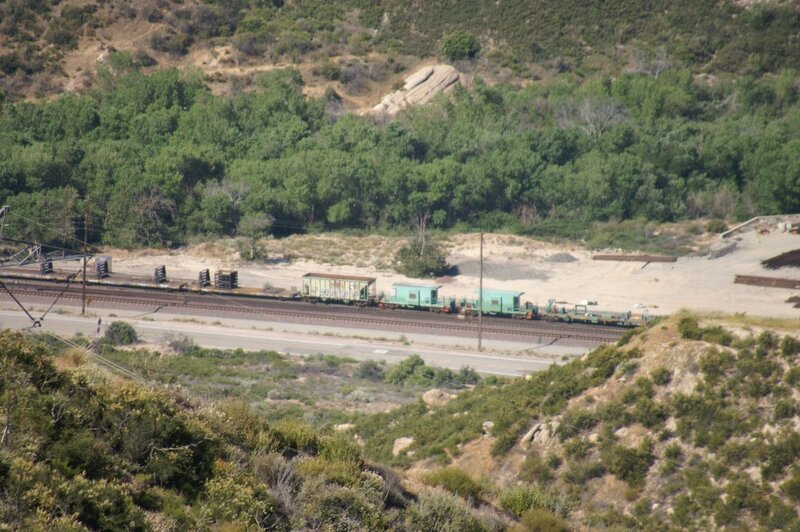 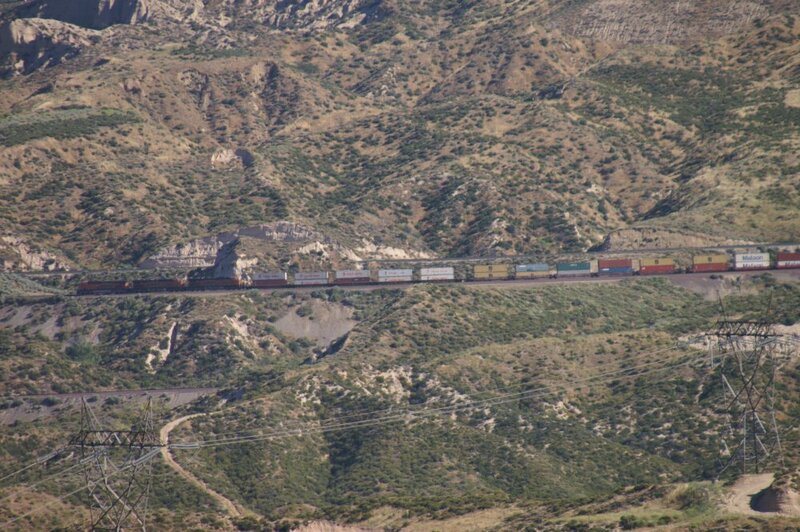 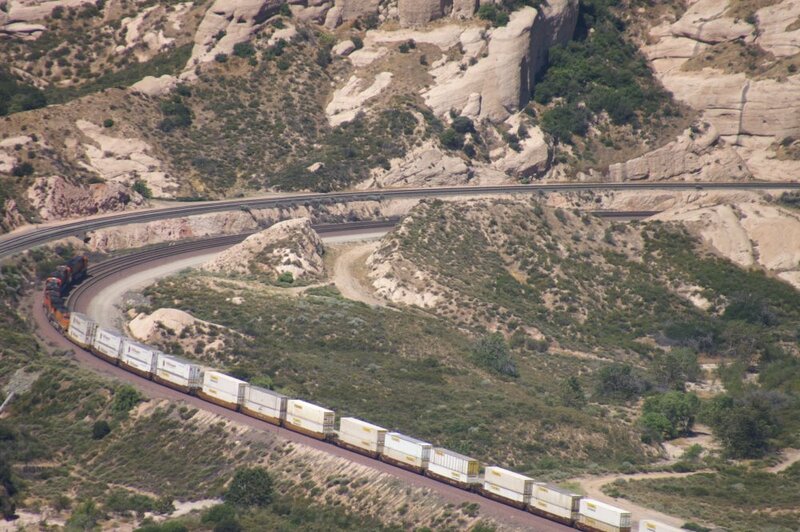 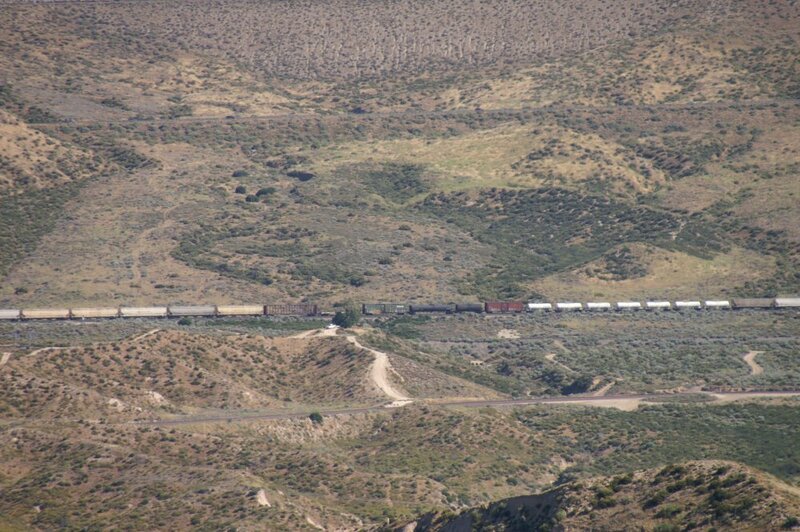 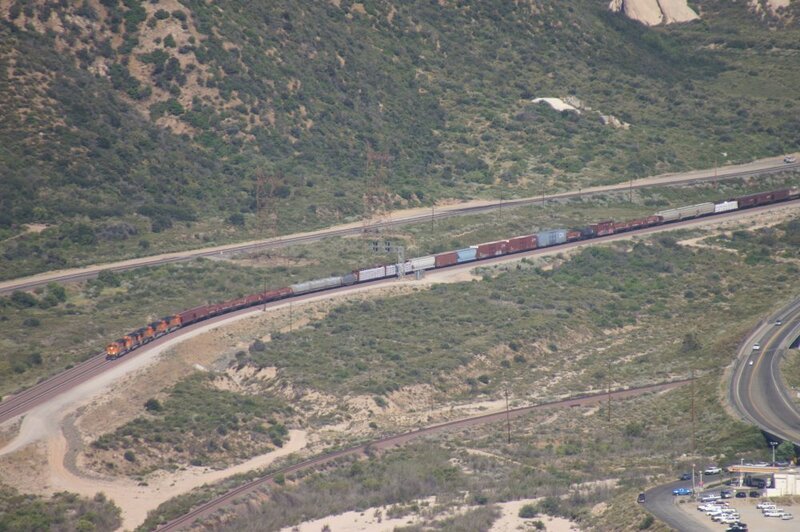 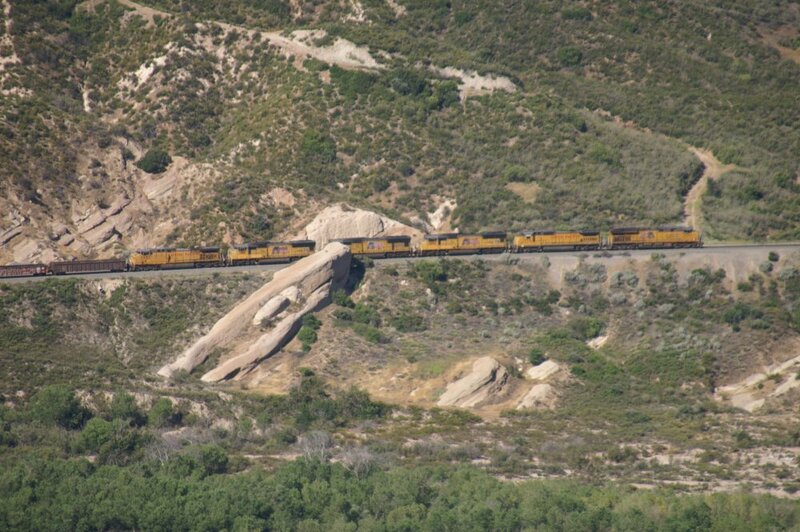 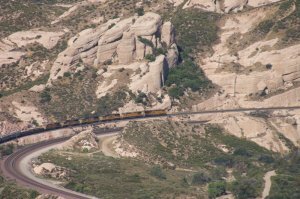 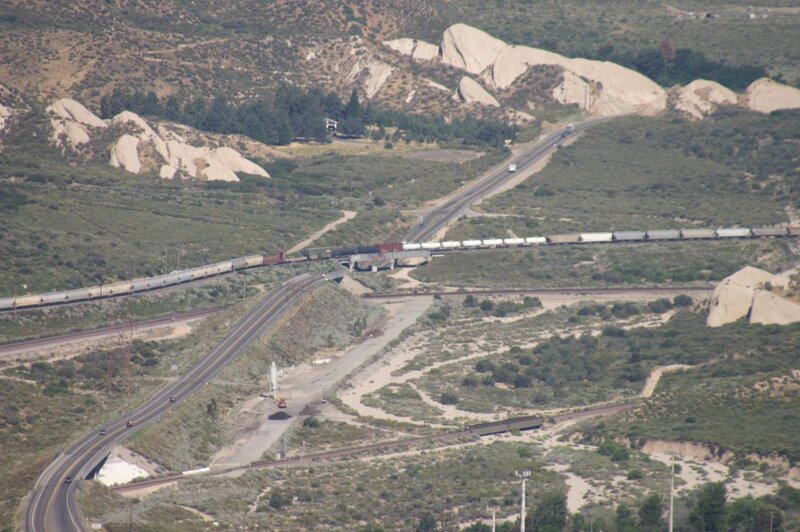 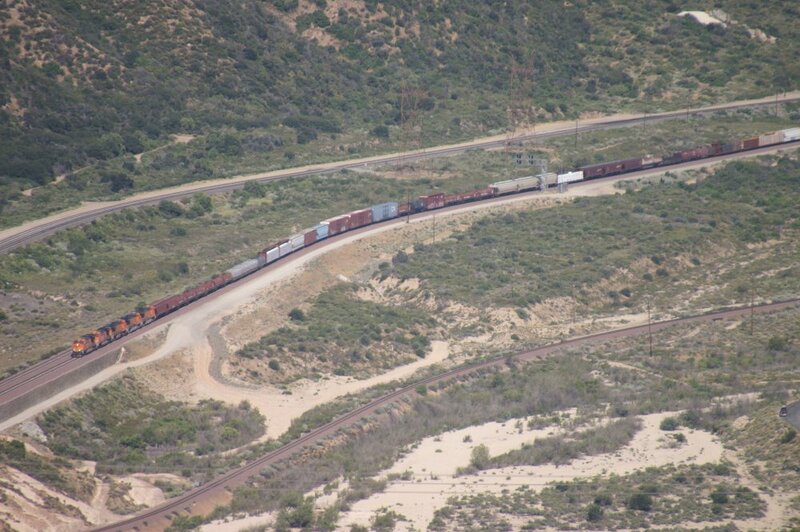 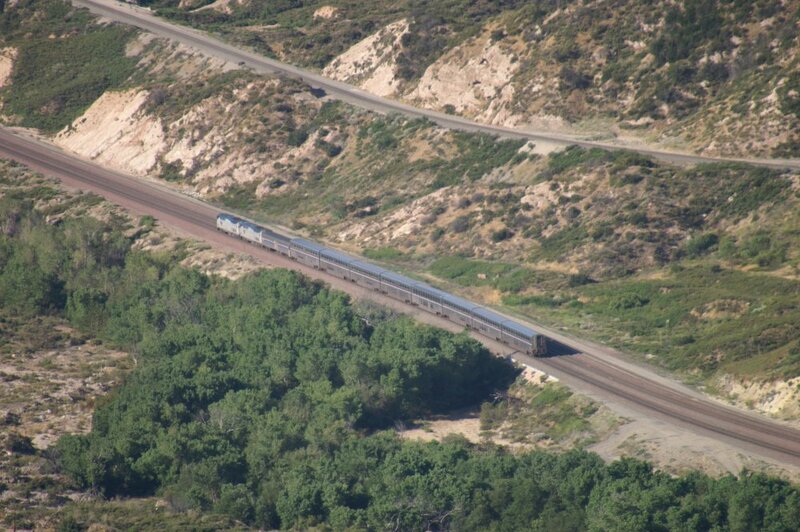 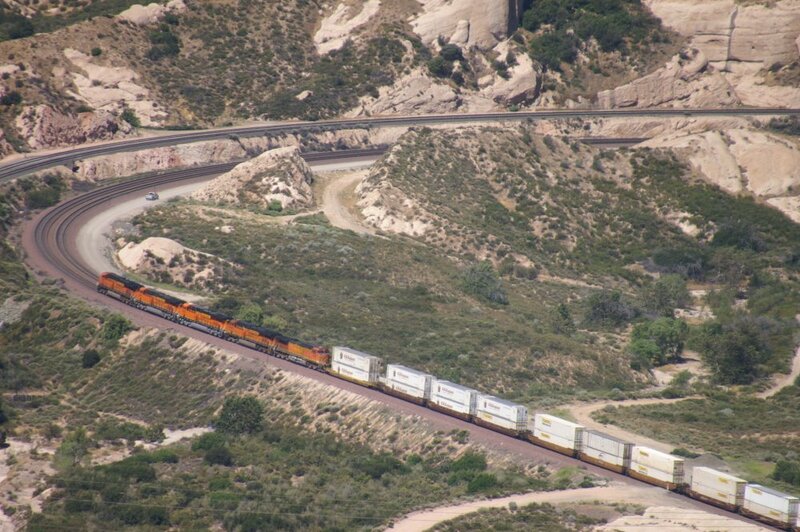 The interesting part to be high above, is, because we have a chance to see a train at different locations. 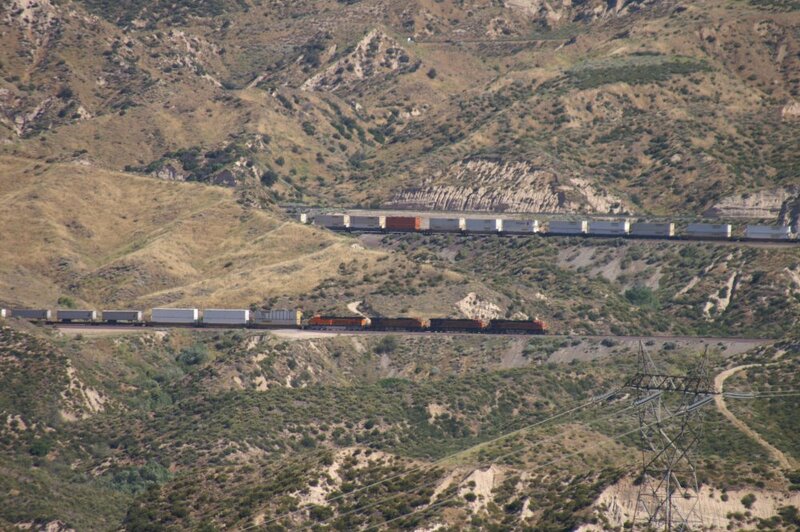 In other words, we can follow the train from the same position. 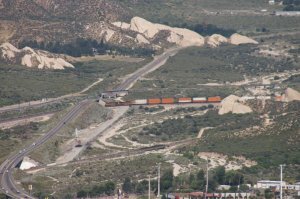 Once again sorry about the bad quality because of long distance, haze and wind. 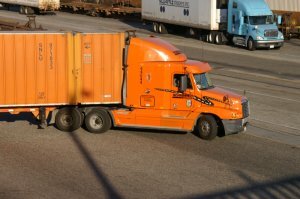 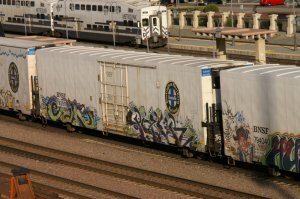 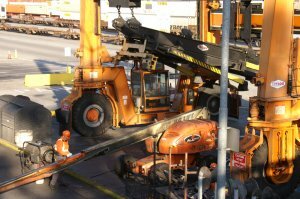 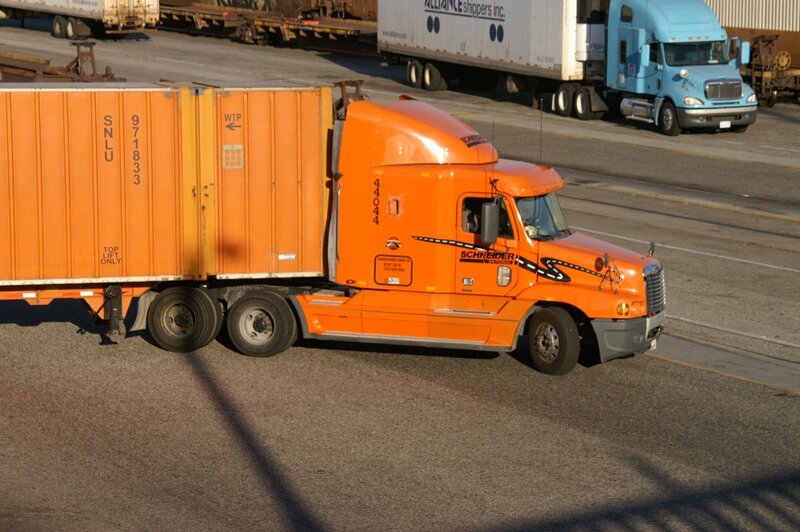 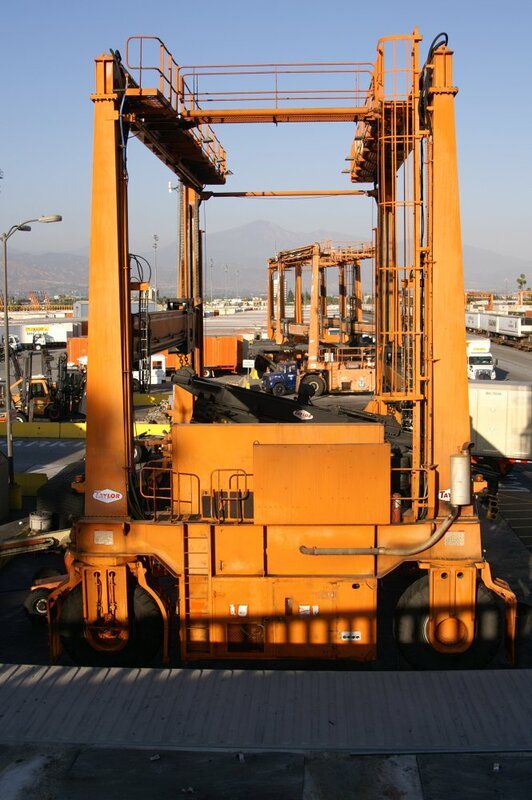 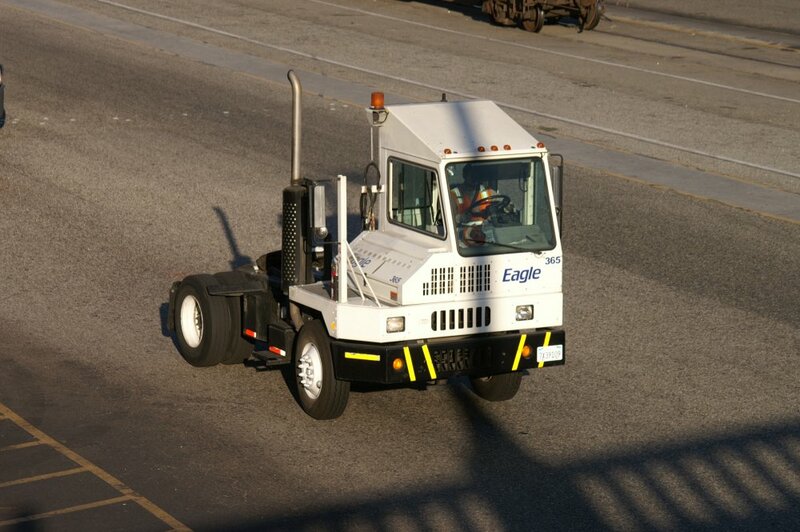 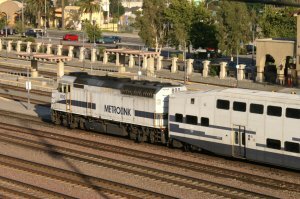 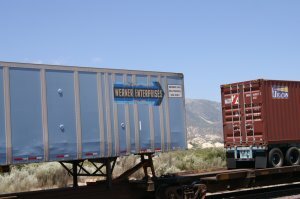 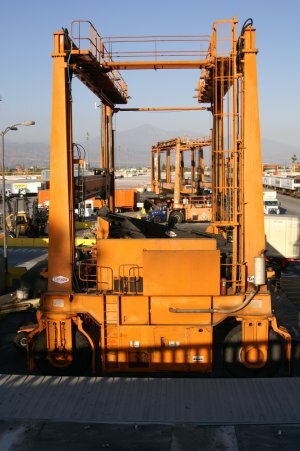 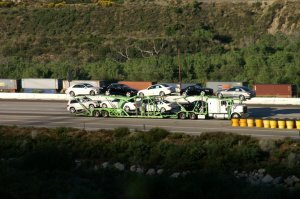 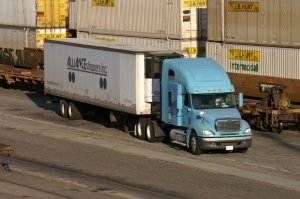 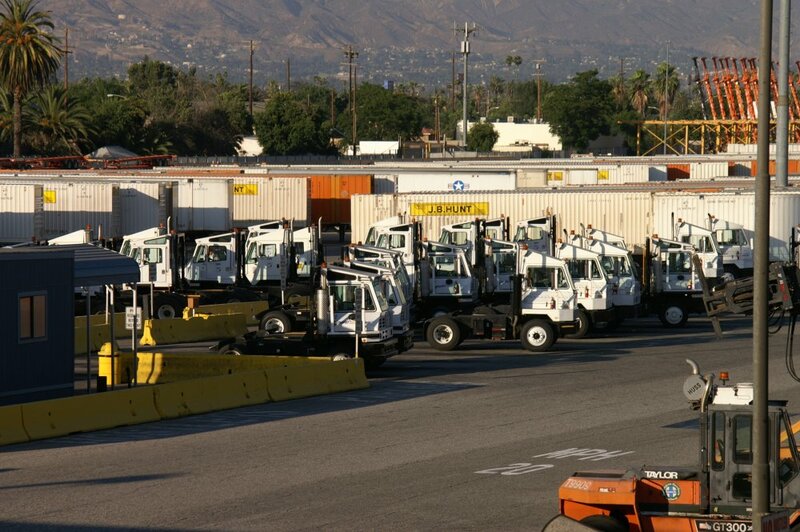 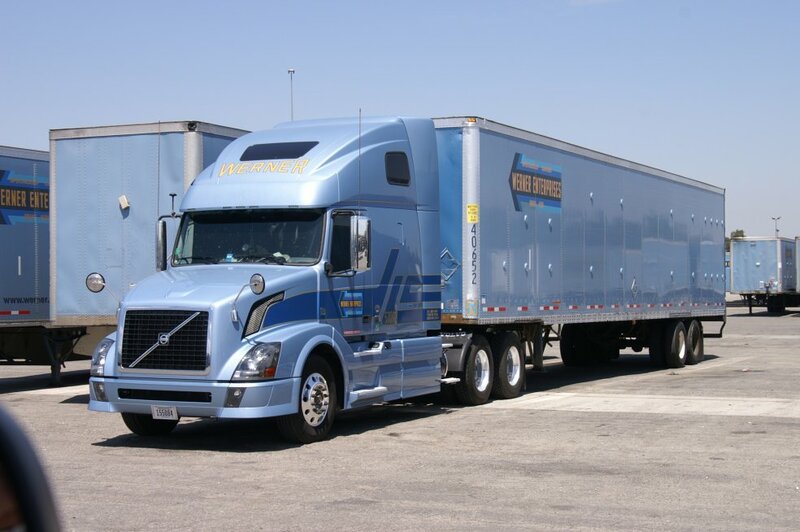 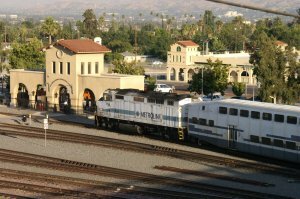 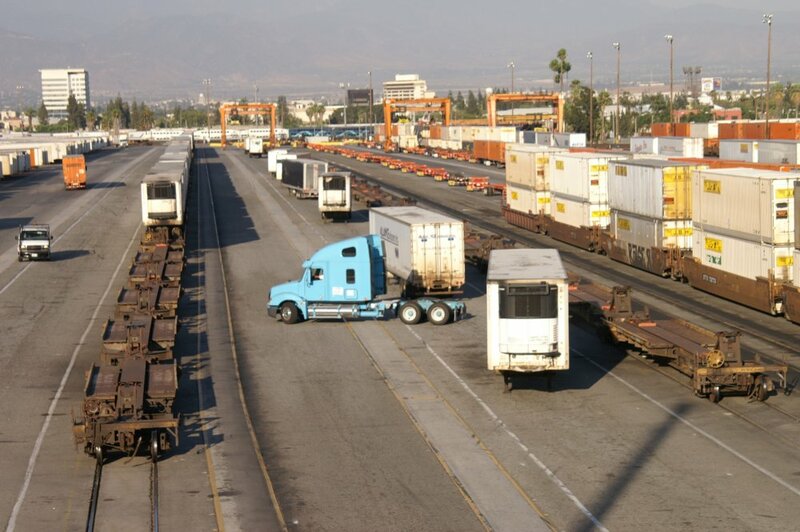 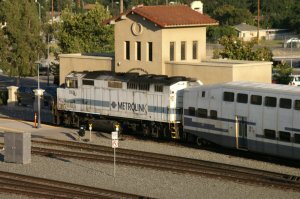 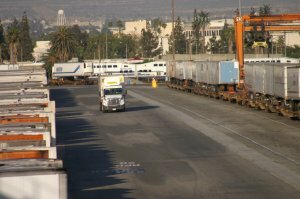 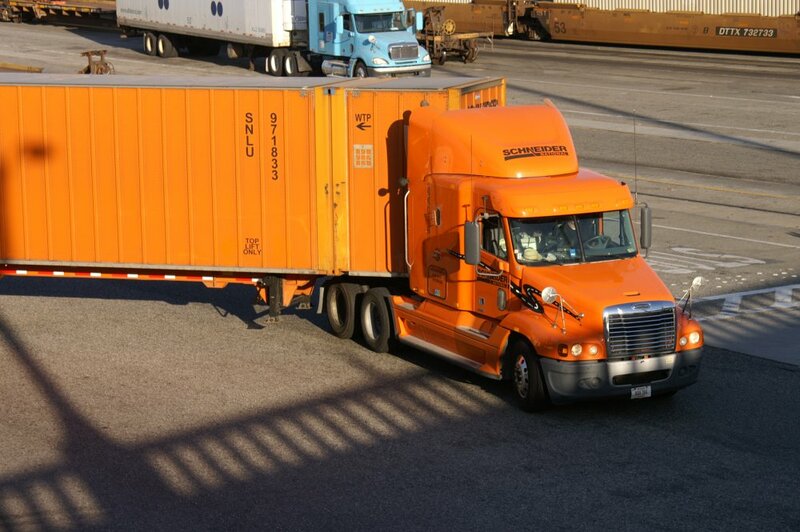 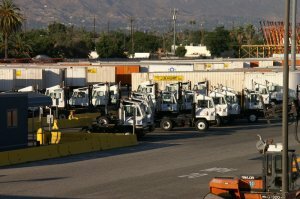 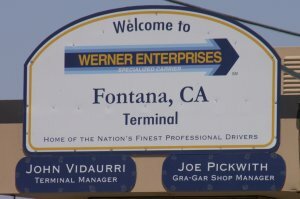 For today, I had to close my Cajon activities because of having an appointment with Werner Enterprises Terminal at Fontana, CA. 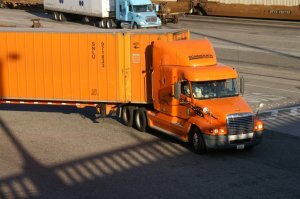 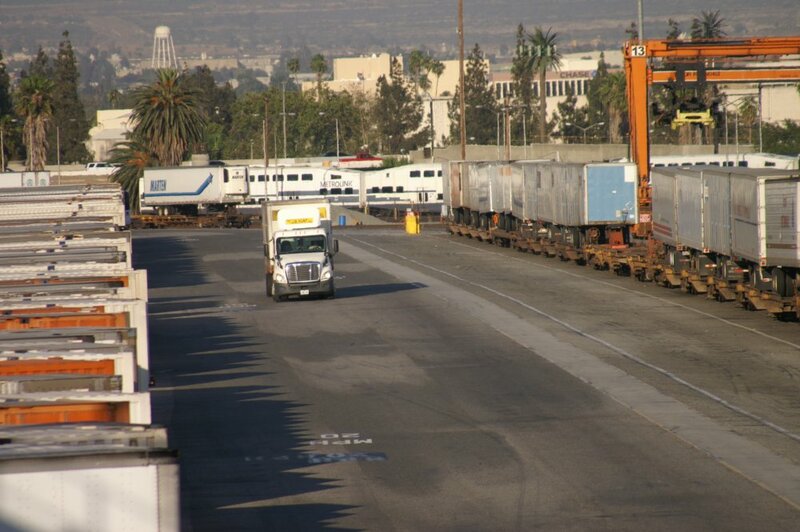 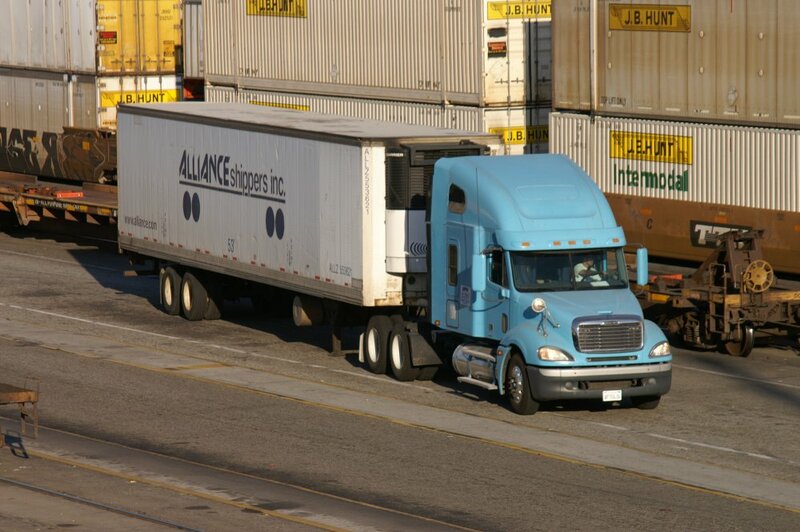 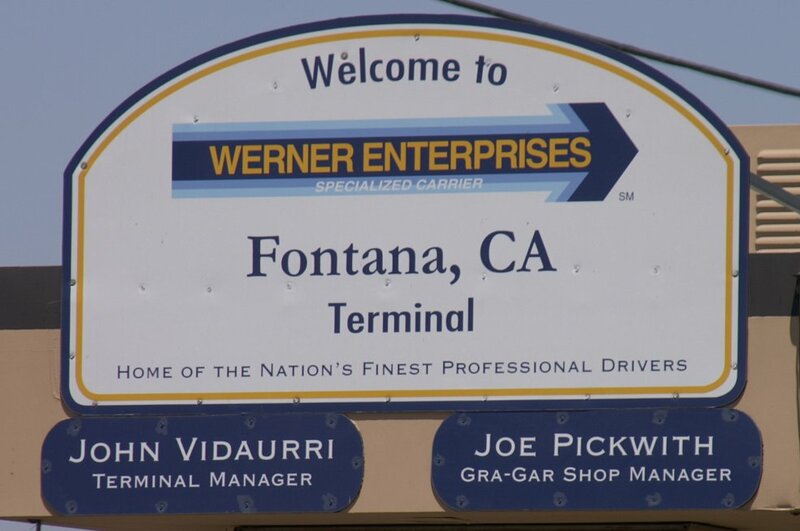 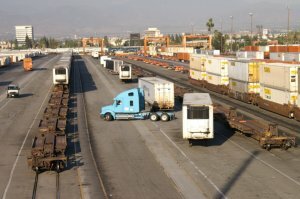 During my 2011 trip, I had once again the opportunity to get a tour of the Werner Enterprises Terminal at Fontana, CA. 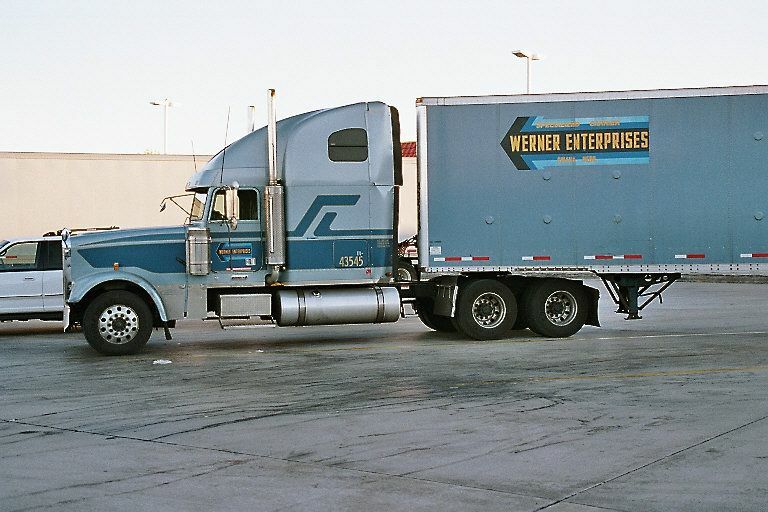 I am very thankful to Robert Corneliussen, Safety Manager of Werner Enterprises. All 57 photos were taken on June 28, 2011 with permission. The 3 helpers are going round the curve into Colton Yard. 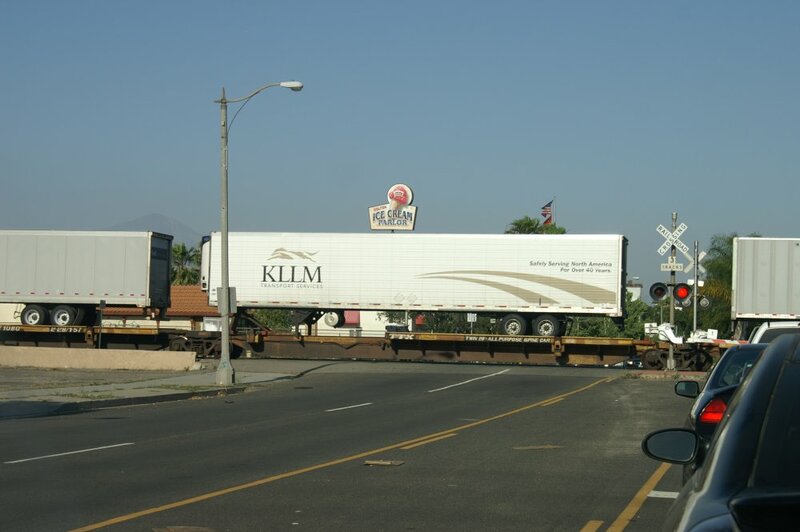 We are usually standing on Pepper Ave. to see this location. 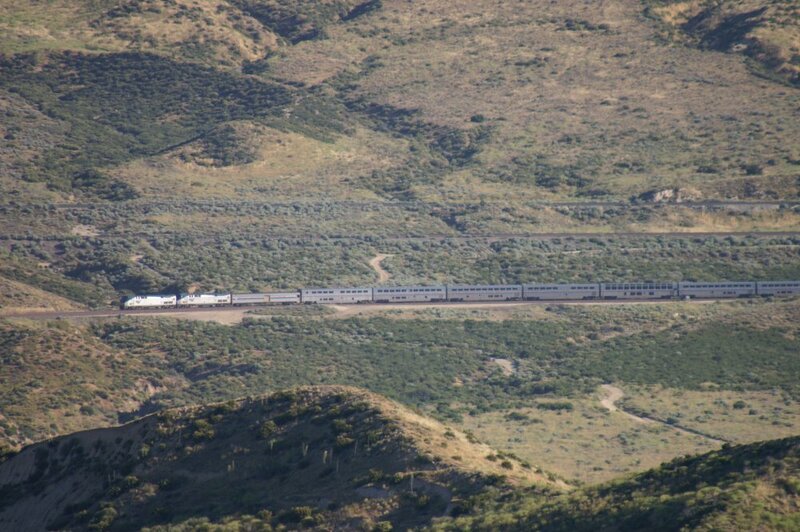 Day 7 was also a great day. 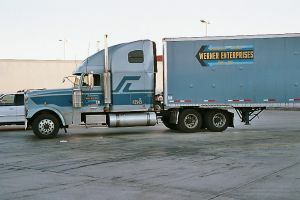 Of course, my personal highlight was the visit to the Werner Enterprises Terminal.